Night Line pictures from last night. Miss O’Sullivan called this afternoon to give us an update. 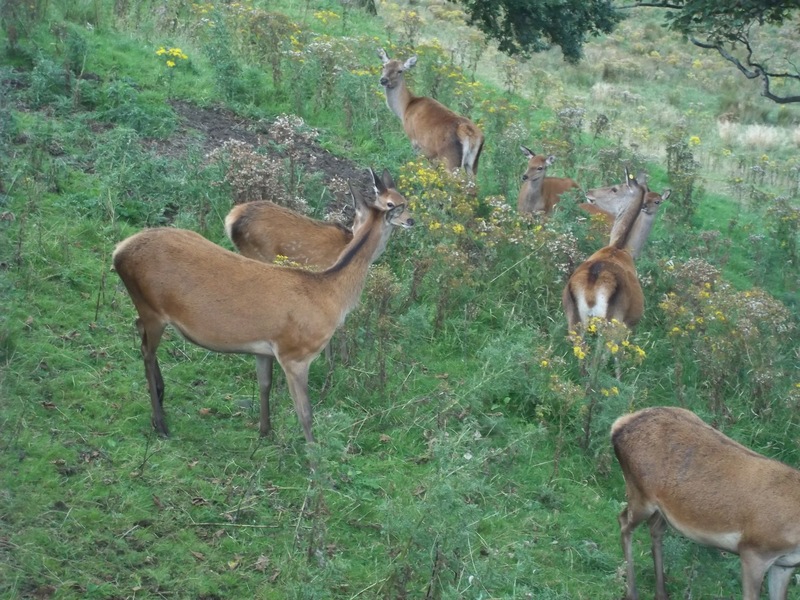 Last night there was a “scatter quiz” which made them familiar with their surroundings. 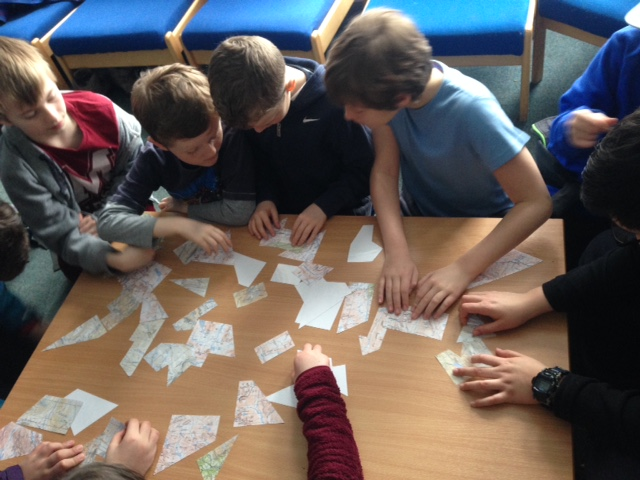 It has been a very busy morning with children going out in groups to take part in the following activities. 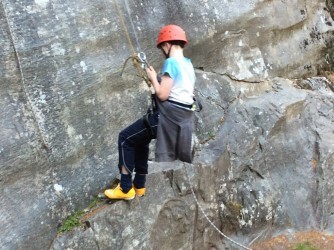 Climbing, Kayaking, Abseiling and Gorge Walking, Phew. More for them to do this afternoon. 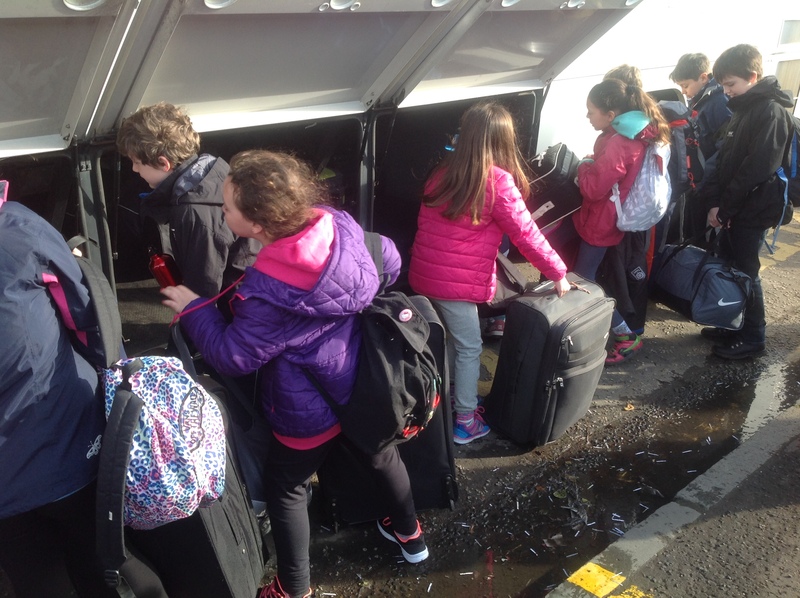 Primary 7 arrived safe and well this afternoon and soon got themselves settled in. Depending on computer access and WiFi we will have photographs soon. 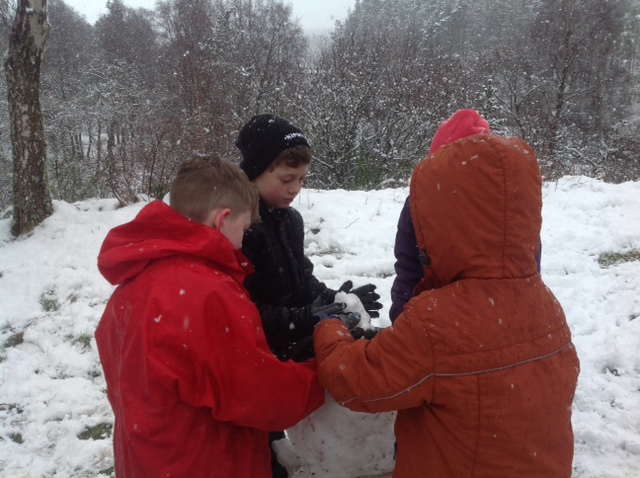 Everyone has enjoyed their last morning in Dalguise. 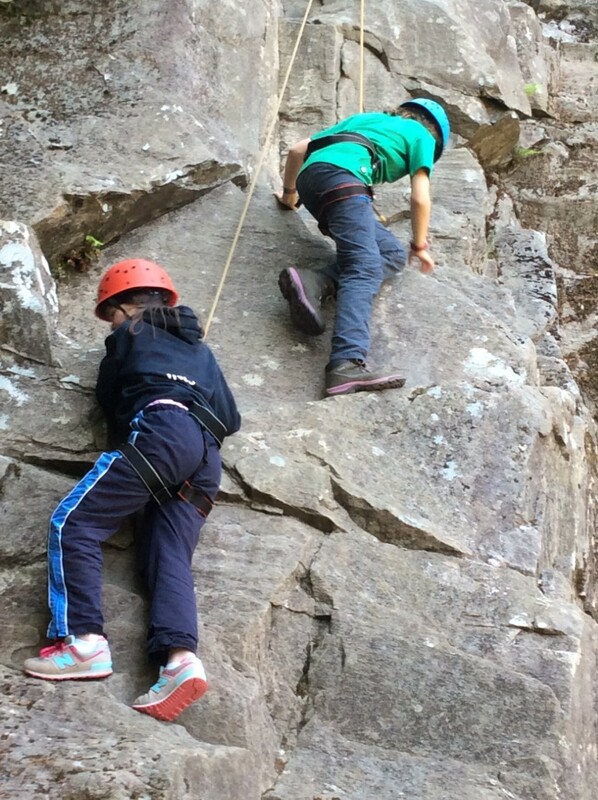 They have tried archery and abseiling. Here are some pictures of their day. 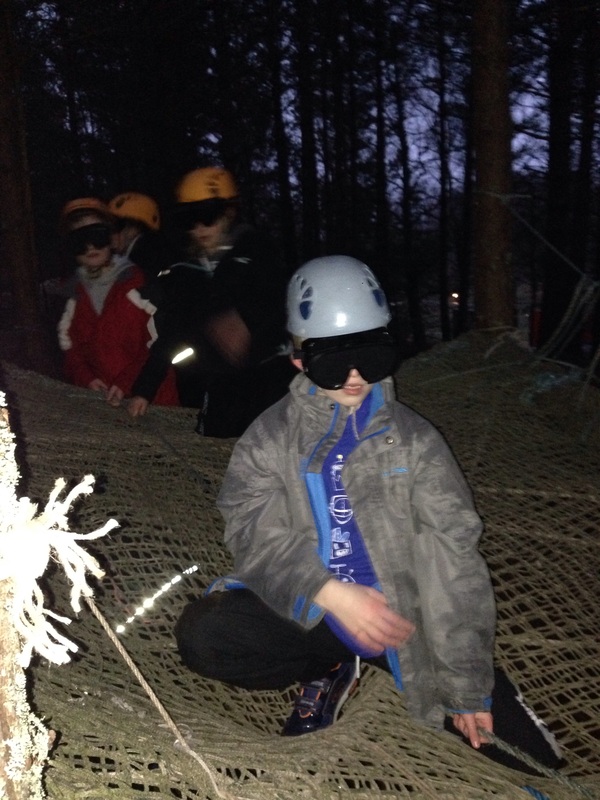 Primary 6 had a busy day yesterday enjoying the giant swing, zip wire, challenge course and sensory course. They finished of the night with a disco and early to bed for all. Everyone was asleep as soon as their heads hit the pillow. News just in! 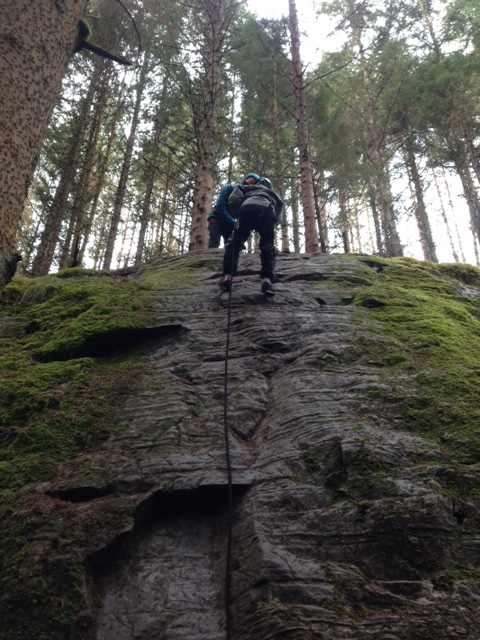 Primary 6 are having a wonderful time at Dalguise. The sun is shining and they are enjoying every minute of the great weather and being outdoors! 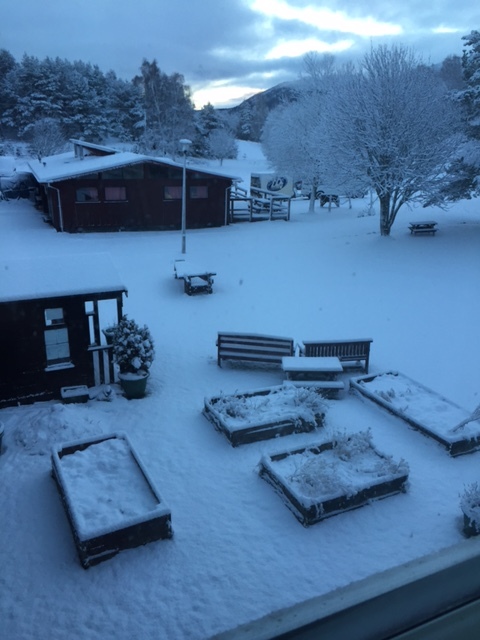 Although internet connection has been tricky they have managed to send some photographs. 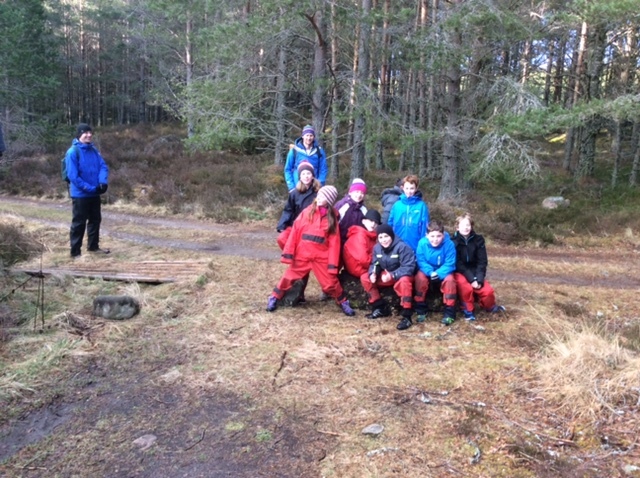 Primary 6 hope you enjoy seeing what they have been up to and can’t wait to see you all tomorrow. and of course a good old sing song around the camp fire! Well done to all those in P6/7 who represented the school at the Cross Country event at the Meadows today. 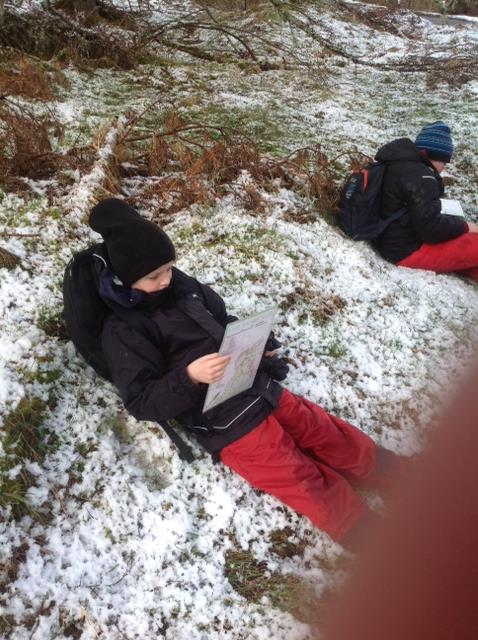 Despite some very wet underfoot conditions all competitors gave their all and did themselves and the school proud. 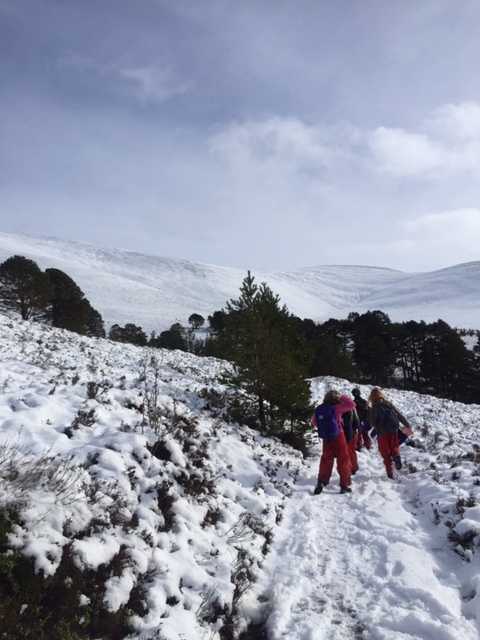 A special congratulations to Evie in P6B who won her race, Sorcha in P7B who finished second and Ronan in P7A who came fourth (with a bit of sportsmanship along the way!) These children were awarded a medal each at the end of the event. 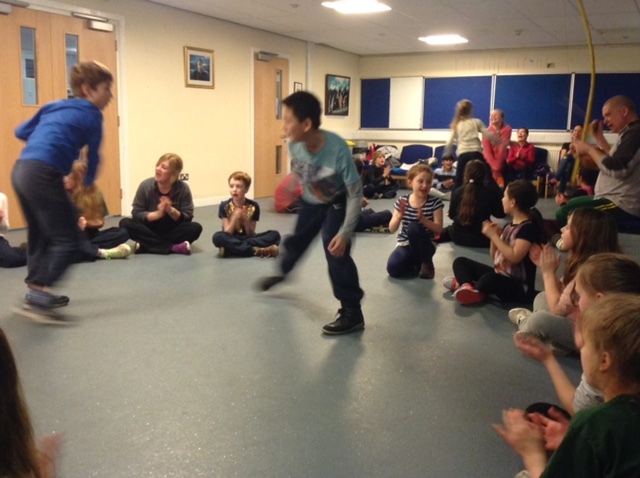 Thanks to all the parents who helped out and cheered the children on! Finally a special thanks to Mrs Walker who organised the event. 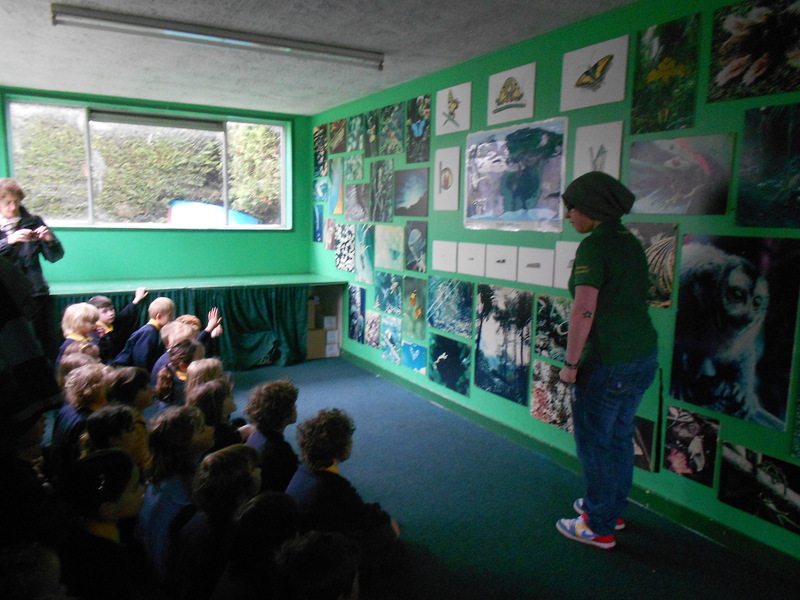 On the 16th of November 2016 a lady from the RSPB came to talk to us about wildlife and how much we need to take care of it. 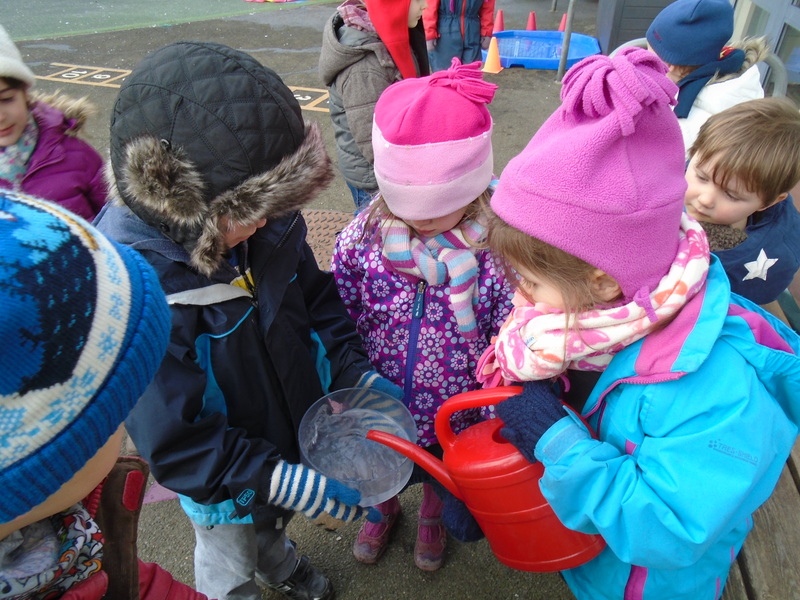 We went outside to our school garden to look for animal habitats, and found lots. 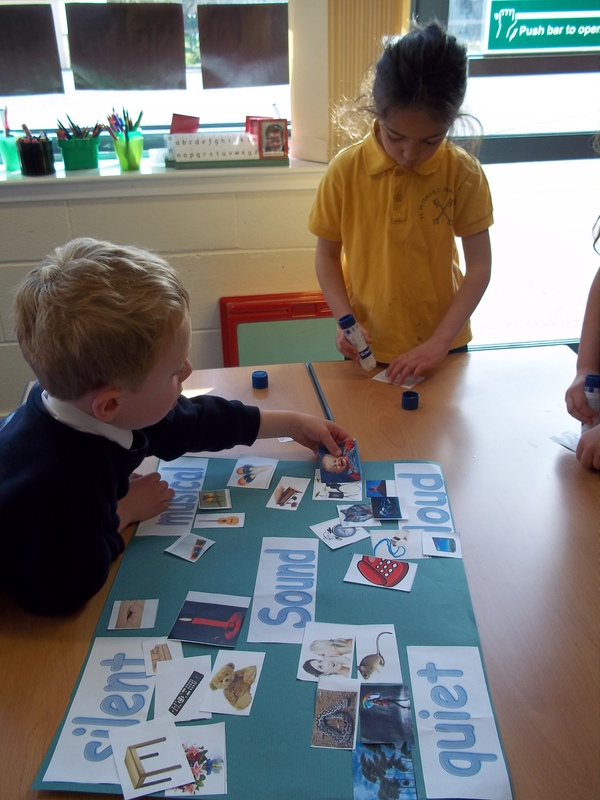 We found out what it just be like to be an animal by playing a game where four people were all necessary things animals need to survive: food, water, company and habitat. We had to run around giving the four people a high-five every time we passed them stopping at the habitat for 10 seconds. Then we played it without the habitat and we had to run a lot further, so we couldn’t stop. 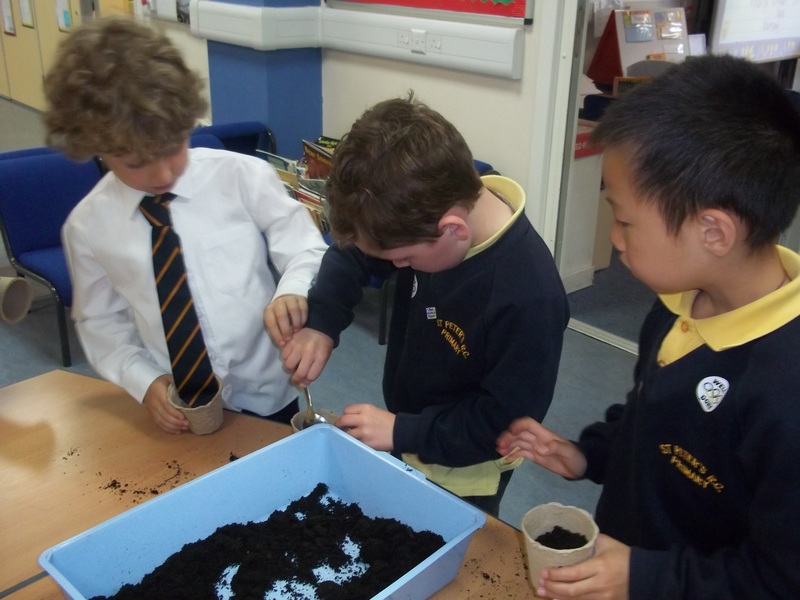 We learnt the habitat of lots of different creatures, like moles, who live underground where there are worms and darkness. Small birds actually live in bushes more than trees because they are more protected from predators and have a sheltered route around to get to different places. 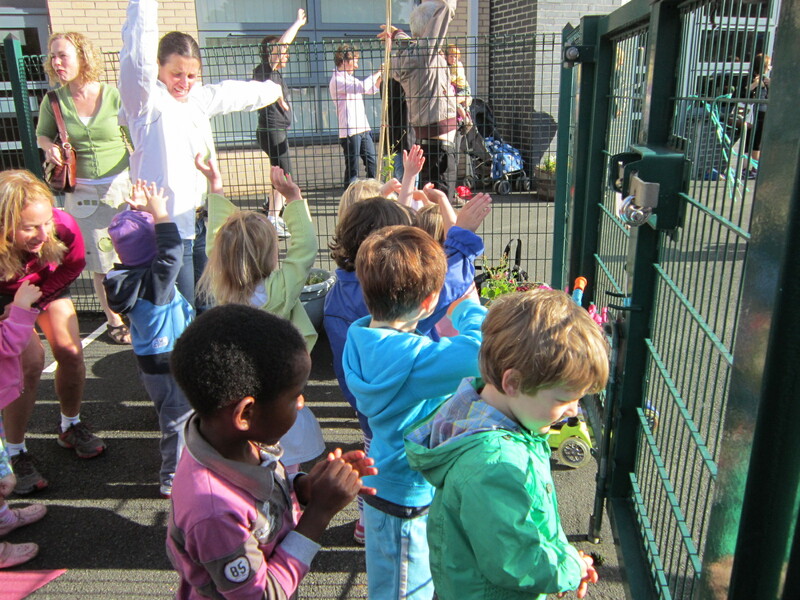 The lady suggested adding a few more places for animals to use, such as a bird feeder, bat box or pond, but she said that overall we have an environmentally friendly school. We all enjoyed the visit and it taught us a lot. 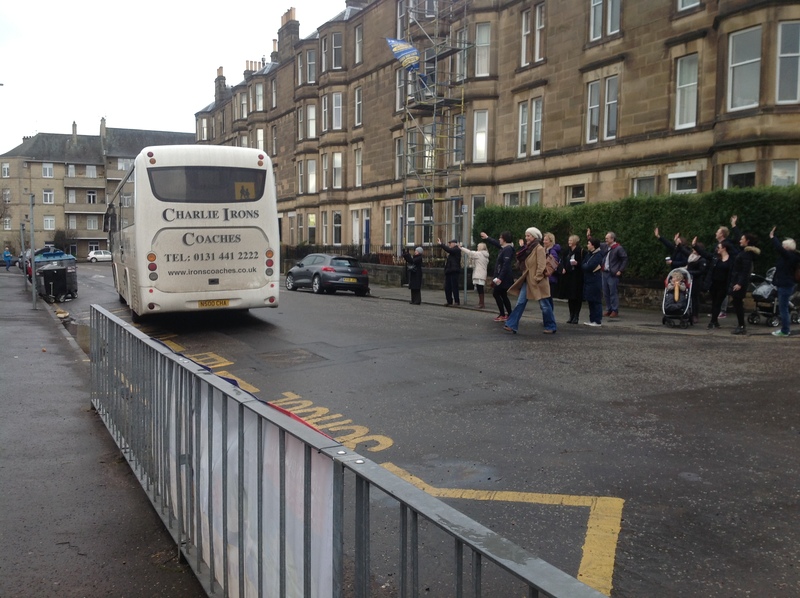 Every Wednesday P6 walk down to P2 to join their buddies. 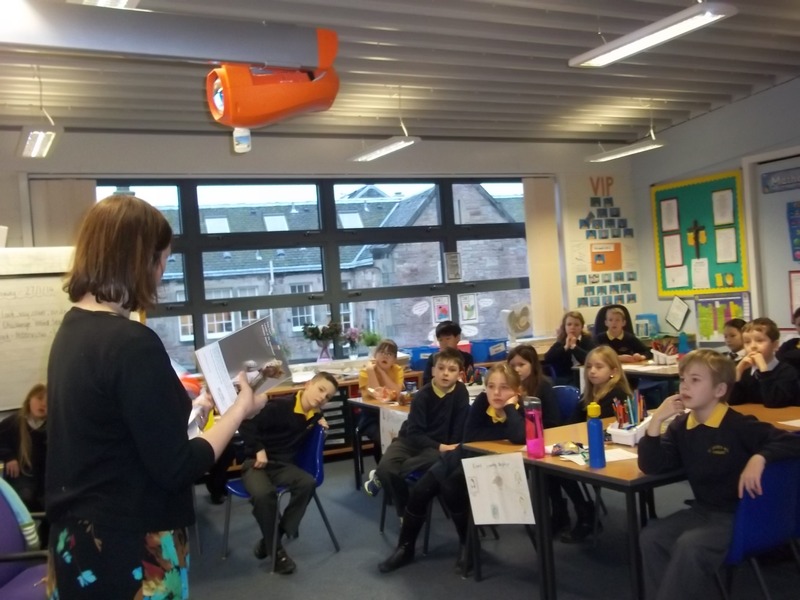 P2 will read their reading books the P6s and they have come along really well with their reading. 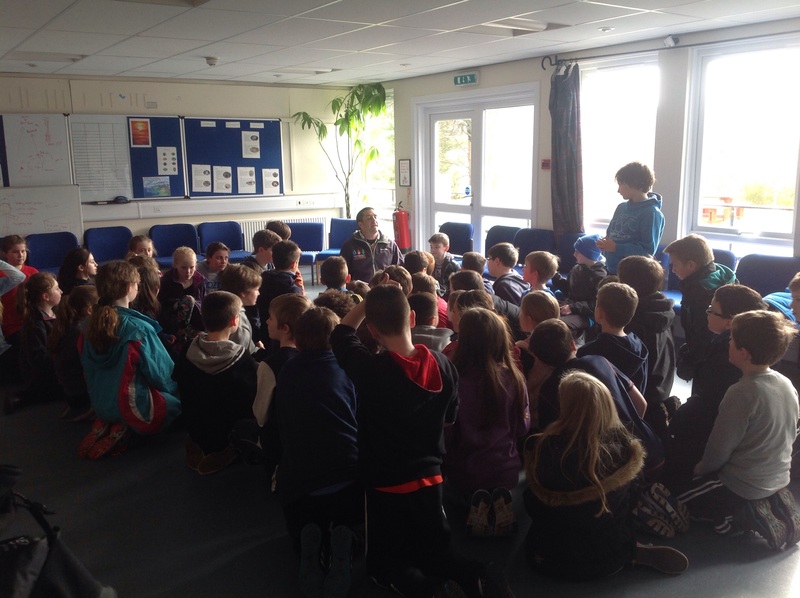 Sometimes P6 read their books to the P2’s. 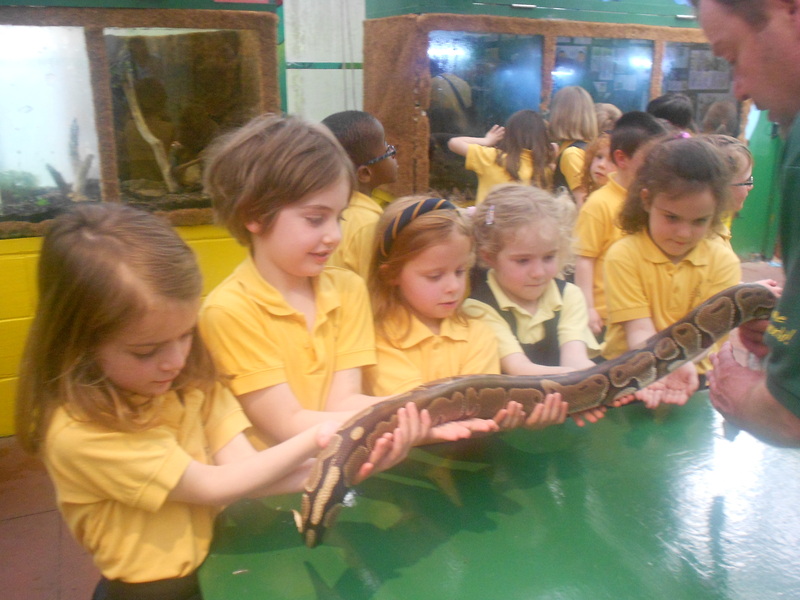 We are really enjoying their visit to P2. 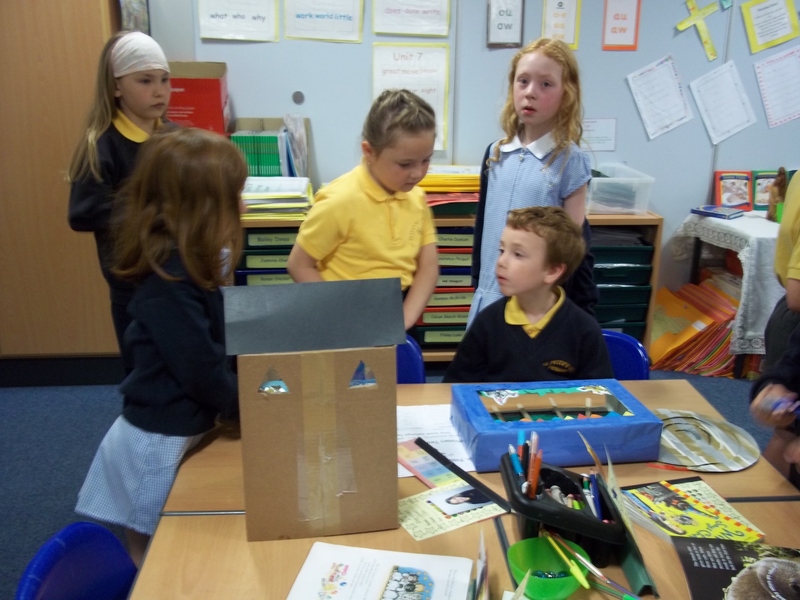 Recently P2 made ECO houses and the P6’s enjoyed looking at their incredible houses. We had a competition for the best house and Ameena’s buddy – Noami won. 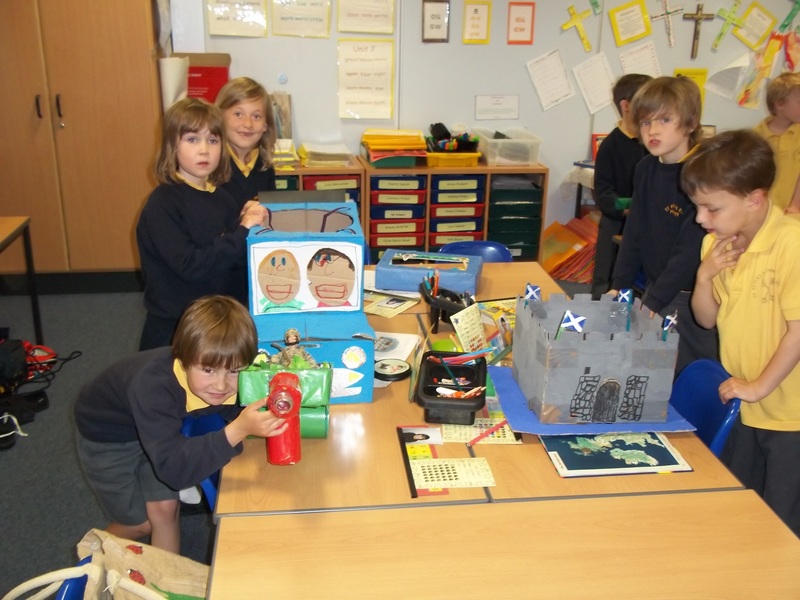 Of course all of the P2’s houses were brilliant so it was extremely hard to judge. 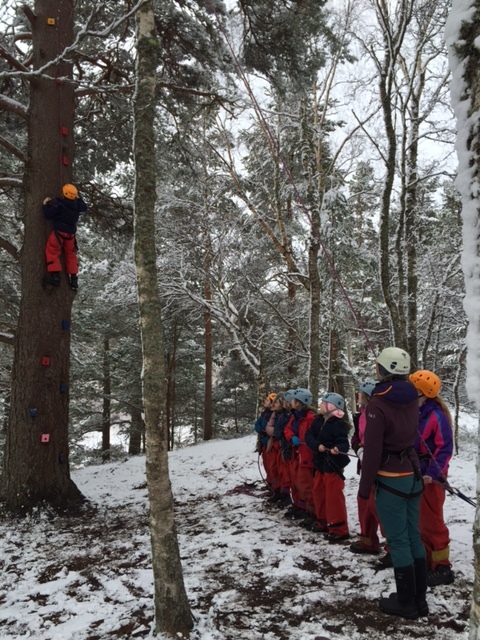 P6 really enjoy their time with the P2’s and we hope they do too. On Monday 29th August P6 went to the book festival at Charlotte Square. We went into a massive tent and we watched Joshua Seigal tell us about his new book “I Don’t Like Poetry”. 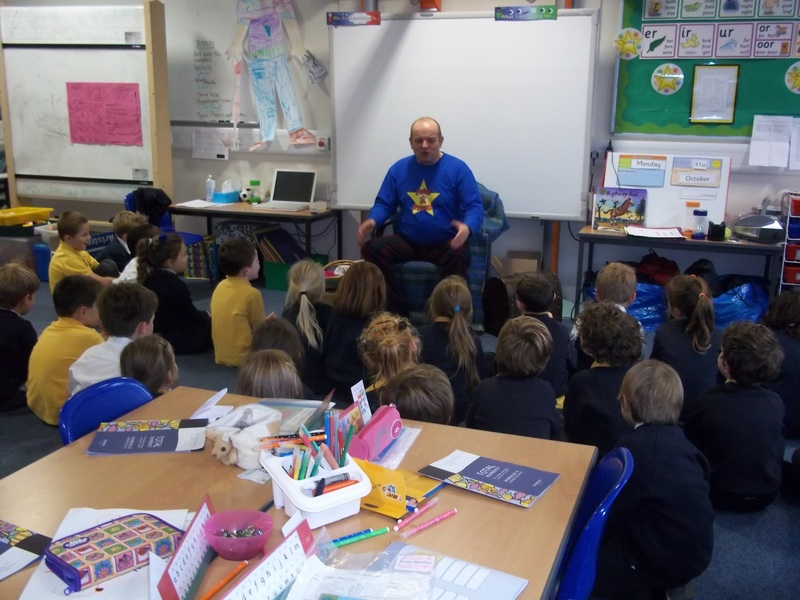 He told us a bit about his life and how he became a poet. 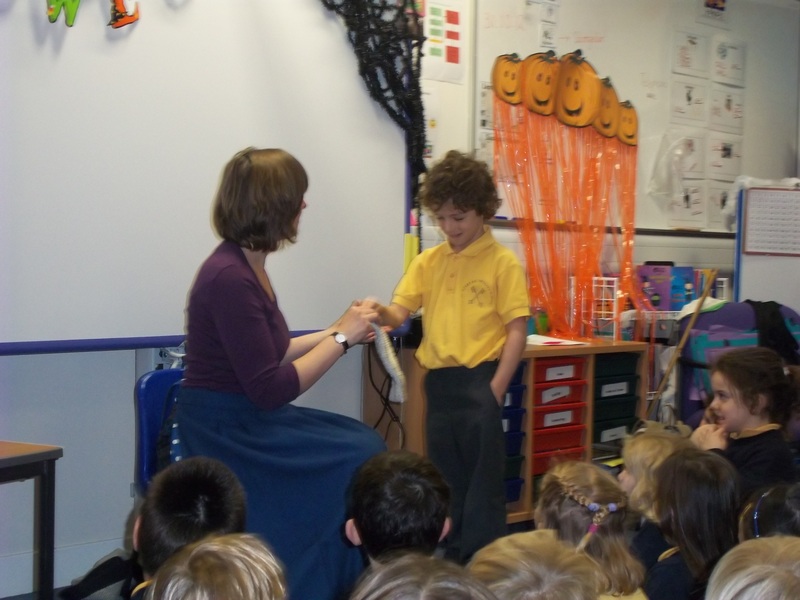 We enjoyed listening to all his poems and joining in. The poem we liked best was “I’m addicted to chicken”. We would like to go back next year. 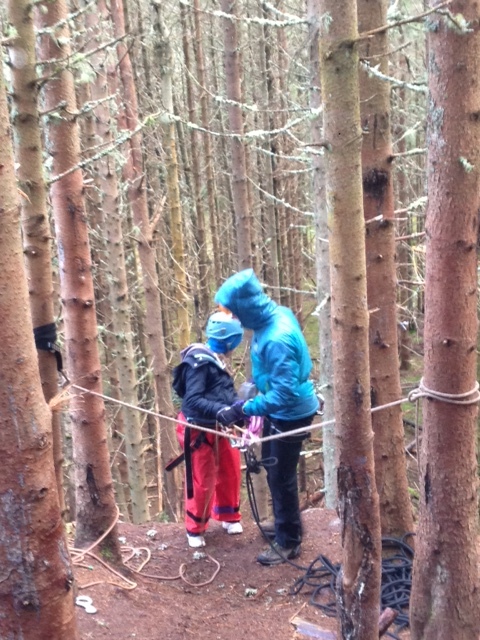 by Aoileann, Sophia and Euan. 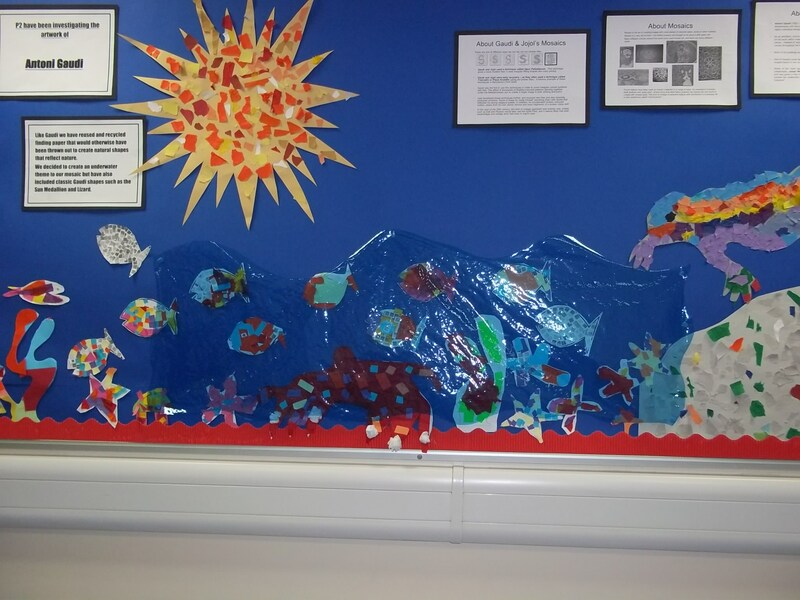 P5 have been busy working in groups to complete a display of their knowledge about their chosen endangered animal and are preparing their presentations for the class. 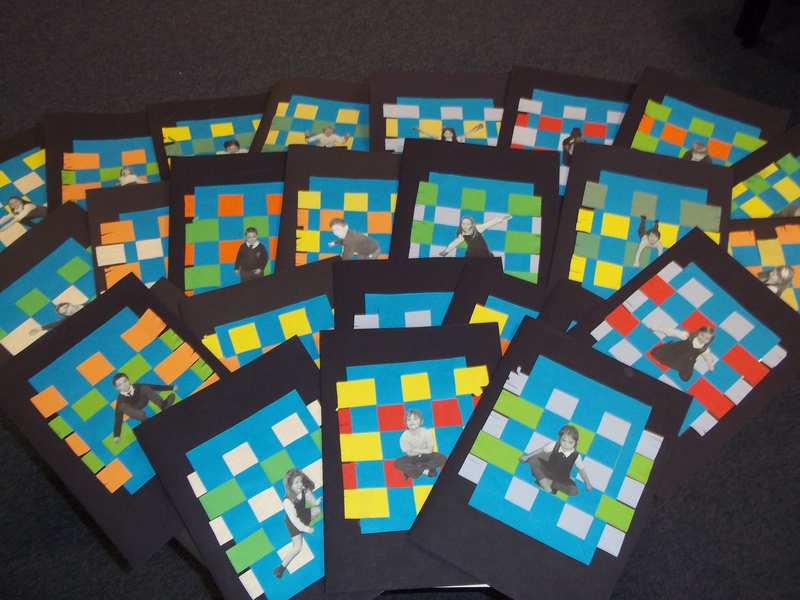 P5A have been engaged in creating an interesting background, using collage, for their detailed pencil drawings. 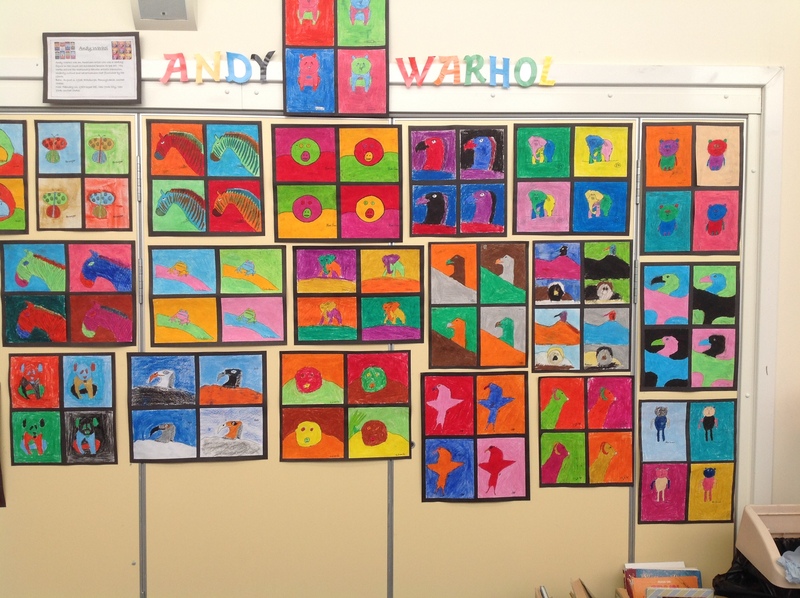 P5B have chosen to study the work of Andy Warhol and have drawn their animals in the style of one of his most famous painting. 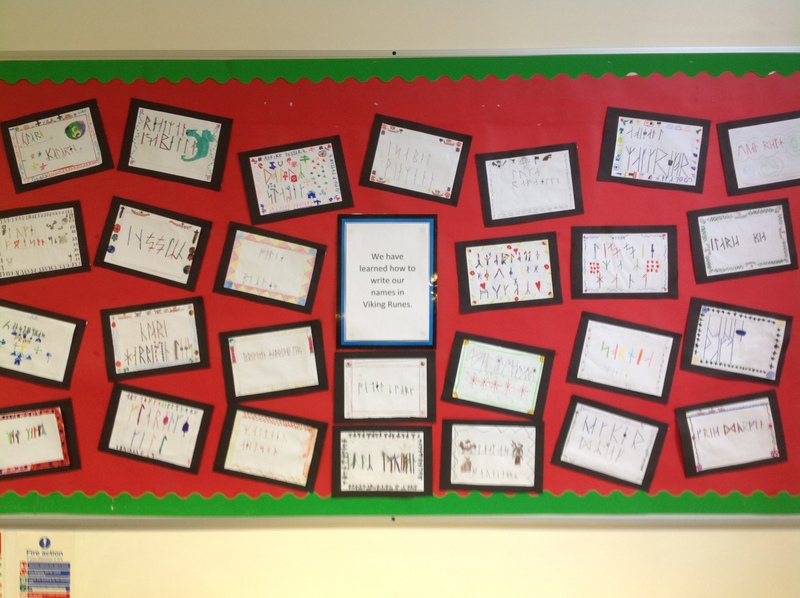 In maths both P5 classes have been learning how to interpret information on different types of graphs and have had opportunites to create their own graphs. 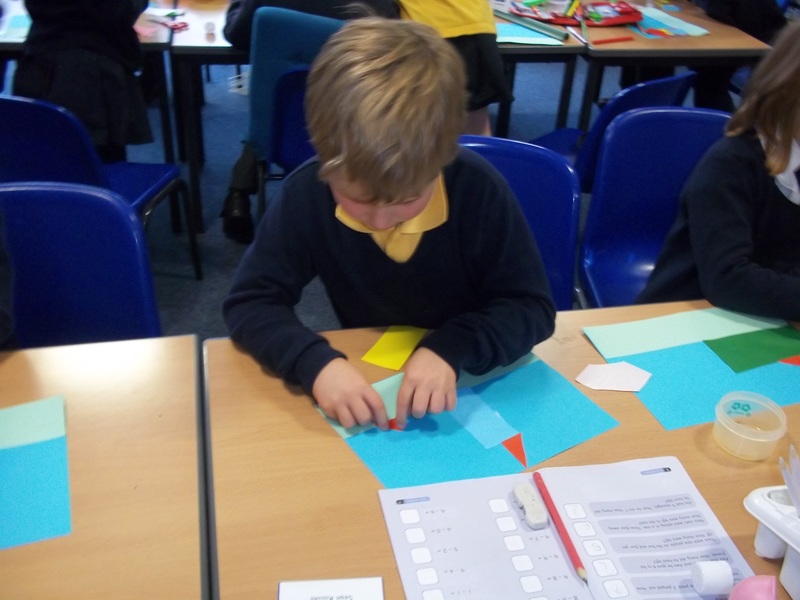 In Literacy they have been writing different types of letters. 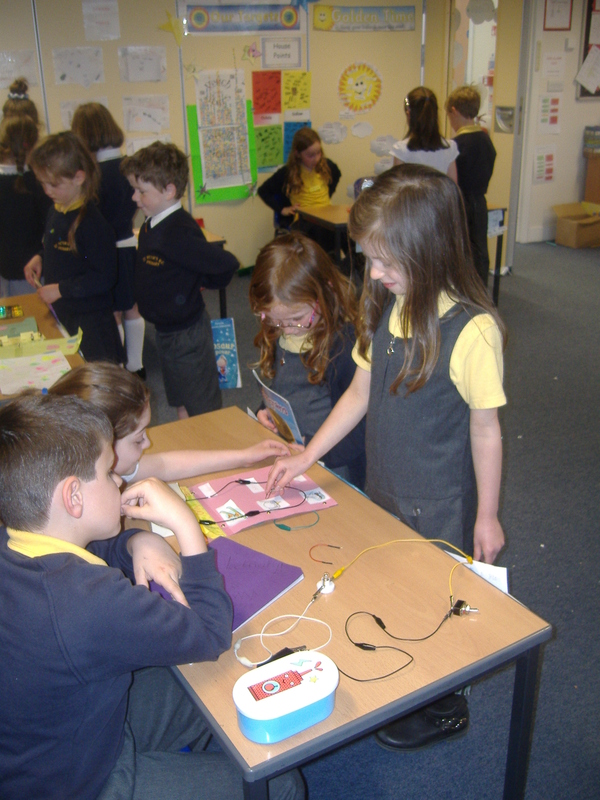 P4b put their learning about circuits to good use last week by designing activities for a Primary 2 class. 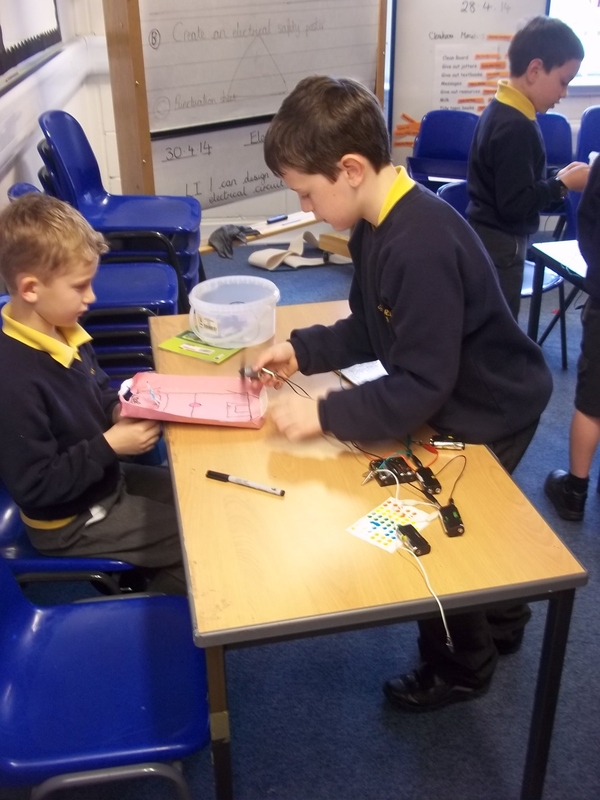 They worked really hard and came up with lots of fun and imaginative ways to use electricity to create games, quizzes and challenges for younger learners. 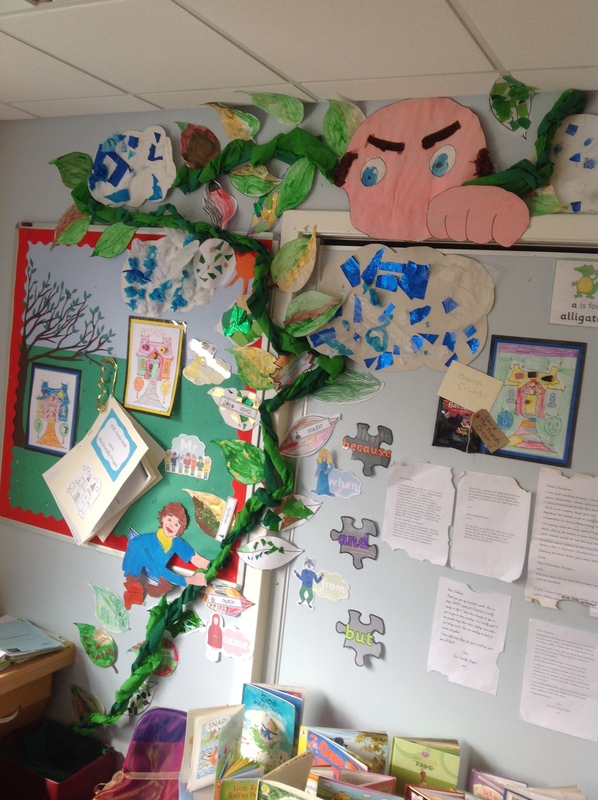 P4b looked after their visitors beautifully and everyone involved can feel really proud of themselves! 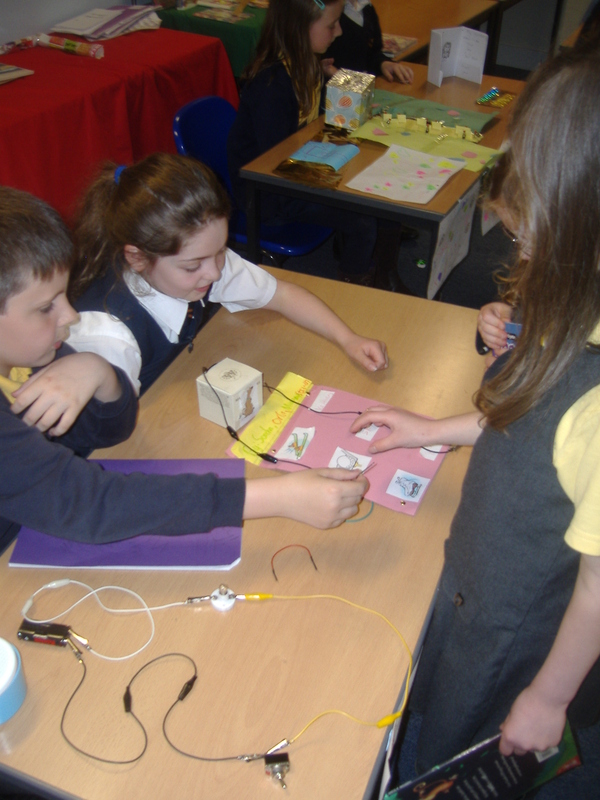 P4 have been working with circuits and learning about electricity in our latest topic. 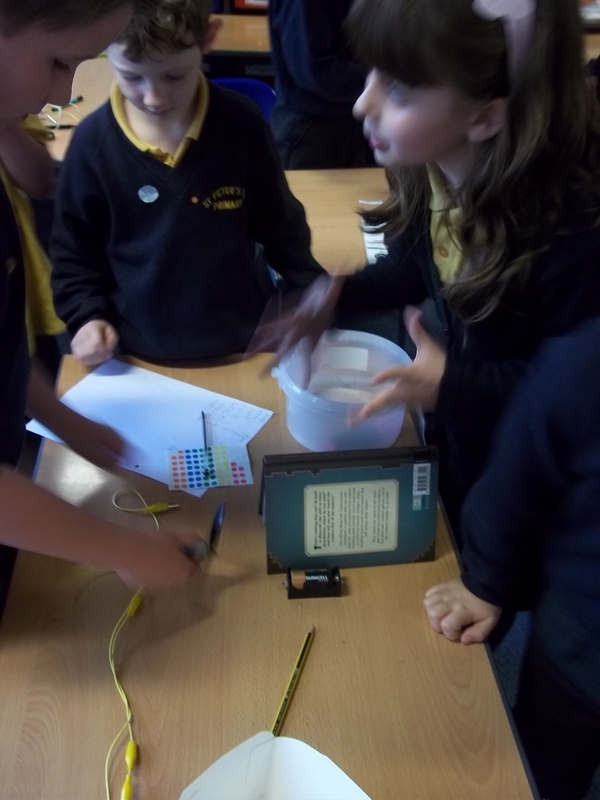 We have lit up bulbs and tested around the classroom for insulators and conductors. The next stage is to use this knowledge to create a fun game for some of the younger classes to play, we are very excited for this. In fundraising for SCIAF, we have done extremely well. As well as really embracing the Commonwealth dress up theme, we did a sponsored event. 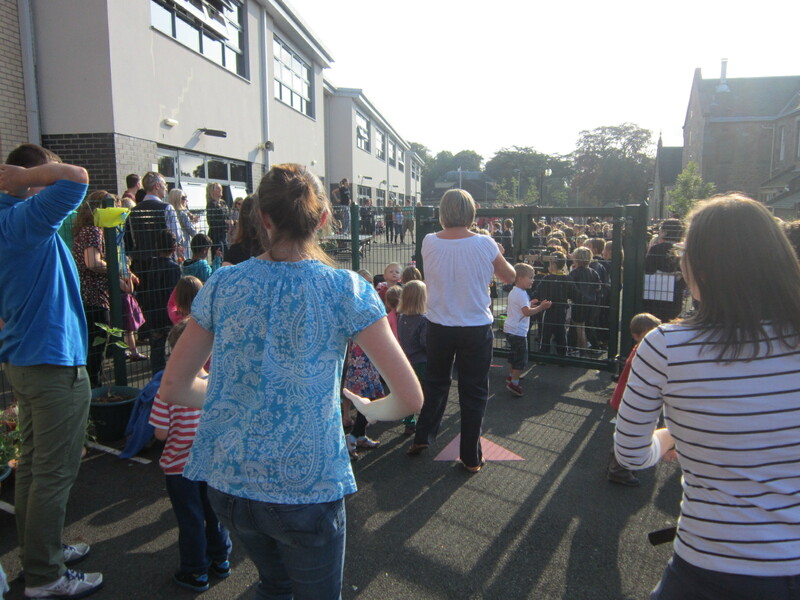 P4 ran a number of laps and would like to thank all of those who sponsored them – we have raised enough money to buy a few of each animal-chickens, goats and pigs! 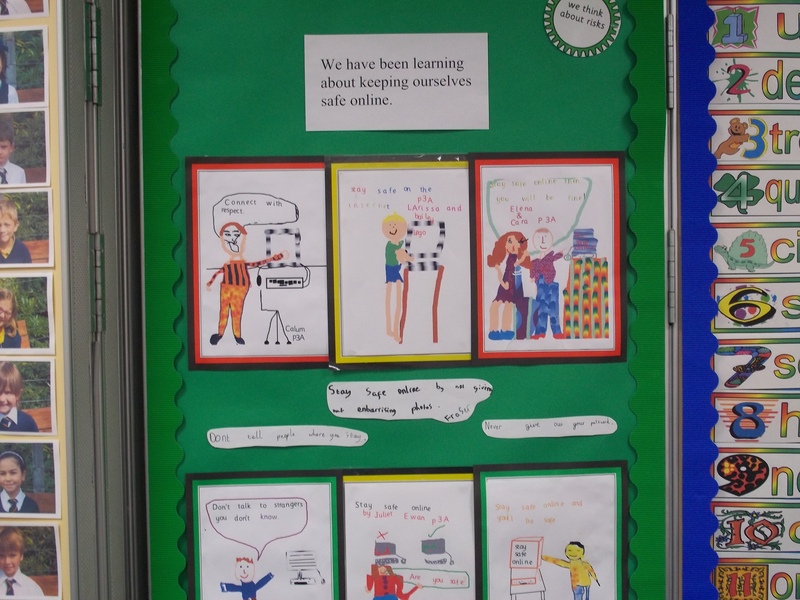 P4 have written books, learned about the World of Work and started Food Tech in the last term, we are looking forward to the next term to see what exciting things are in store! (Expect to see more Commonwealth focus with a special look at Singapore, Nigeria and the Bahamas)! 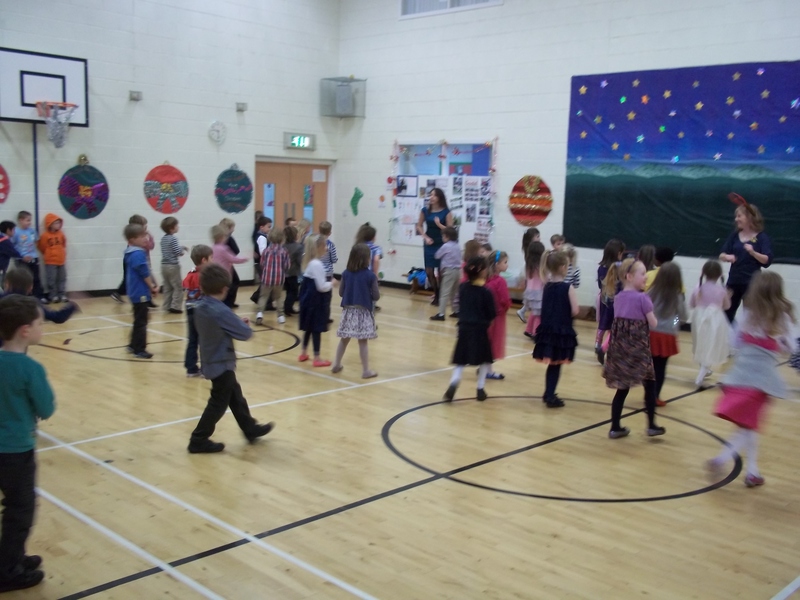 P4 are enjoying their new topic, learning Scottish dancing with Mrs Walker, songs with their teachers and lots of fascinating facts about Edinburgh Castle and some of the characters who used to inhabit our city. Next Friday we will show off our “Jeely Piece Song” in the St Andrews assembly, please practise your verse at home! Our visit to Edinburgh Castle is coming up on Wednesday 27 November, please wrap up very warm and remember your packed lunch that day! 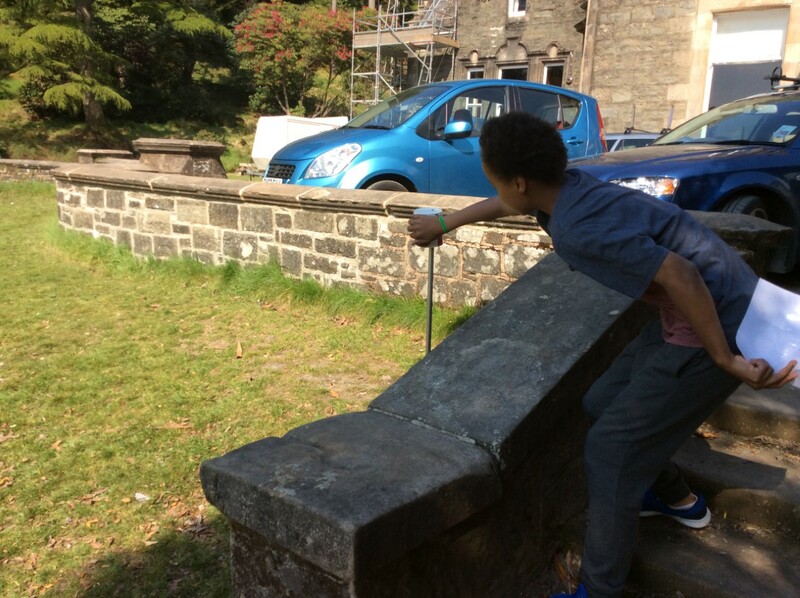 We will have history workshops provided entitled Flags and Scottish Heroes. 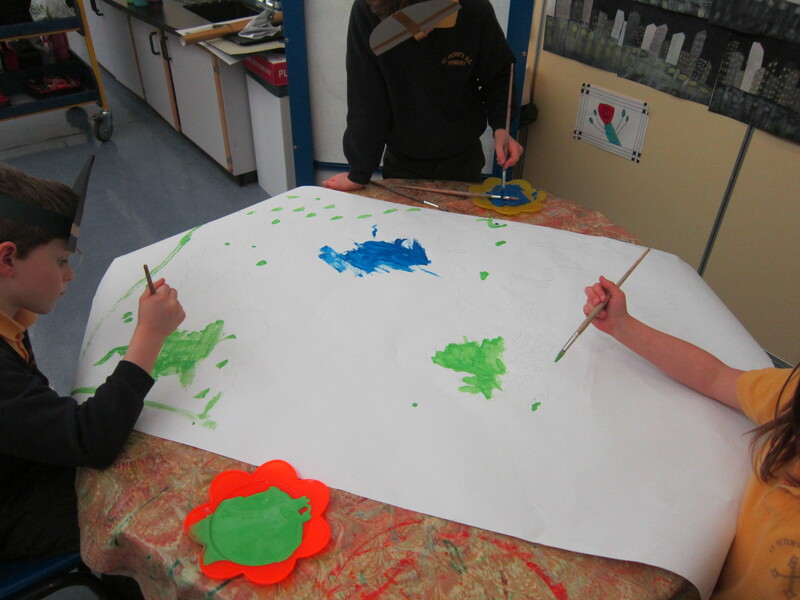 Every class in the school was asked to choose a famous artist and look at and recreate their work. 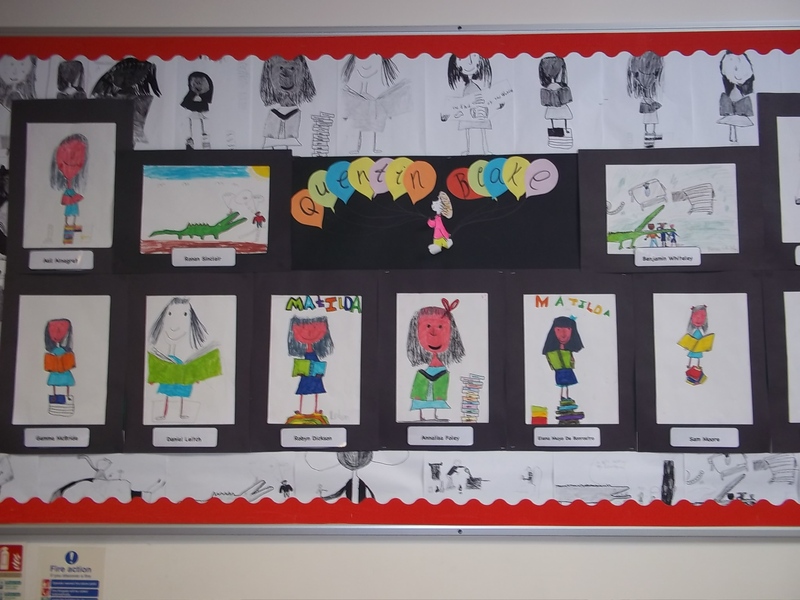 P4 chose Quentin Blake who famously illustrated the Roald Dahl books. 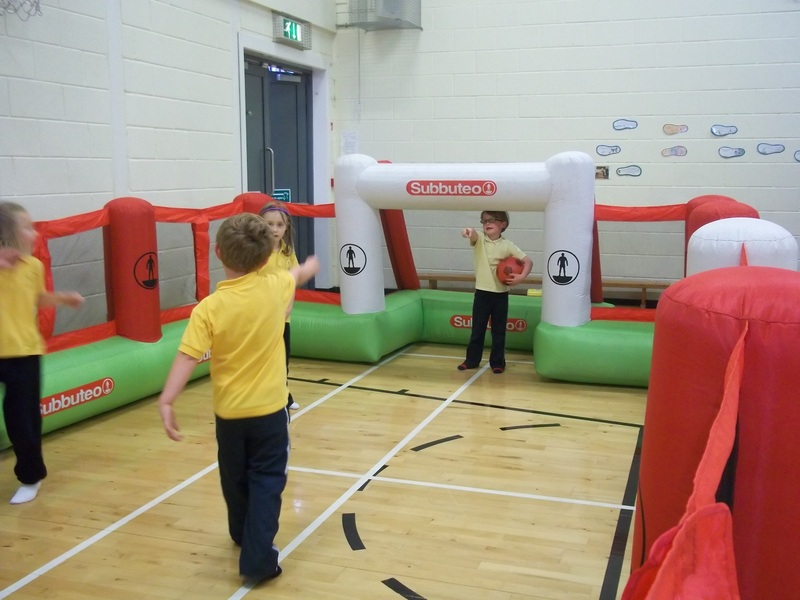 During Health Week we were able to take part and enjoy a variety of activities. 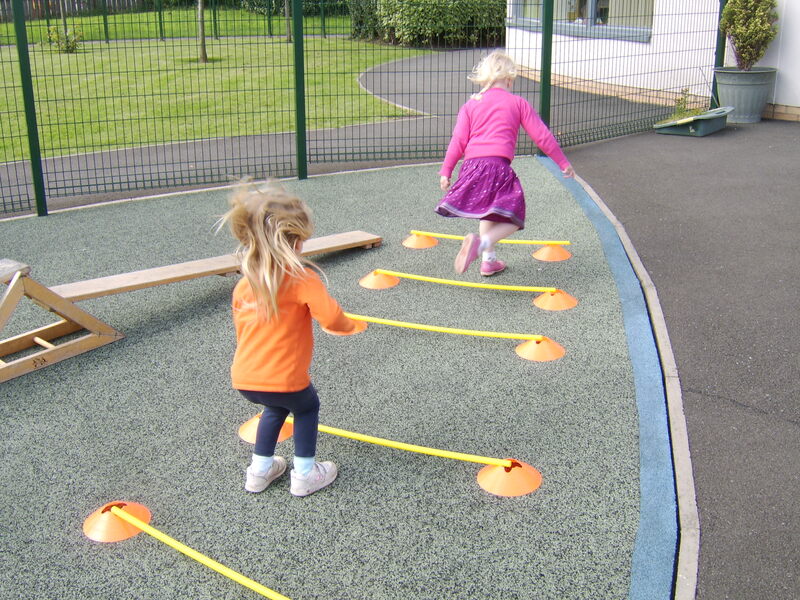 Our mornings were starting with a workout in the playground with the rest of the school including staff, Mums and Dads and brothers and sisters. 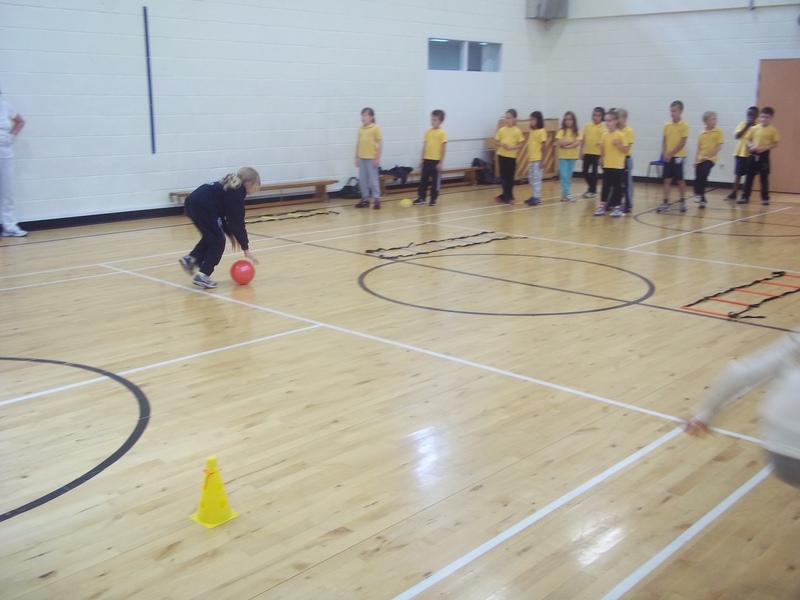 We were introduced to Gaelic Football which we will continue with for the rest of the year. 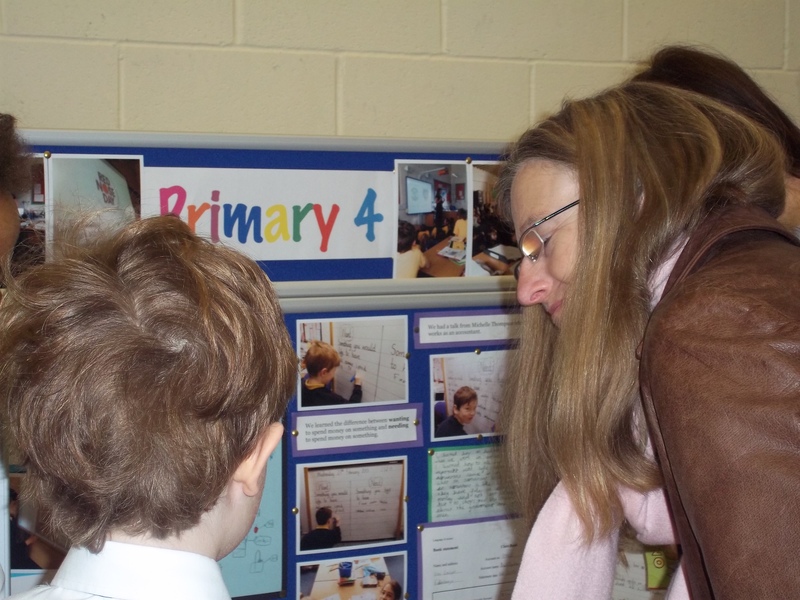 e also enjoyed showing our parents what we learned. We were asked lots of questions. 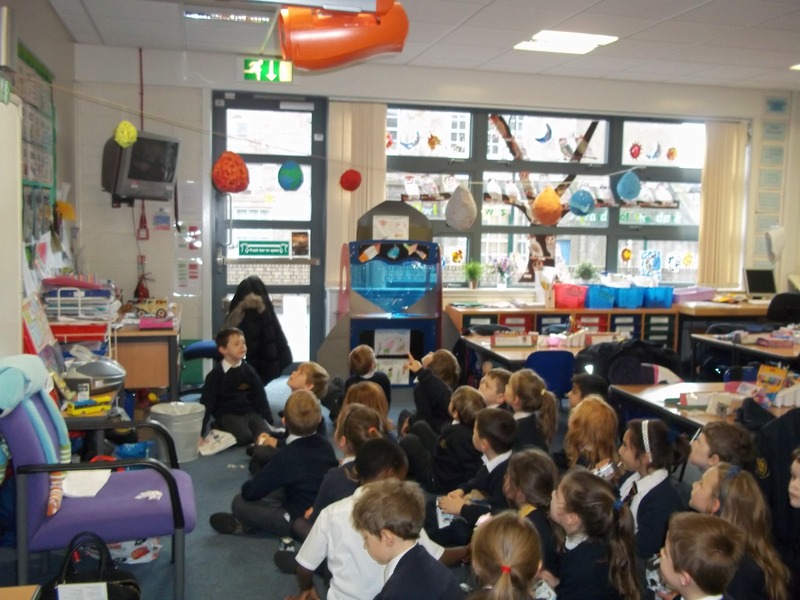 We have been learning about on-line safety. 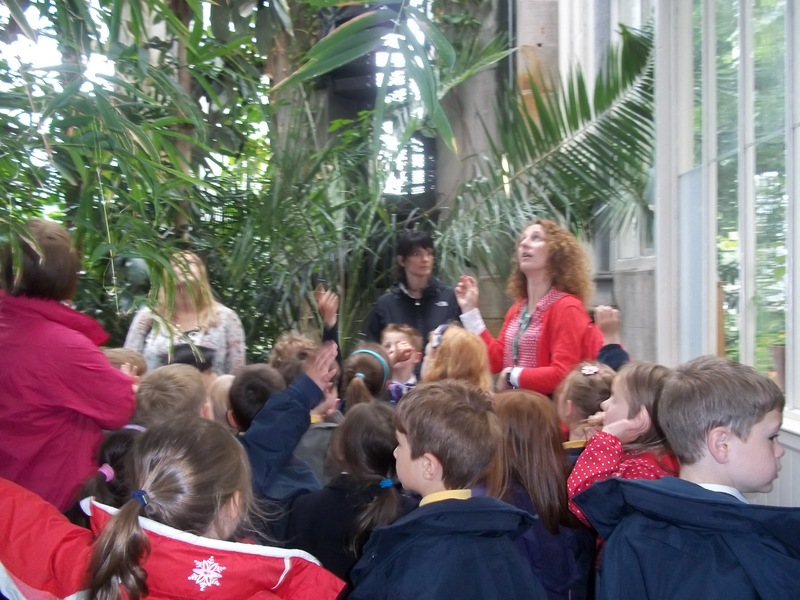 We have even made a song up about it with Mrs Johnstone. We know it is important not to give anyone our password or to use embarrassing photographs or to give out personal details to anyone. The person we are talking to on-line may not be the person we think they are. Welcome back to the new term in primary 3. Health week starts the week beginning 27th August , we are looking forward to our daily morning aerobics in the playground. Our sports day this year was different as we were all given countries to represent and the day started with an opening ceremony with national anthems and lots of flag flying. 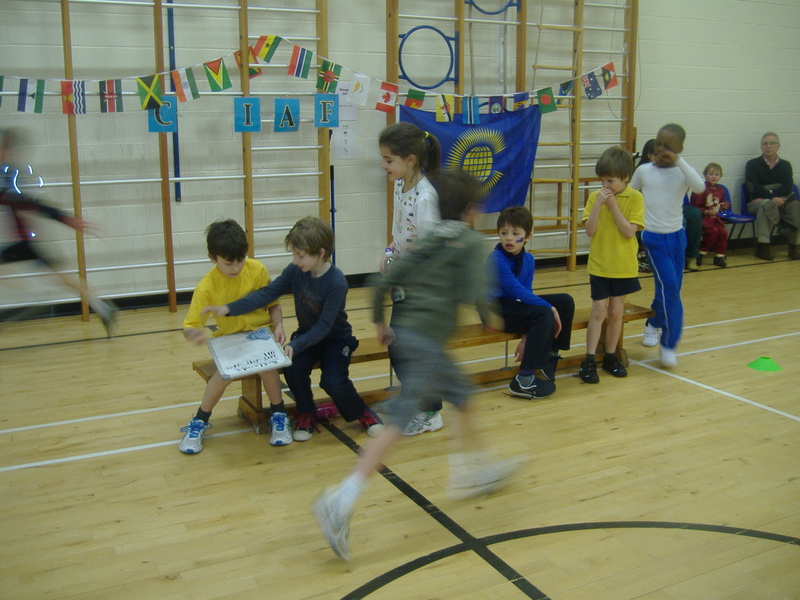 The sports for us took place in the afternoon and we all had a fantastic day. 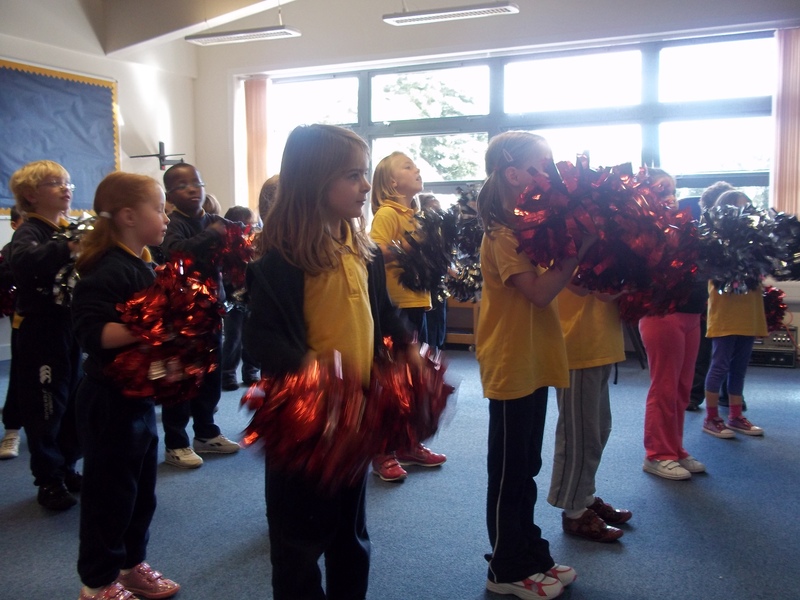 On the second day we had a closing ceremony and this time the Nursery performed some sticky kids and there was a display by our very own cheerleaders. It was very exciting. 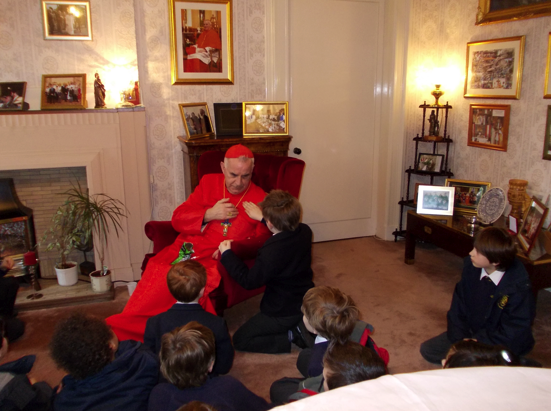 P3 had a wonderful visit to Cardinal O’Brien’s house on Tuesday 6th and 13th March 2012. Both classes enjoyed their visit and the Cardinal made them very welcome. The learned a lot of interesting facts about the Cardinal’ s life and joined him for a special service in his Chapel. 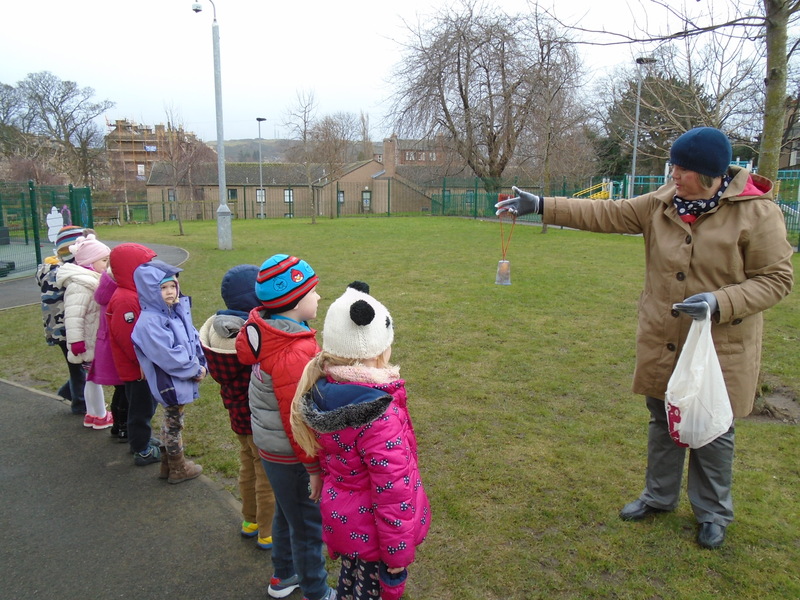 P3 went to East Links Country Park yesterday (28.2.12) and spent an exciting day exploring all the park had to offer. 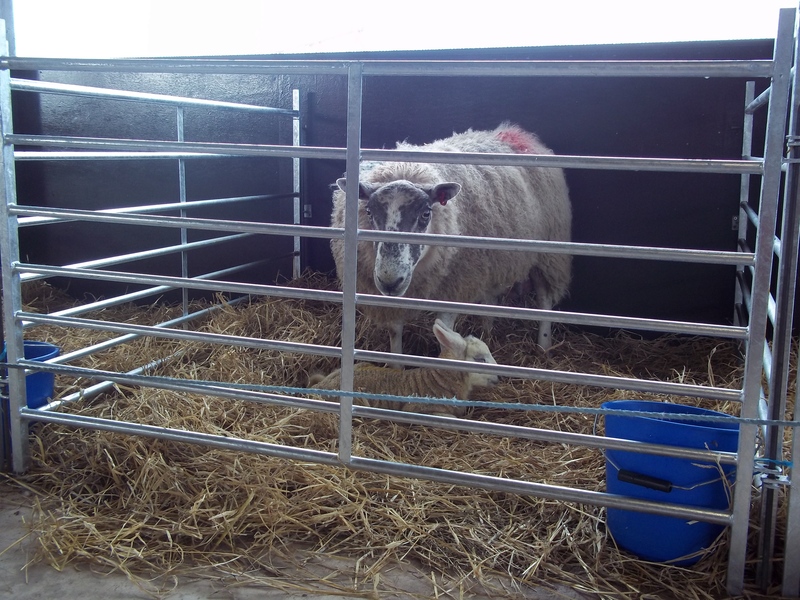 Some children were lucky enough to see lambs being born. 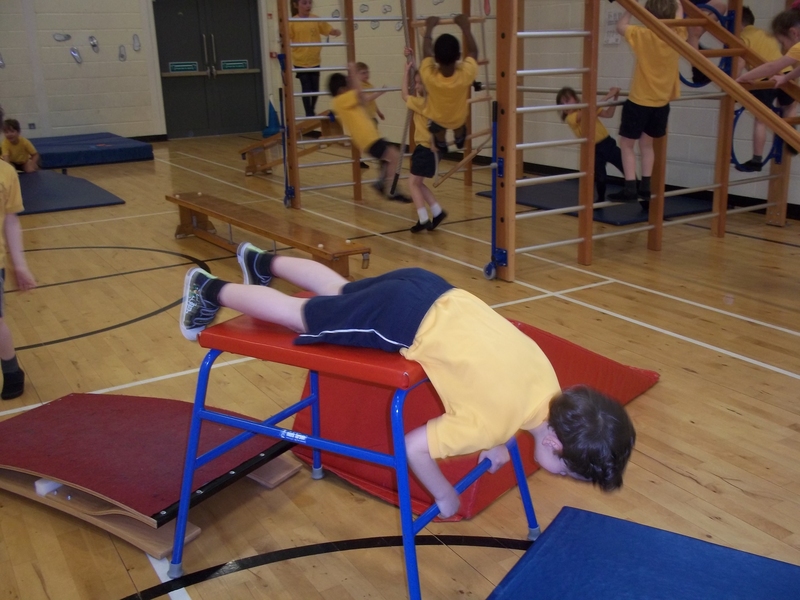 This term P3 will be doing gymnastics with Mrs Walker our P.E. specialist. 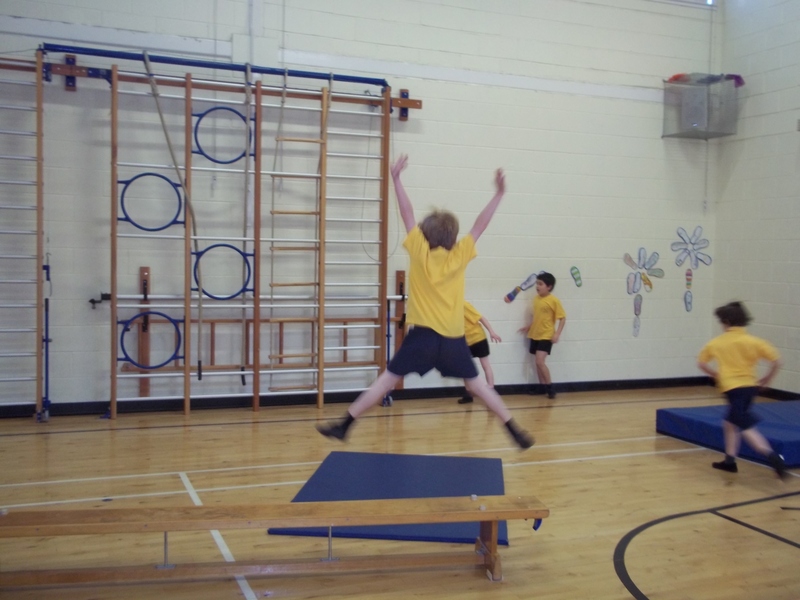 We will be learning balances, jumps and tumbles. Future stars of the Olympics in training. 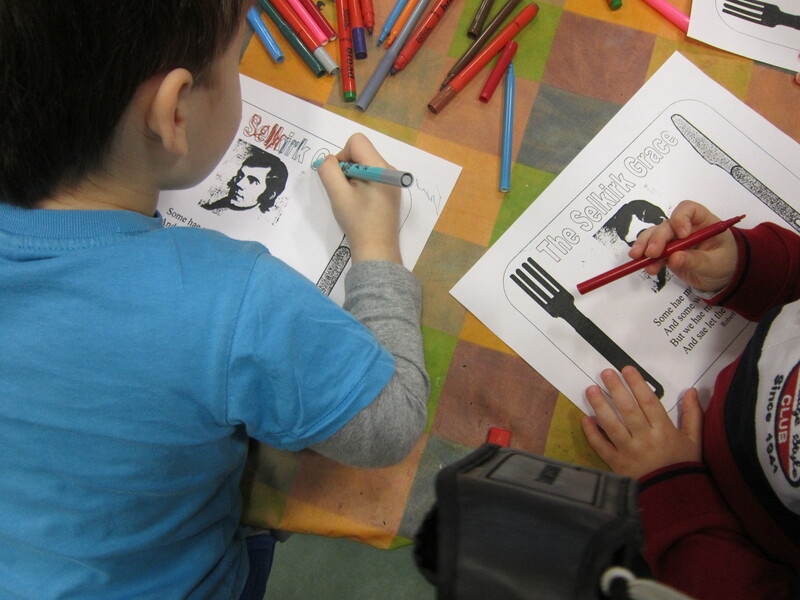 This term primary 3 will study Scot’s language with a focus on Robert Burns. We will also be studying Morningside and the local community. 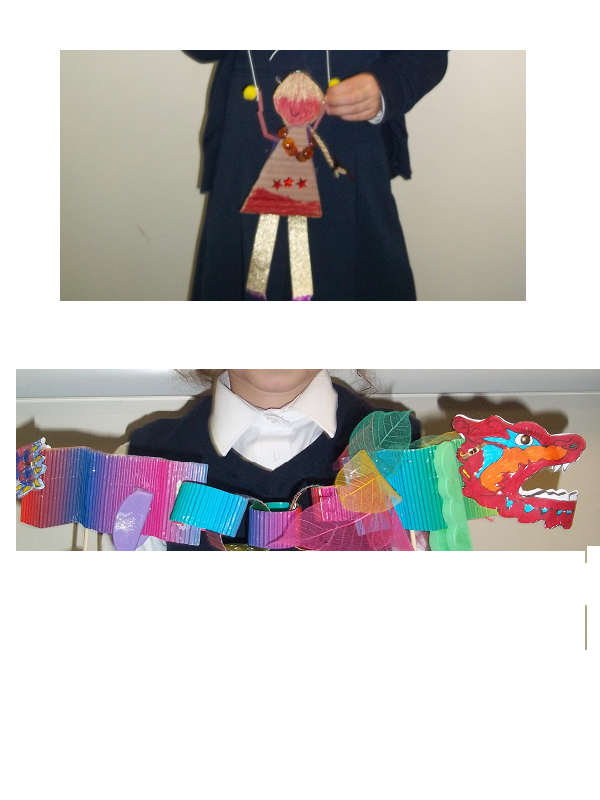 P3 have been busy preparing for Christmas by making a variety of different decorations to take home. 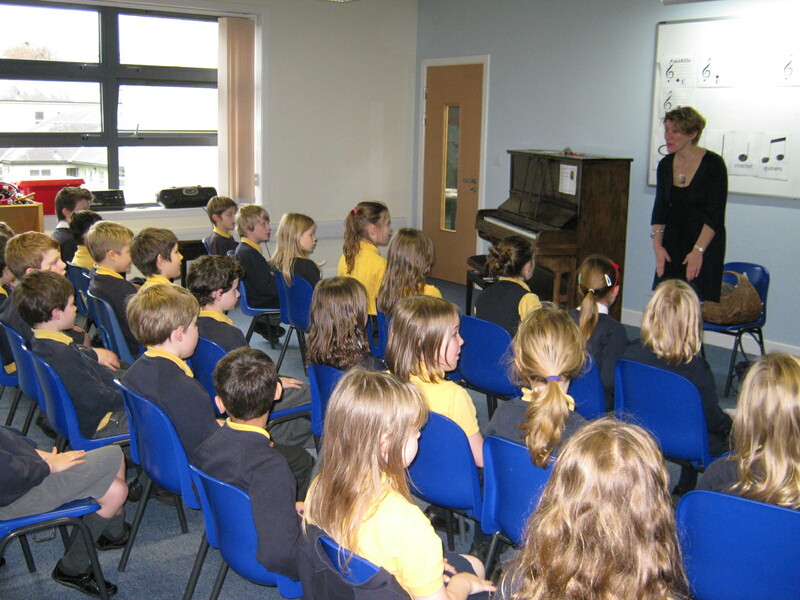 They have also been rehearsing a special song that they will perform on the last day of term assembly. 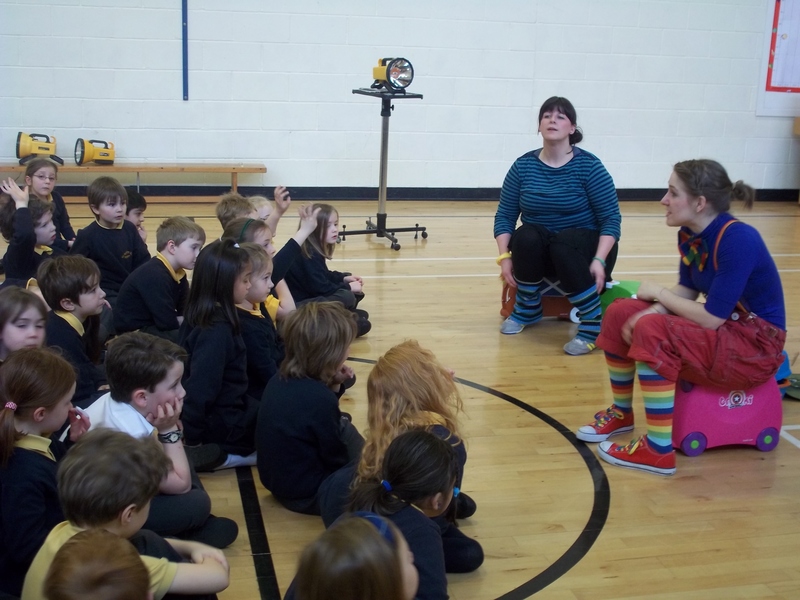 P3 were visited by Marie-Louise Cochrane, a former pupil at St.Peters, in her capacity as storyteller. 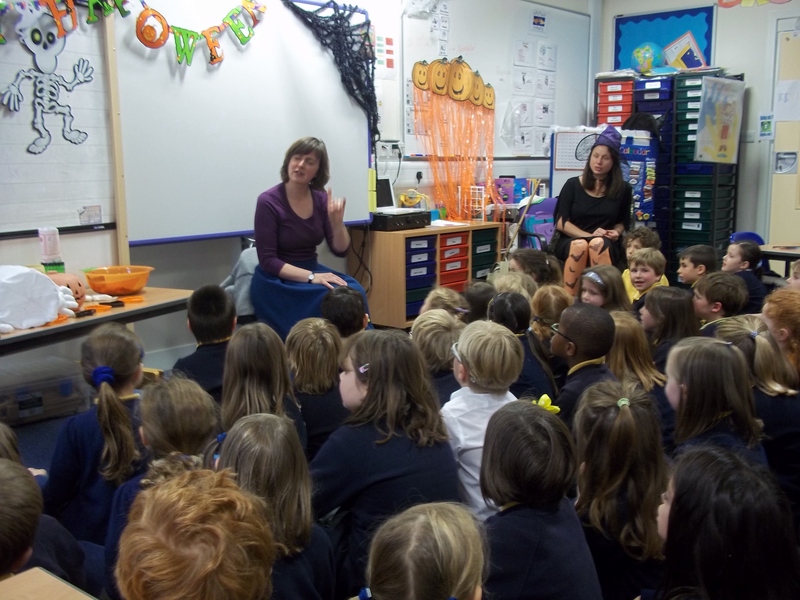 They particularly enjoyed the story of Mrs Mash. They really felt as if they were part of the story. 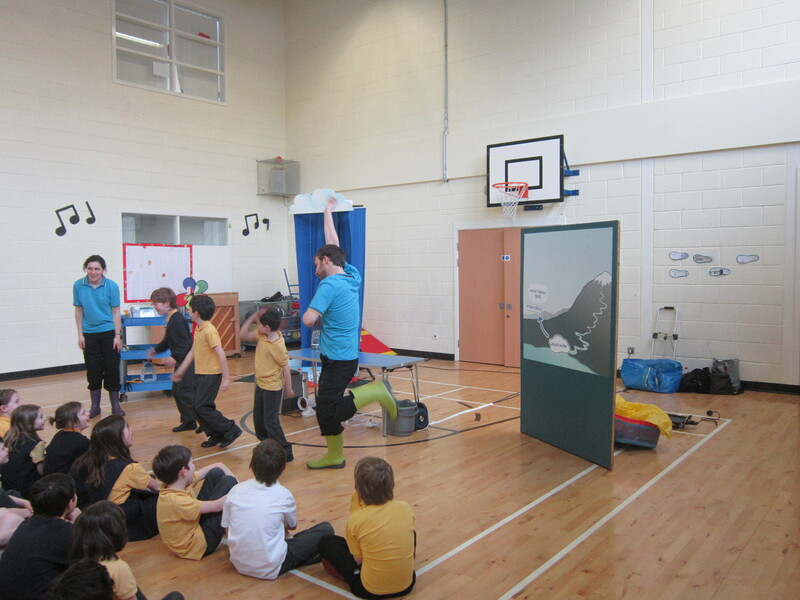 Primary 3 enjoyed a variety of activities during Health Week. Amongst these were Taekwon-do and football. 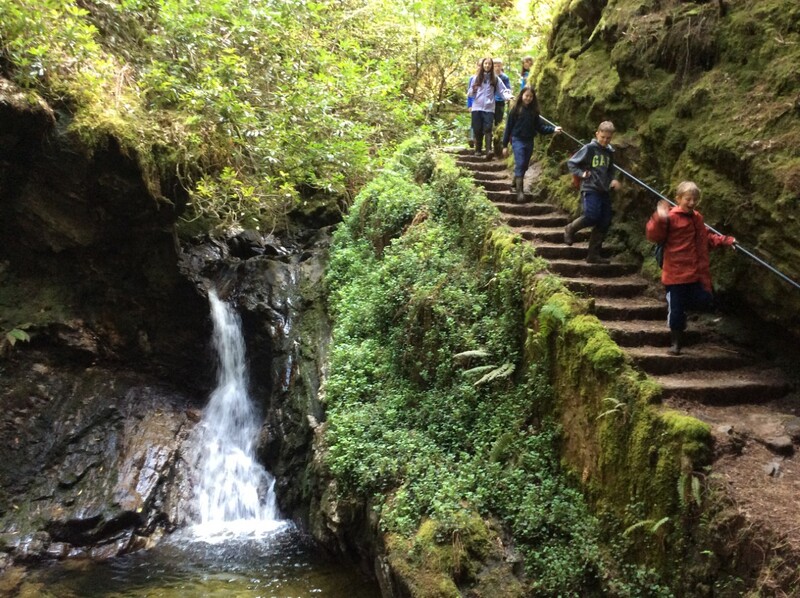 This P7 class have now moved on to High School. We wish them well. 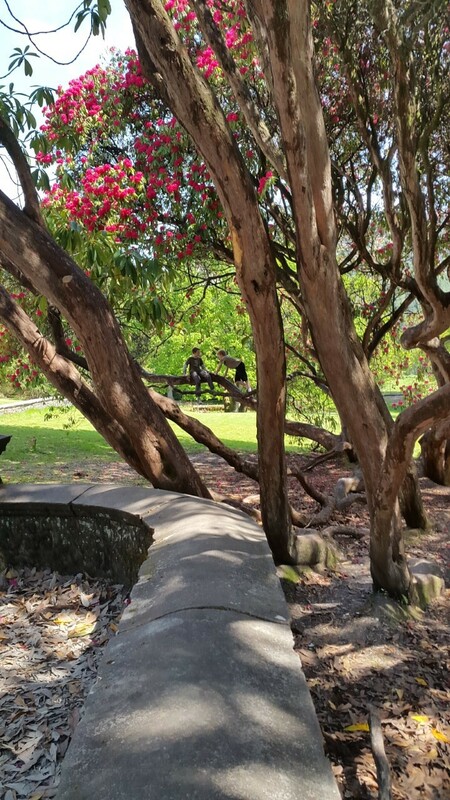 The Weather here has been good and warm when the sun shines. 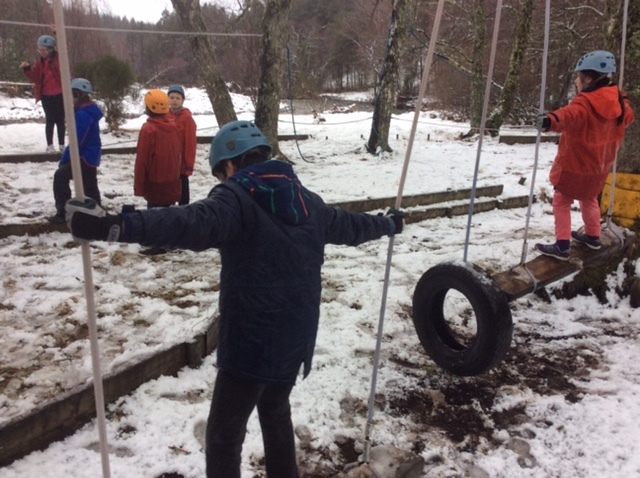 We have all been busy going from one activity to an other and having fun. 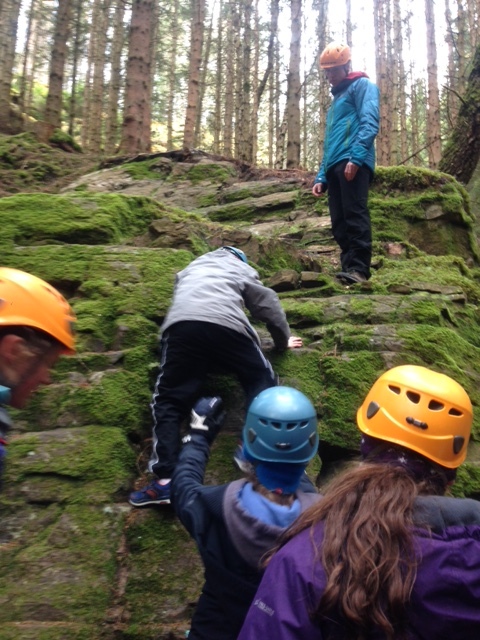 Just had our lunch and we are now going abseiling. Looking forward to the Disco tonight. Last night the children went out on a night walk and returned covered in mud. All managed to sleep soundly. (All that fresh air). 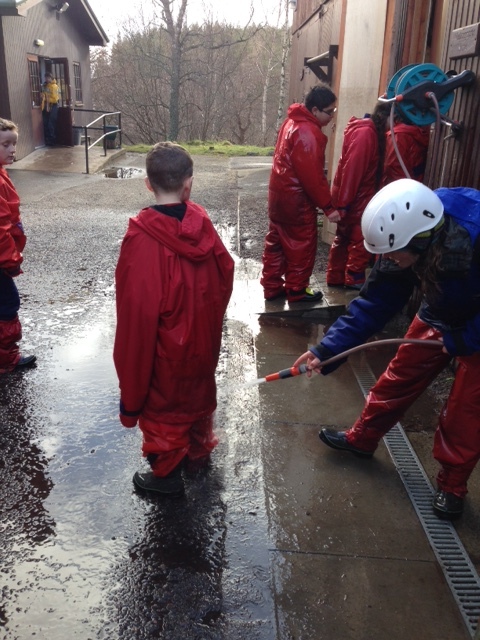 We have just had lunch after spending the morning Canyoning and we are now getting ready for our next activity. Photos will follow as soon as internet allows. 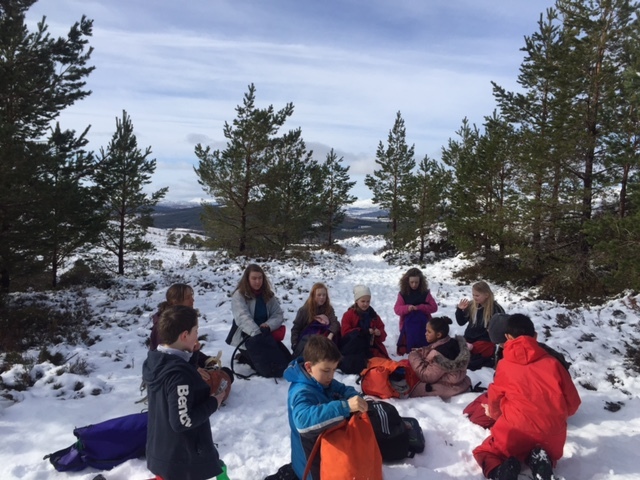 What to bring to Benmore. Follow the links below. 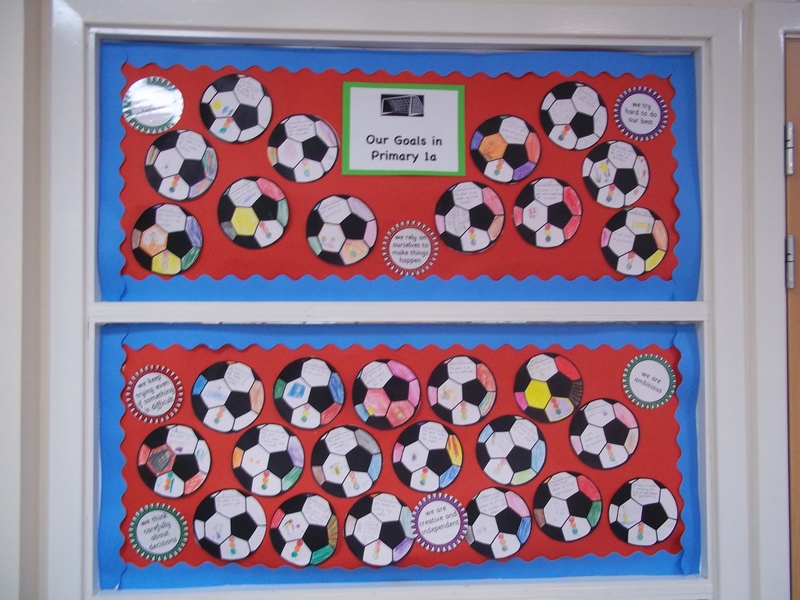 This week has been a very busy week in Primary 7. 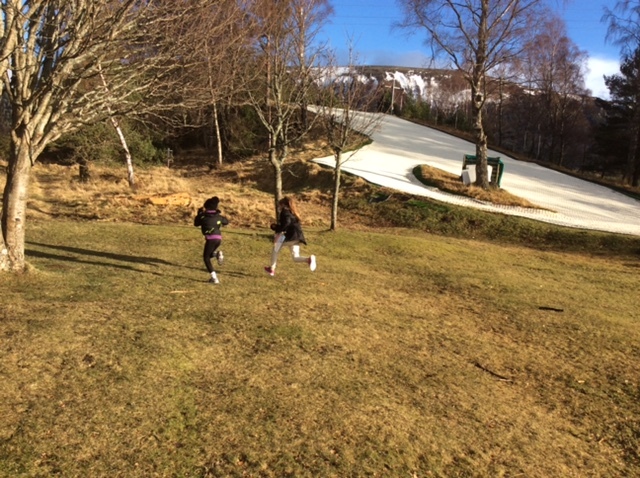 On Monday we had our first skiing lesson in P7 at Midlothian Snowsports Centre. 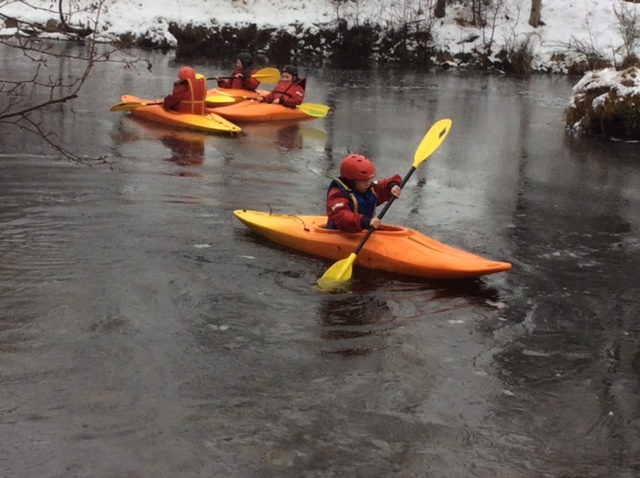 It was a cold morning but perfect for our enthusiastic skiers. Photos to follow next week. This was followed by a visit from Dog’s Trust where we learned about the role of dogs in WW2 as this is our topic this term. We learned about why dogs are still used in wars today with some stories about heroic dogs in years gone by. We also learned about how to look after dogs today and what to do if a dog we do not know approaches us. 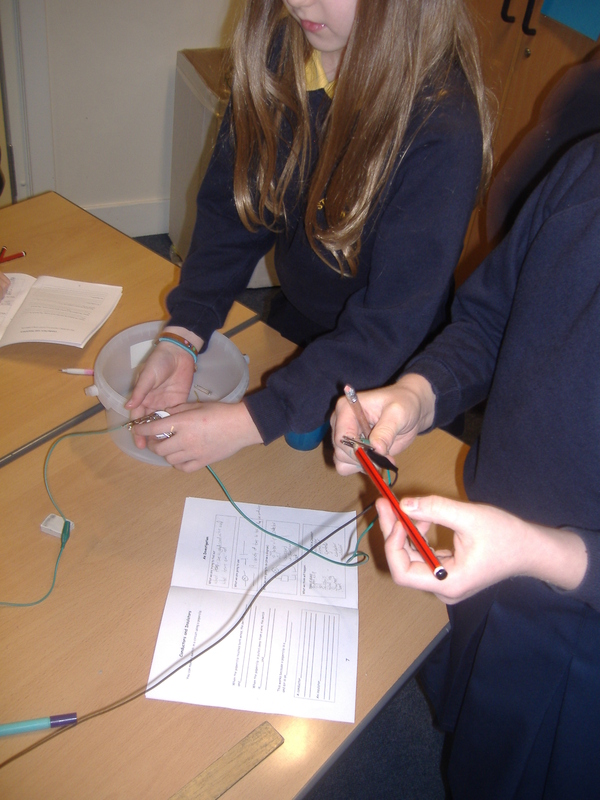 This term, we were invited to go up to St Thomas’ RC High School on two occasions to take part in exciting Science lessons based around energy. 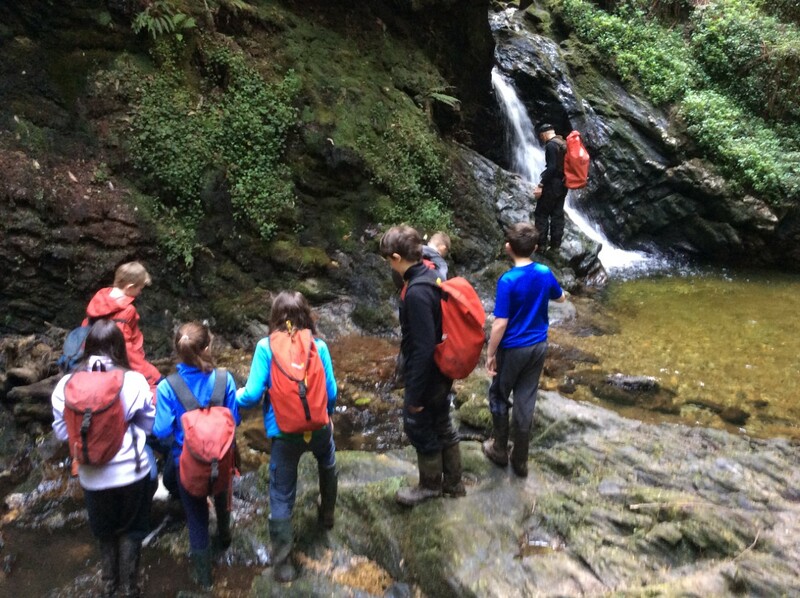 During the first trip, we explored what acid rain was and carried out tests on samples of water taken from reservoirs in Edinburgh and the Lothians. 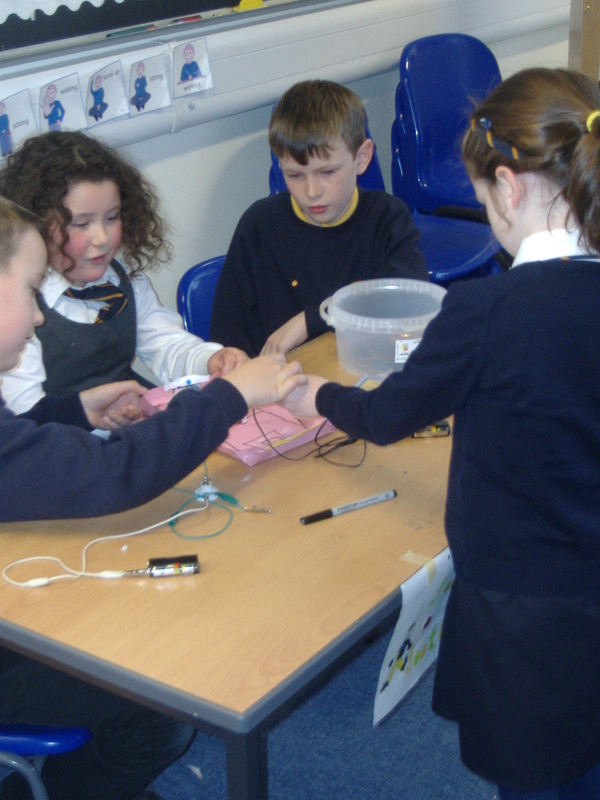 We were then given the challenge of investigating different types of renewable energy. 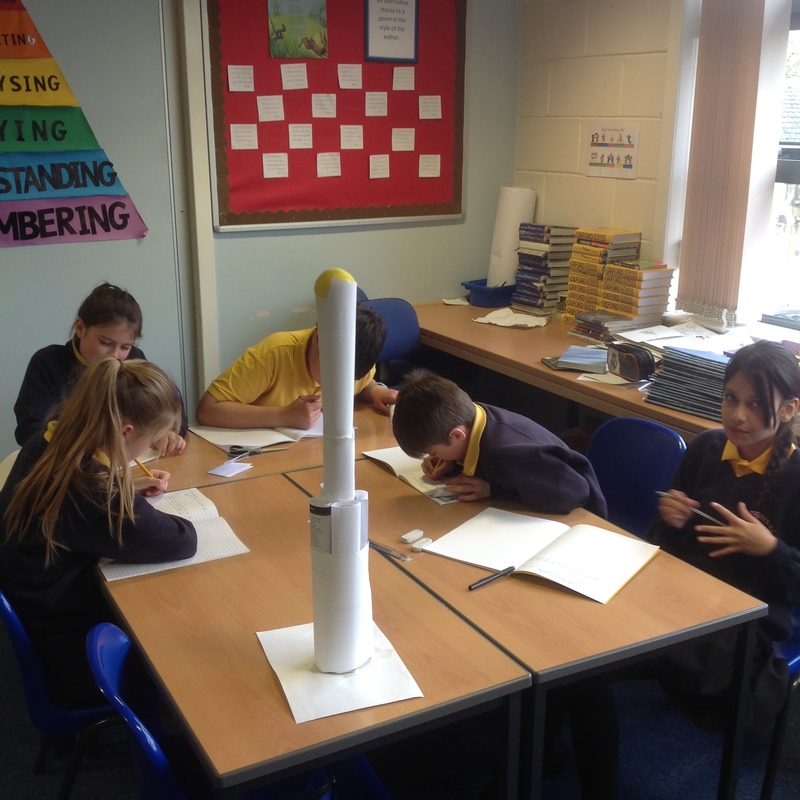 Our second visit to the high school involved being put into teams and given the task of designing our own wind turbine. 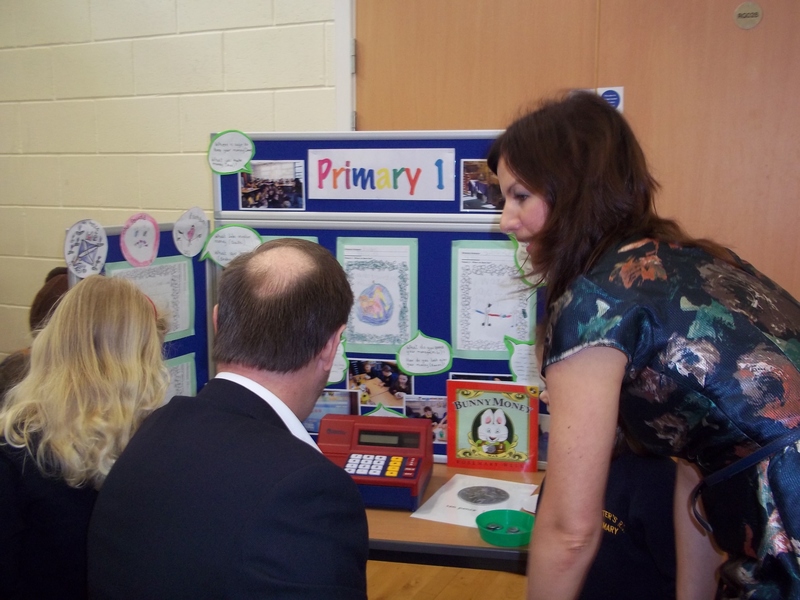 It was great to see what life will be like in school next term and to meet a few of our new teachers. 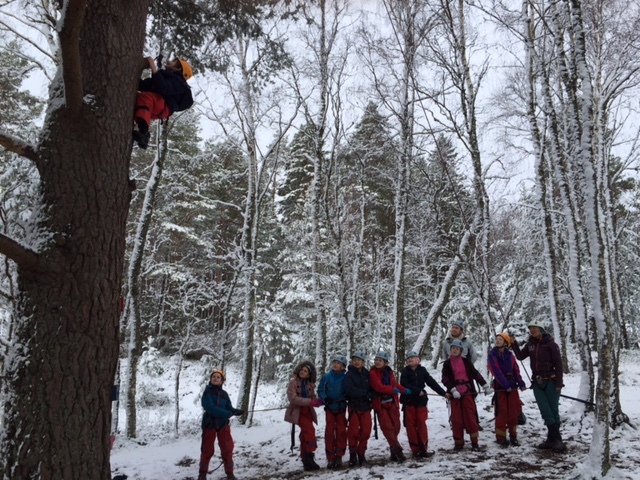 We have just joined P7 and it has been a great experience so far. We have worked on place value and decimals. 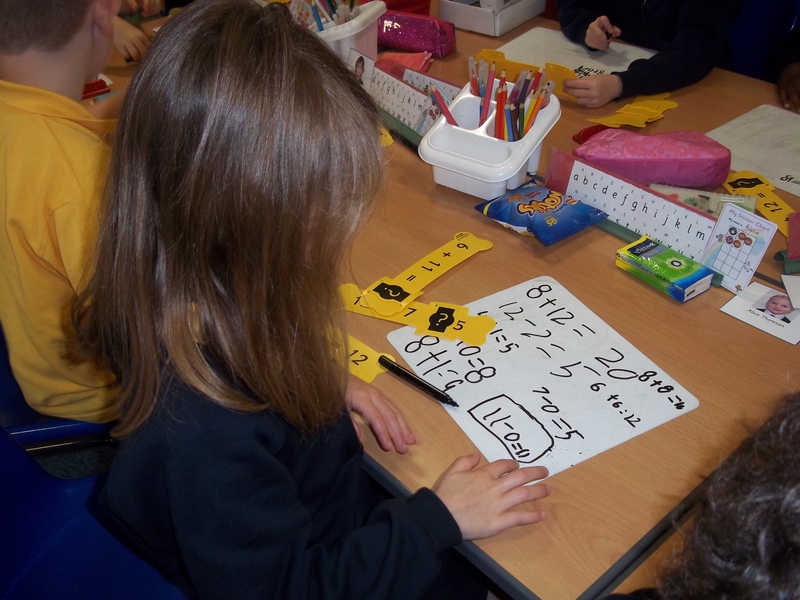 In decimals have been multiplying and dividing by multiples of 10, 100 and 1000. 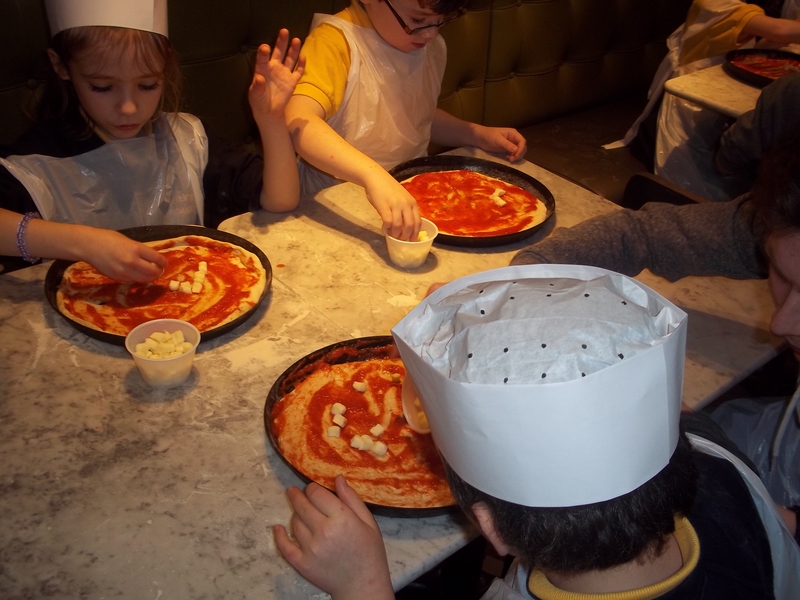 To help us relate this to real life situations, we planned a party with a budget of £400. We have also started a topic on South America. In engineering we made spaghetti bridges which consisted of making a structure capable of holding 250g above the ground only using raw spaghetti, rubber bands and sticky tape. 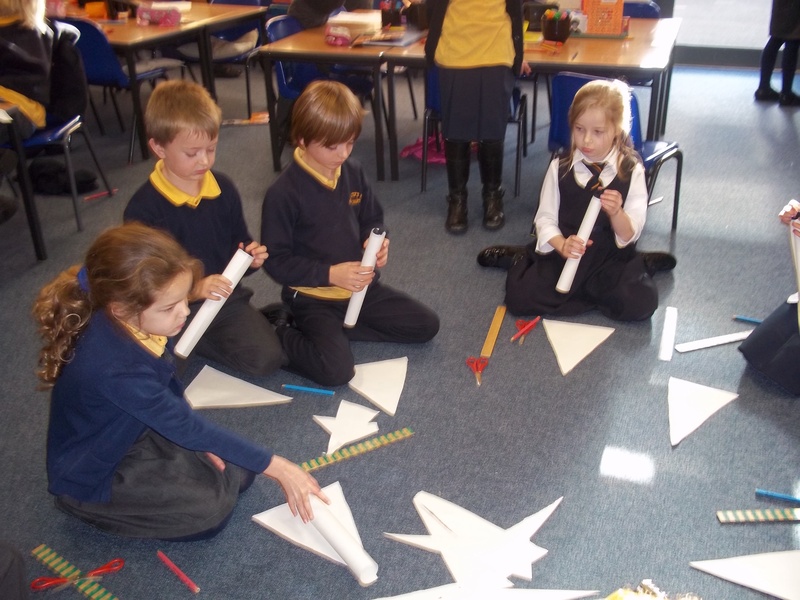 We also made helicopters using paper and paper clips along with creating geodesic domes using cocktail sticks and sweets. We made up to the top of the hill. All 800 metres of it. 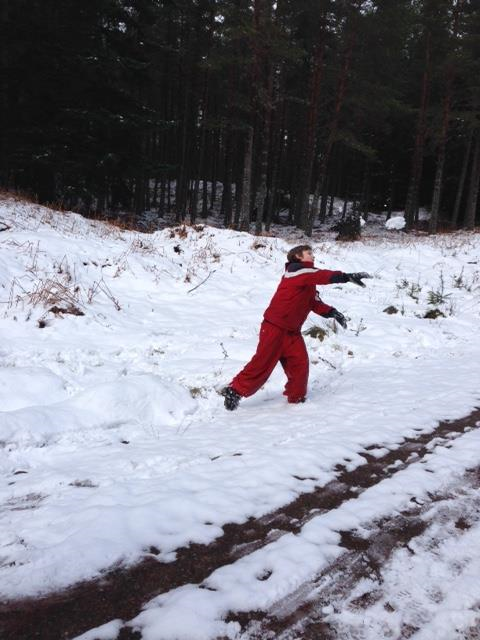 There was lots of activities in the snow today. 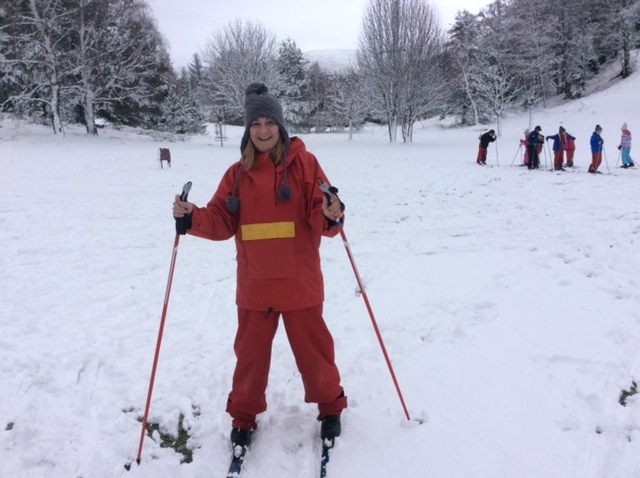 Mrs Hunter had her first try of cross country skiing. 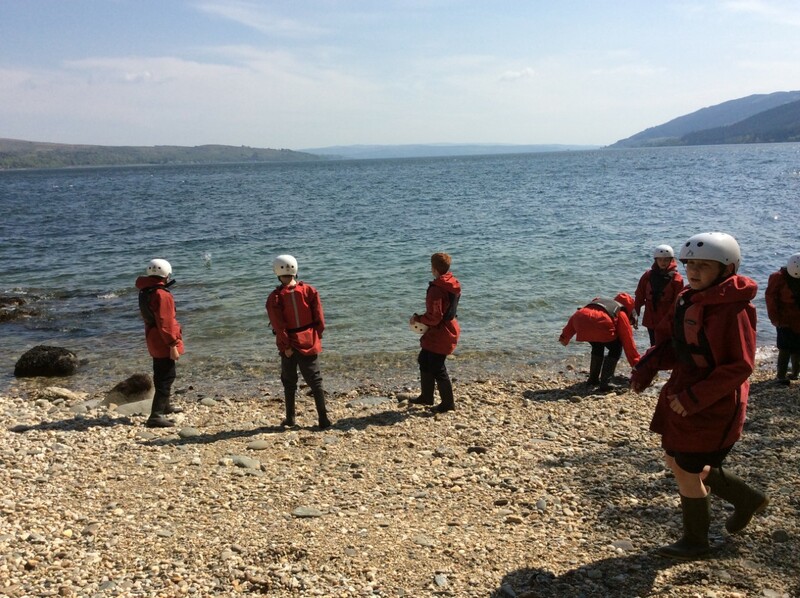 We went canoeing, gorge walking, tree climbing, hill walking and fire building. 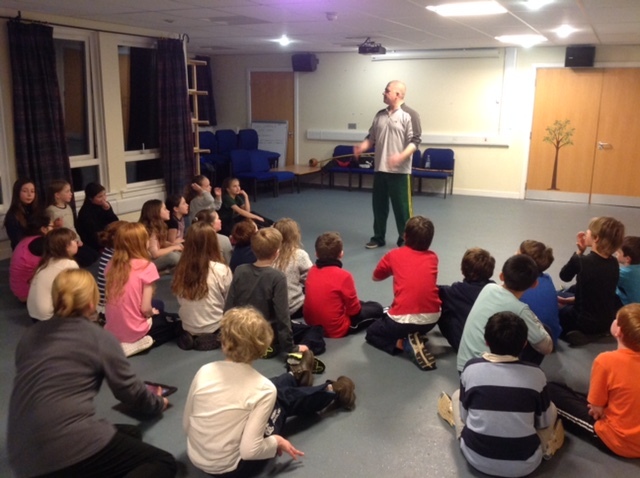 At night we took part in a copoeira lesson, which is a non-contact marshall art that originated in Brazil. 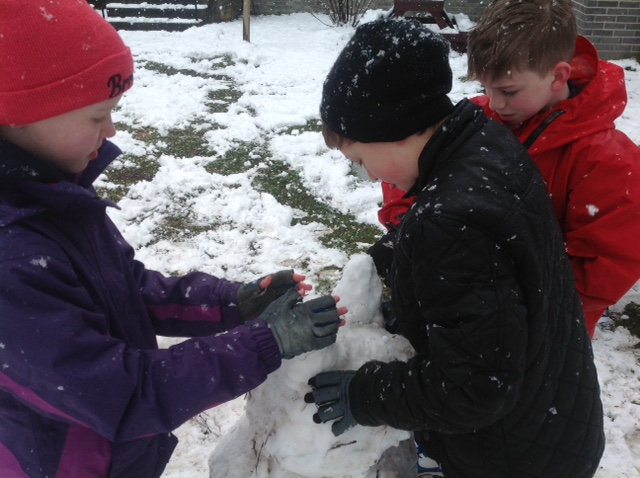 There has been move heavy snowfall this afternoon so looking forward to more snowy activities tomorrow. Our journey went smoothly (no sick bags were needed) and the children were fascinated with the new Queensferry Crossing. After exploring we got settled in and had tea. Lentil soup and Macaroni cheese. After tea we had a night walk. 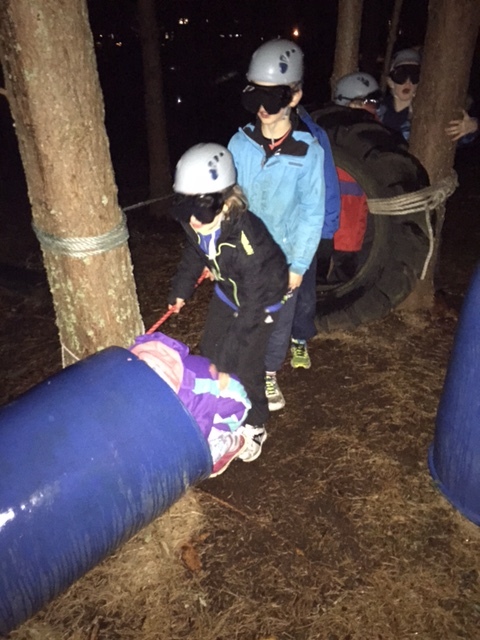 We had to work in teams to complete an obstacle course in blind folds and in the pitch dark. 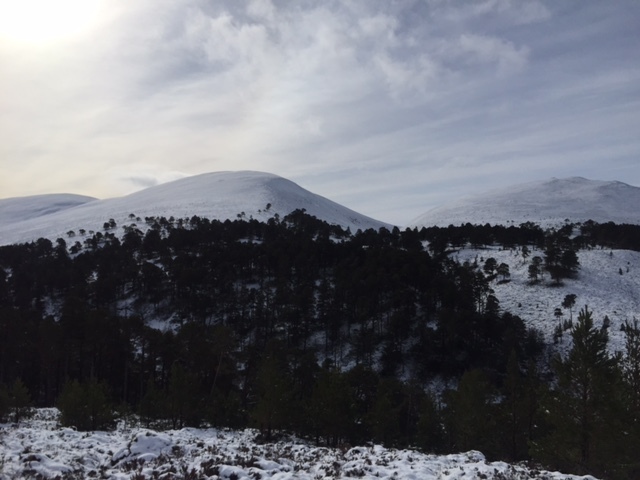 We have arrived to blue skies and sunshine with a little snow on the hills. And we’re off. 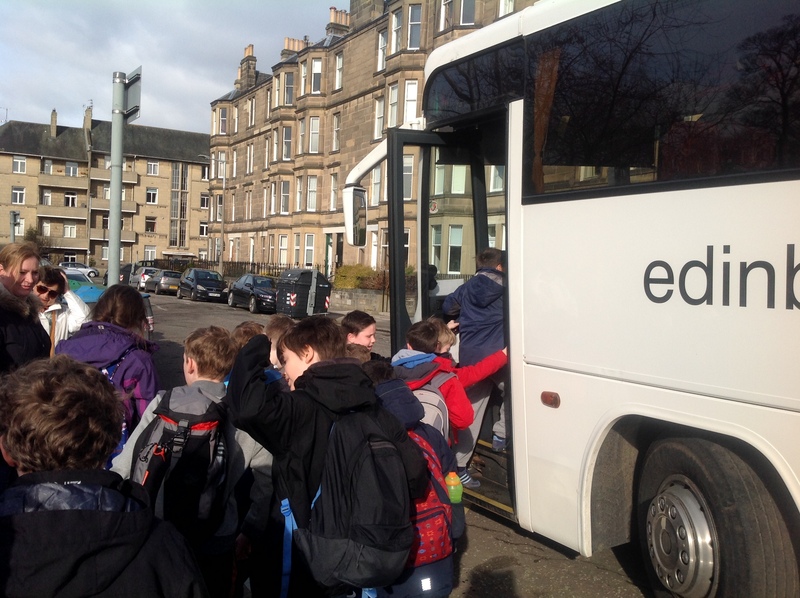 P6 left this morning at 9.45 to go to school camp in Lagganlia. There was much excitement and just a few tears ( but that’s enough about Mum and Dad). Watch out for more news. Final day. The early morning jogging club has fewer members this morning . Too many pupils sleepy this morning. It has certainly been a very quick week. 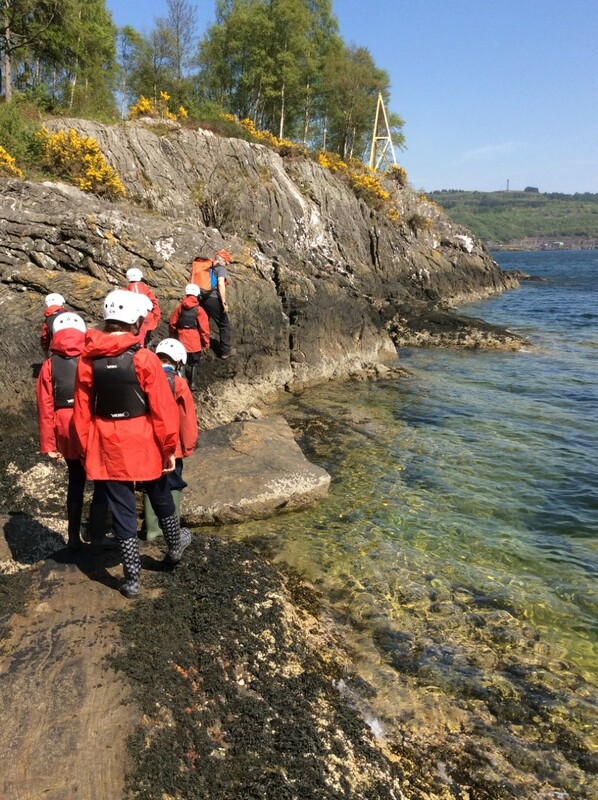 Last day of activites today and groups are going to Lock Eck to kayak and canoe and hopefully, depending on the wind we might manage to get some sailing as well today. 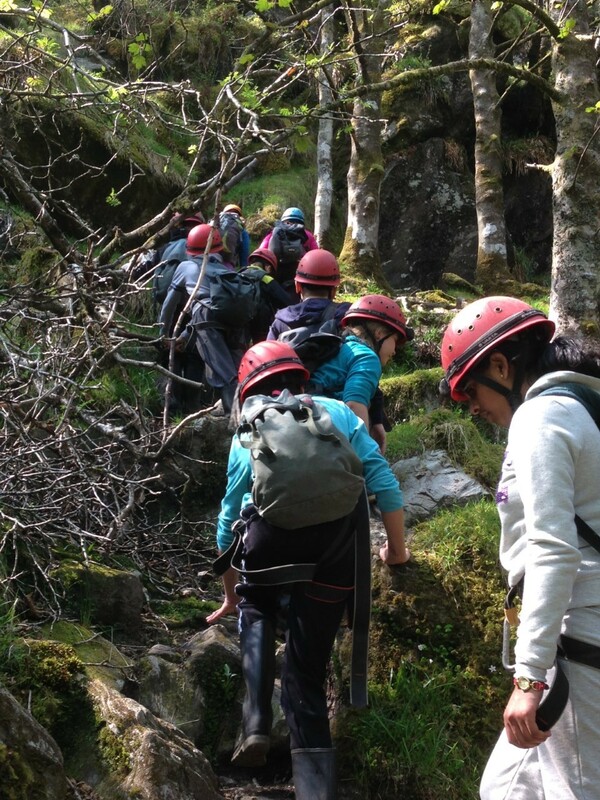 There are groups also going up the gorge today. 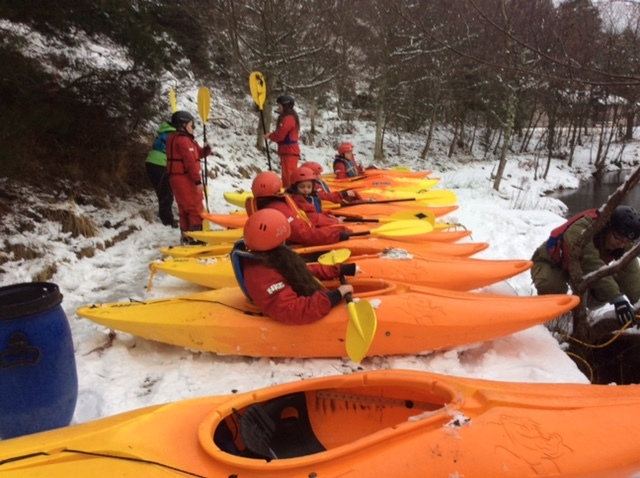 All pupils have participated extremely well in activities this week and many of them have surpassed their expectations and really pushed themselves to master new skill. Not surpisingly, pupils are still talking enthusiastically about this evening’s disco. 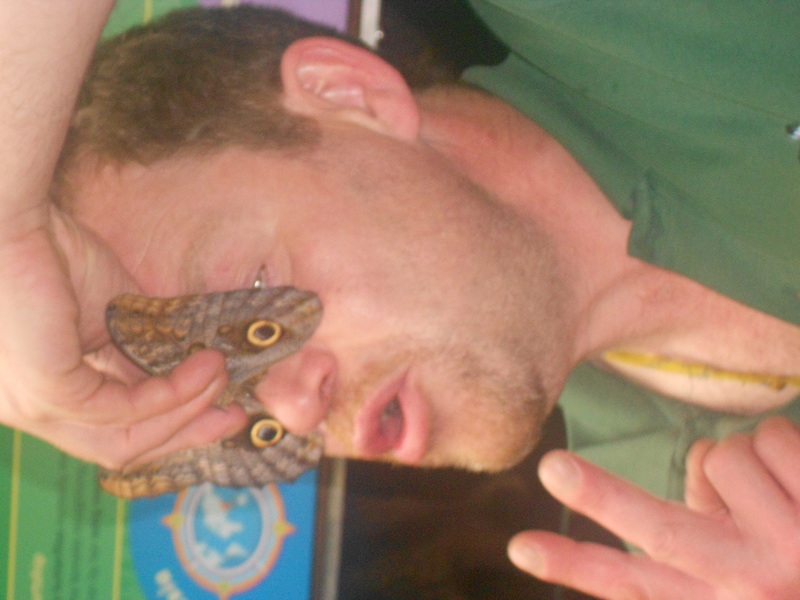 I believe Mr Pritchard is going to be taking the quieter option of board games and reading in the library!!! 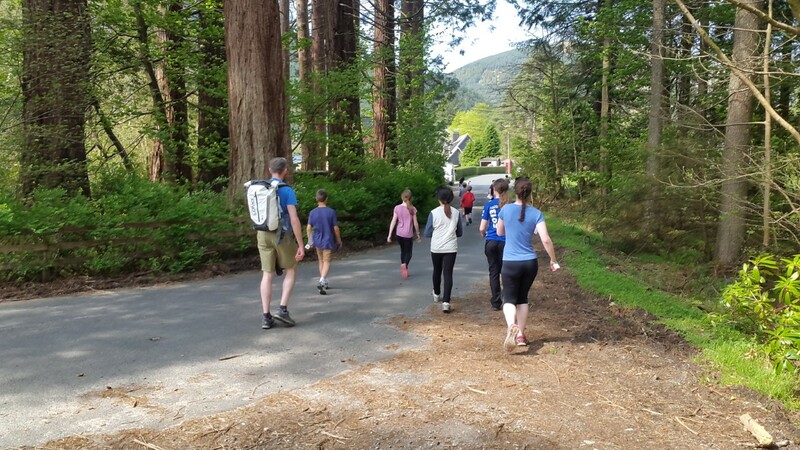 We look forward to seeing everyone tomorrow and I am sure that your children will have plenty more to tell you about their Benmore experiences at the weekend. 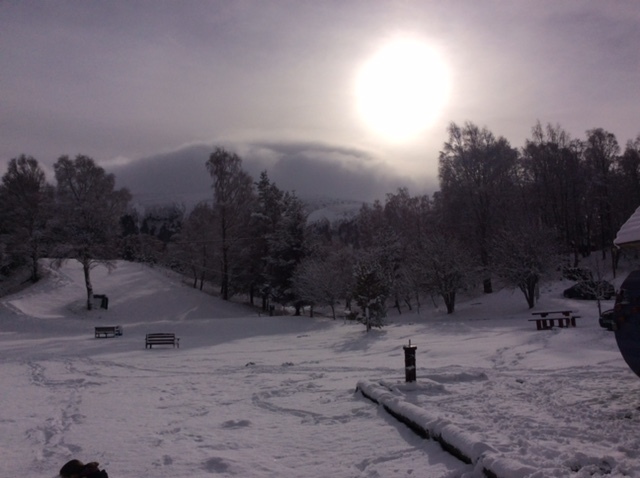 Yet another bright sunny day here at Benmore. 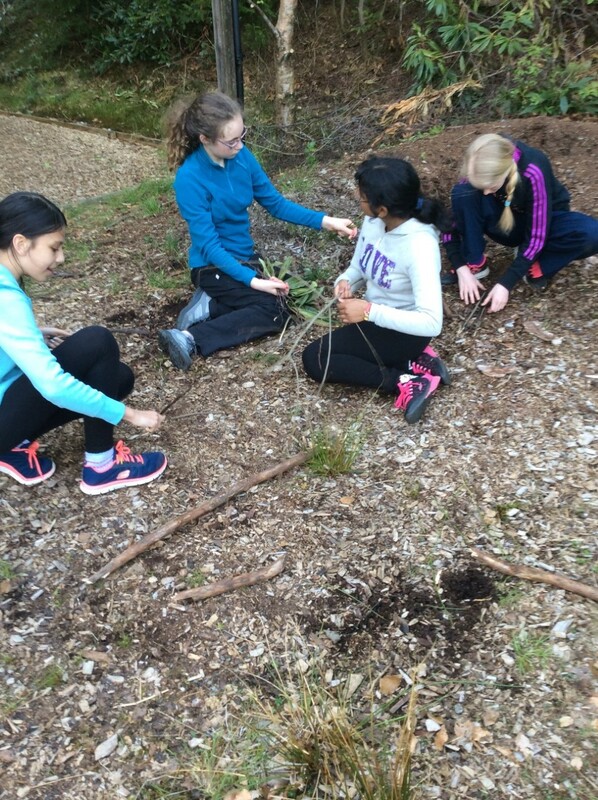 All pupils have been extremely busy in a variety of activities today. 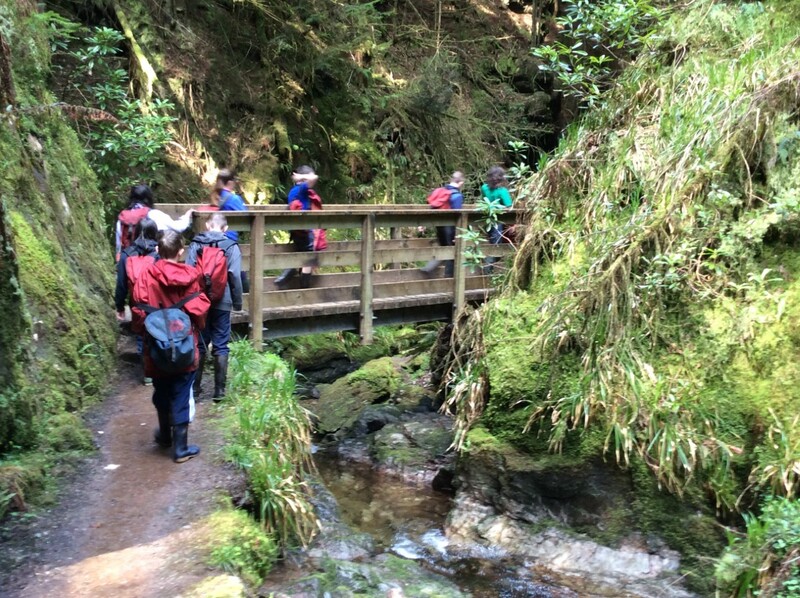 One group had great fun in Puck’s Glen. 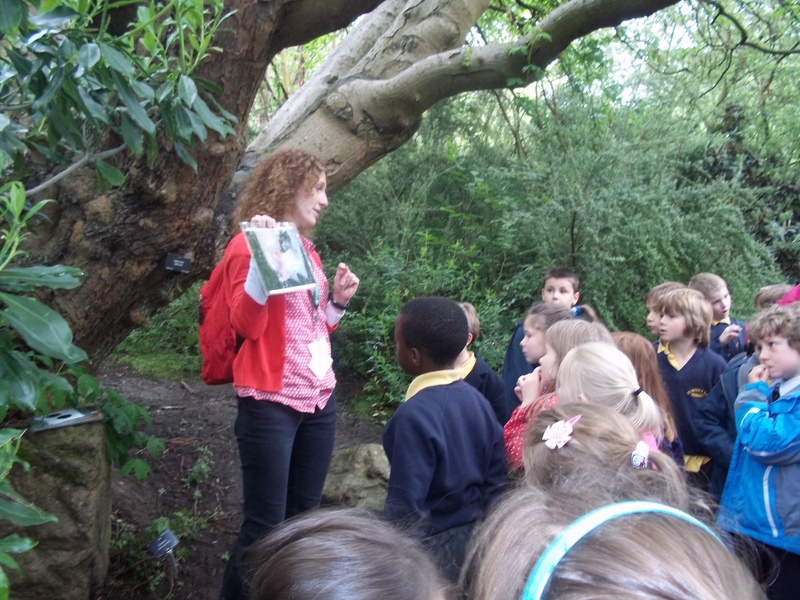 They learned a lot of interesting information about different trees, plants and fungi. 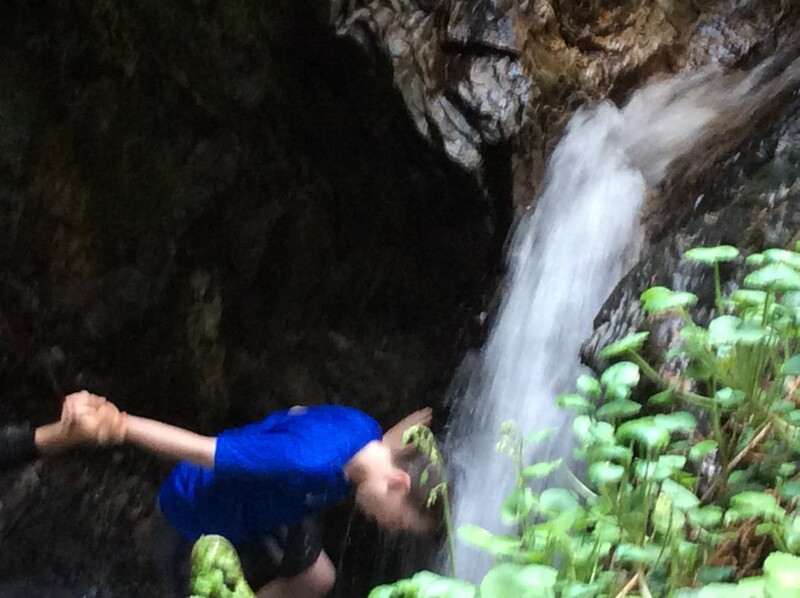 They aslo had time to rinse their hair in a very cool waterfall! 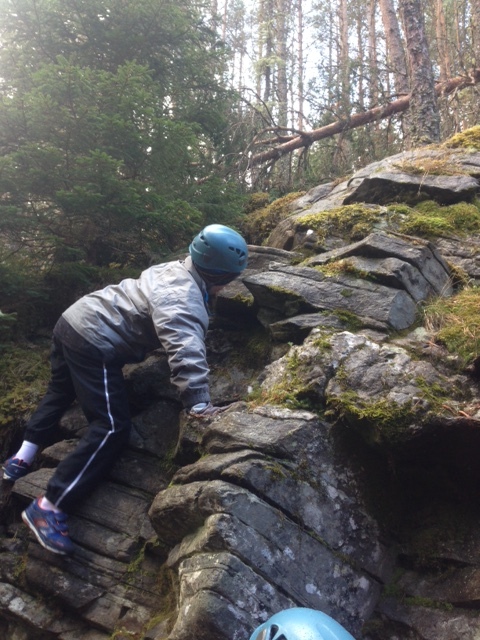 Other groups were gorge walking, climbing and abseiling as well as orienteering and caving. 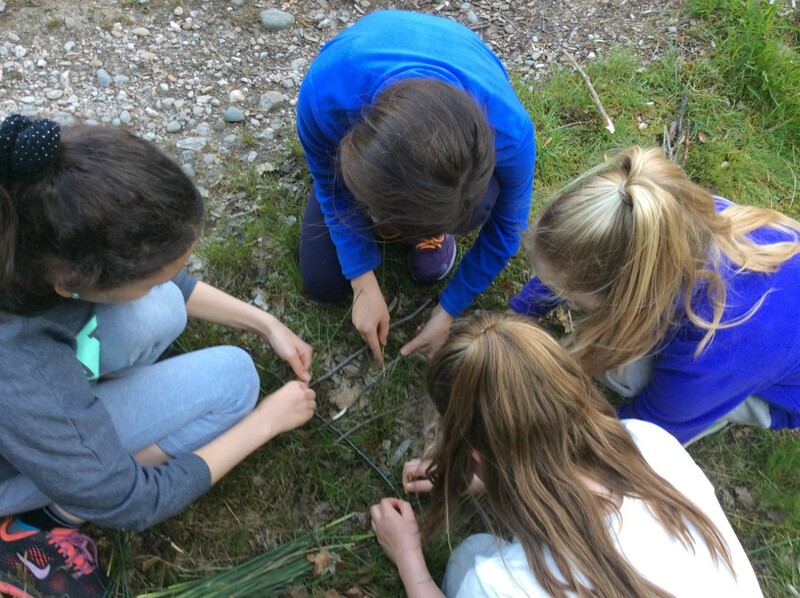 Tonight there was a creative activity where children worked in groups to make their own mini rafts out of twigs and grasses found in the garden. 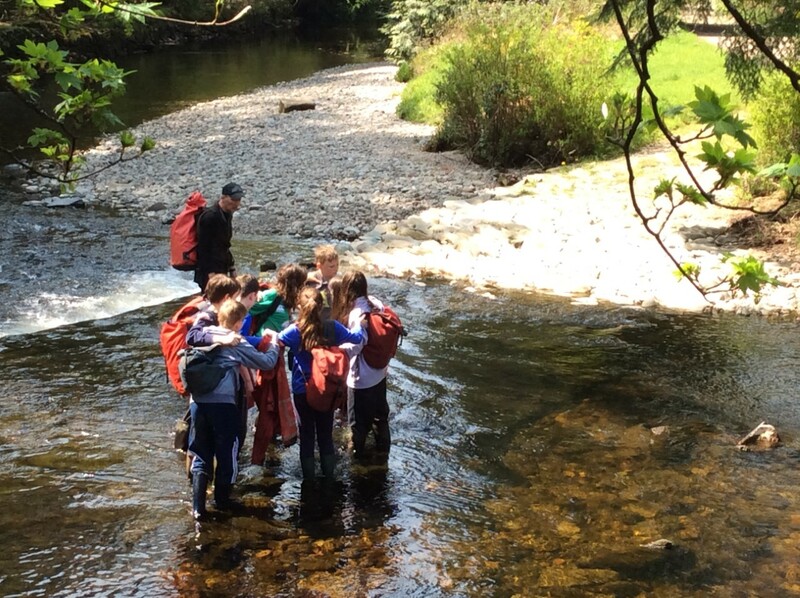 There was a raft race in the river where three rafts managed to nearly make it to the finishing line without breaking up! Pupils are already getting excited about tomorrow night’s disco, discussing music they would like played and the outfits they are planning to wear! 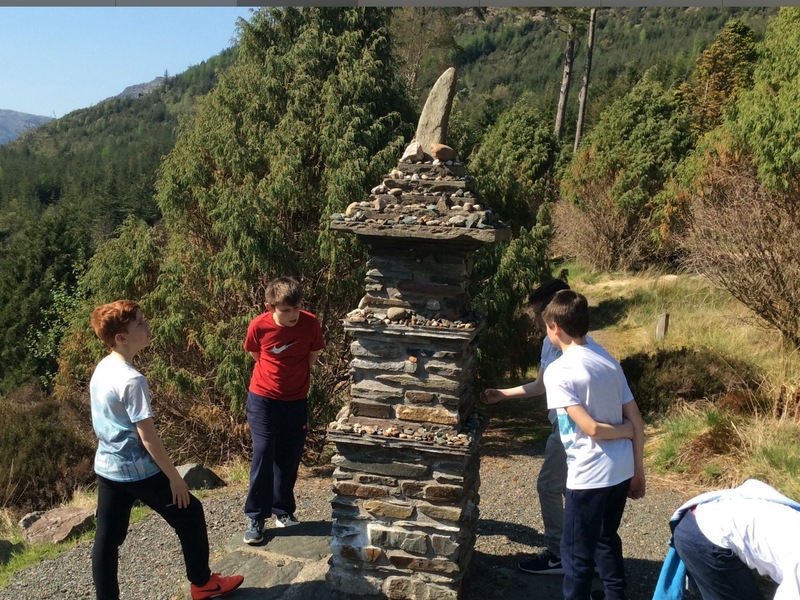 Another beautiful sunny day at Benmore and after a good sleep pupils got up raring to get started on their activities. 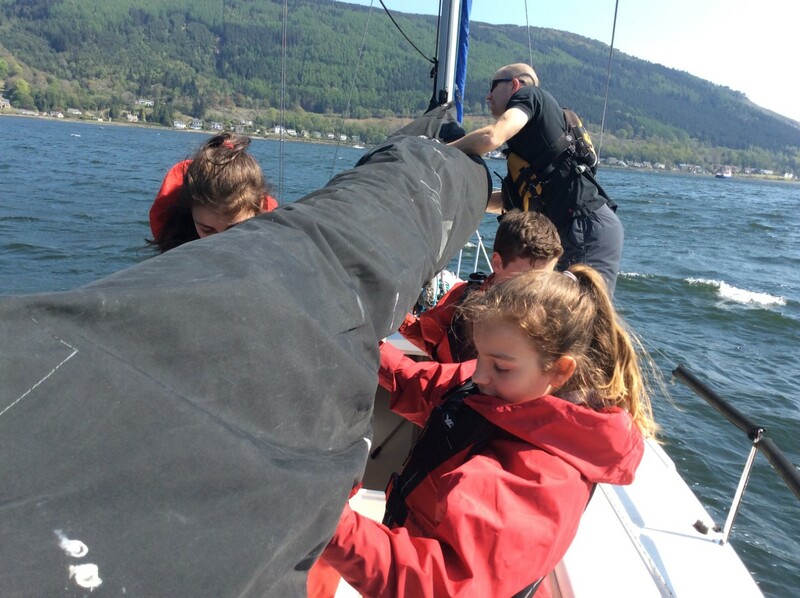 It was quite blustery on the loch so the sailing had to be stopped but pupils got a short excperience of setting up the sails and had a short swim afterwards in a beautiful crystal clear pool. 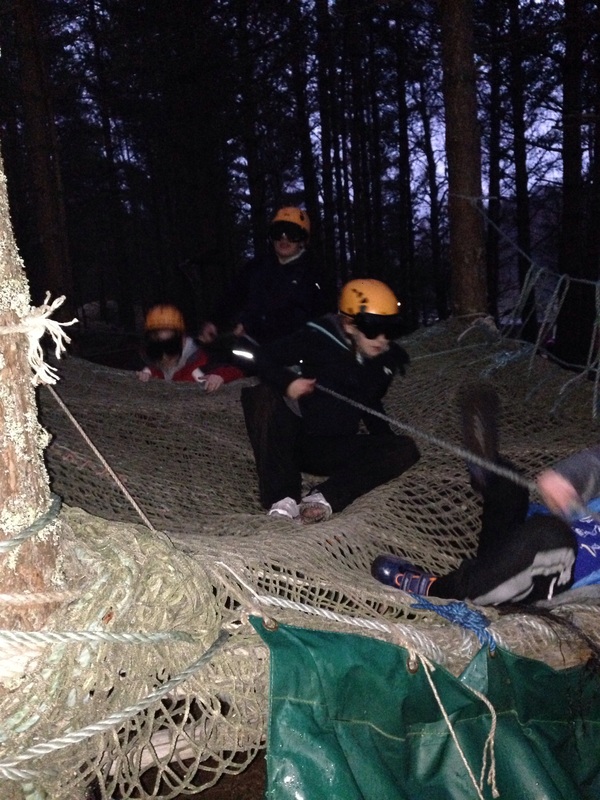 Groups went mountain biking, gorge walking, climbing and abseiling. 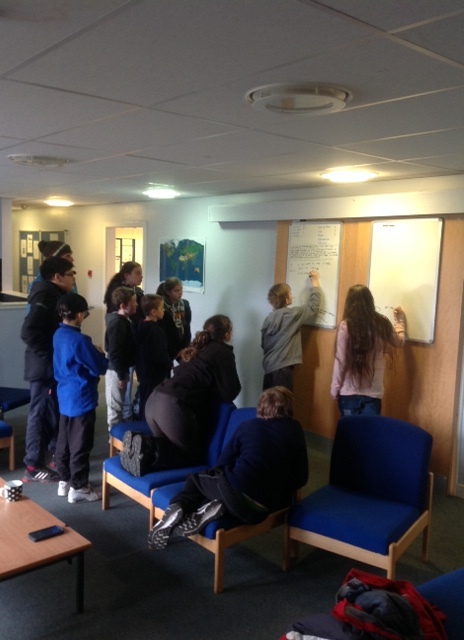 Pupils are quite tired this evening writing up their diaries before the tuck shop is opened. An evening activity involving hunting the teachers (hiding outside), will complete a very busy active day. 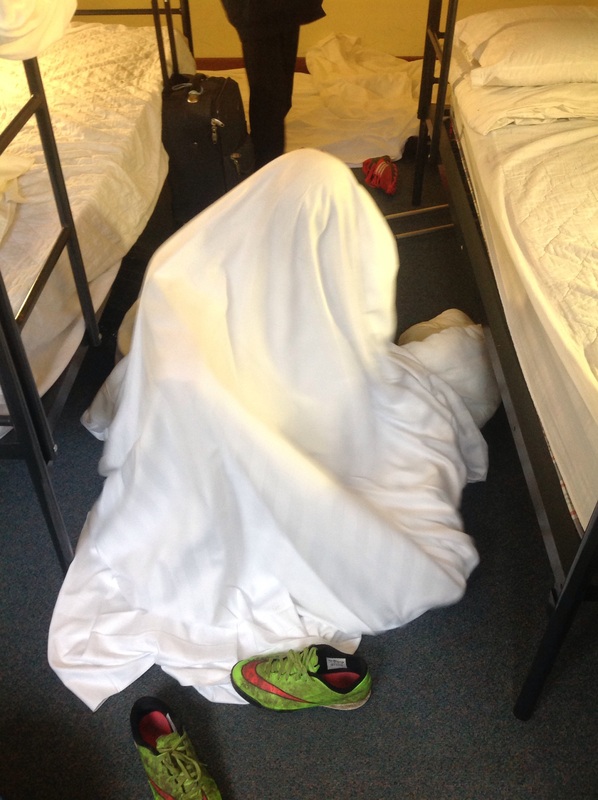 Hopefully all pupils will be fast asleep by 10.00pm tonight! 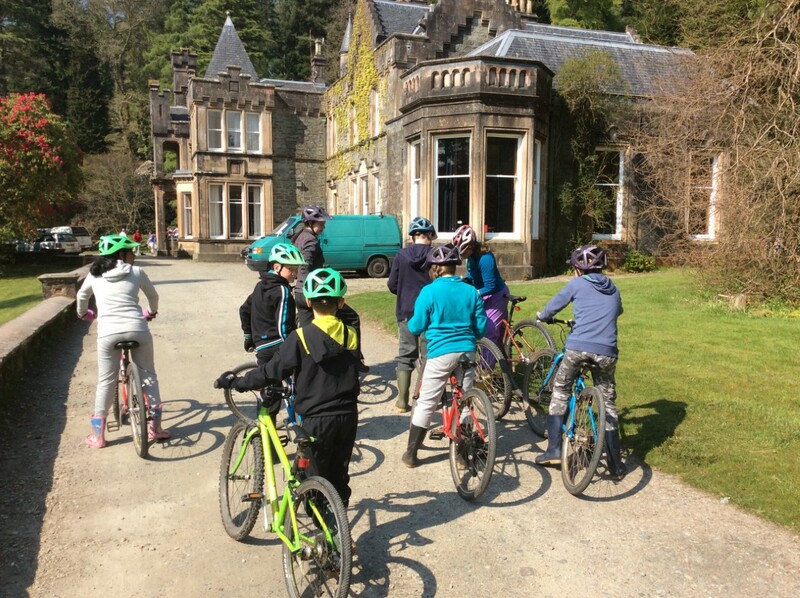 After a beautiful bus journey in glorious sunshine pupils and staff arrived at Benmore safely in the early afternoon. 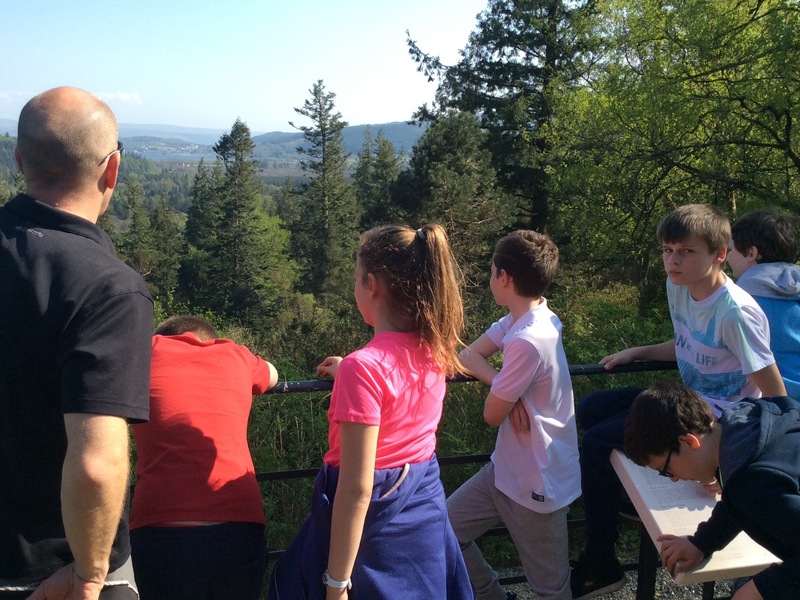 Pupils met their instructors and had a great afternoon exploring the Benmore botanical gardens and learned lots of useful information about the huge variety of trees growing there. 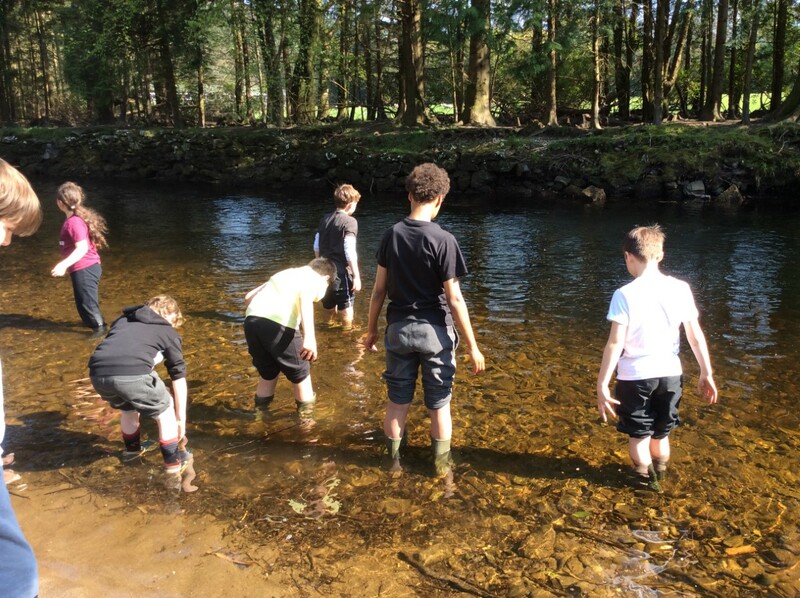 After tea pupils wrote their diaries and then went out In groups to the river for a refreshing swim! 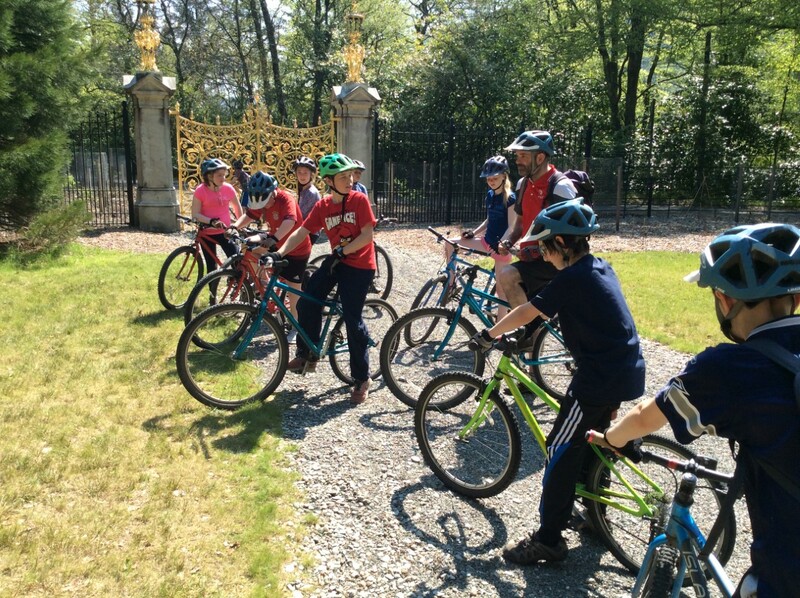 Tomorrow there will be many different activities hopefully again in the warm sunshine. 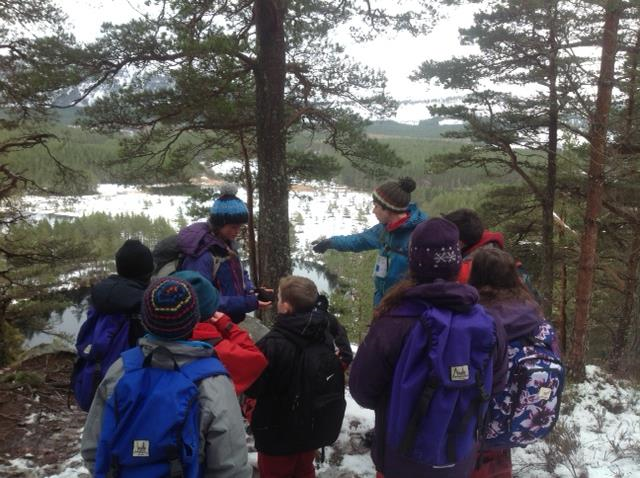 After our visit to Lagganlia it was back to school for a busy term. 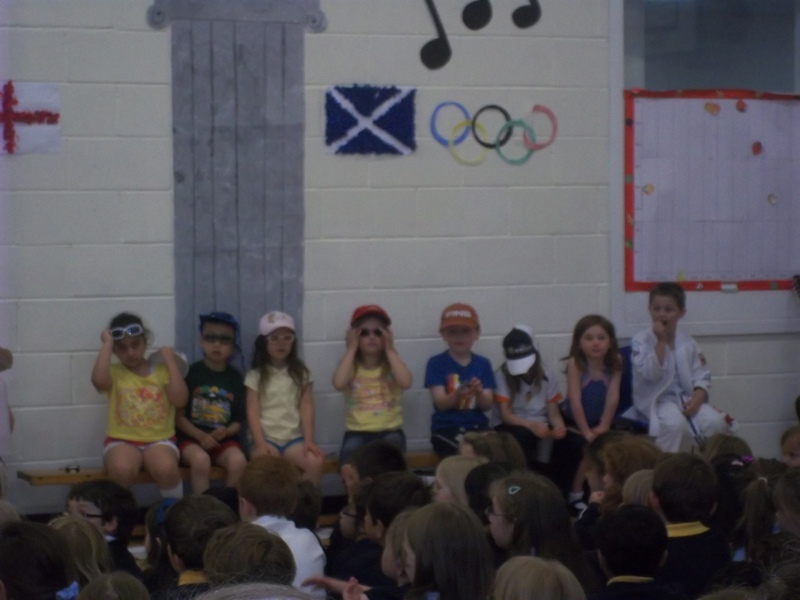 We took part in the P6/P7 show “Joseph and his Amazing Technicolour Dreamcoat”. An amazing experience and we cant wait until next year when we produce our own show. 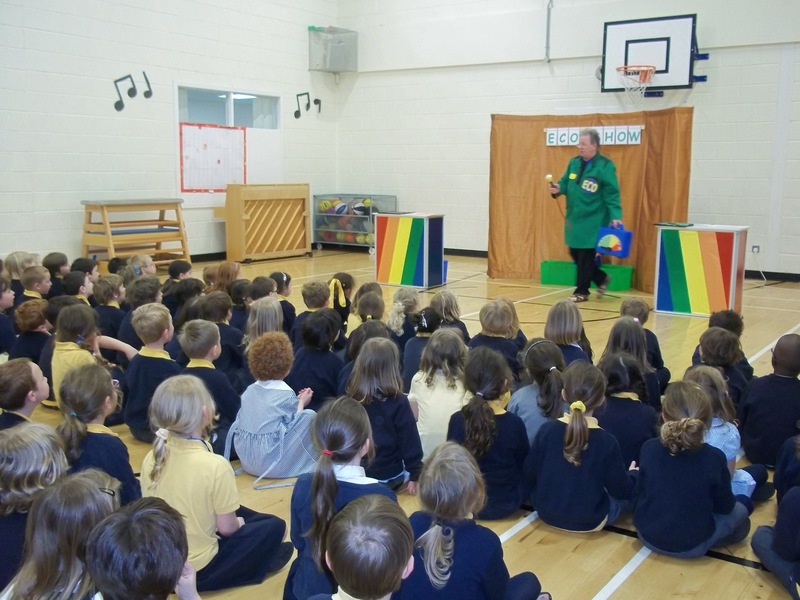 We have also visited St Thomas and participated in Carousel activites covering all the cirricular areas. This was really good and has made us realise that our time in Primary is going to be over in a year. We are all looking forward to being in P7. During a Science project we were asked to come up with a structure made from paper that would be strong enough to hold a tennis ball. 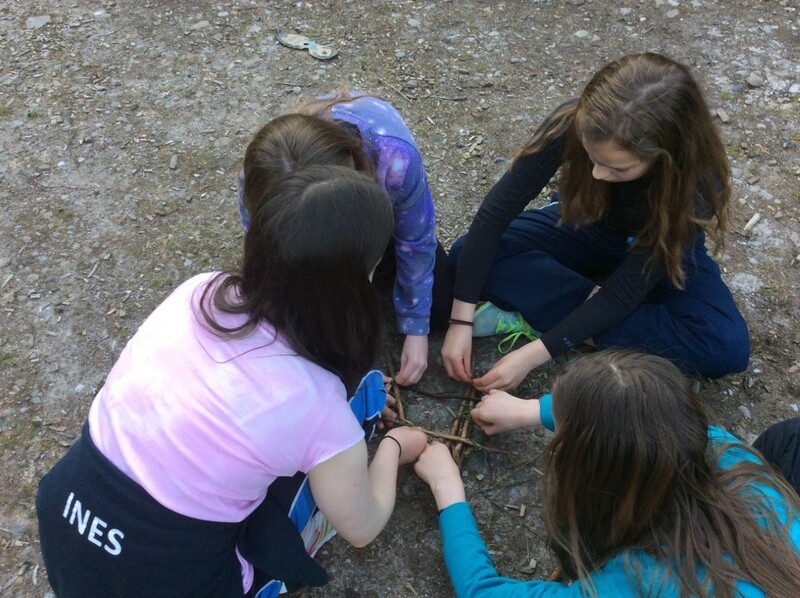 A lot of thought and experimenation went into this and we had fun building our structures. Some were more successful than others. 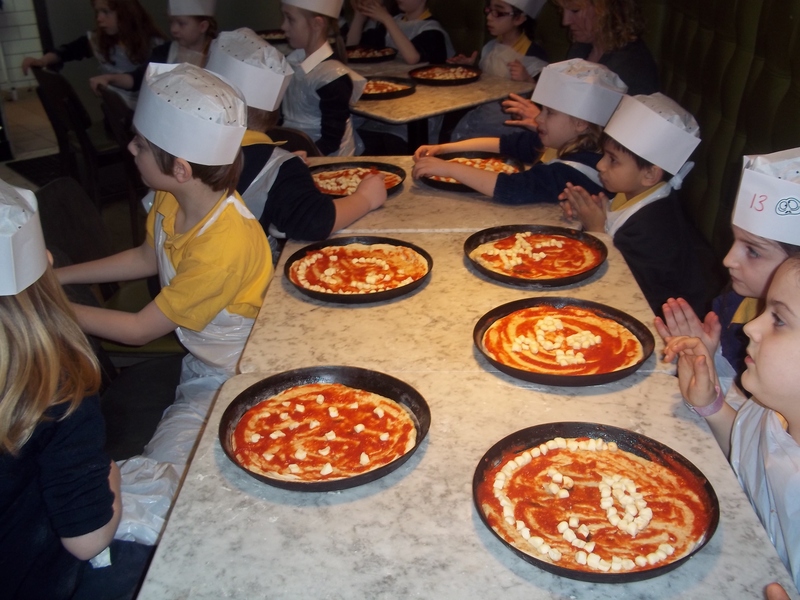 We took part in Food Technology week and went to visit a farm. It was great to see how our food is produced and we were able to collect eggs and then make them into sandwiches for lunch. Once our beds were made it was dinner time and we had a lovely steak pie and raspberry cheesecake, judging by the empty plates the children certainly enjoyed it. 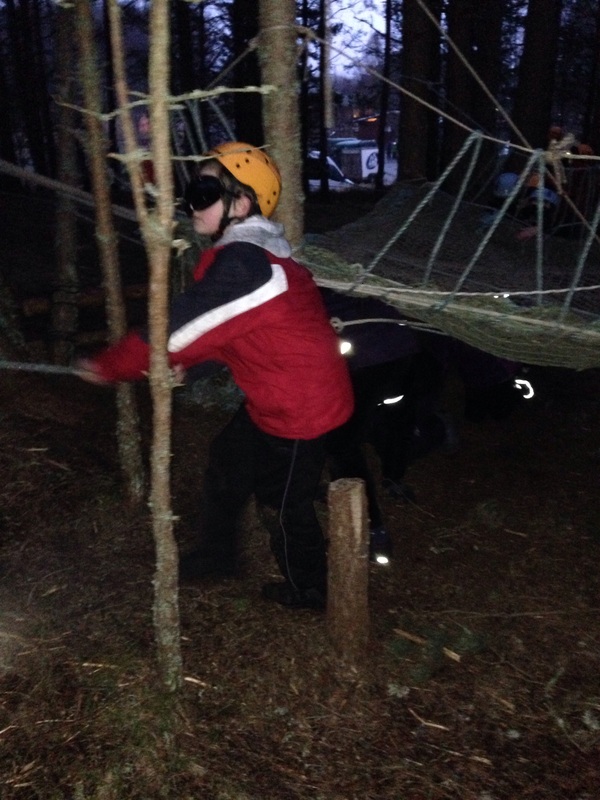 Following dinner we engaged in our first activity – the night walk. 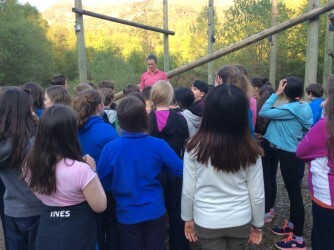 Primary 6 arrived at Lagganlia in high spirits and were immediately met by Nick who discussed expectations for the week. 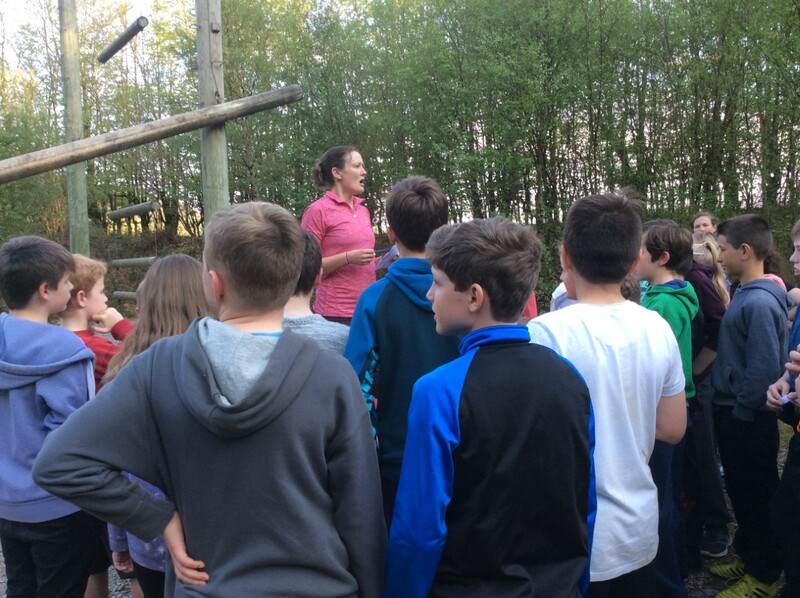 The children then met their activity instructors and explored the camp. 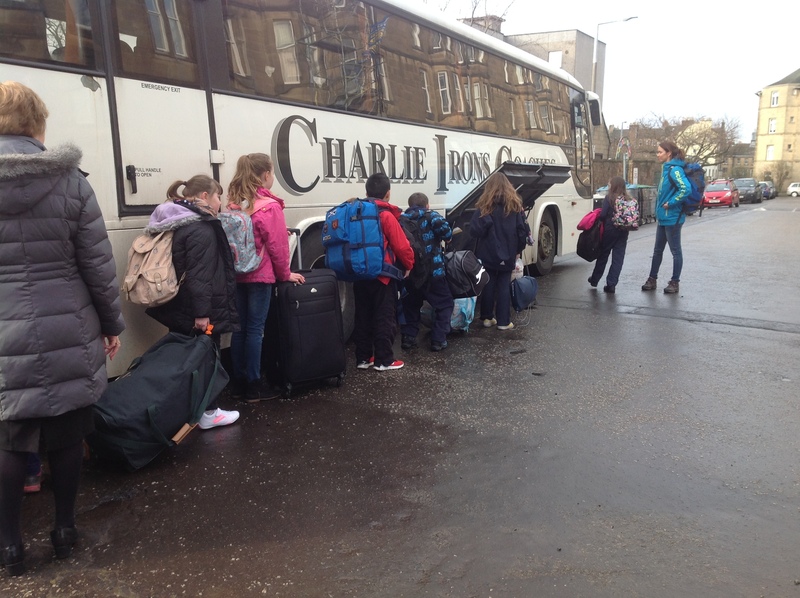 The bags are all safely packed into the coach and the children are all on. 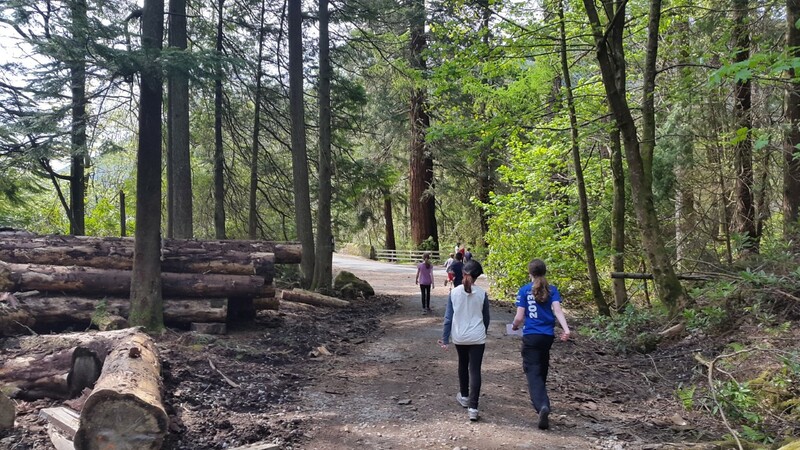 They are now on their way to Camp. There was much excitement this morning when they came in so not sure how quiet the journey will be as they are all talking about what is to come. There will be an update coming soon. 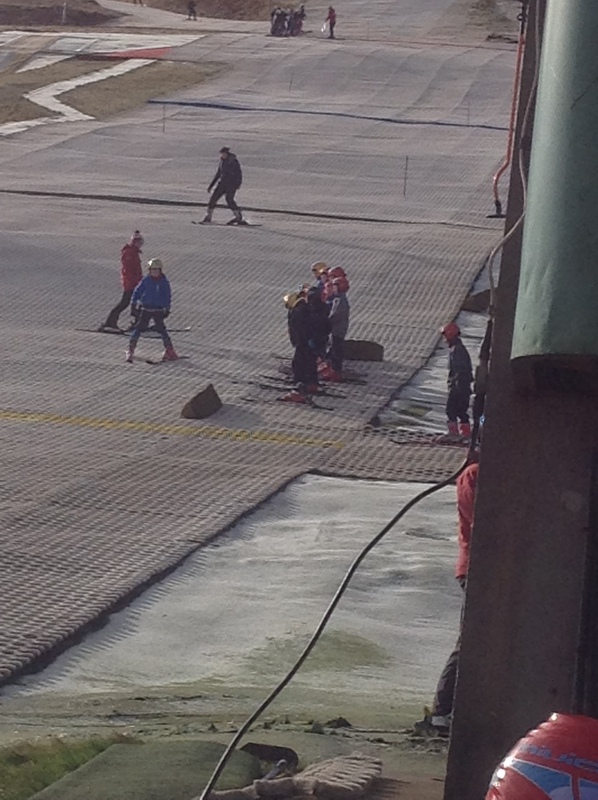 Primary 6 have just finished Skiing tuition at Midlothian Ski Centre. 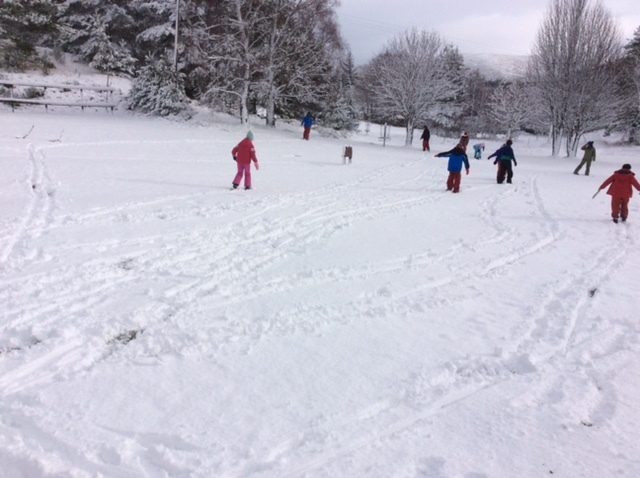 We were ‘lucky’ enough to experience snow on all three of our visits and the pupils had a great time. 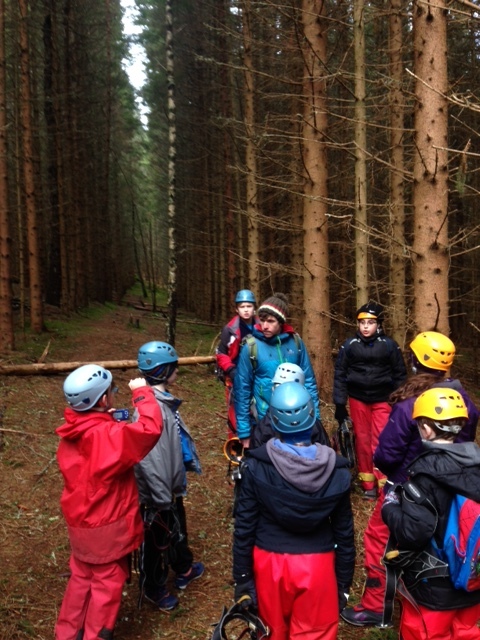 Eagerly listening to Skiing instructions. Getting up the slope is the hardest part! 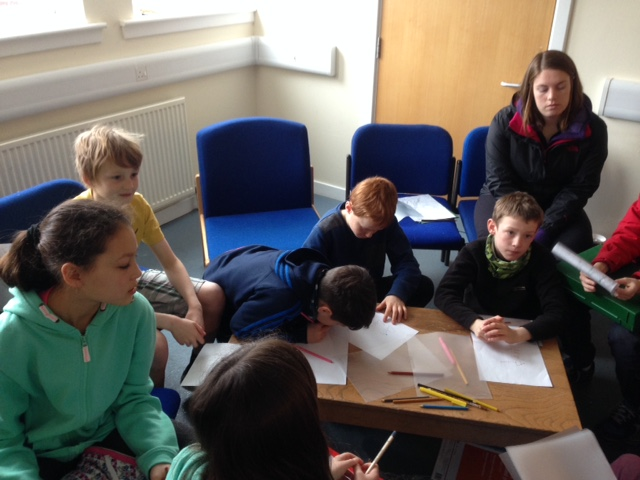 This term Primary 6 pupils have been learning about the European Union. Every pupil was given a member of the EU to research and presented this information to the rest of the class. 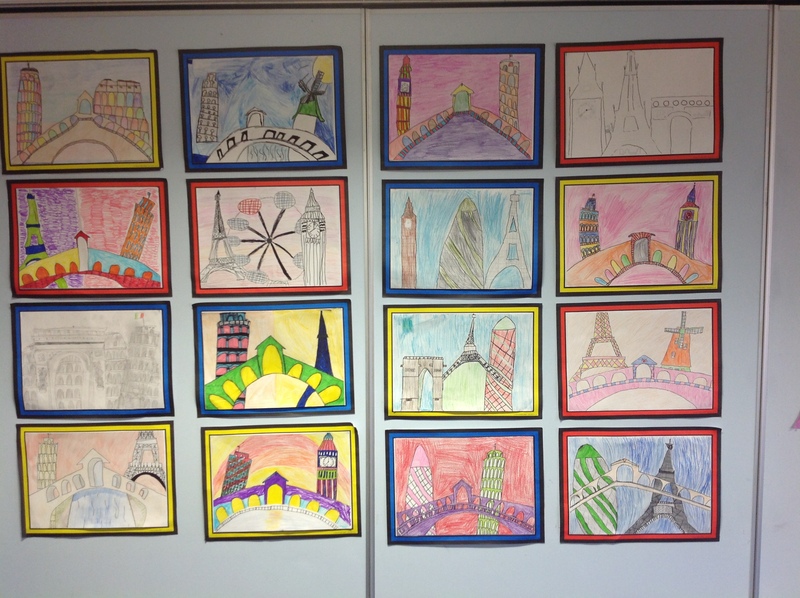 Pupils created some lovely European themed artwork. 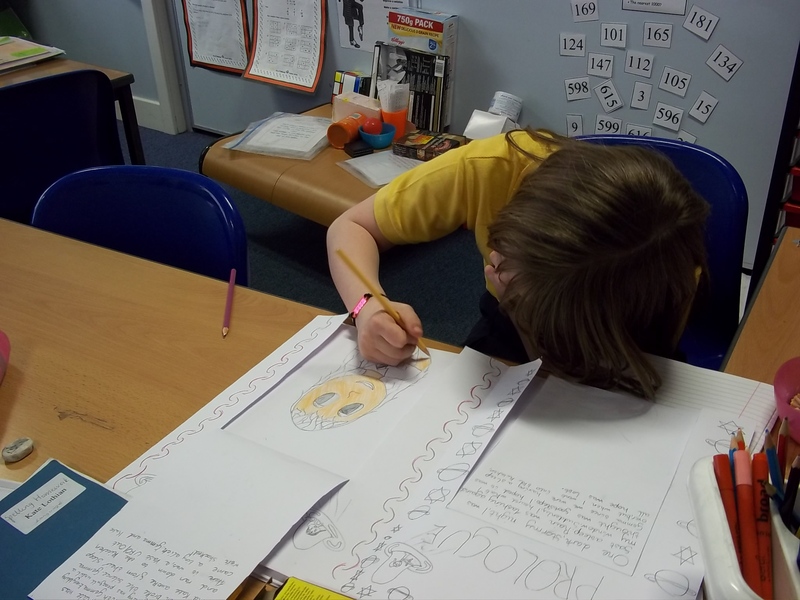 Primary 5 have been working very hard on writing their first novels! We have been able to share and discuss our ideas, plan and draft our ideas and then use these to write our novels. 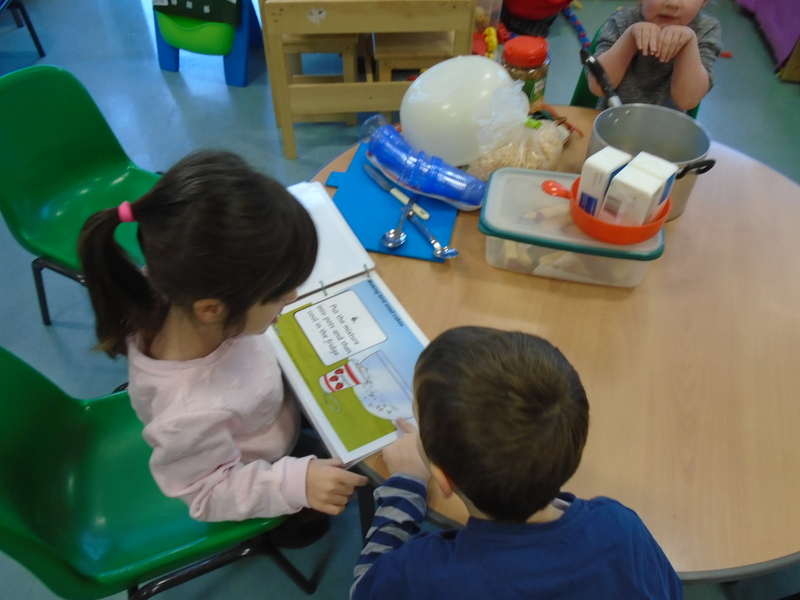 We have enjoyed reading and sharing our stories with other children in school. 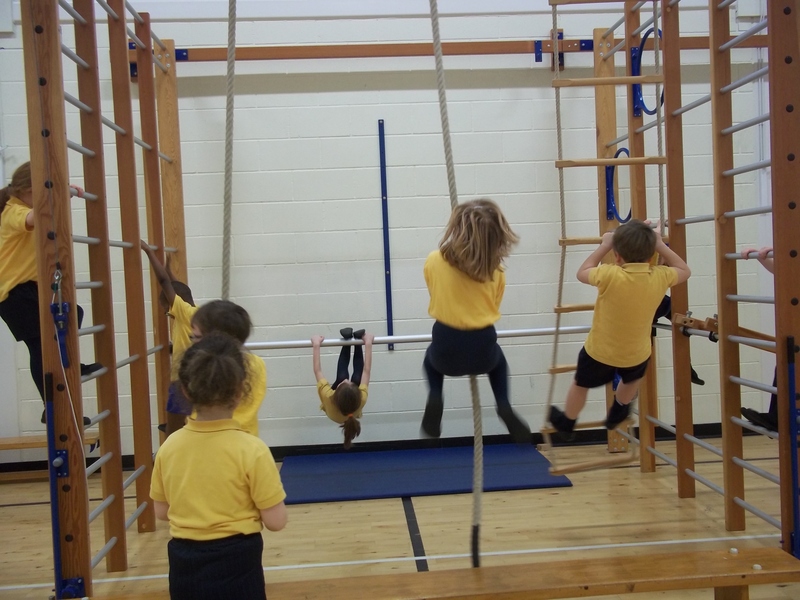 In PE, we have been practising and developing our gymnastics skills. 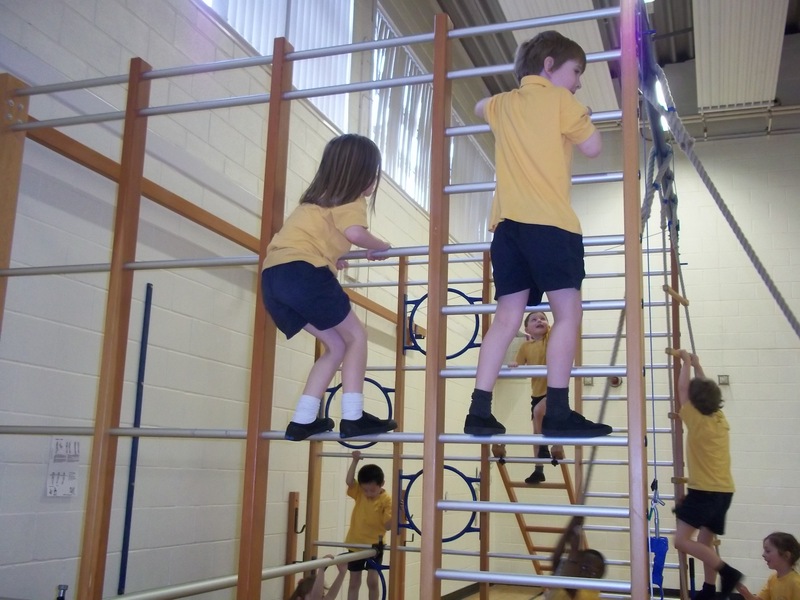 We have been using the climbing frame and practising our rolling, travelling, climbing and balancing. 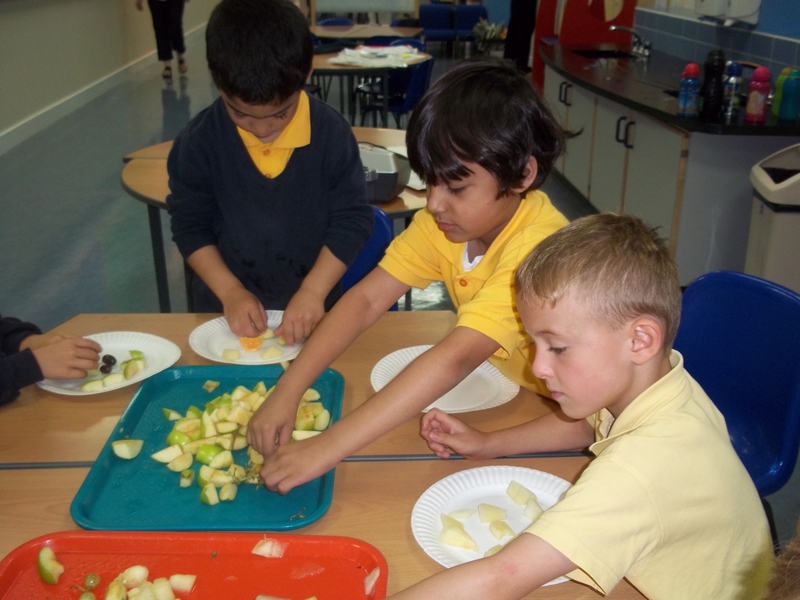 We have been learning how important it is to be hygienic when handling and preparing foods. As part of our Commonwealth Games celebrations, we have been comparing and preparing the foods of two Commonwealth countries. 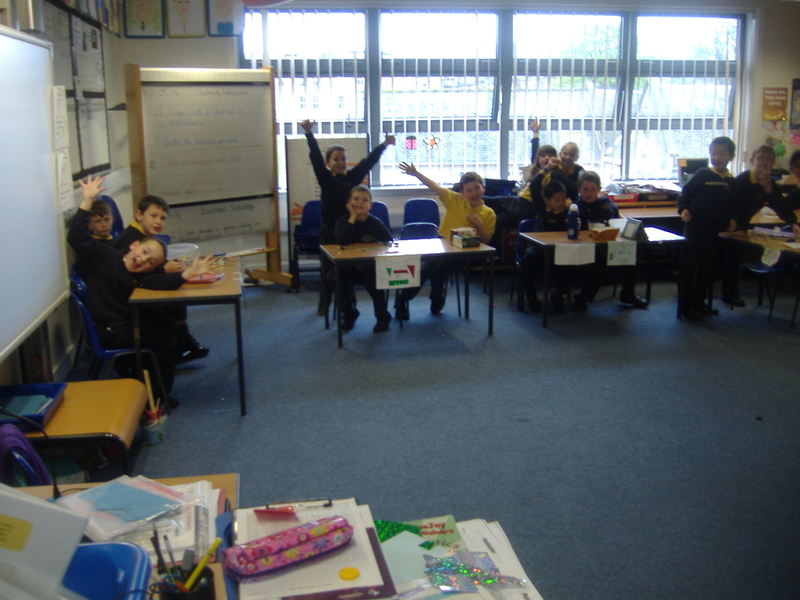 The Primary 5 countries have been Scotland and Canada. For each of these countries, we have looked at the source and sustainability of foods. 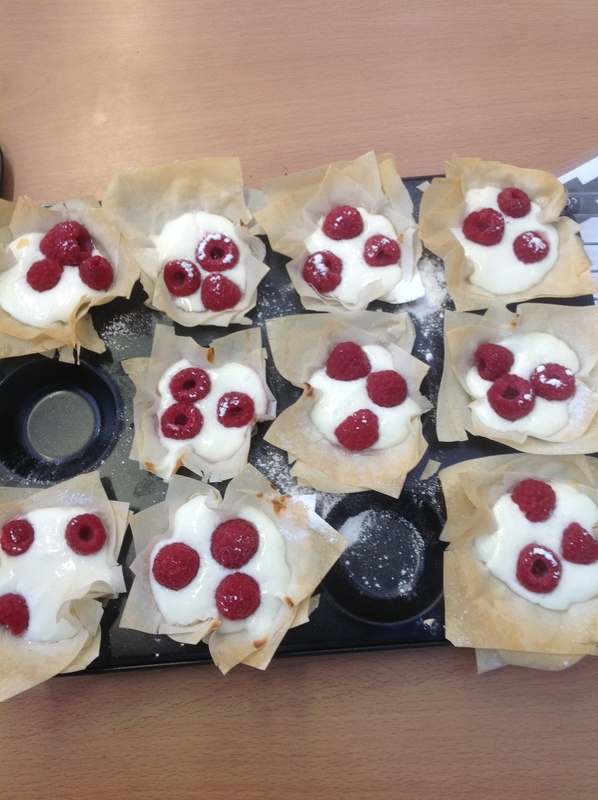 In Primary 5, we used the new cooking equipment to make and prepare cheese and pancakes. 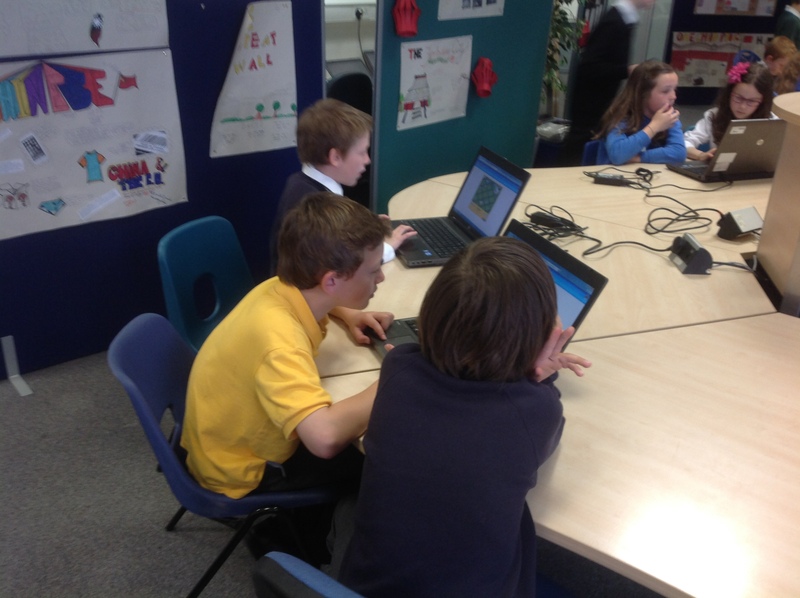 Primary 5 enjoyed World of Work Week. We learned about different careers we would like to try in the future. 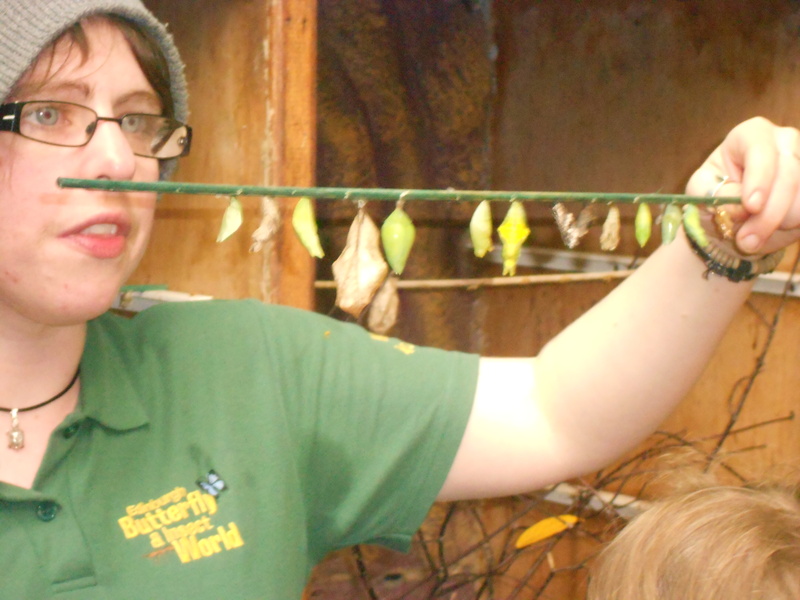 To learn about different careers, we took part in a number of activities both in and out of school. 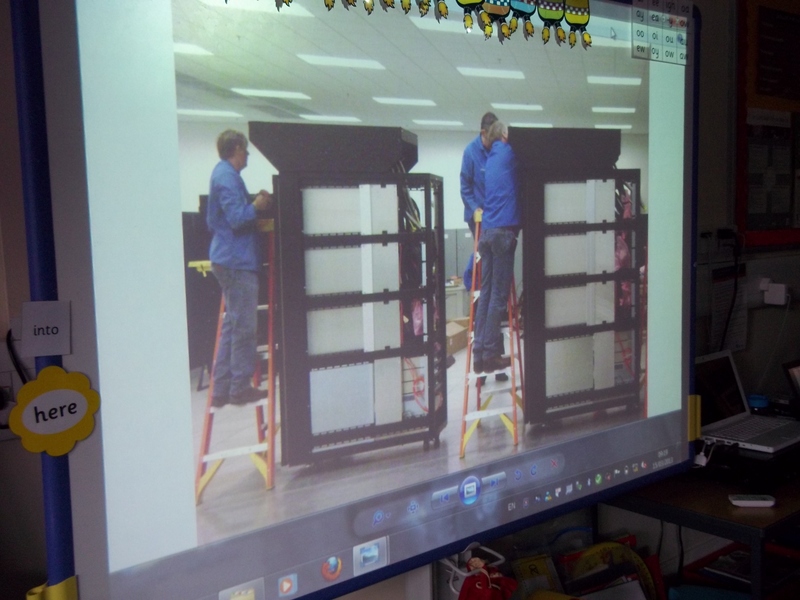 A number of parent helpers came into school to talk to us about their jobs. These jobs included a graphic designer, a doctor and a photographer. 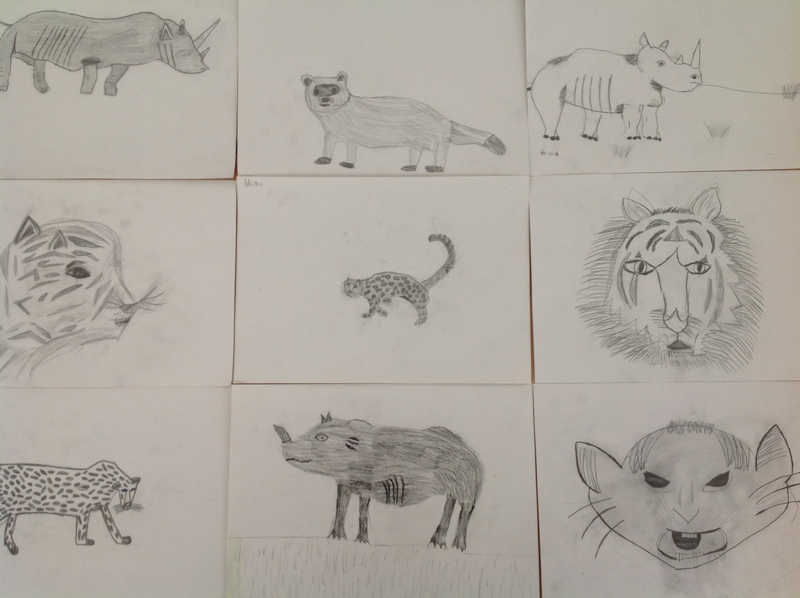 Primary 5 have been learning about Endangered Animals. 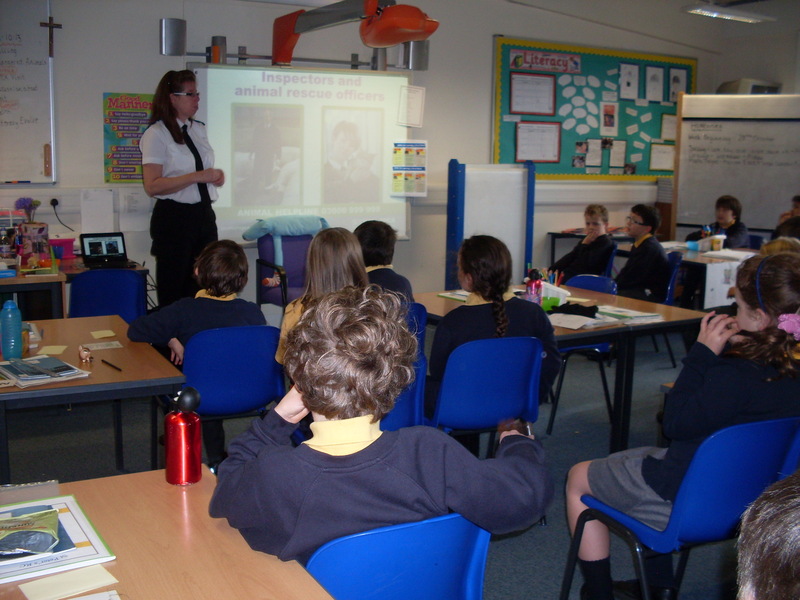 As part of this topic, an officer from the SSPCA came to speak to us about how we can be animal friendly citizens. 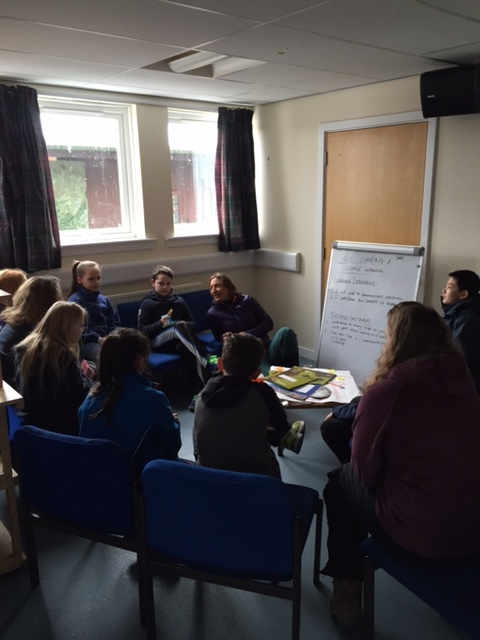 After looking at a presentation about the work of the SSPCA, we completed an activity where we had to make decisions about how an SSPCA officer prioritises their case load. 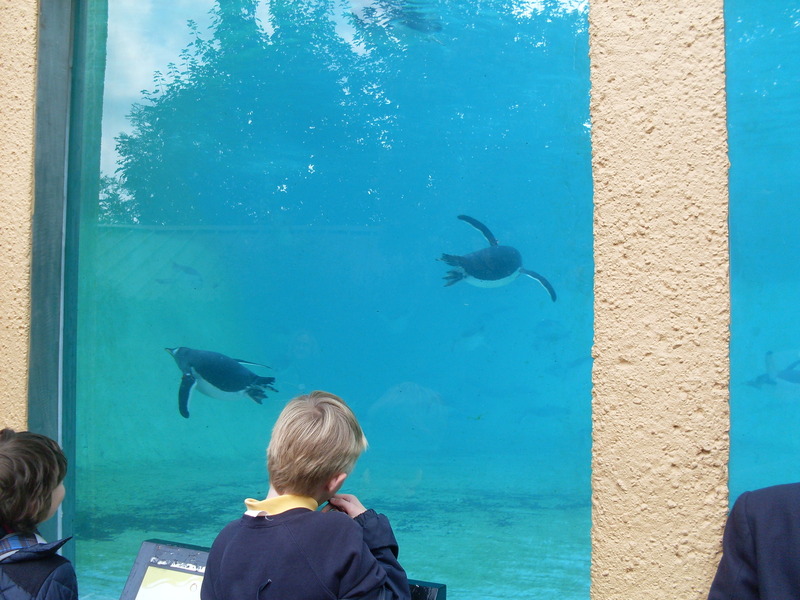 We also visited Edinburgh Zoo to gain more information about endangered species and the reasons for being endangered. 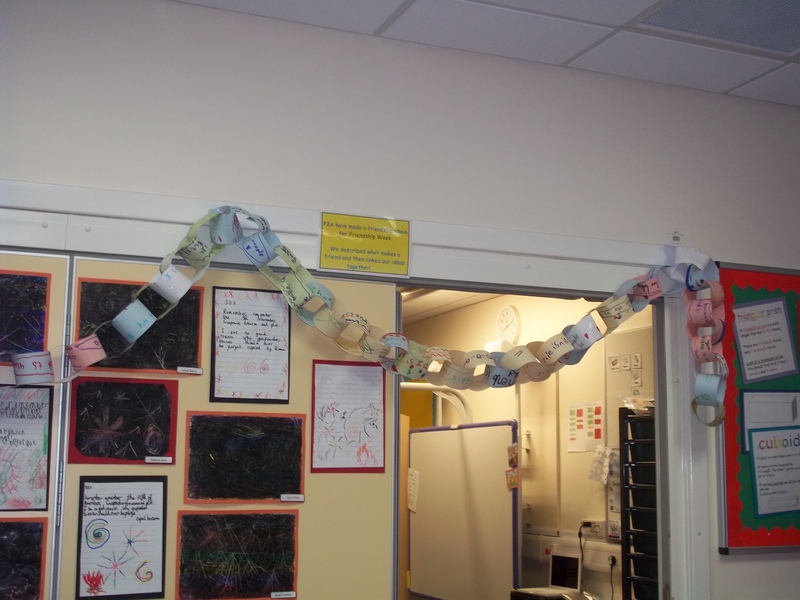 At the start of term each class chose a famous artist to study and reproduce their work in our own way. 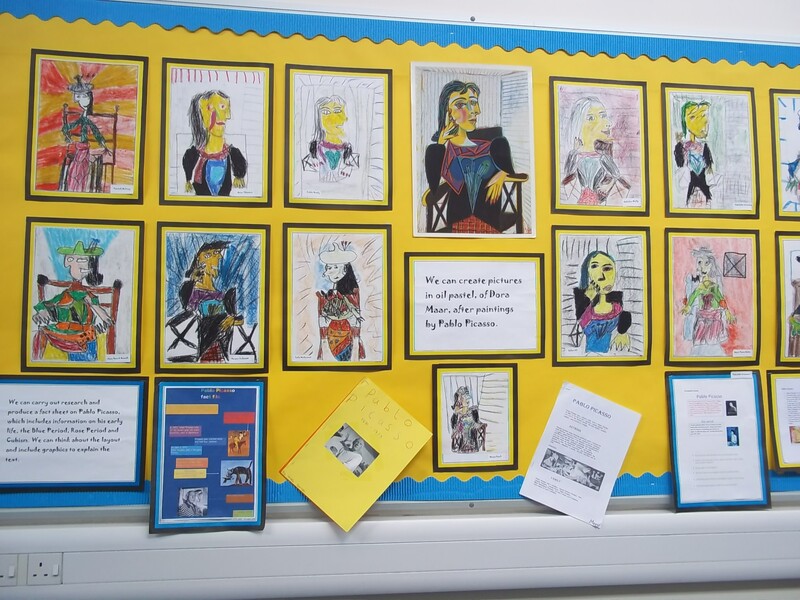 P5 chose Pablo Picasso. 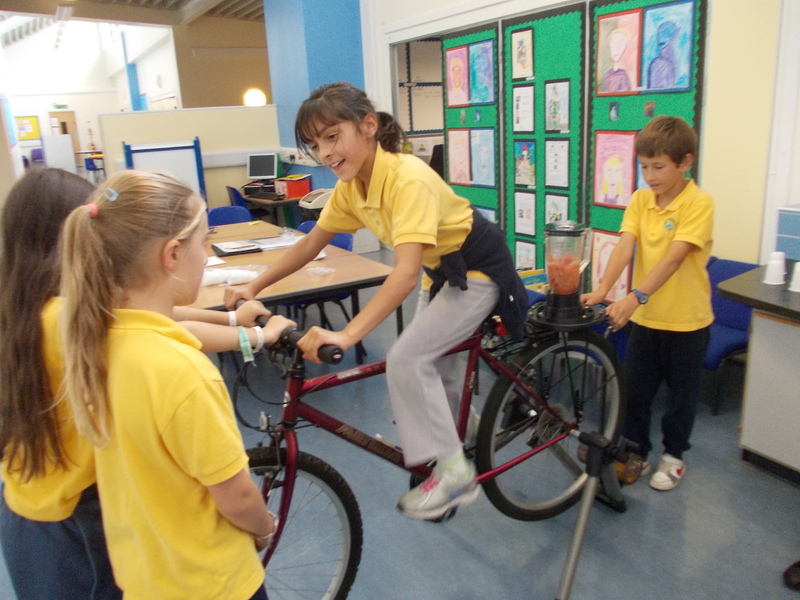 We were very busy during Health Week and we really enjoyed making our own fruit smoothies using ‘pedal power’. We each selected some fruit to go into the blander which was attached to a motor which was powered by our own hard work on the bike. The result: delicous smoothies and tired legs. We are doing an experiment this week to find the ideal conditiions for growing seeds. We will let you know our results when we have them. 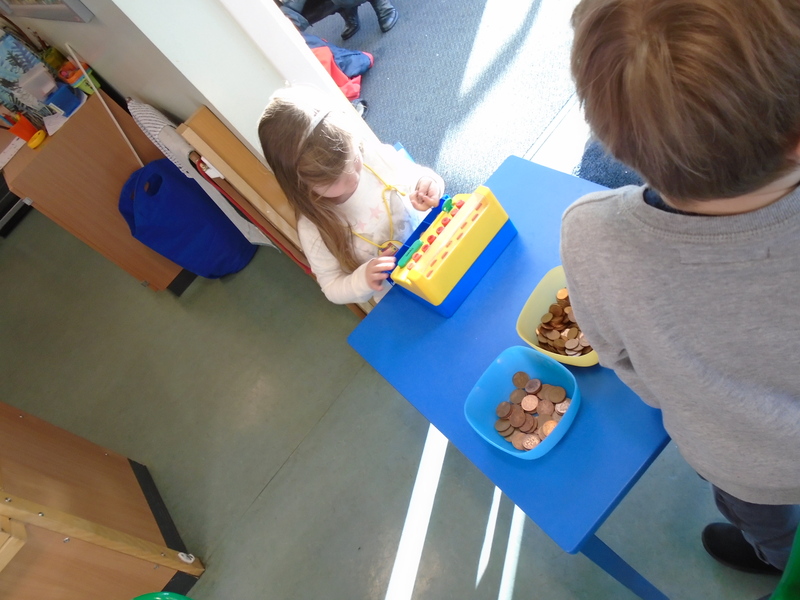 P4 Learned about ‘needs and wants during Financial Education Week. We also learned the importance of savings. and making a budget. 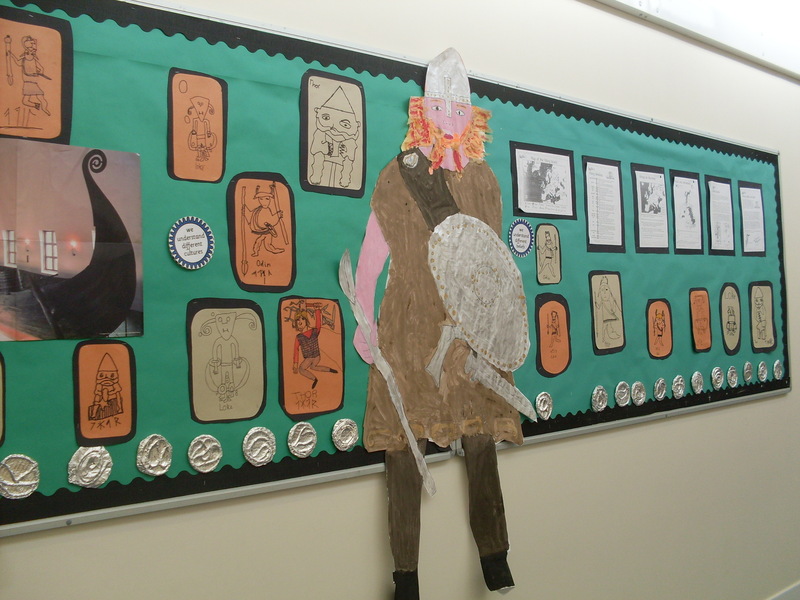 Primary 4 have been studying Vikings this term and have been doing many different activities. 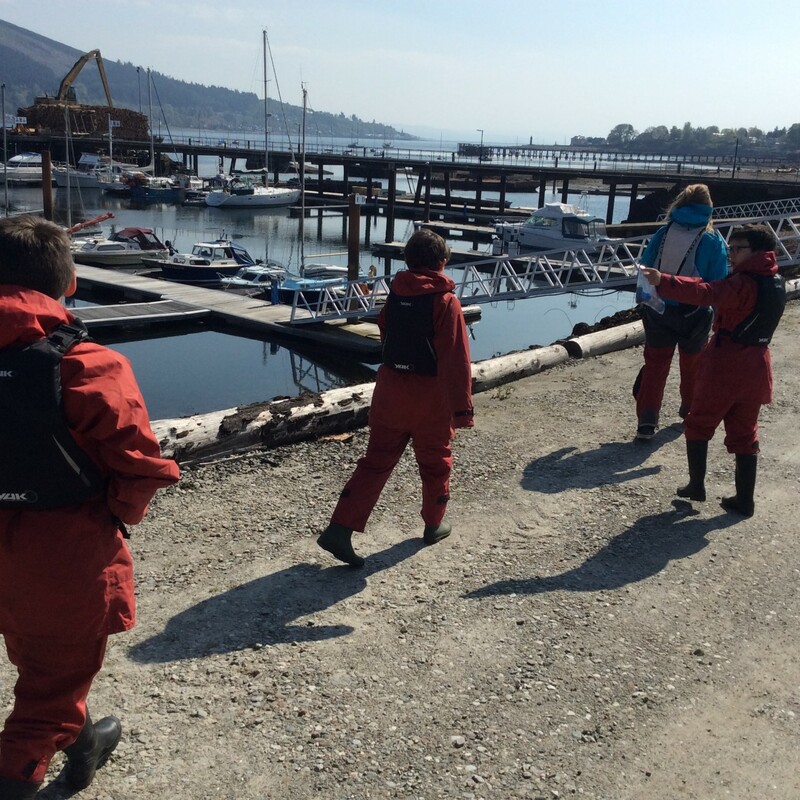 They have visited Vikingar in Largs where they found out many interesting things about Vikings. Yesterday they went to The Filmhouse in Lothian Road to watch a film about Vikings. 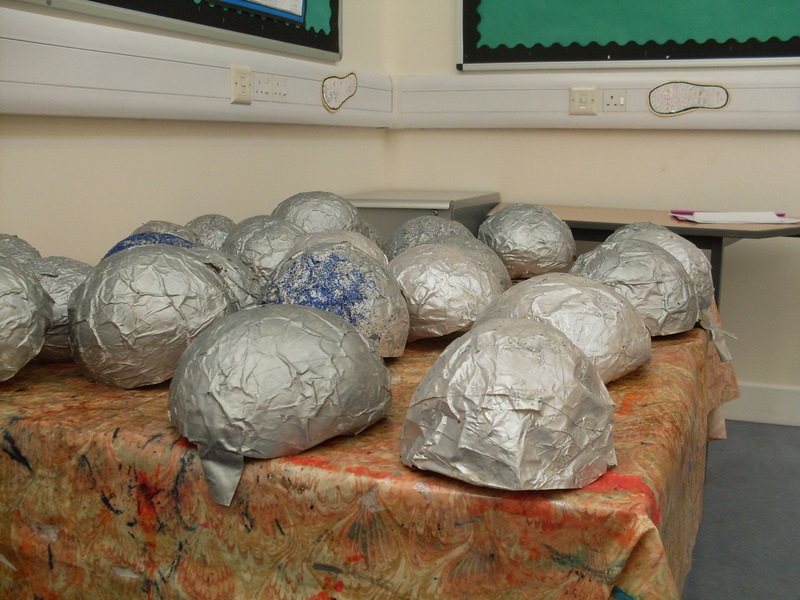 In class they have been weaving, making Viking Faces, making bread and have even made their own Viking Helmets. 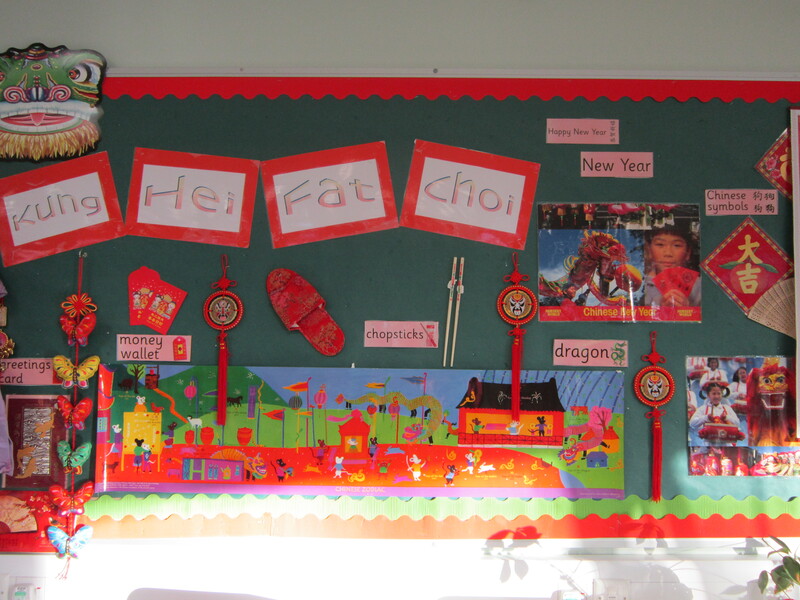 A warm welcome back to a new term in primary 4 ! We hope you all had a lovely – fun summer holiday ! We will kick off the new term with health week, which starts the week beginning 27th of August ! Every morning we will have a whole school aerobic workout in the playground, to which all are welcome !! 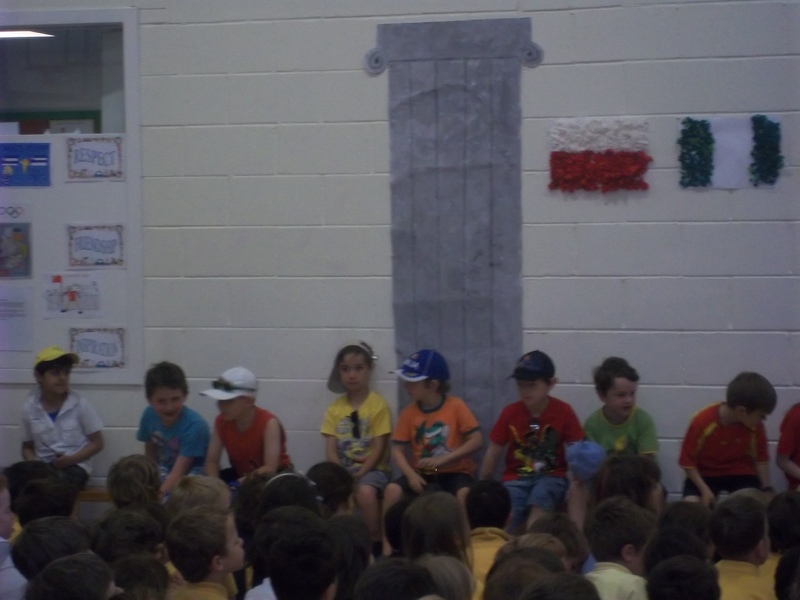 This year our sports day took on an Olympic flavour and our sports were held over 2 days. 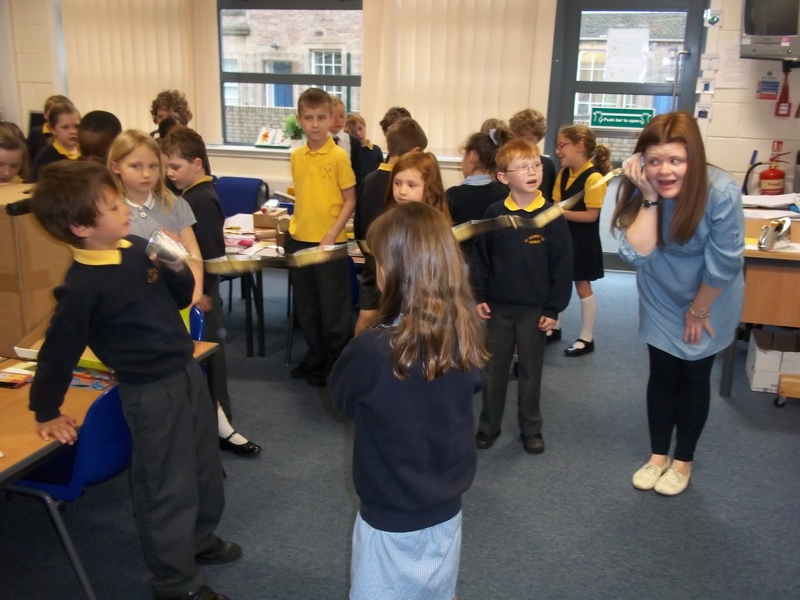 We were all put into different countries and took part in an opening ceremony , we even had torches. As usual everyone got behind there houses and competition was close. Congratulations to Grampian who won this years trophy. 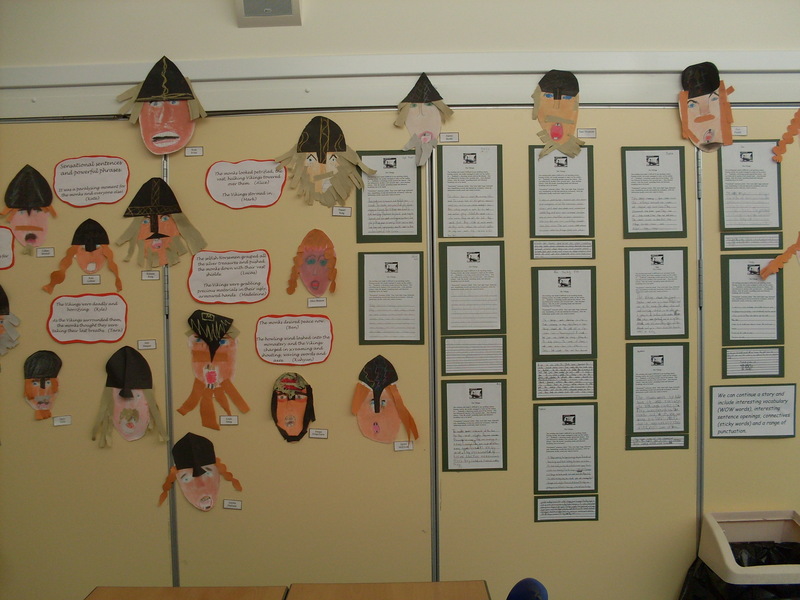 Primary 4 have been busy finding out about Vikings. 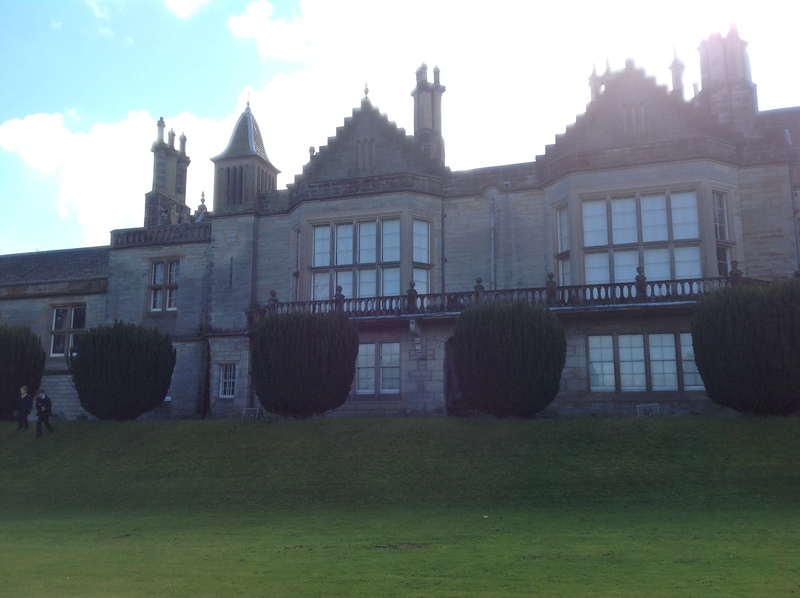 On Thursday we went to Largs to visit Vikingaar. There we were introduced to Eric who told us about the myths, legends and people. 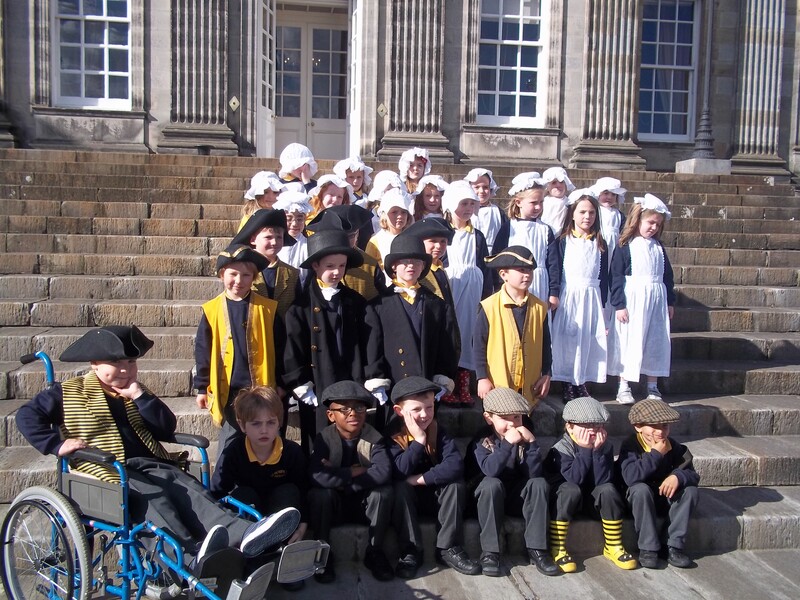 Some of the children dressed in costumes and acted out scenes. 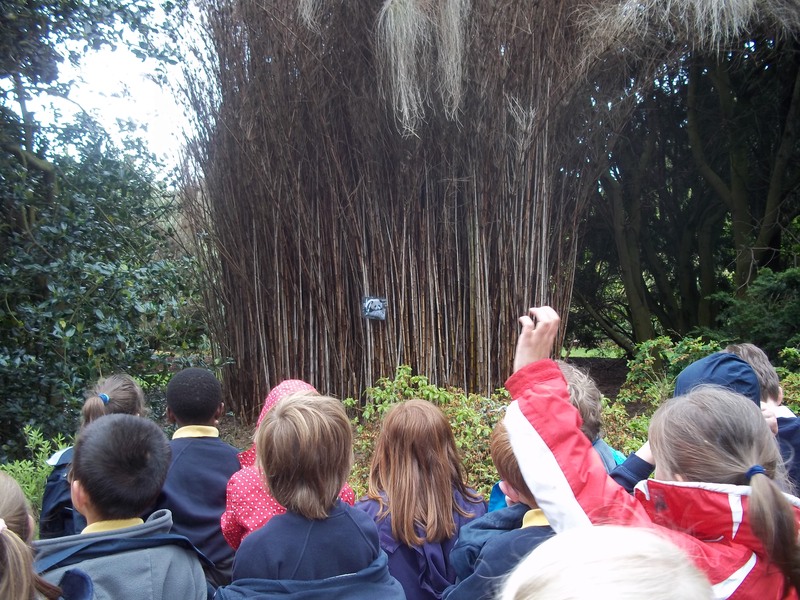 We were then shown round a Viking Longhouse and found out about the day to day life of a viking and their gods. 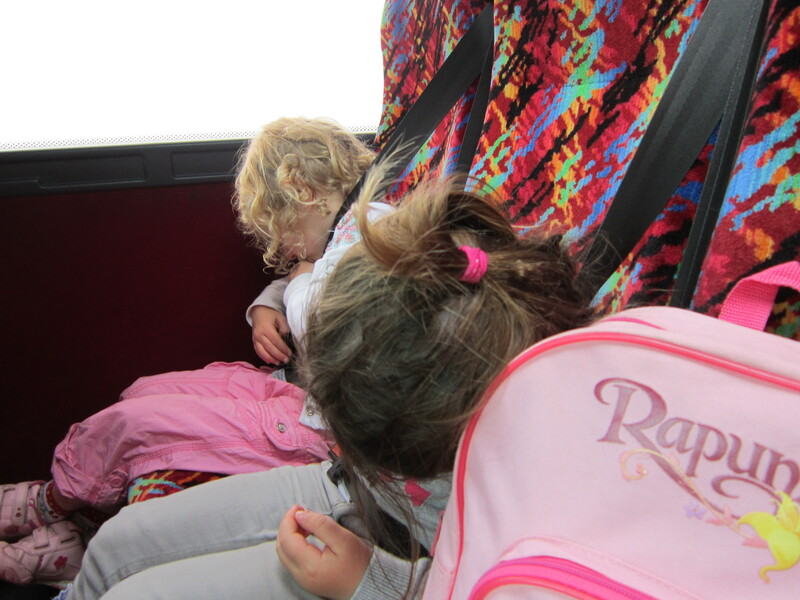 It was a long trip but everyone enjoyed it. 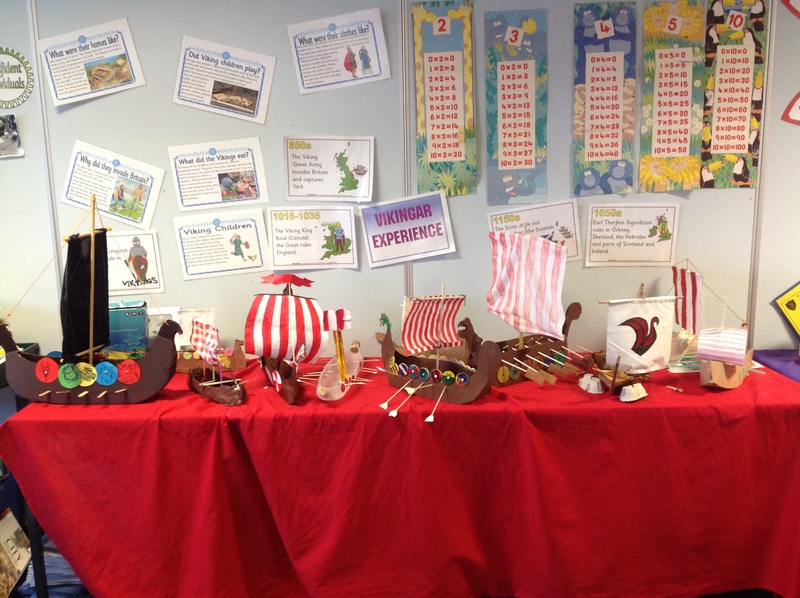 As you can see from the photograph we have been busy creating our own Viking Longship crewed by fearsome worriers and maidens. 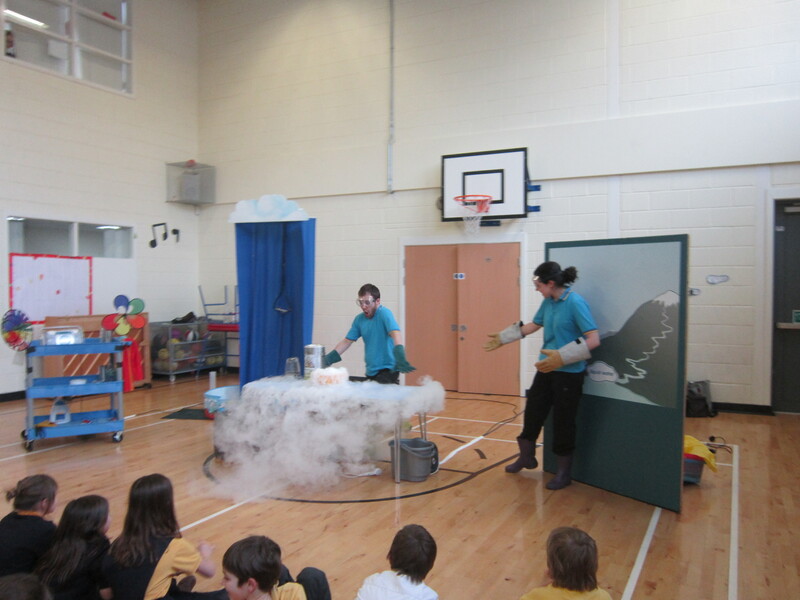 Today p4 enjoyed a visit from Generation Science. They learned all about The Water Cycle. 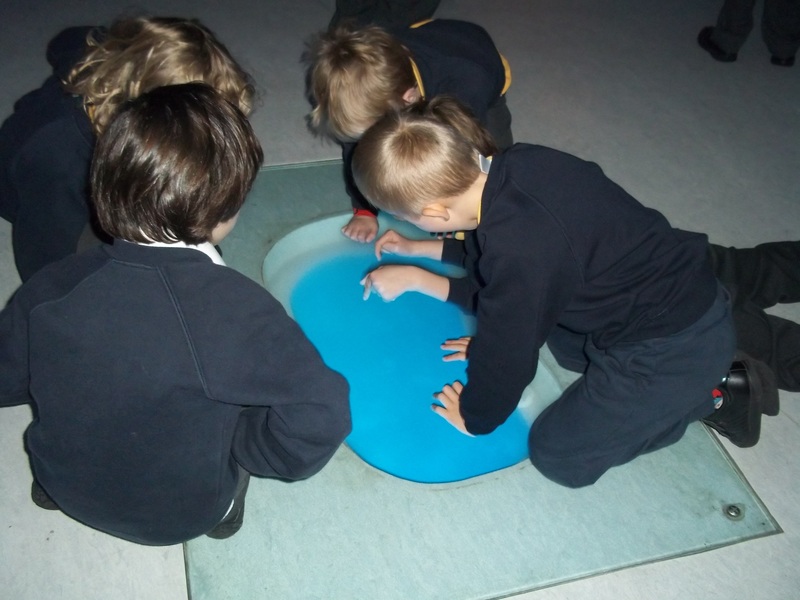 The lesson was brought to life when they found out about condensation, evaporation, freezing and melting. They even managed to make there own cloud. 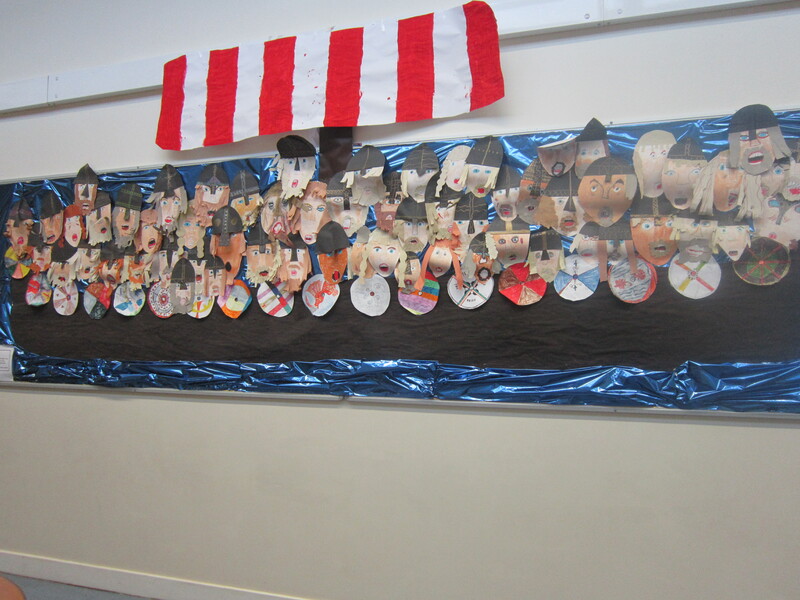 Primary 4A have been busy preparing for their Viking Assembly on 10th February. 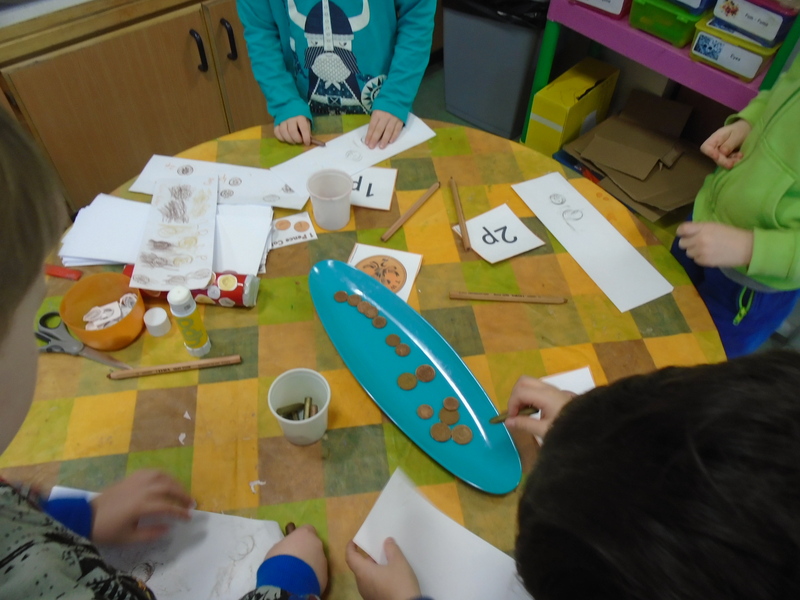 They have been making Viking helmets and brooches and practising their scripts with enthusiasm. We look forward to welcoming friends and family at 11am on Friday, 10th February. 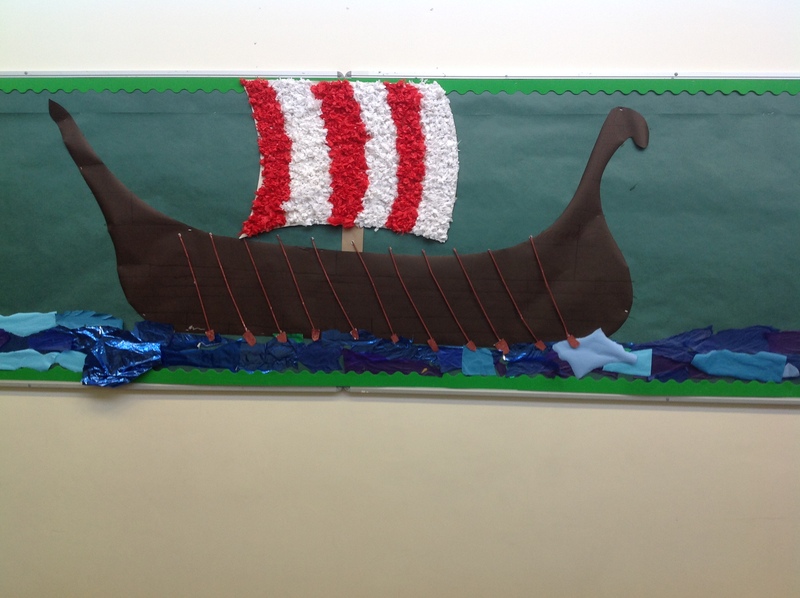 This term P4 will be studying Vikings. We will be using all areas of the curriculum to explore this topic. 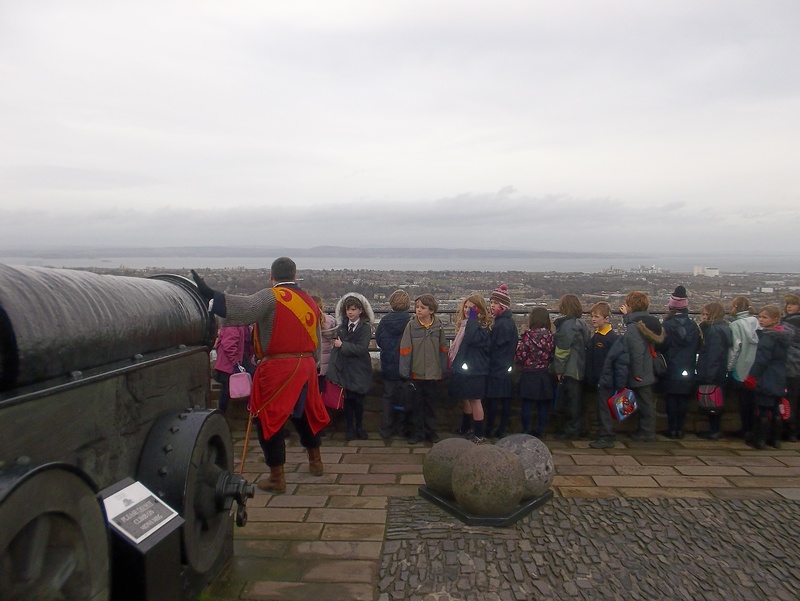 Primary 4a recently went on a trip to Edinburgh Castle. 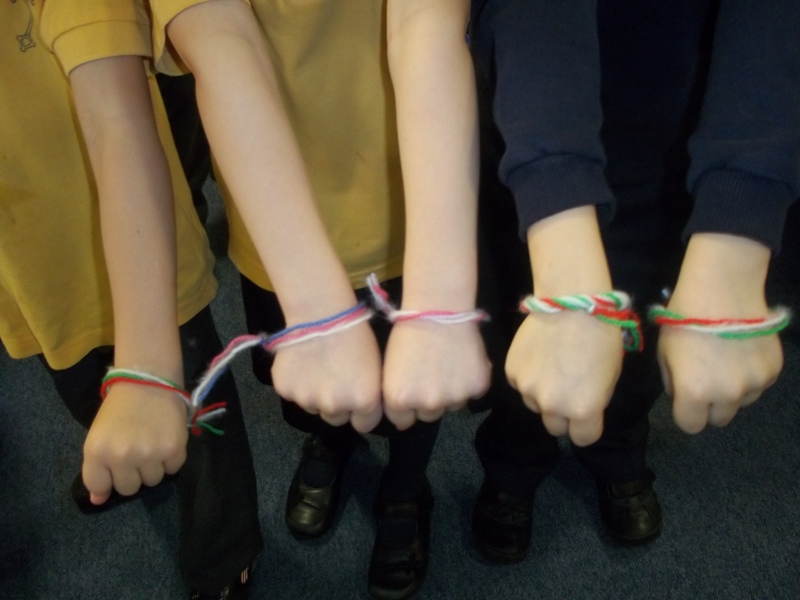 This linked with their topic of ‘Scotland.’ The class learned about different coats of arms and daily life in the castle. 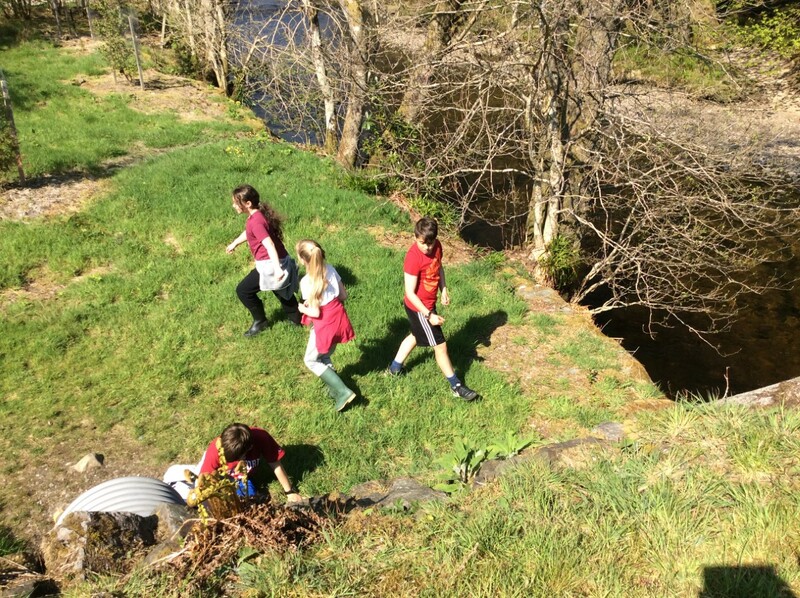 In this picture, the children are learning about how the castle was invaded by soldiers who swam through the loch and climbed up the castle wall. 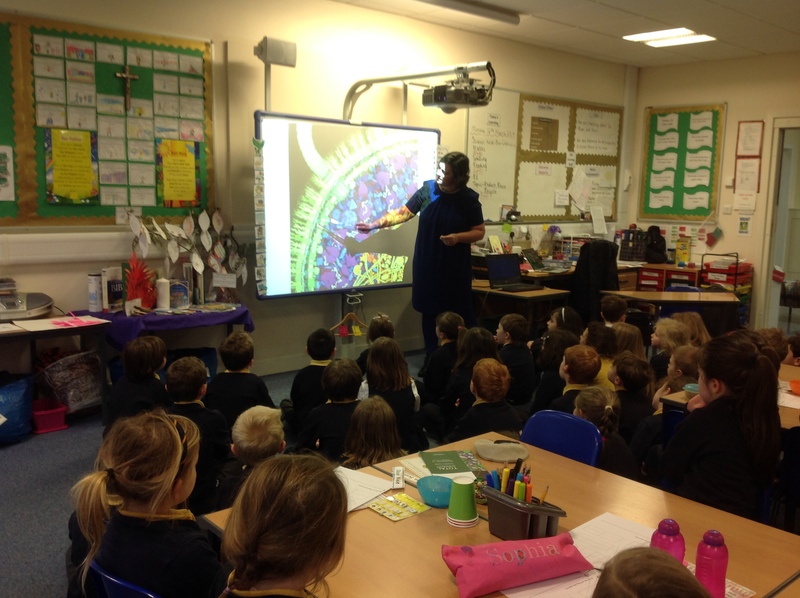 P4 all enjoyed a visit from the storyteller Ruth Kilpatrick. 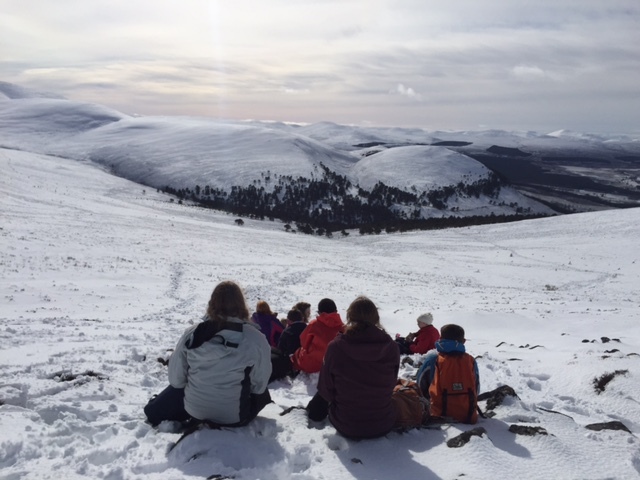 We started of the session by singing a traditional scottish song “Rattling Bog’ then we settled down to listen to her bring the tradional stories of Betsy White to life. Everyone had a really good time. 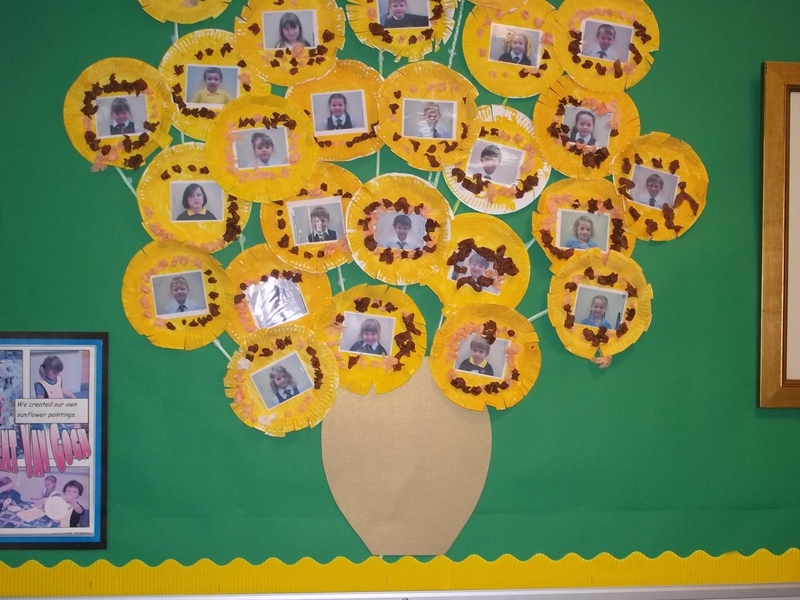 Miss McGrouther, Miss Carroll ,Mrs Moffat and the children in P4 have been settling in to a new school year. 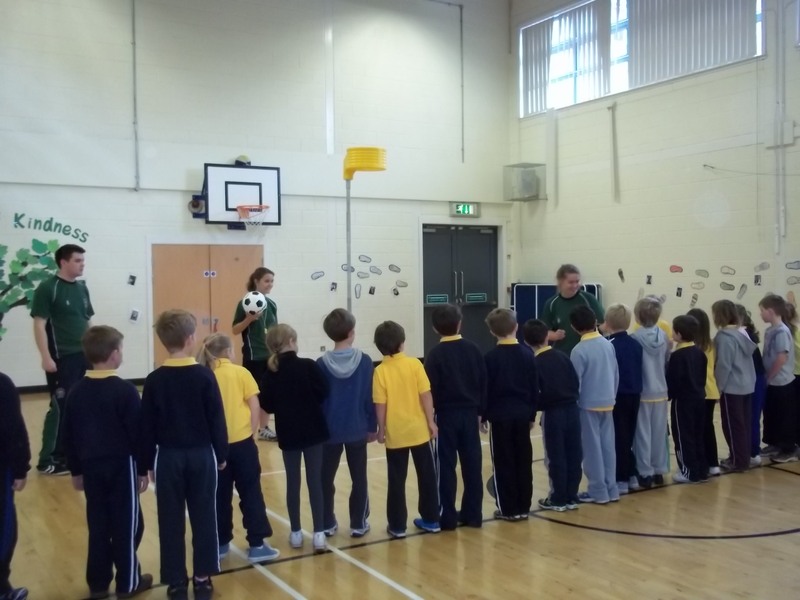 As part of Health Week P4b took part in Korfball. A new sport to most of us. On Monday, 6th March, two Roman soldiers came to our school. Since we are studying the Romans, we wanted to learn more. 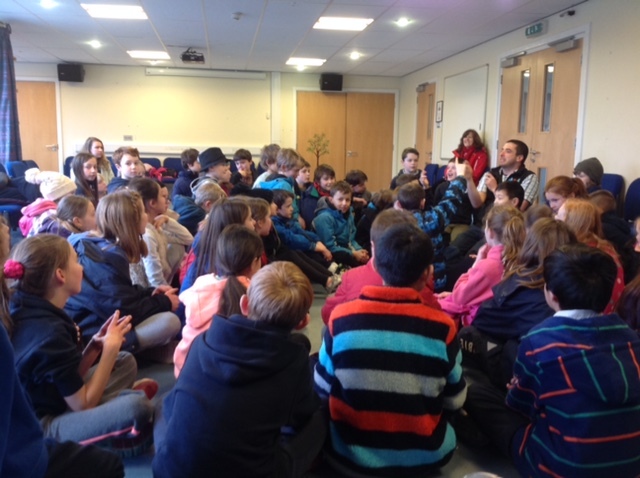 In the morning we met Ocrassius, who is a retired Centurion. 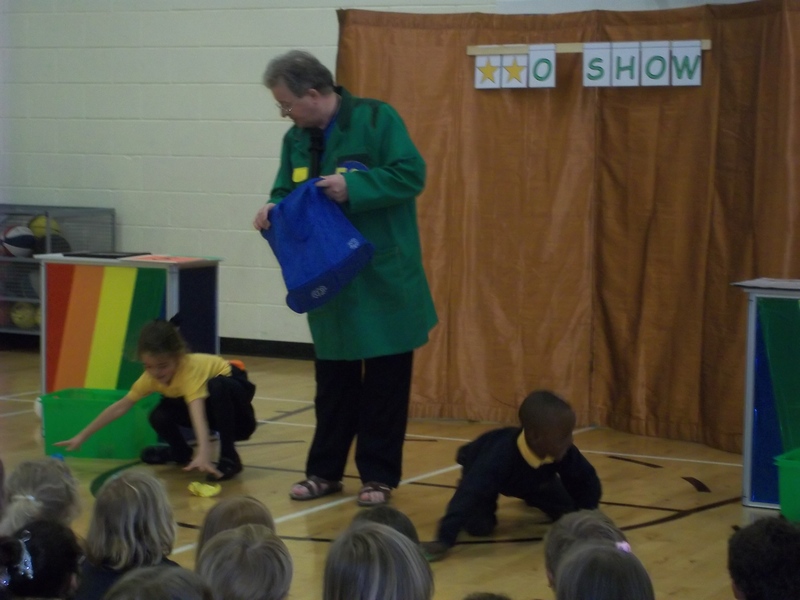 He told us about washing clothes. First you dip your dirty clothes in wee, then in fresh water, then shake and twist, dip in warm water, then leave to dry. The next thing he told us was that they didn’t have fridges. Instead, they put food in pots and put them in wet sand. Last of all, he told us that the bottom of their house was painted red so that the white didn’t get dirty. My favourite fact was how much money they received while being in the army for 20 years – £1.8 million! But that wasn’t enough to build a villa! In the afternoon we met Tiberius. 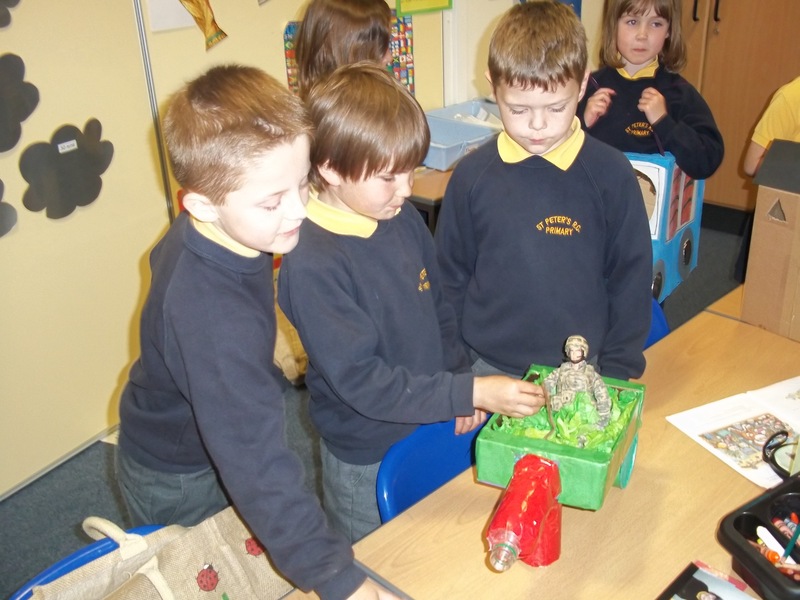 The Roman soldier wore a brown scrubby belt and a big shiny helmet and some shiny armour. He told us what the Roman army needs to carry and how to wake up a Roman soldier. Then we had a fight in the gym hall. It was boys vs. girls and the girls won. He got a round marble that Roman children played with. He showed us a Celtic house which had only one room and there was a leather bed and instead of a floor there was soil and hard ground. 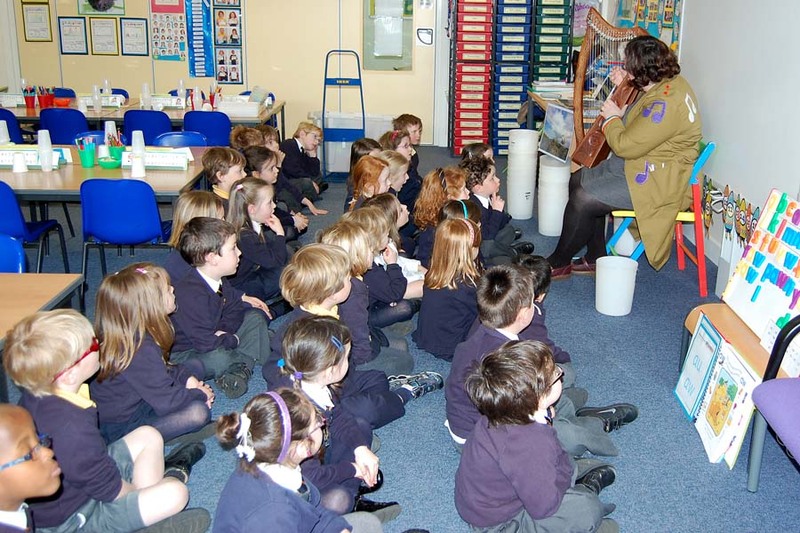 Over the past term Primary Three pupils have been learning to play the ukulele. 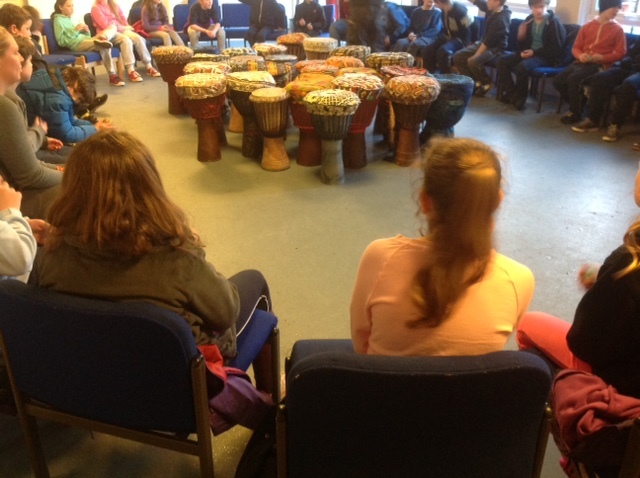 They have all shown great enthusiasm and were extremely excited on Friday as they demonstrated their new skills during a short concert for parents. 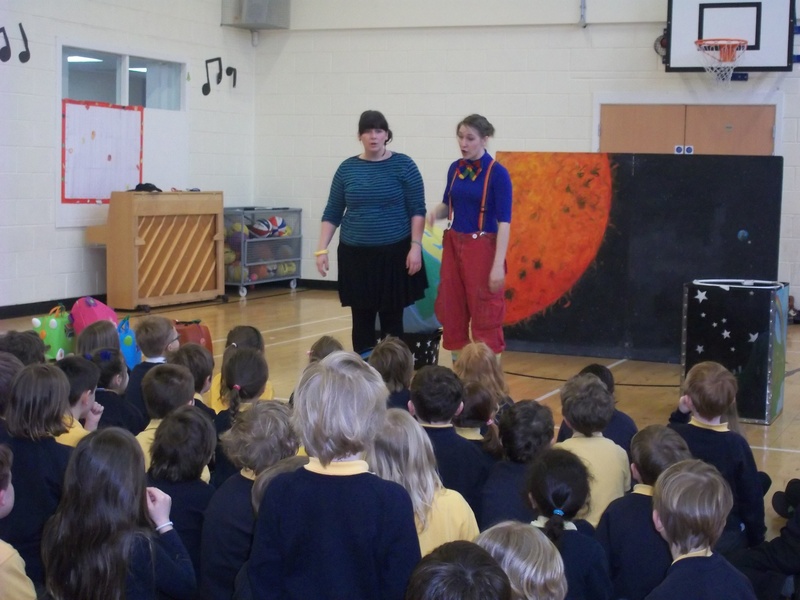 The performance included tunes and songs from the Charanga Music programme and finished with Jingle Bells. 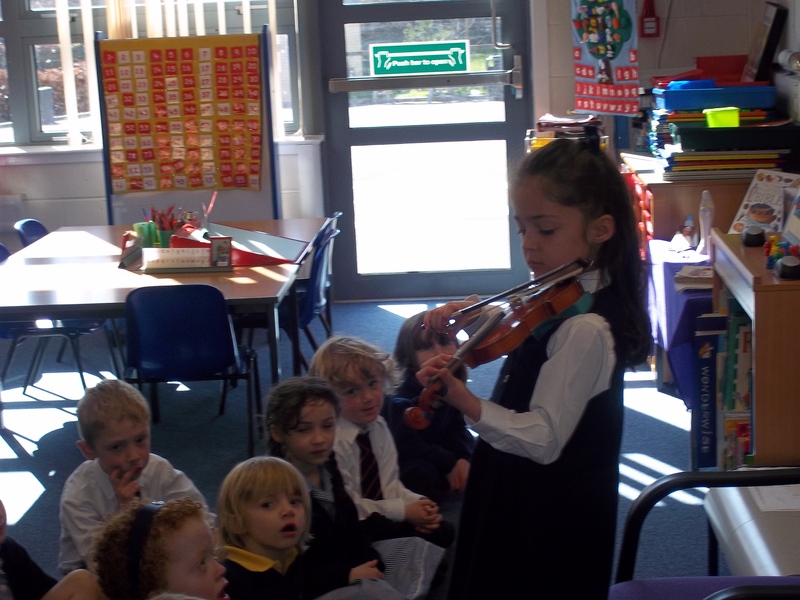 All the children performed amazingly well considering the short time that they have been learning to play. Thank you to all parents and staff who attended the concert. 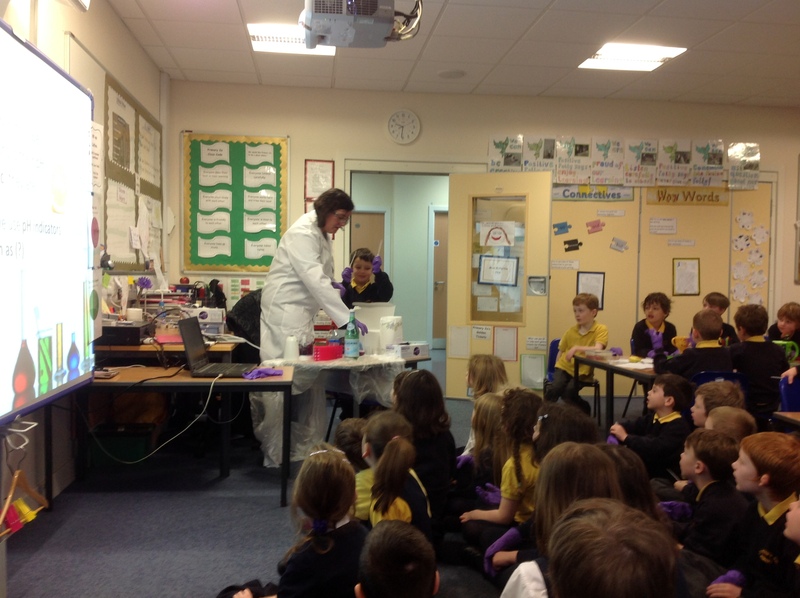 Primary 2 began Science Week with a visit from Mrs Ponte to teach us about her work as a Bio Chemist. She taught us about mixing different liquids and how cells appear differently under a microscope. We enjoyed looking at the different microscope pictures and taking part in the experiment. 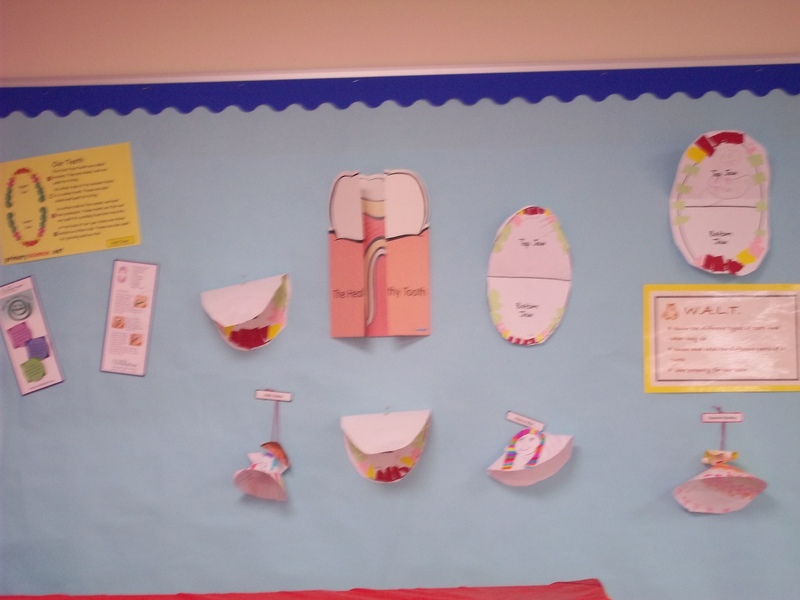 Primary 2 have been learning about the topic of Teeth and Healthy Eating. We have been learning the names of different types of teeth and what we can do to keep them healthy. 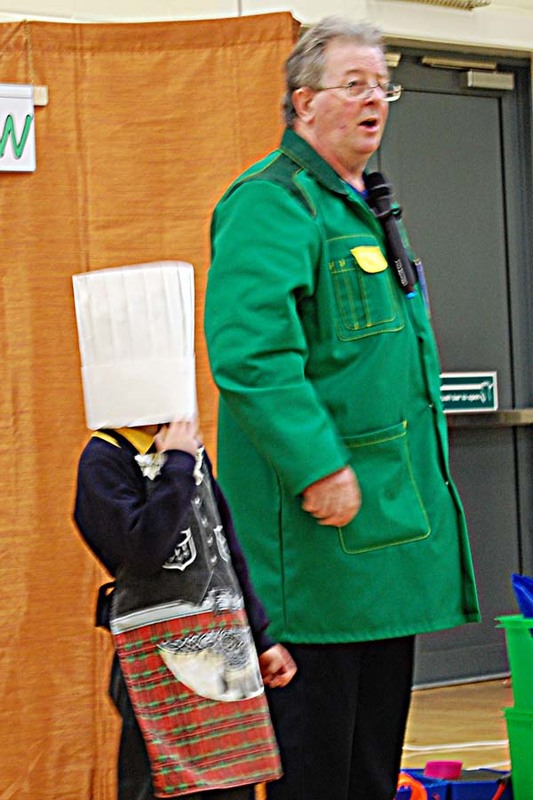 Primary 2a performed their school assembly describing what they had learned about the topic. 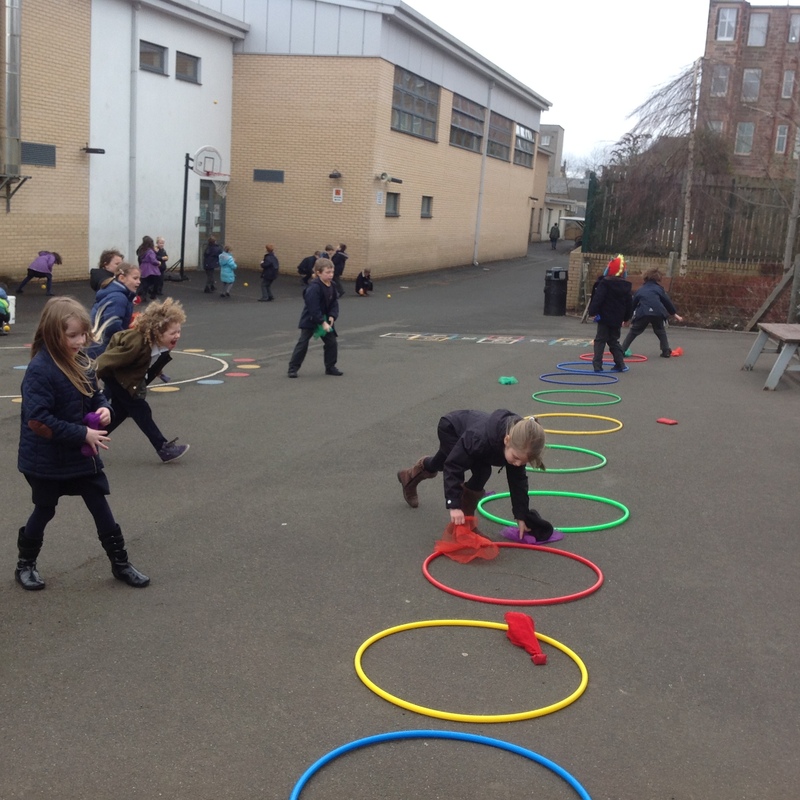 Primary 2 have enjoyed taking part in different sports to keep us fit and healthy. 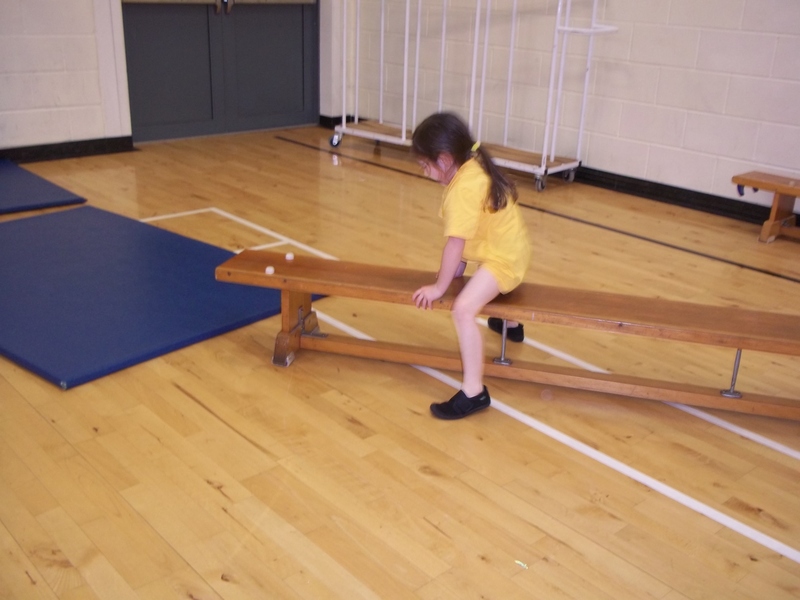 We have been learning to roll and balance in Gymnastics. 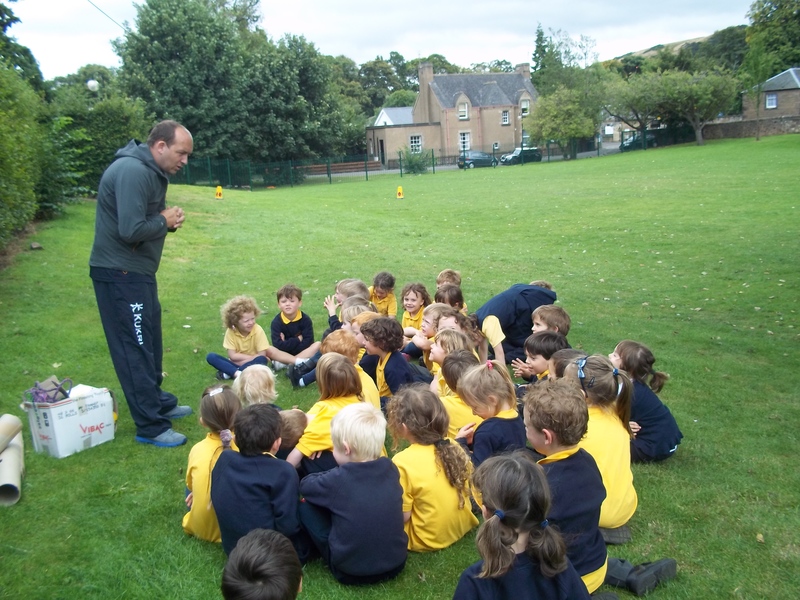 We have also enjoyed taking part in different sporting activities outside in the playground. 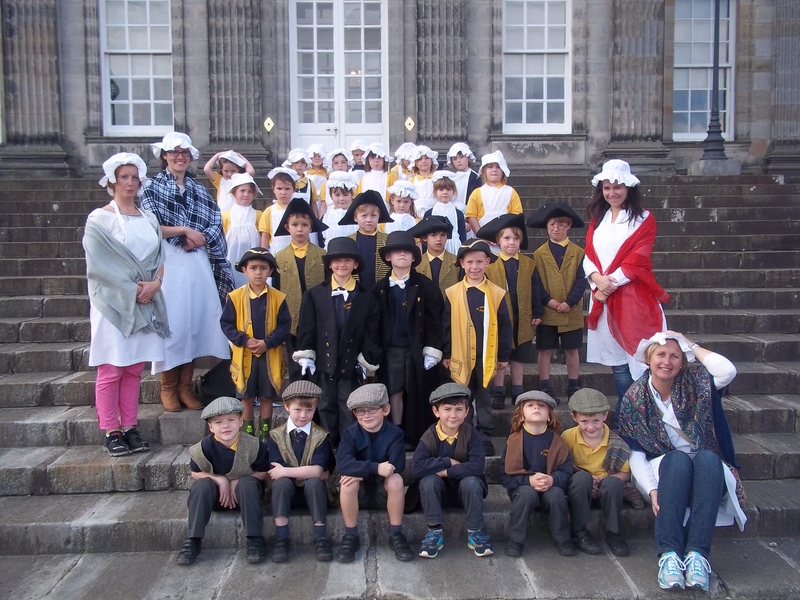 Primary 2 visited Hopetoun House to learn more about our topic of Houses and Homes. 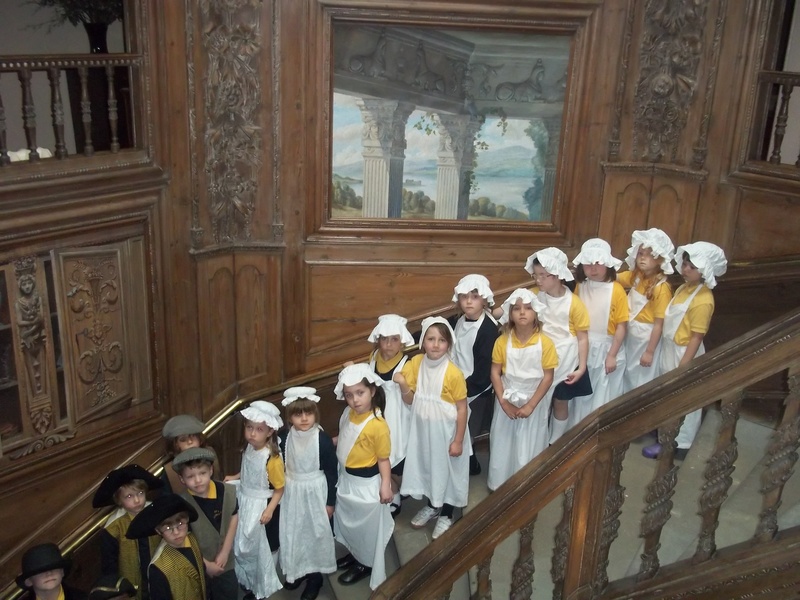 We learned what it would have been like to live in a Victorian House. 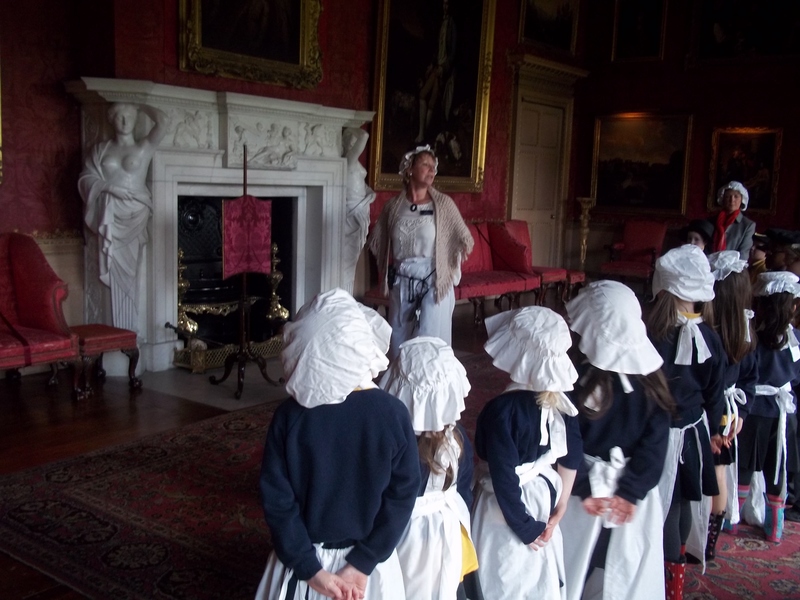 We dressed up as maids and servants and had to carry out some Victorian servant tasks. 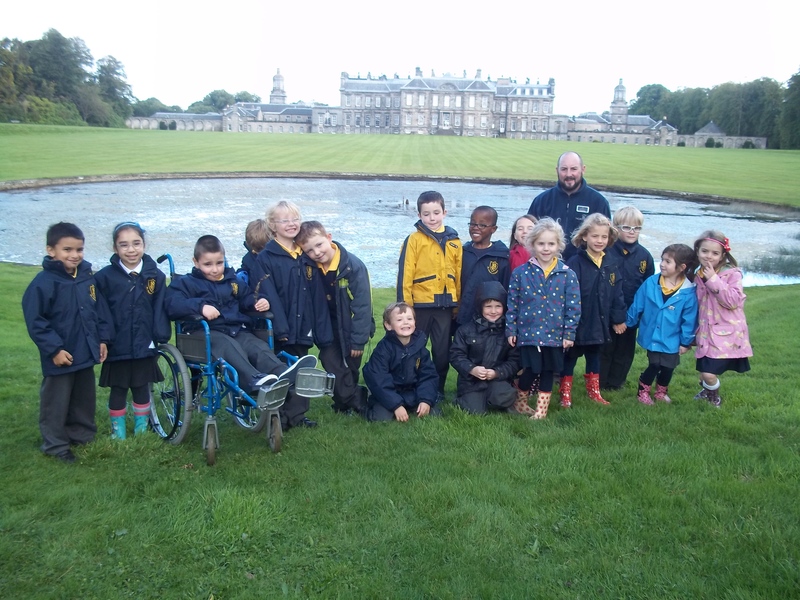 We were able to explore the grounds of Hopetoun House to learn more about different animal homes. 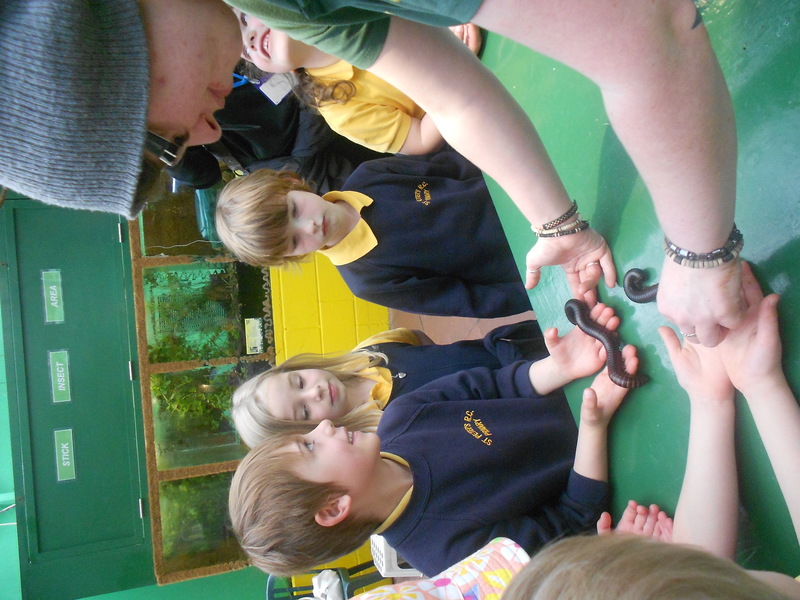 We had a fantastic time and increased our knowledge of our topic. 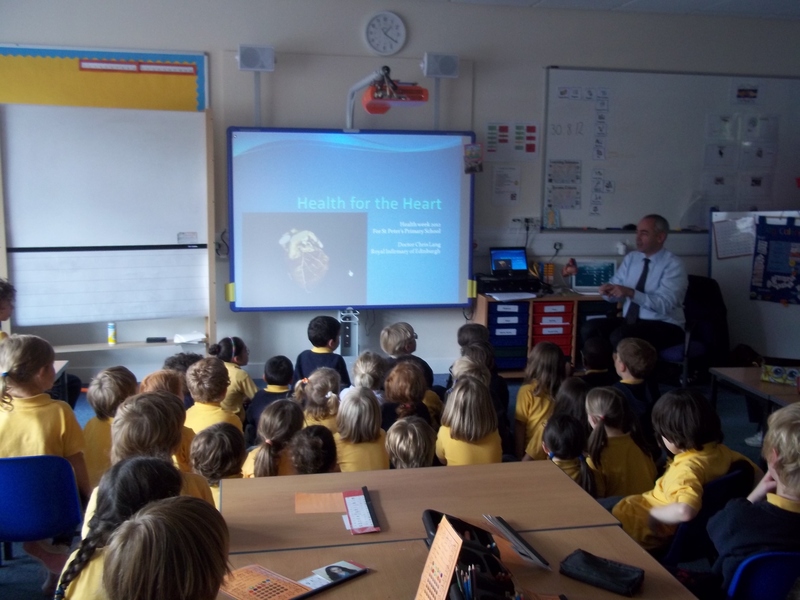 Primary 2 enjoyed taking part in Health Week. After an interesting talk from Waitrose, we made fruit kebabs and fruit faces. 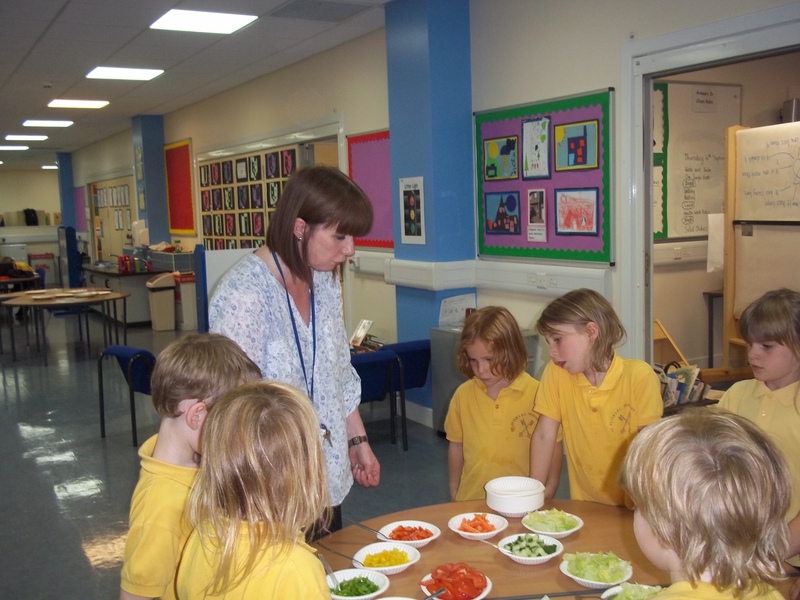 Mrs Christie and Mrs Sladen helped us learn about the different vitamins and minerals fruit and vegetables contain. We made tasty salads. 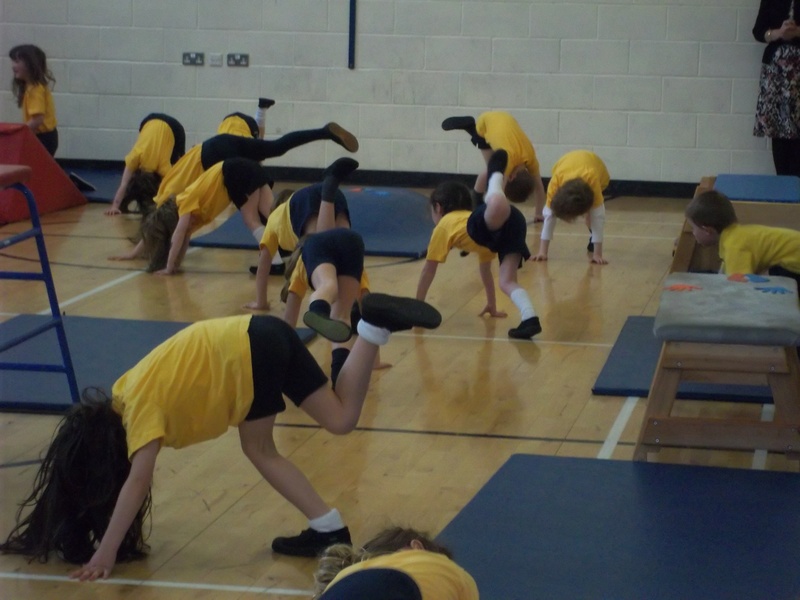 Mrs Skelley taught us Animal Yoga where we made different animal shapes with our bodies. 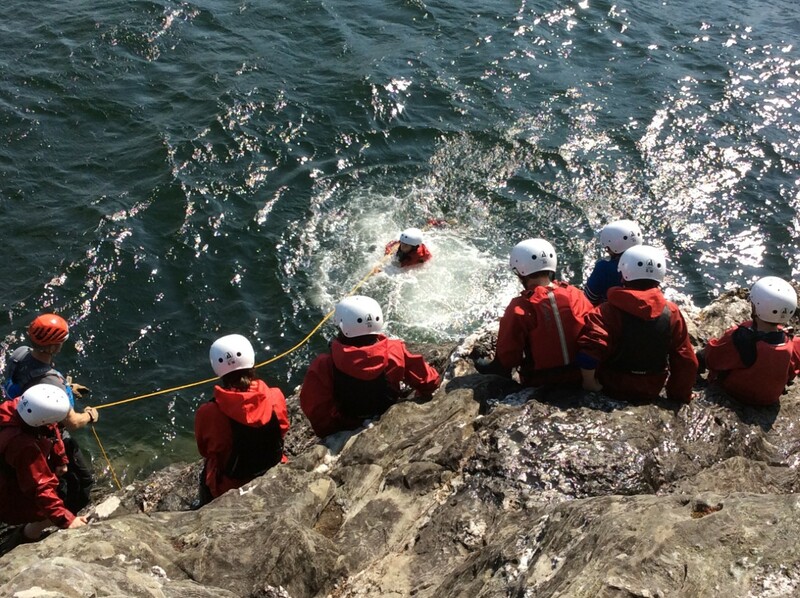 We took part in Diving training exercises where we did some stretching and jumping which would help us when diving. 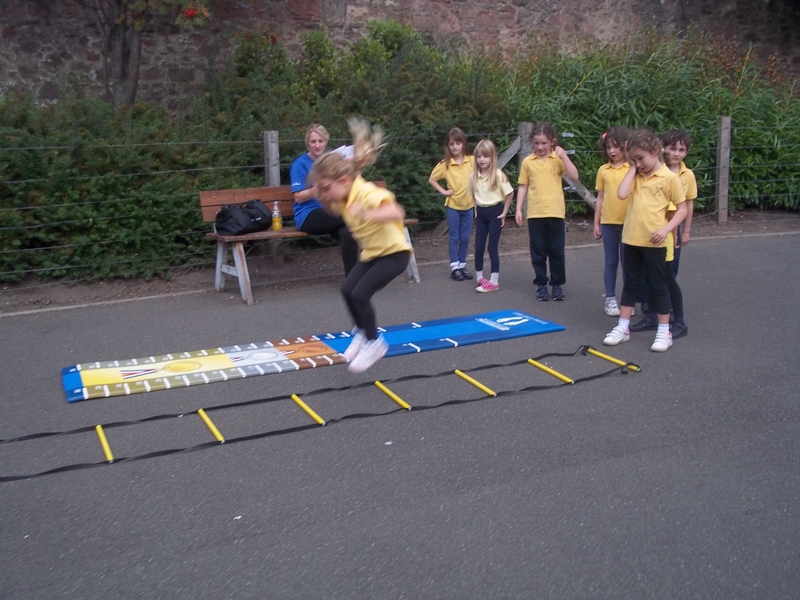 We hope to carry on being healthy and trying different sports throughout Primary 2. 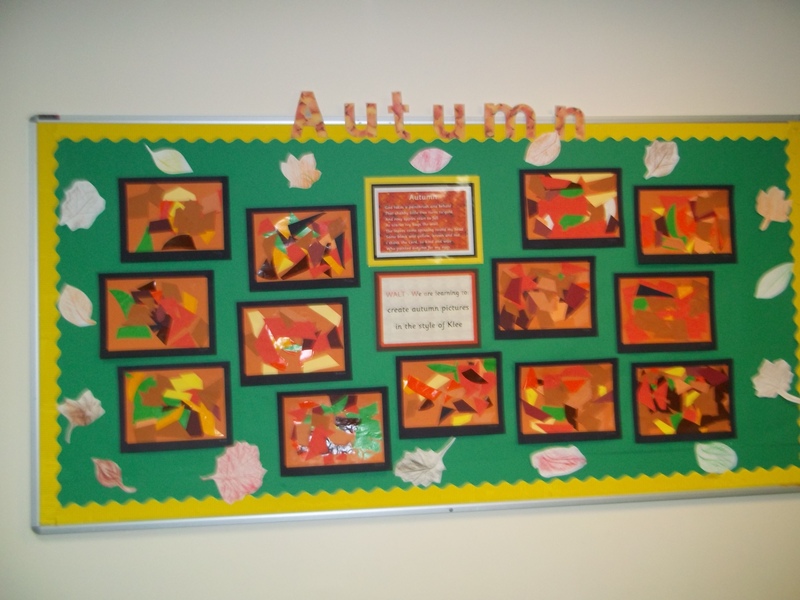 Primary 1 are very busy during the months of autumn with our autumn artwork. 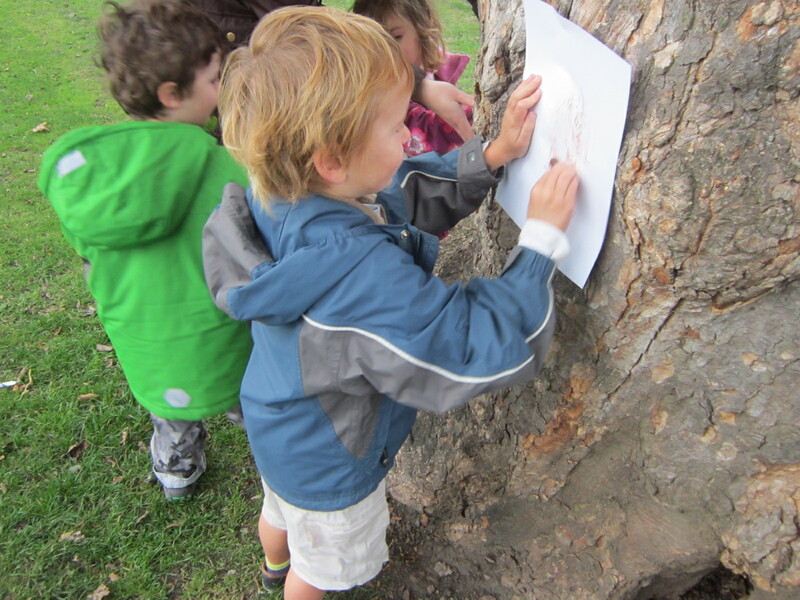 We have been collecting leaves and creating some stunning leaf rubbings. 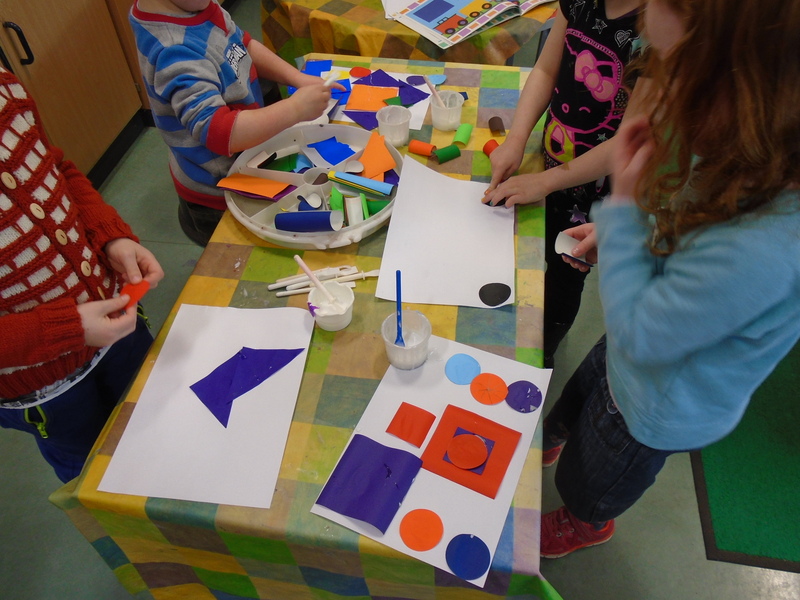 We will be learning about Paul Klee and recreating some of his famous pieces of art. 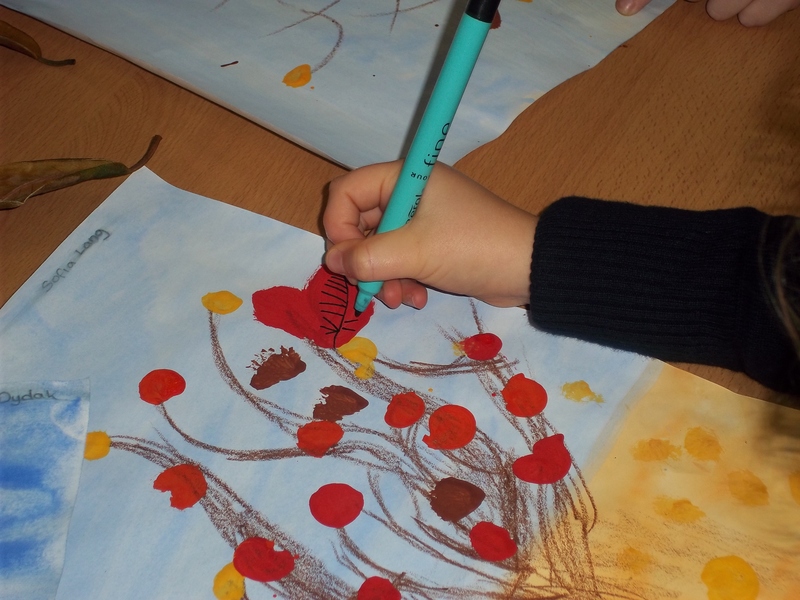 We have made beautiful autumn trees. 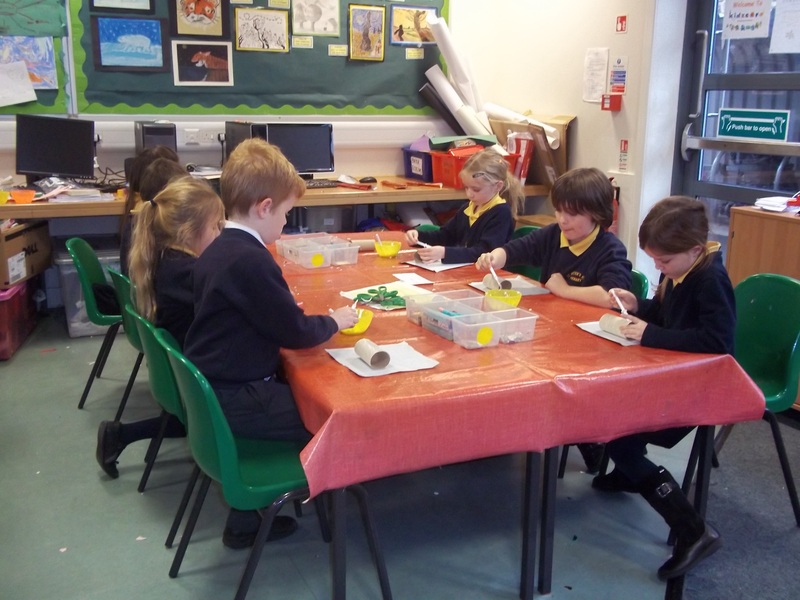 We have been learning about animals that hibernate and will be using different materials to make a home for a hibernating animal as part of our homework. 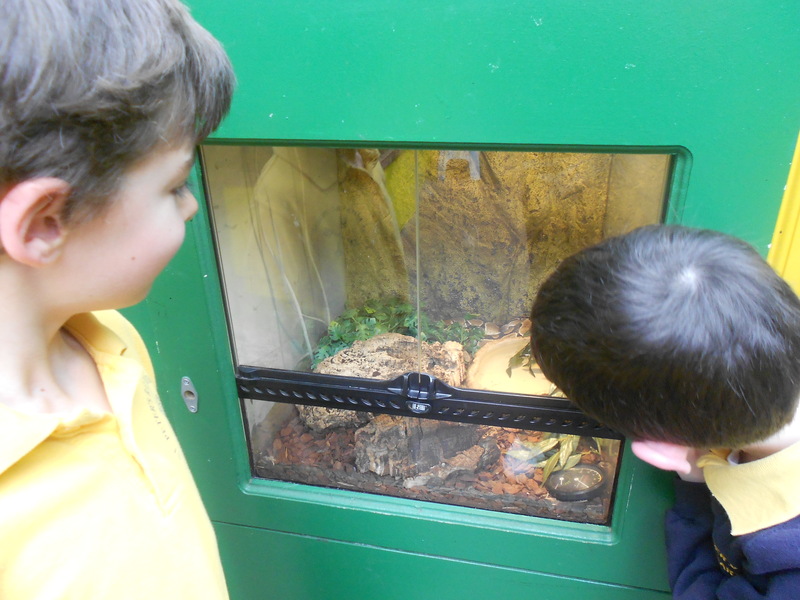 We will each get a chance to show our animal home to the class. This term we are learning a Scottish song for St Andrew’s Day which we will perform at assembly. We are also learning songs for our Nativity which is on December 10th. 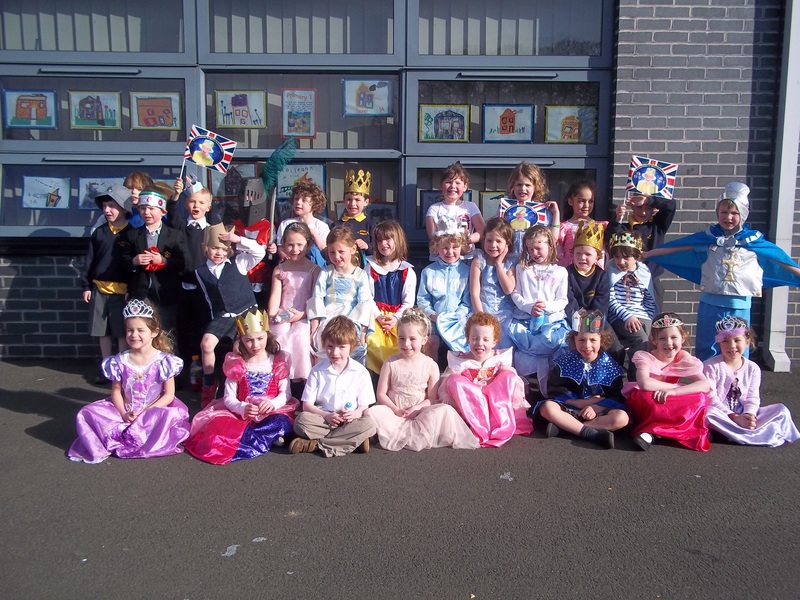 Primary 1 have settled well into school and we are now staying all day. We have been very busy in the short time we have been here. 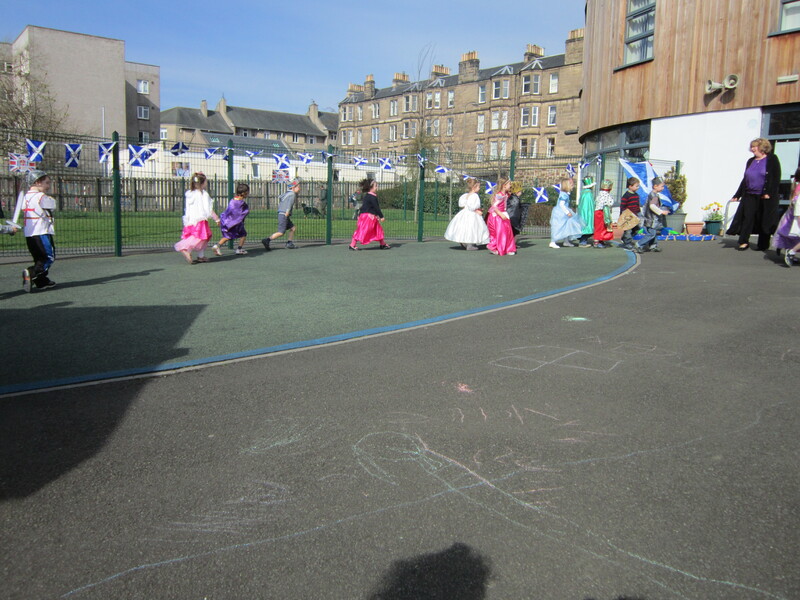 We really enjoyed Health Week, especially aerobics in the playground first thing every morning. 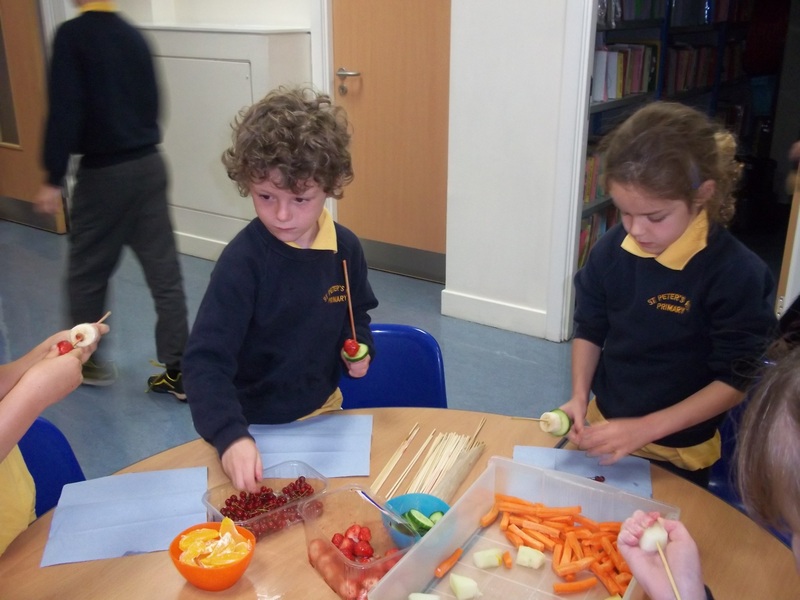 Our buddies helped us make fruit faces and fruit kebabs which was great fun. 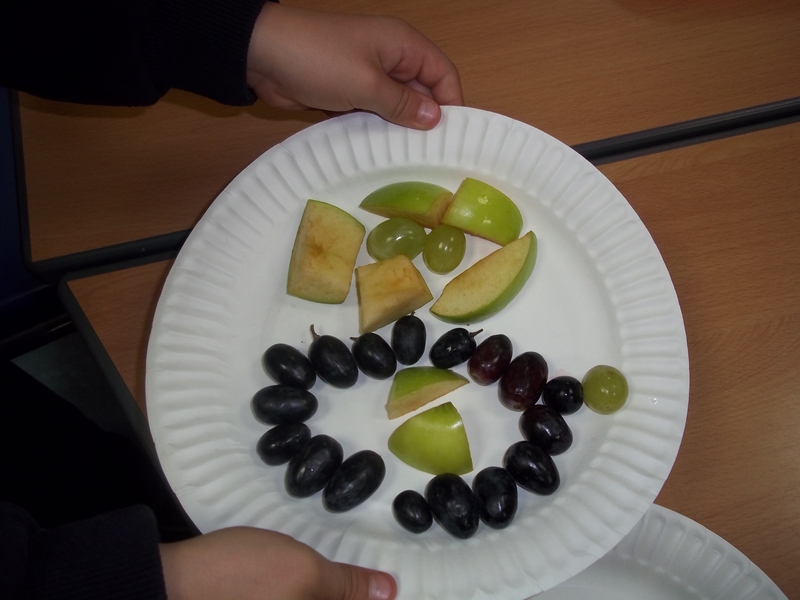 We got to try lots of different types of fruits. Our first topic is “At School” and we have been getting to know the different people who help us in school. 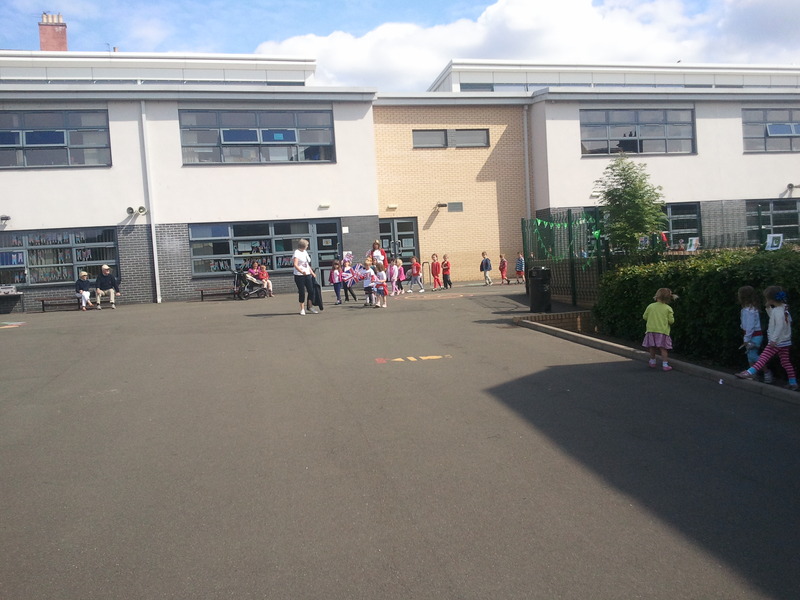 We have also had walks around the different parts of the school. 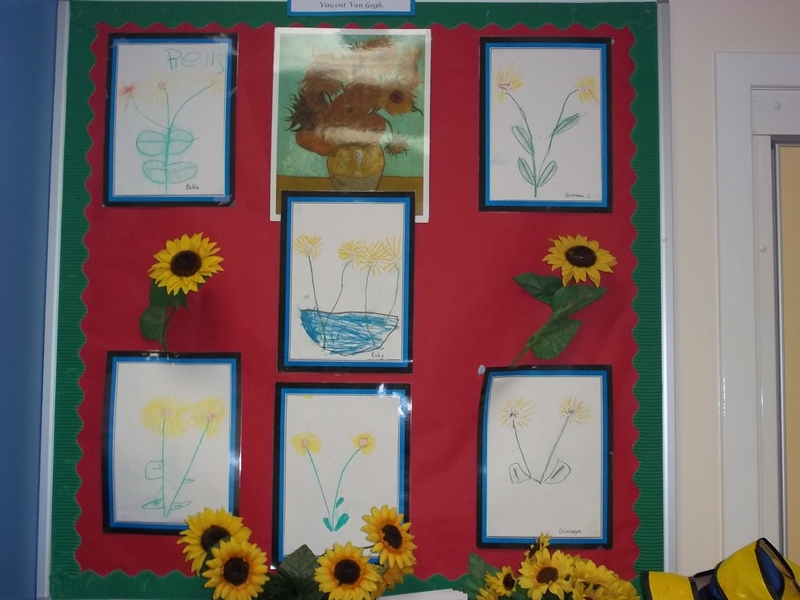 We have also been learning all about the artist Van Gogh and have been making our own version of his famous painting ‘Sunflowers’. 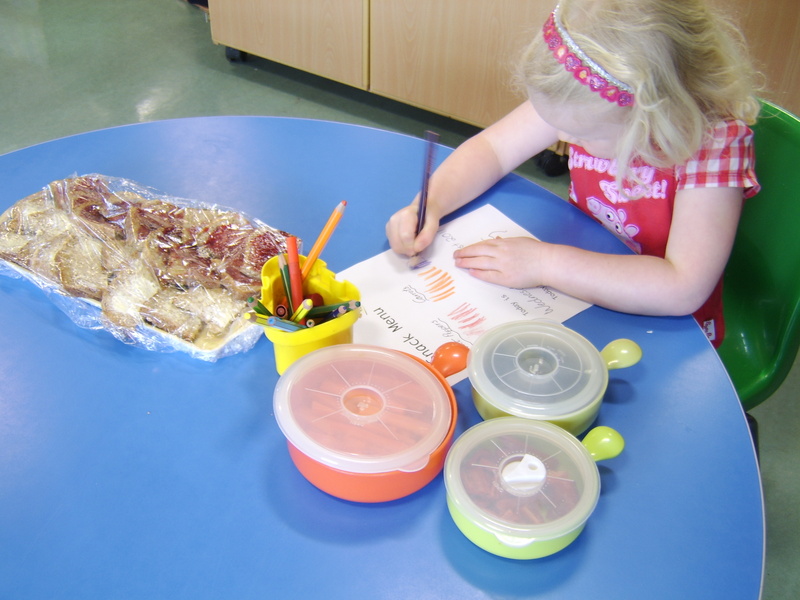 We are looking forward to learning lots of new things in Primary 1. 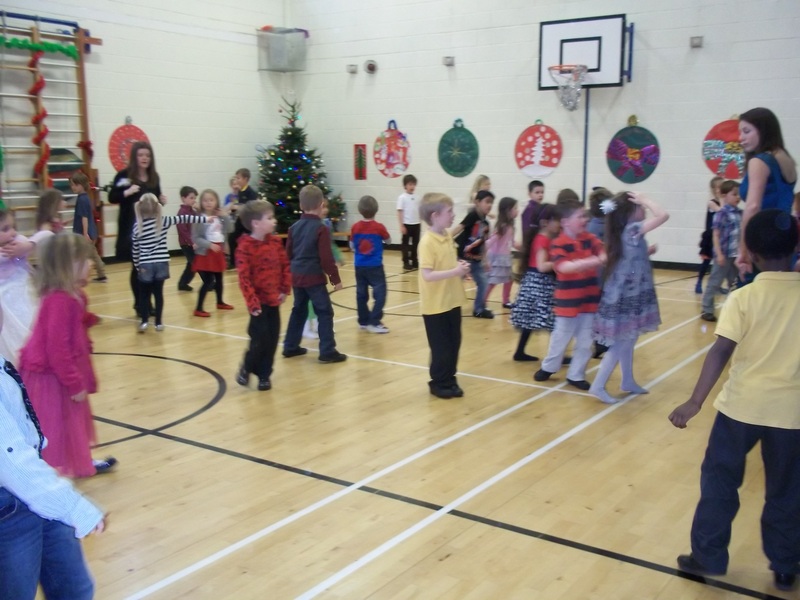 Primary 2 and Primary 5 have been collaborating together during a Christmas reindeer drive. We got to know each other a little better and had so much fun doing so. 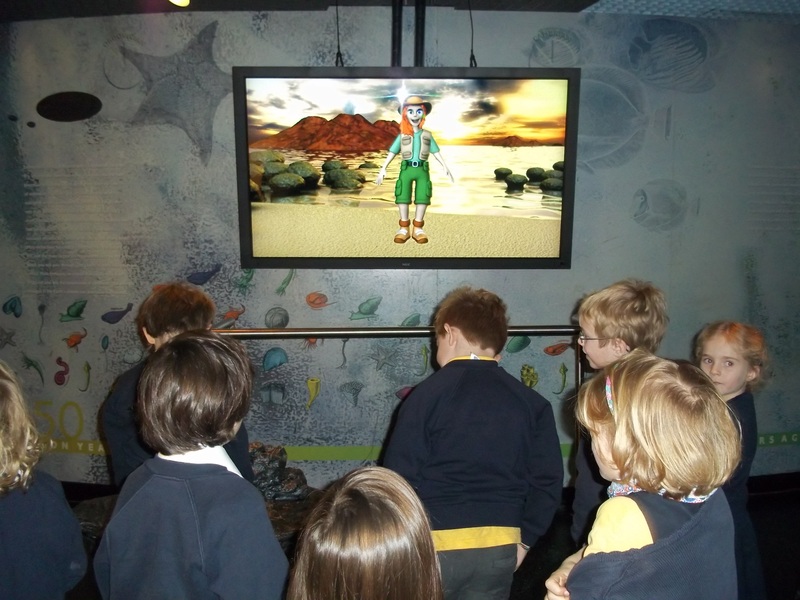 As part of our sun, moon and stars topic we went on a trip to the science centre, Dynamic Earth. 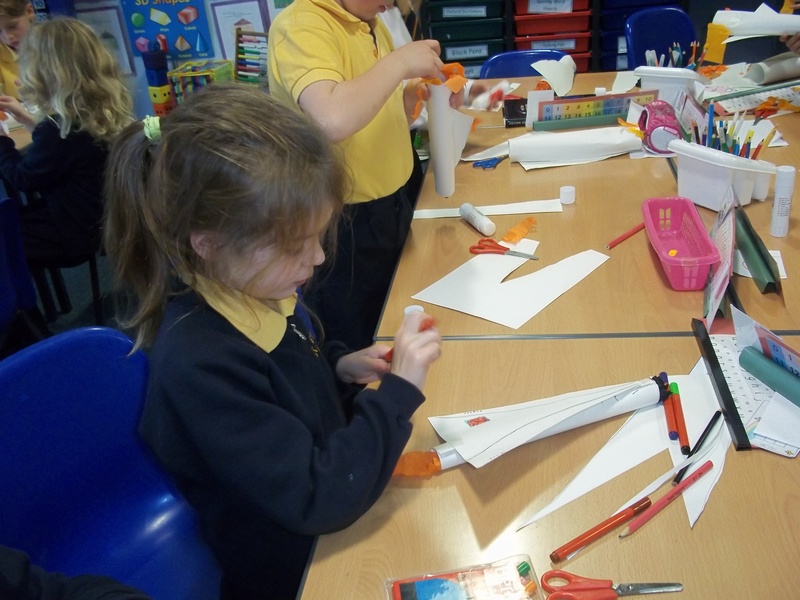 We learned lots about space, satellites, astronauts and gravity. 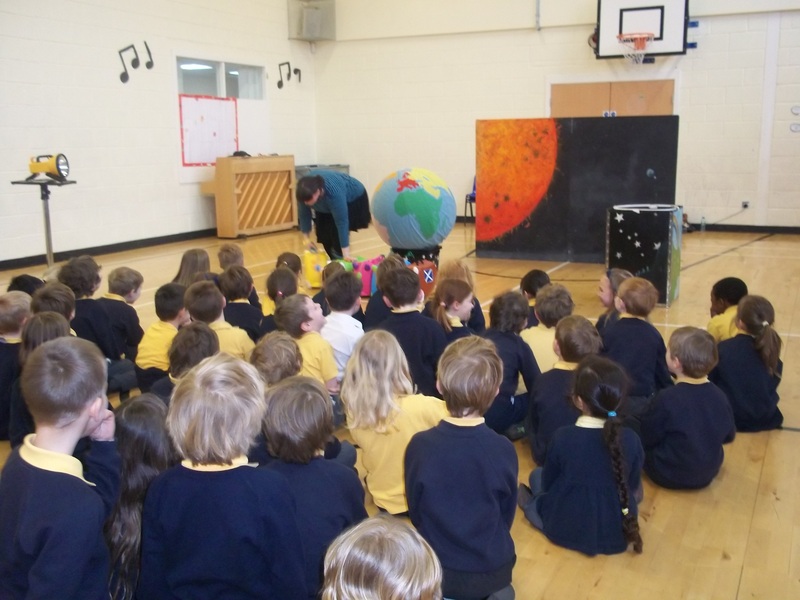 We had lots of fun on our tour and loved our space workshop. 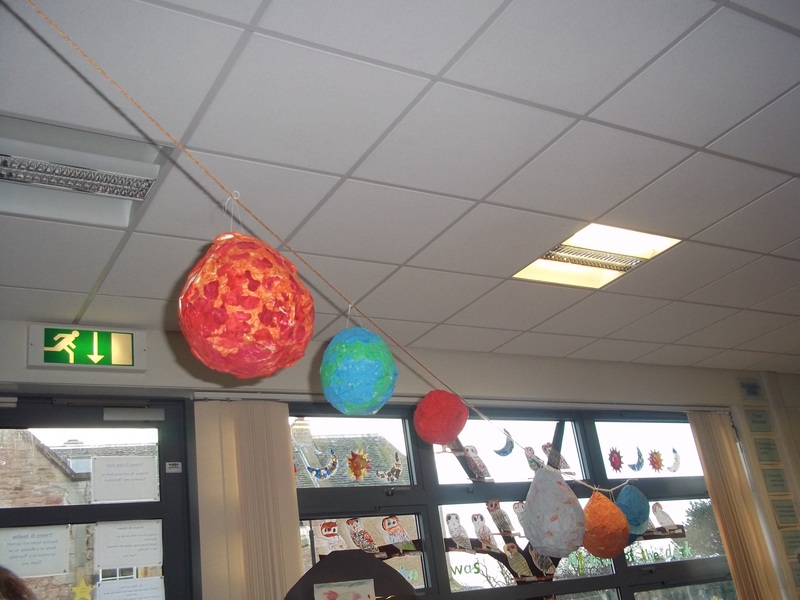 In Primary 2 we have been learning about space. 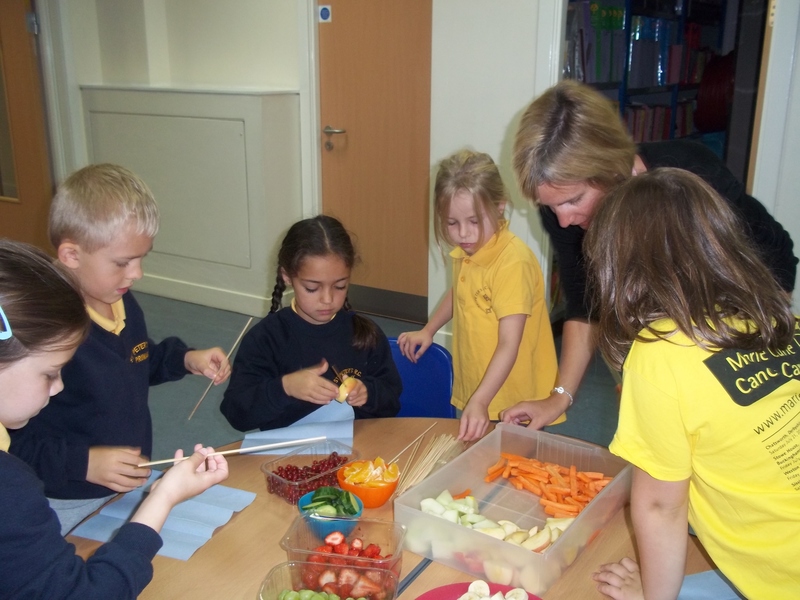 We made some fruit rockets in class using a skewer and placing on different fruits. Whilst making these we discussed the importance of healthy foods and eating our 5 a day as well as learning some facts about rockets. 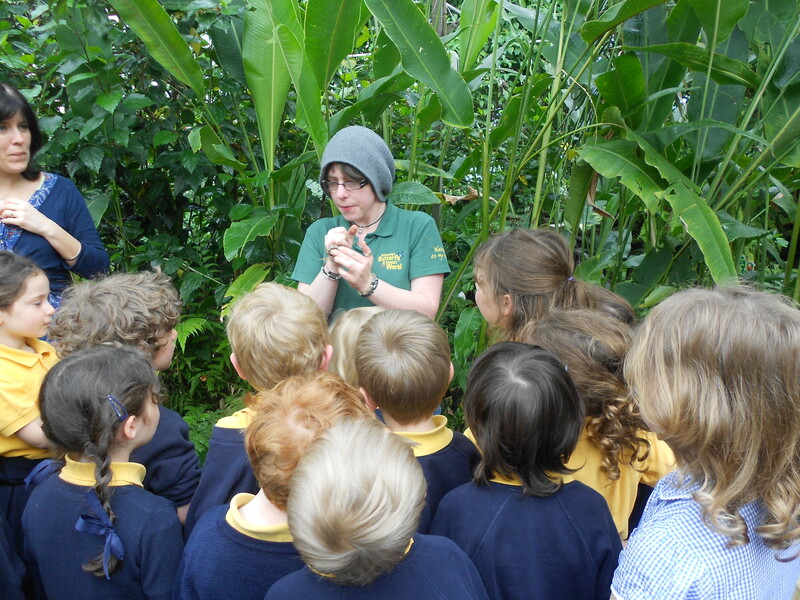 The best part was when we got to eat our fruit rocket once we had made them. 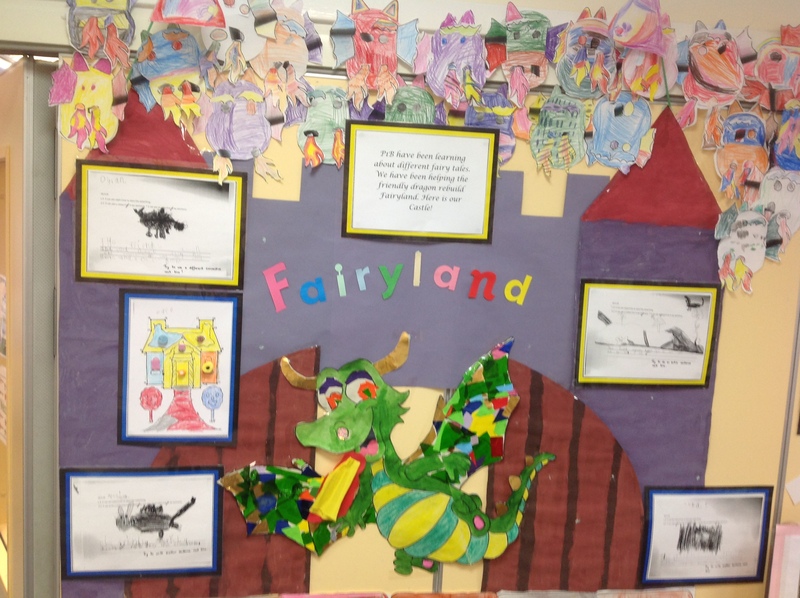 We have been very busy in P1 learning all about Fairy tales. 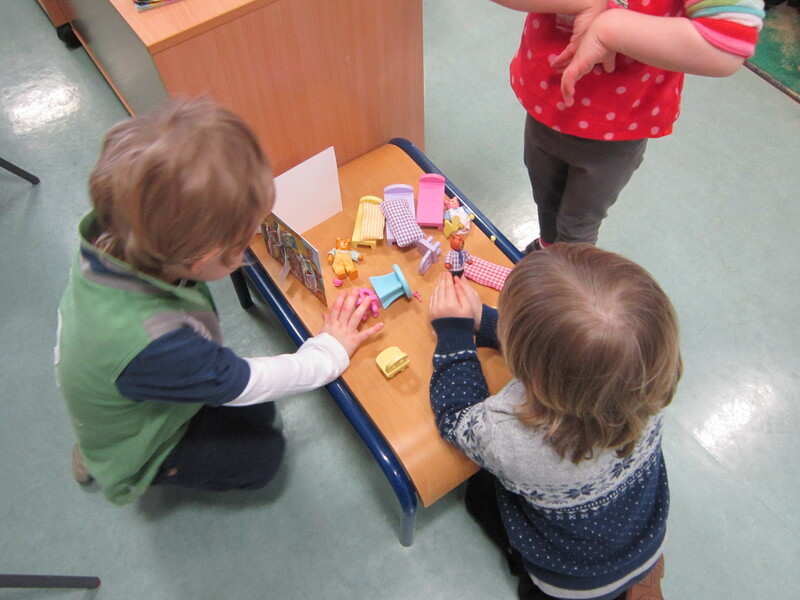 Our favourite thing about this topic is that we receive exciting letters and parcels from the Friendly Dragon. They usually contain some kind of special request. Jack lost his beanstalk so we created a new one for him! 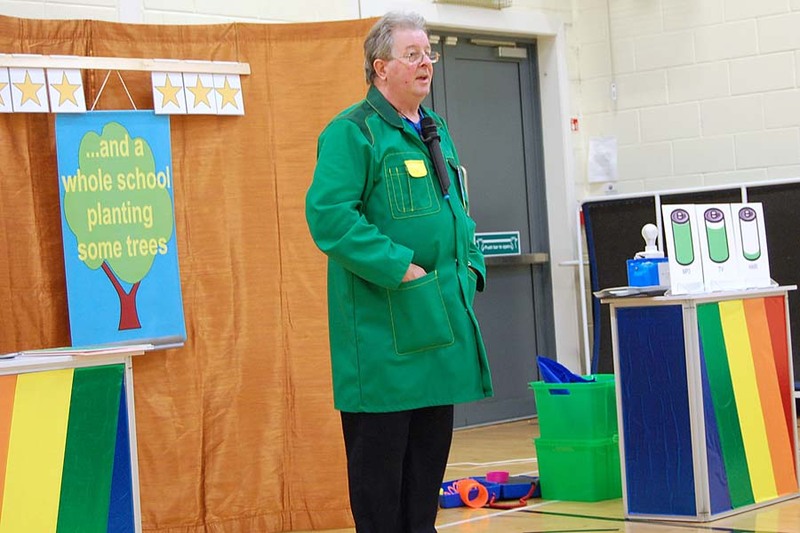 Our very own Jack and the beanstalk! We also made a new home for the Friendly Dragon! 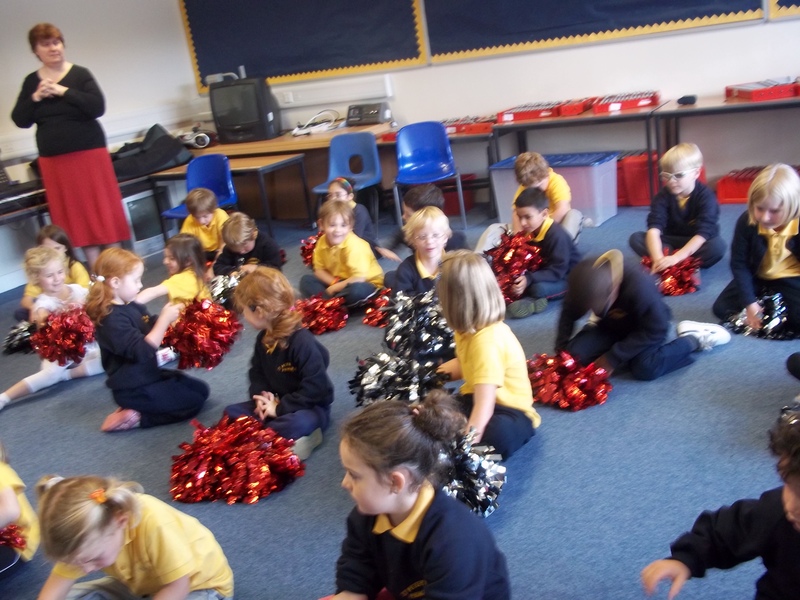 Both Primary 1 classes are busy preparing for their assemblies. 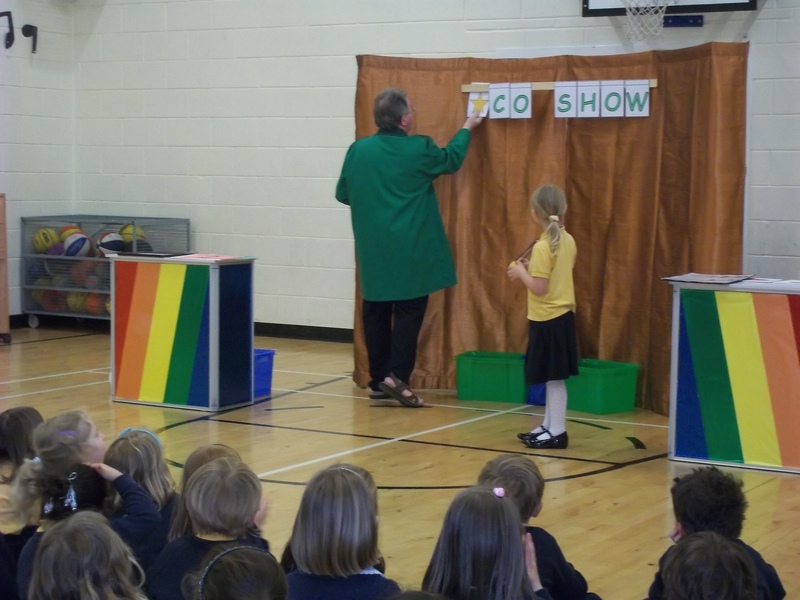 P1A’s assembly is Friday 29th May at 11am and P1B is Friday 22nd May at 11am. We look forward to seeing you there! 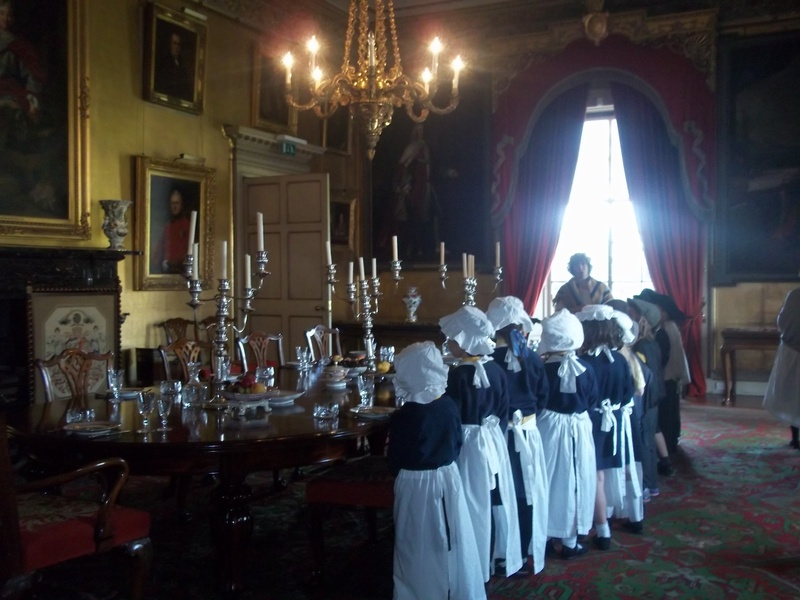 As part of our Spring topic, Primary 1 children visited Lauriston Castle. 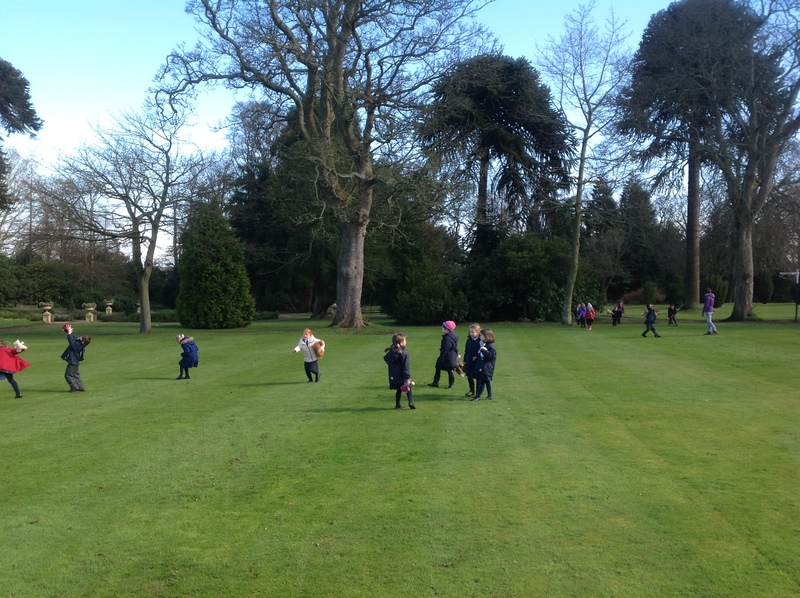 The children explored the grounds as we looked for different signs of Spring. 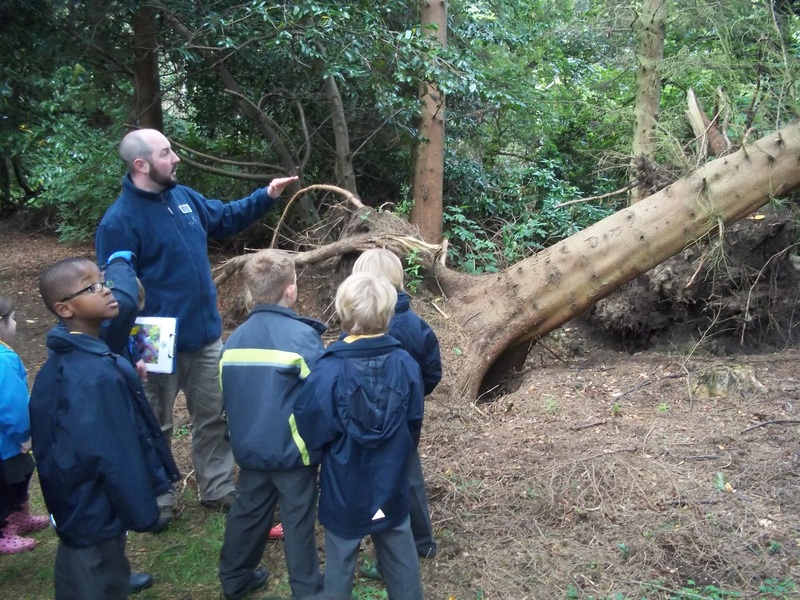 The children took part in a special nature treasure hunt, they found a mixture of things ranging from different kinds of leaves to weird and wonderful beasties! 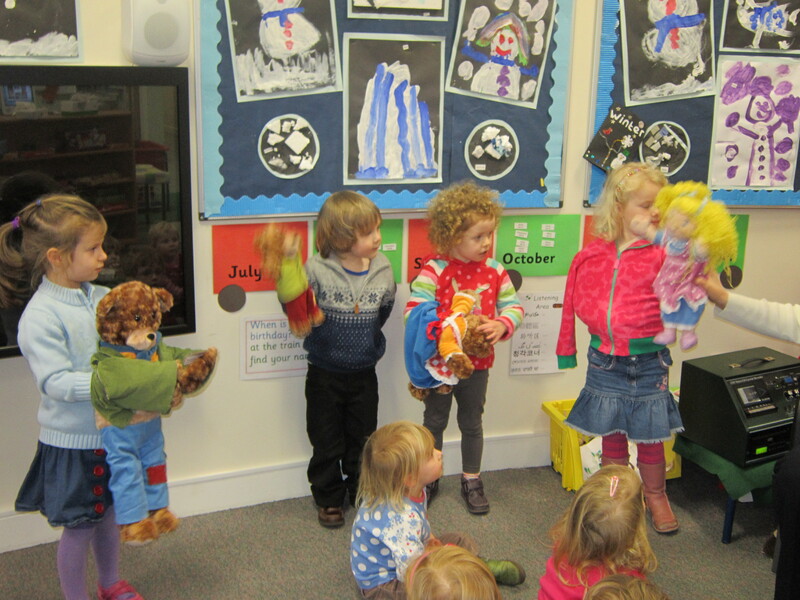 All of the children took their teddies along to Lauriston Casltle and we had teddy bears picnic for lunch. 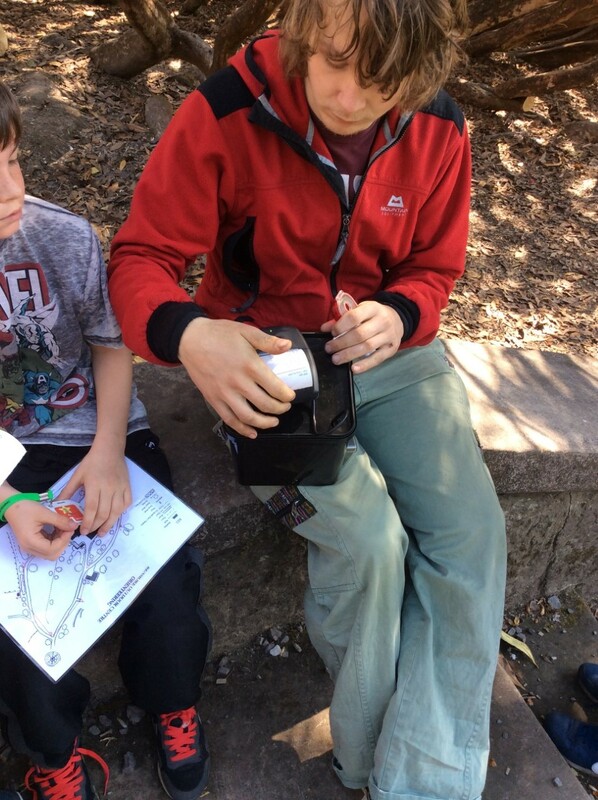 A special thank you to Mrs Lilley and Lukas’ Mum for coming on our trip. Everyone thoroughly enjoyed the day and we look forward to our next outing! 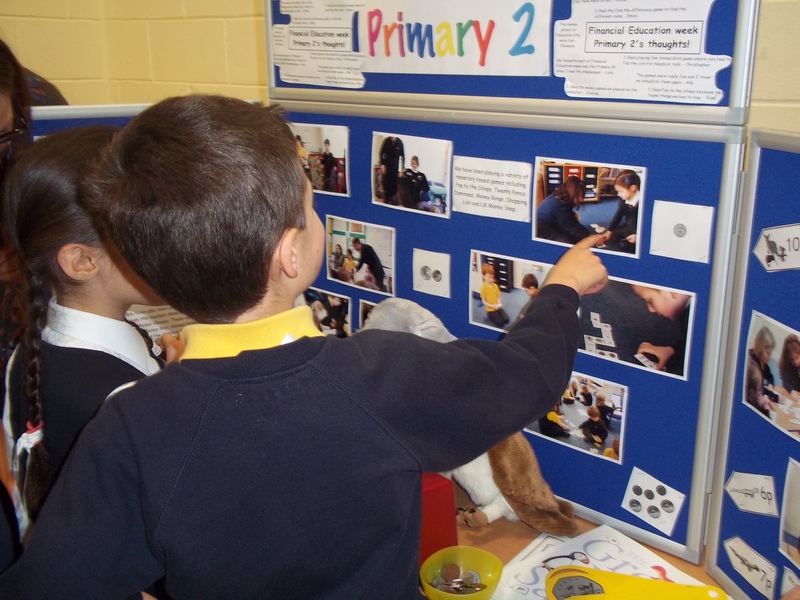 The topic about Materials was very popular with the Primary 1 children. 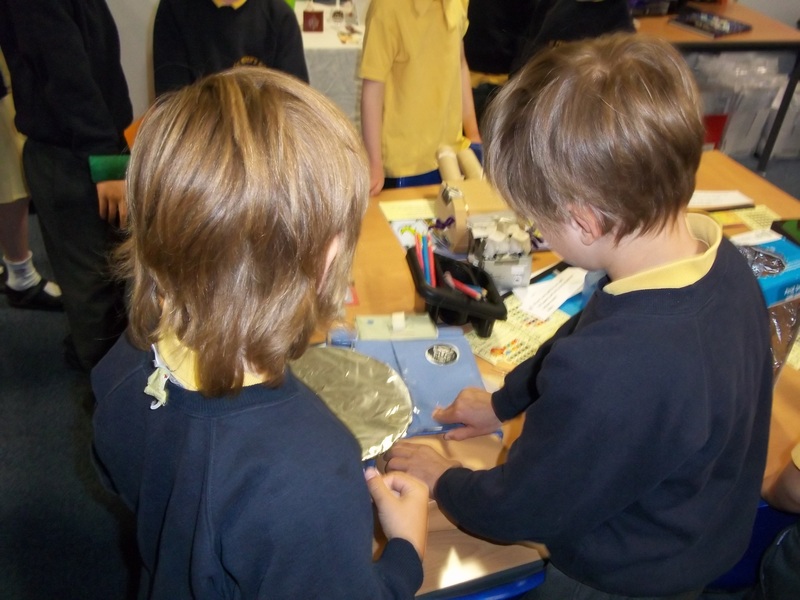 The children enjoyed learning about different properties of materials. 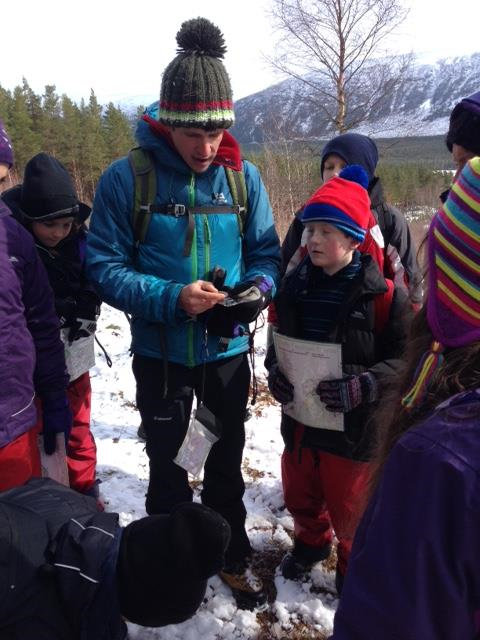 They explored them by making various experiments, such as mixing vinegar with soda to make a rocket or sprinkling salt on ice whilst listening to the ice crackling! 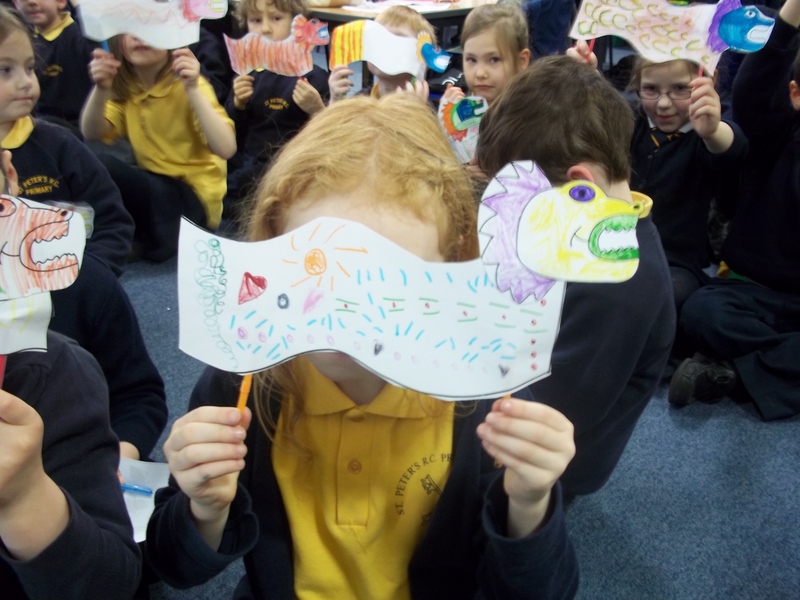 During the half term holidays everyone took part in making their own puppet using different materials and we all had fun showing them off during our Show and tell and even more so during our Drama , where we all took part in performing in our Puppet Show! 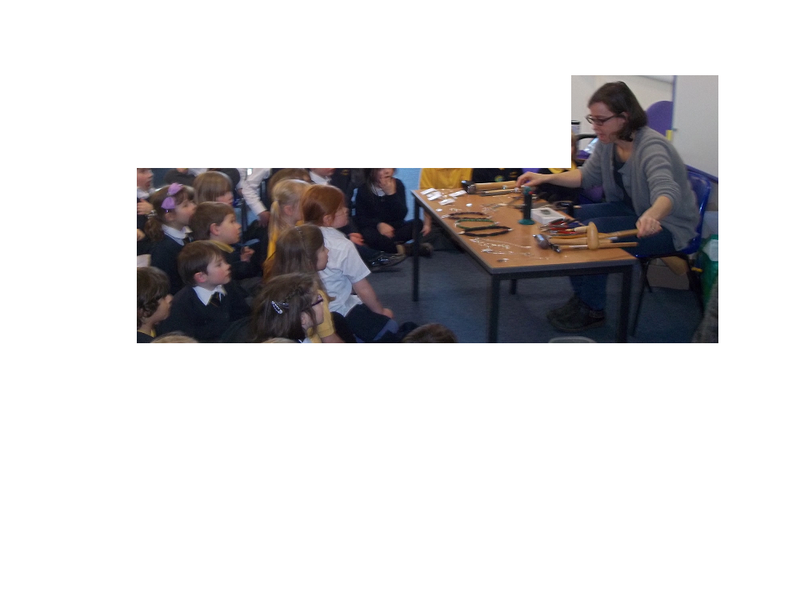 We also had a very special visitor ( Lara` s mummy) , who came in to our class to show us different tools she uses to make jewellery and told us all about the materials she needs to make her lovely necklaces and earrings. 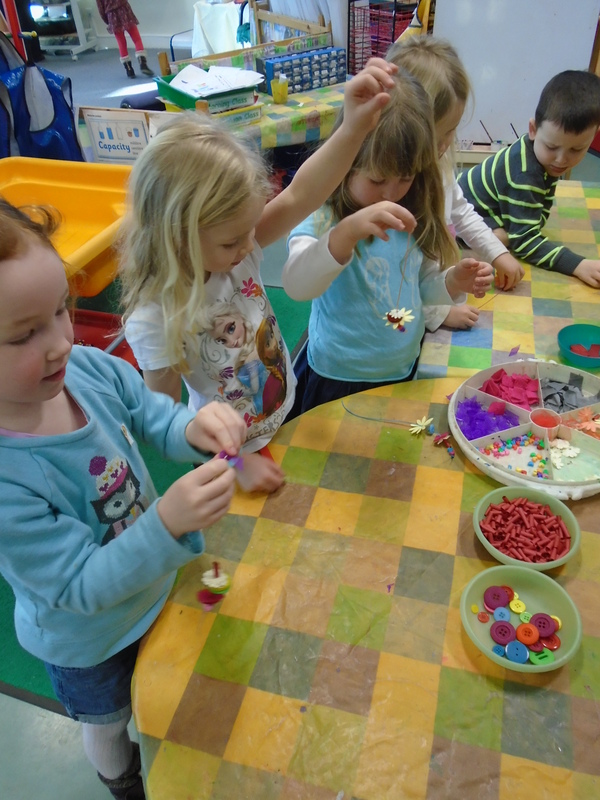 We watched her very carefully whilst she made a special ring for us! I would like to say thank you to all our parents who helped us with making our puppets and a special thanks to Lara’s mum for coming in too! 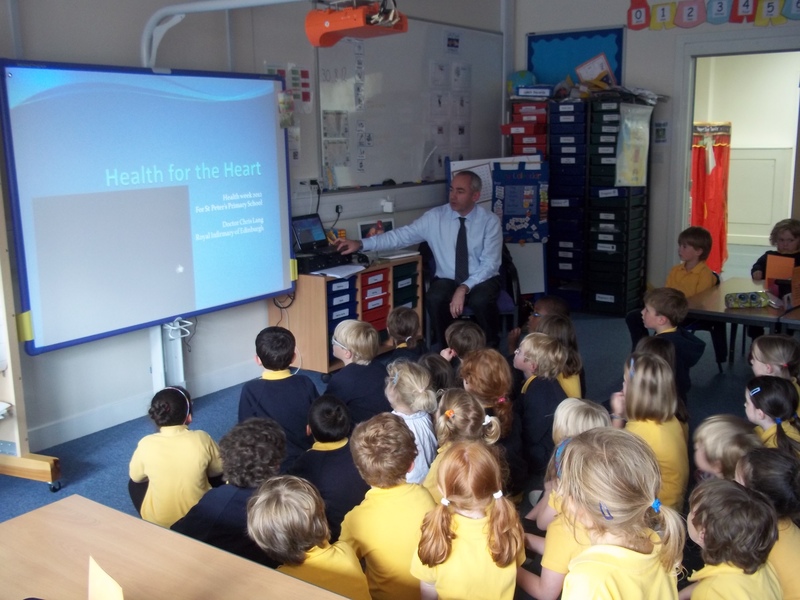 Health Week was very successful with the Primary 1 children. 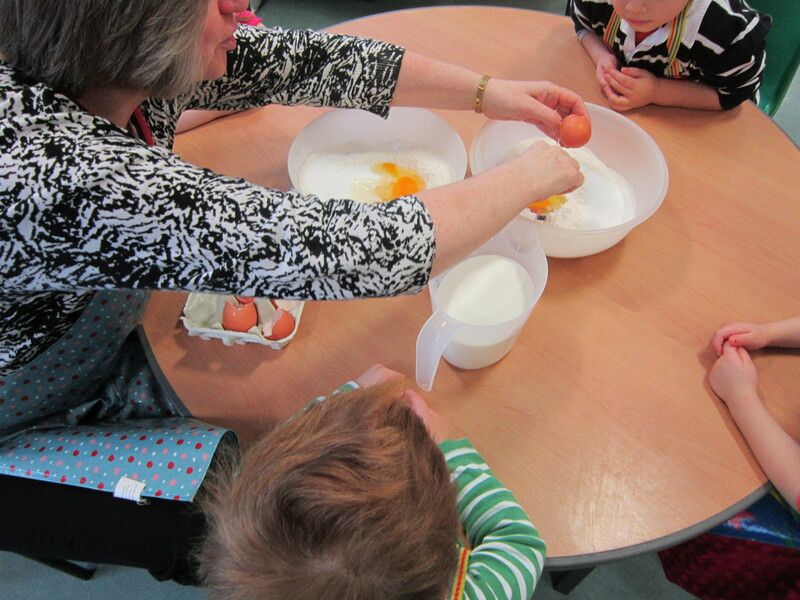 The children said they particularly enjoyed the morning ‘Wake and Shake’. The movement warm up in the playground definitely set the healthy atttitude for the day. 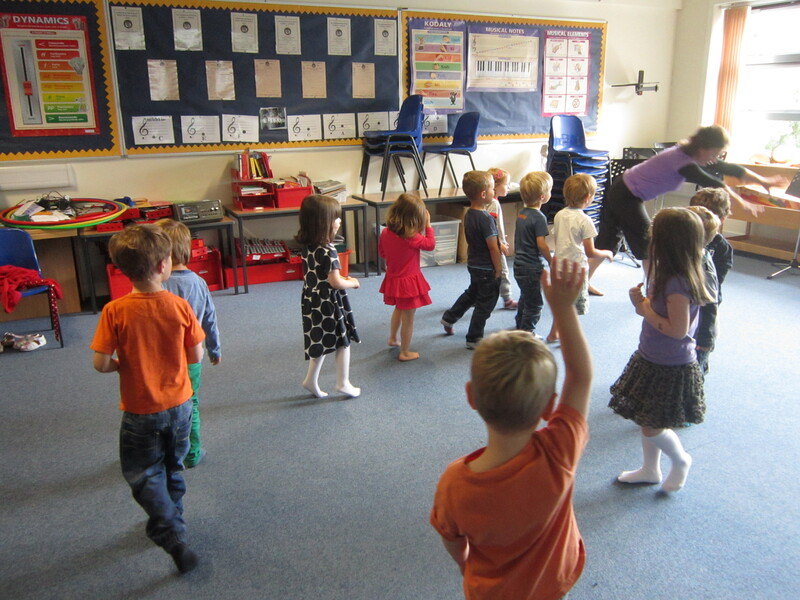 We will continue the morning wake and shake in our class throughout the year. 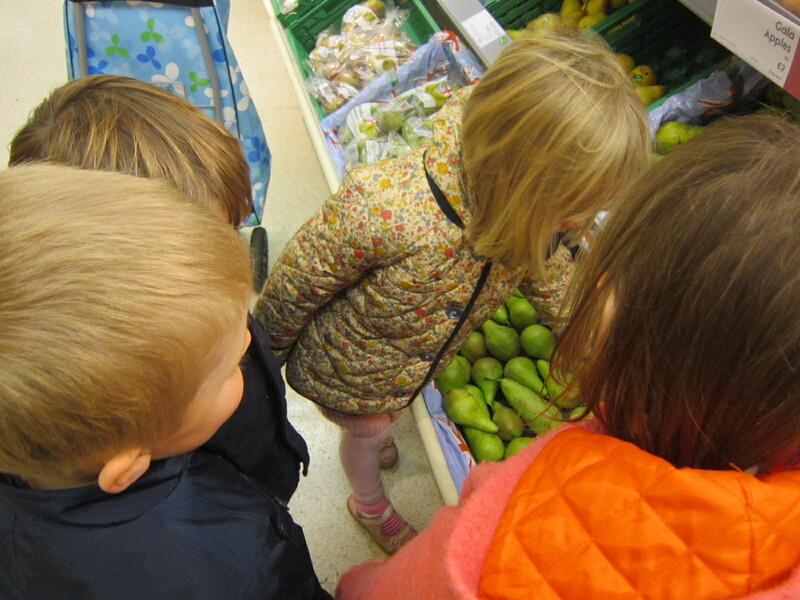 A visit from Waitrose allowed the children the opportunity to taste and discuss some exotic fruits from all over the world. 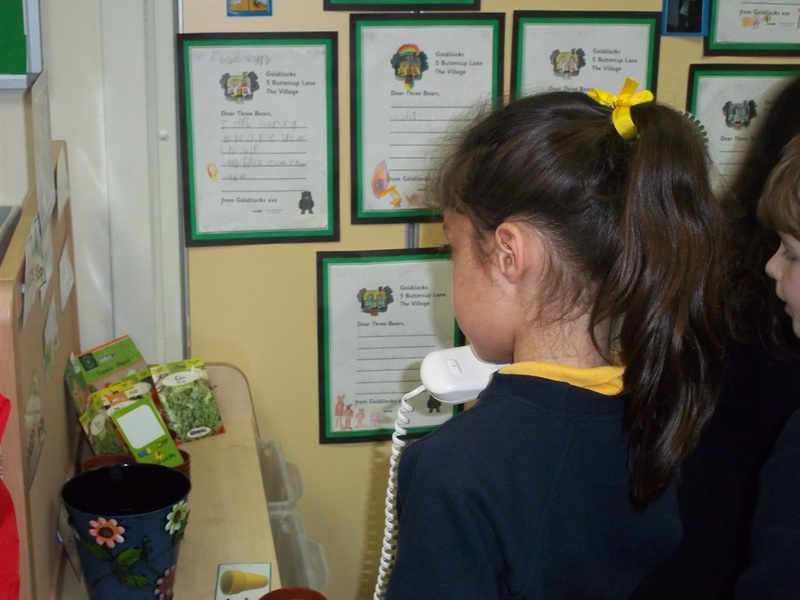 We discussed the importance of eating healthily as well as looking at source food ethically and locally. 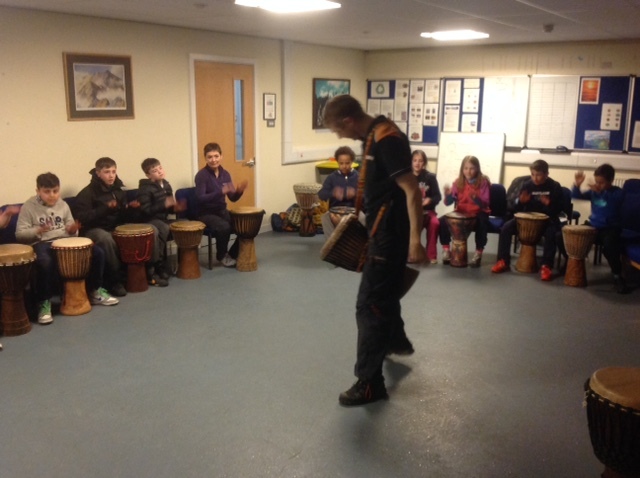 The learners really benefitted from experiencing a variety of different activities. 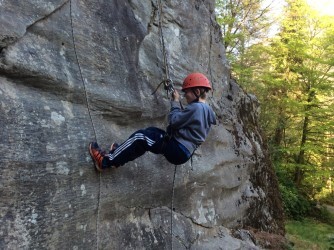 Many children have said that they would like to do more sports activities at home. 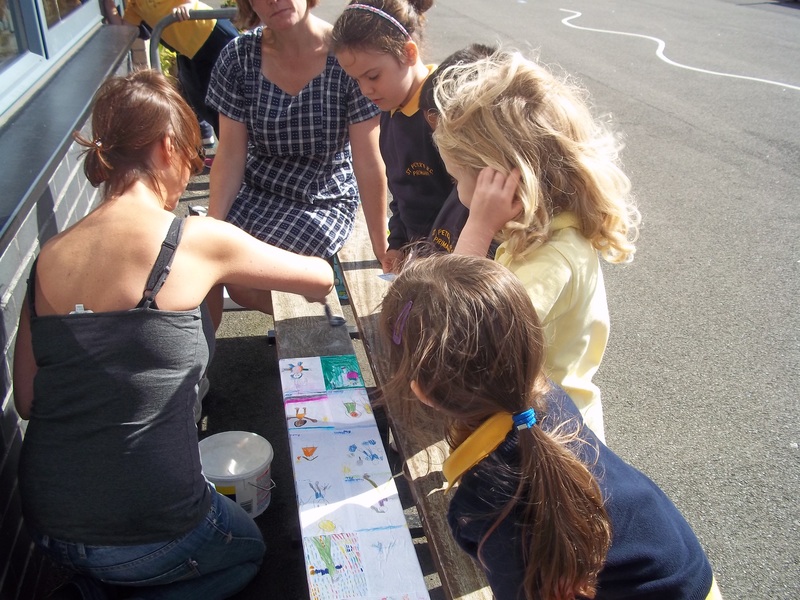 I would just like to say thank you to all our parent helpers who made health week fantastic for our children. 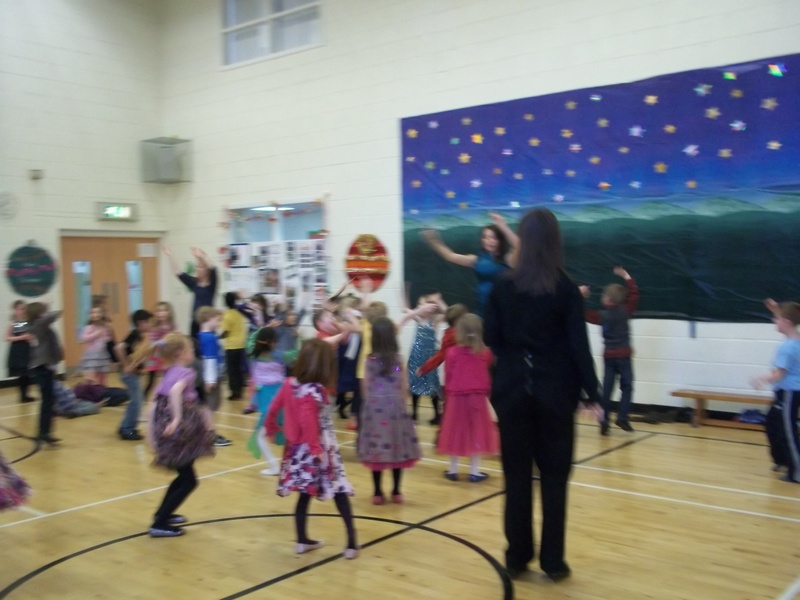 Keep up the healthy attitudes Primary 1. 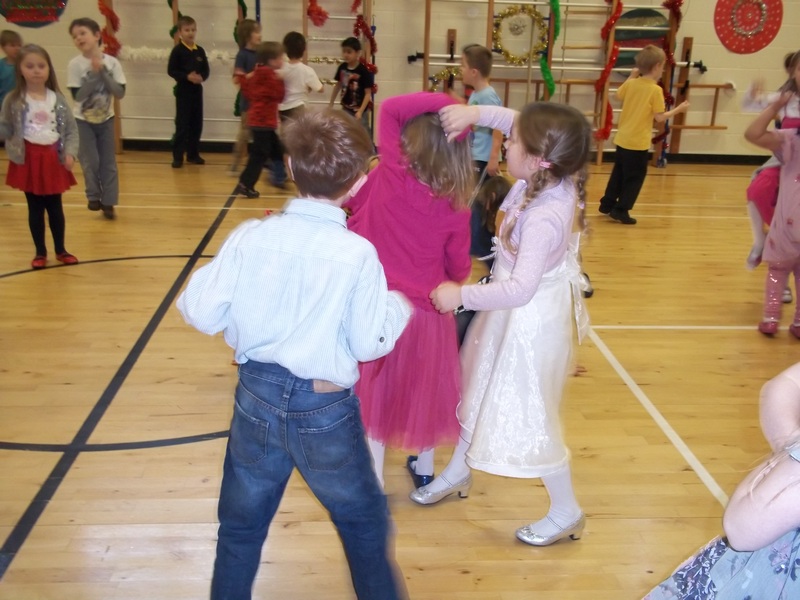 Primary 1 have settled well into their new classes and new routines. 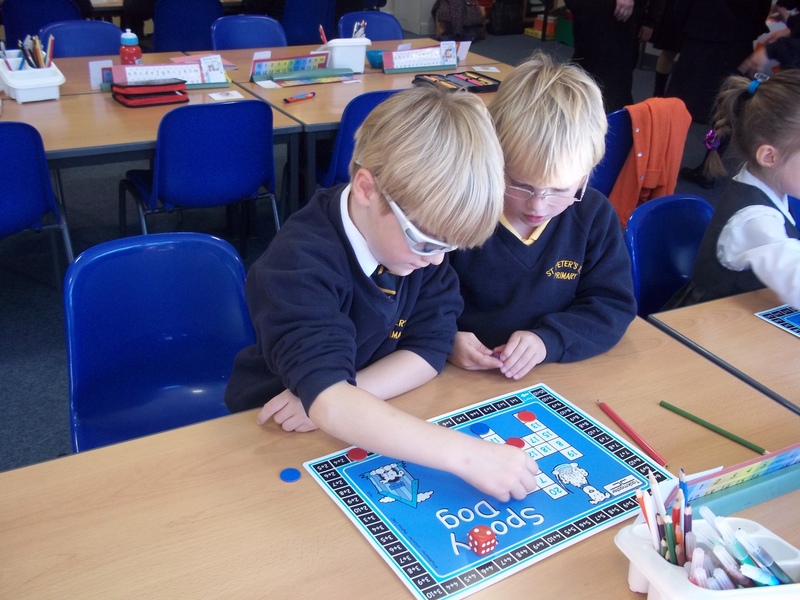 They have had a busy and exciting transition to school. 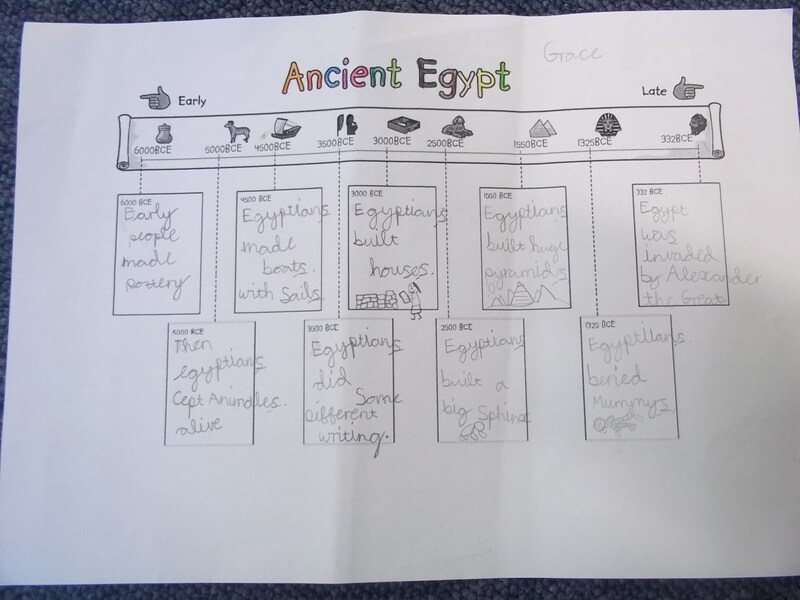 The children began the year with their transition topic ‘Summer Holidays’. 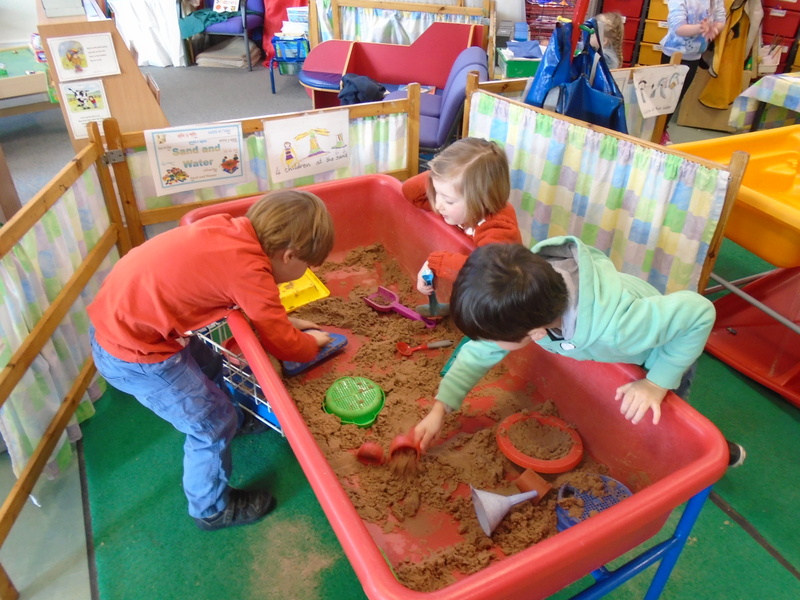 The learners were fully engaged in designing patterns for beach towels, using the sand tray to sort and organise shells as well as learning lots of summer songs. Good job to the children who brought in items for show and tell. 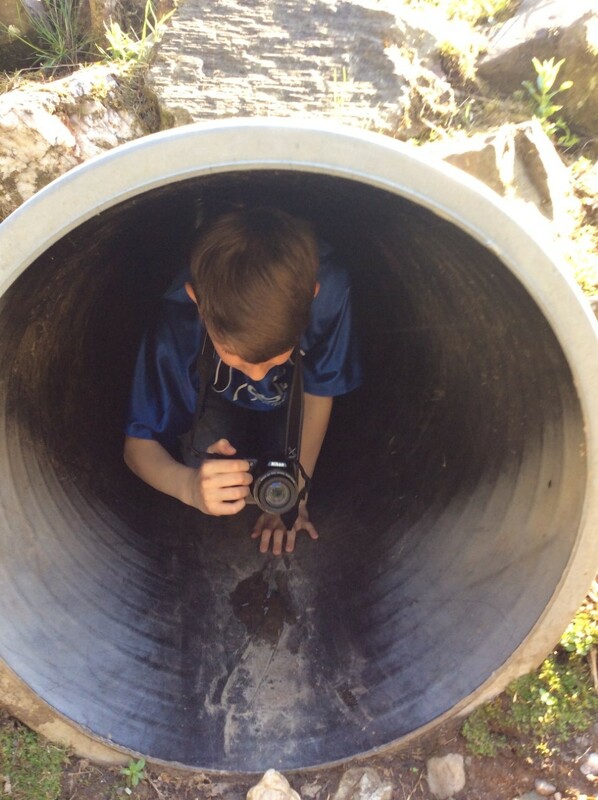 We seen some brilliant photgraphs and heard some exciting stories of holiday fun. 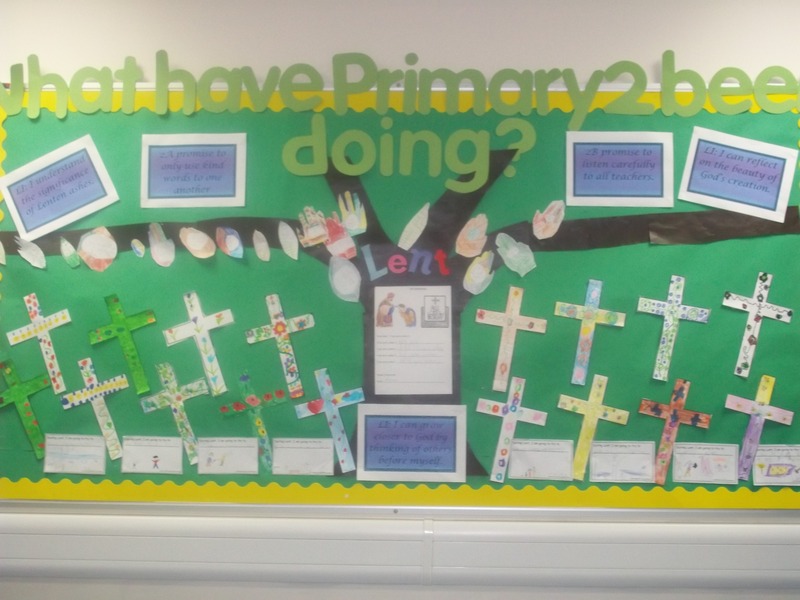 Keep up the hard work Primary 1. 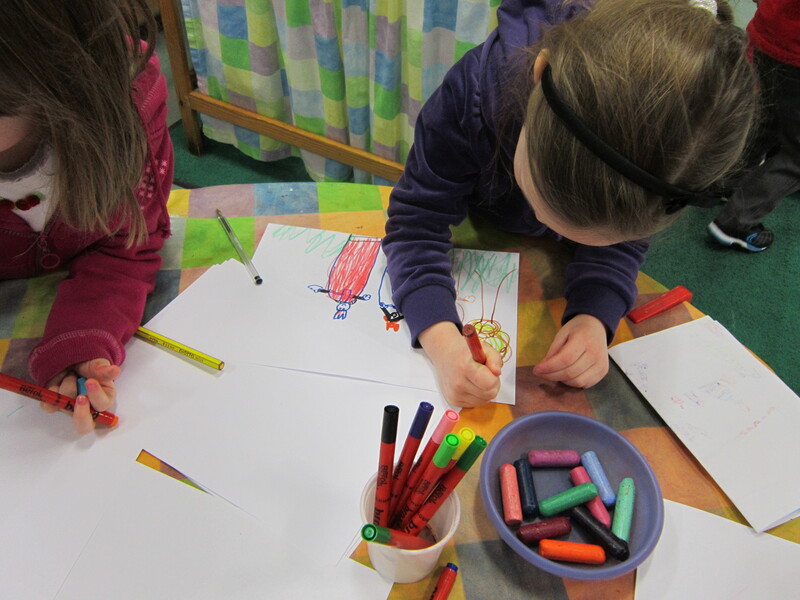 Katie Morag stories, by Mairi Hedderwick, are proving to be very popular with the children. 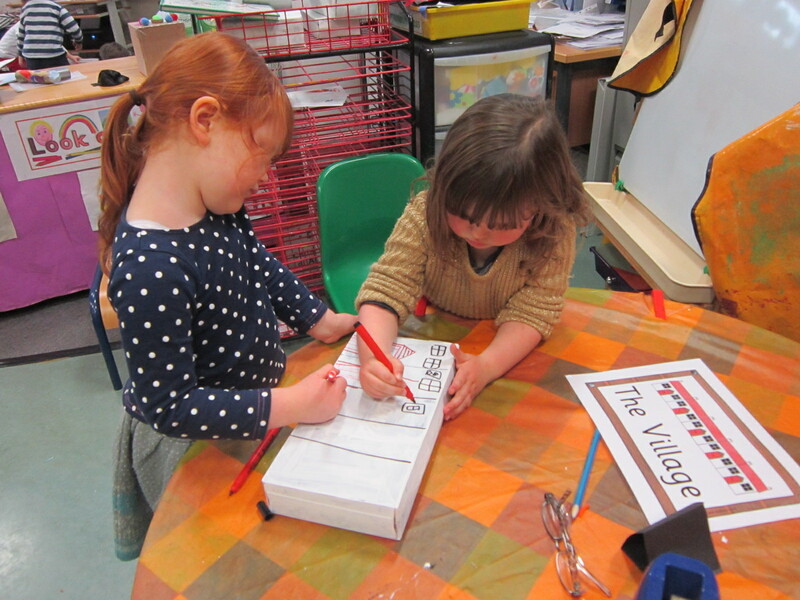 After turning our role play area into “The Isle of Struay Post Office”, the children designed their own postcards and sent them to Katie Morag. 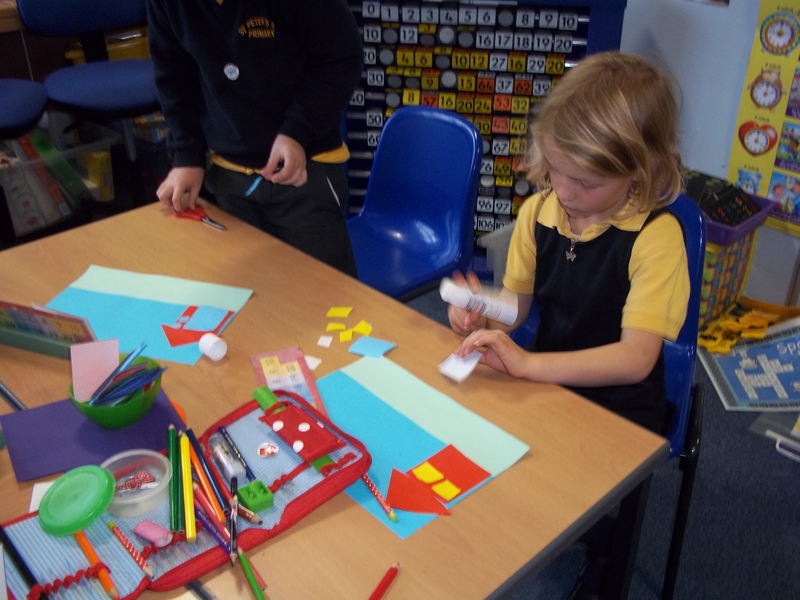 We had fun making 3D houses to add to our map of the Isle of Struay and the children then drew their own island maps. 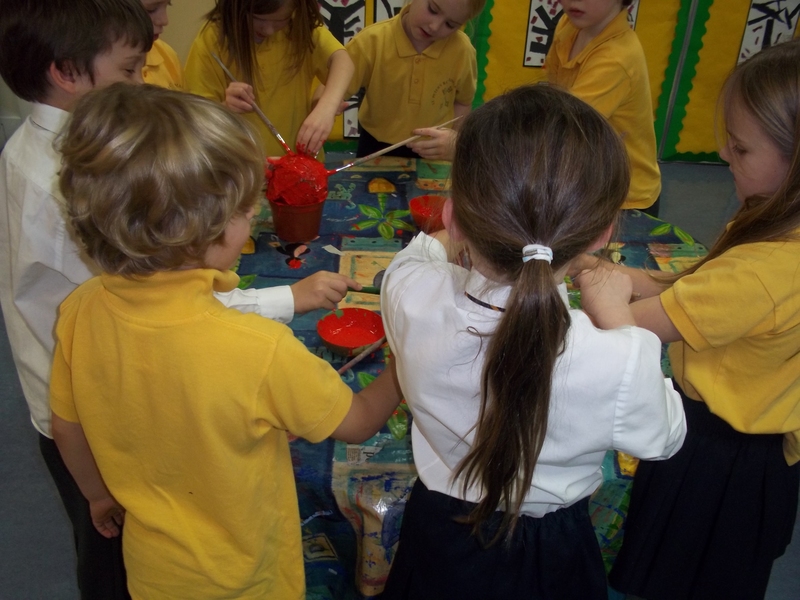 Many children were excited about bonfire night and had been to firework displays. 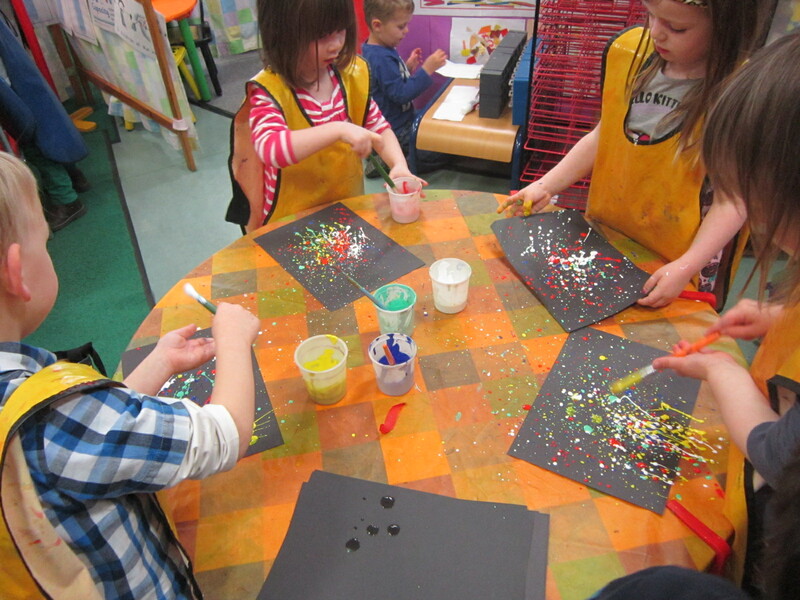 They enjoyed using paint to make firework pictures. 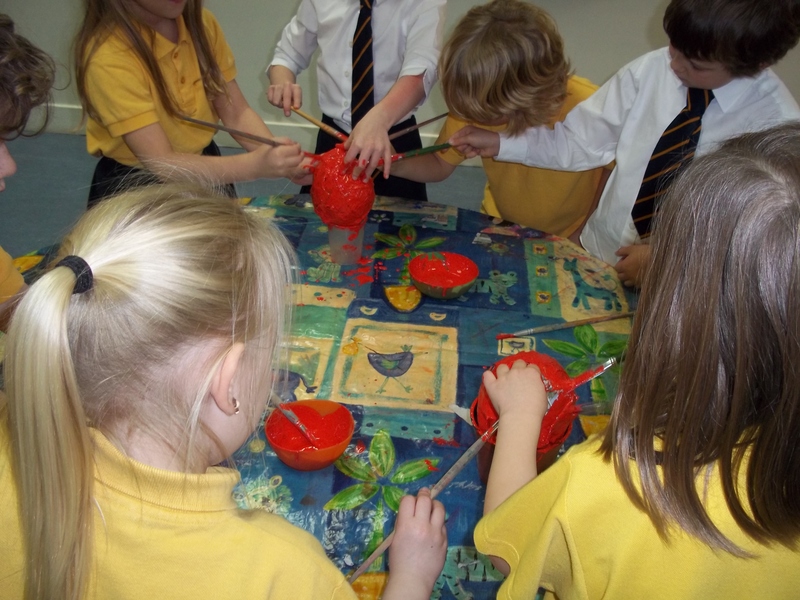 We enjoyed many Halloween activities in Nursery. 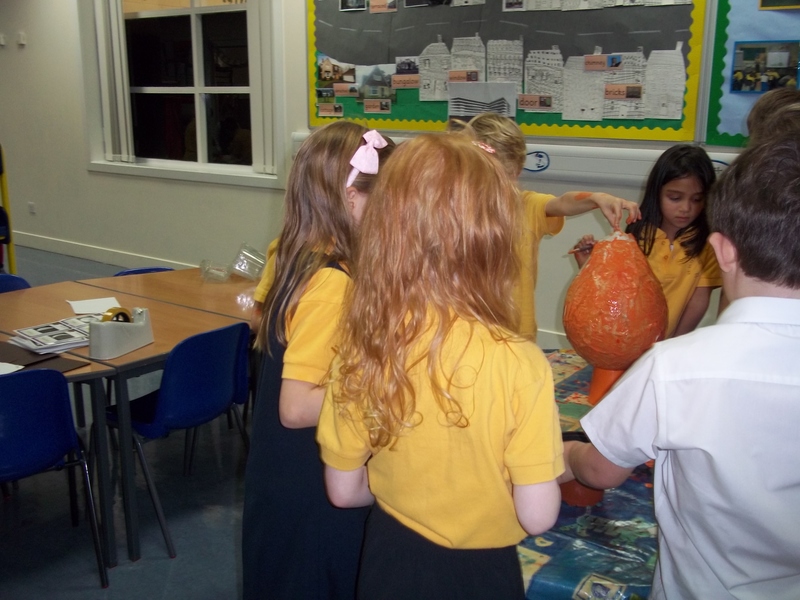 The children had fun carving pumpkin lanterns. After listening to the story “Pumpkin Soup”, a group of afternoon children made pumpkin soup which they proudly served to their friends. 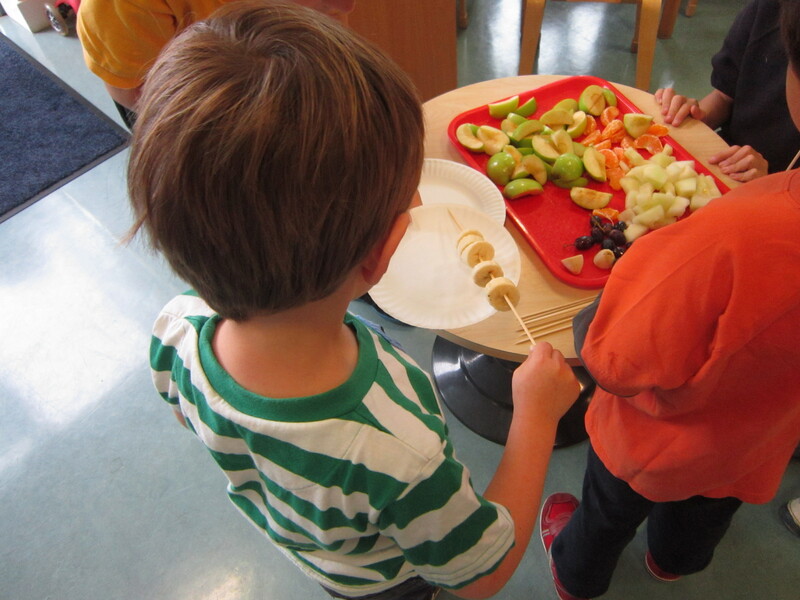 We harvested the remaining vegetables from the enviromental garden and bought seasonal fruit for snack. Bethany brought in a sheaf of wheat and talked about how it is made into flour. 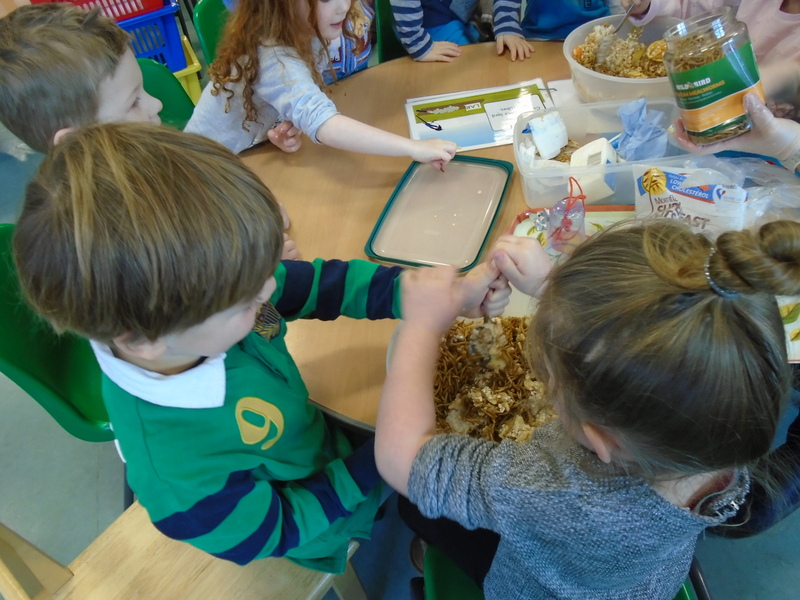 We visited the baker’s shop to buy different types of bread and then baked our own bread in Nursery and served it for snack. 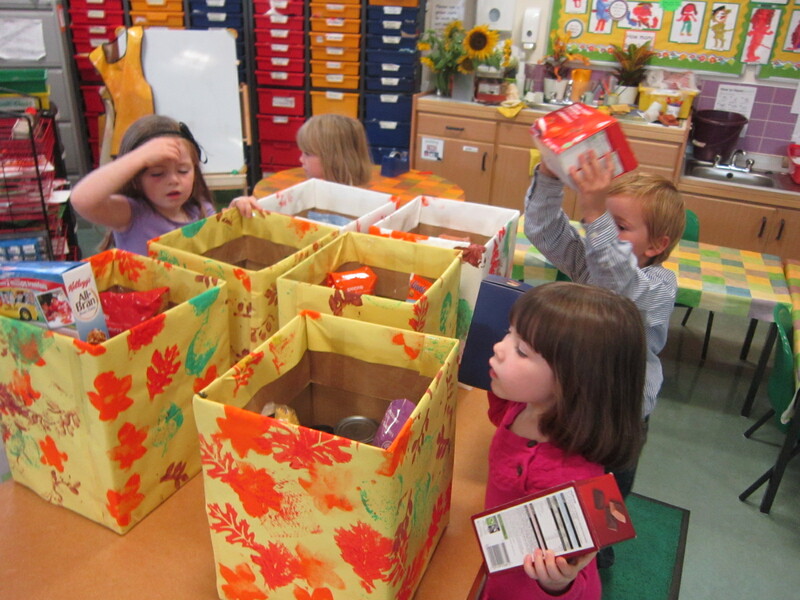 Each child brought in harvest donations and they decorated gift boxes, filled them with food and delivered them to the elderly. 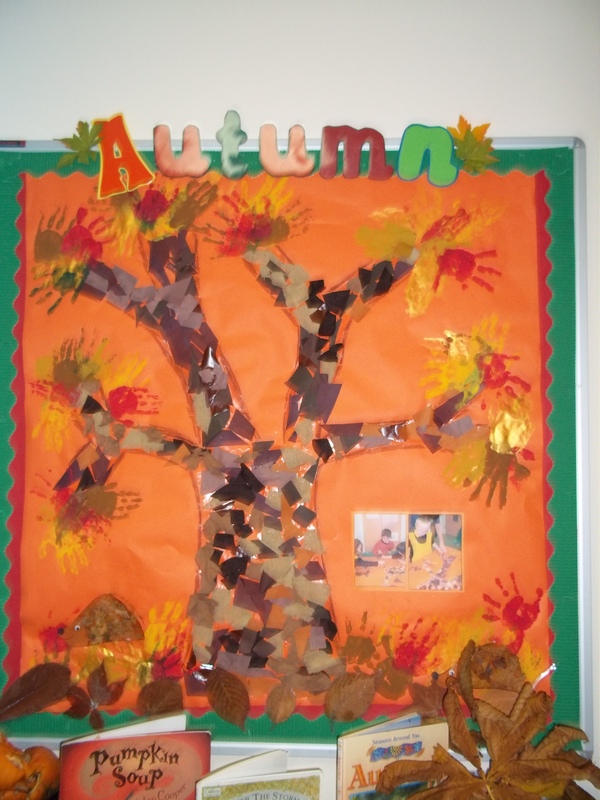 Many children brought in leaves, acorns, conkers and twigs and used them to create their own Autumn collage pictures. 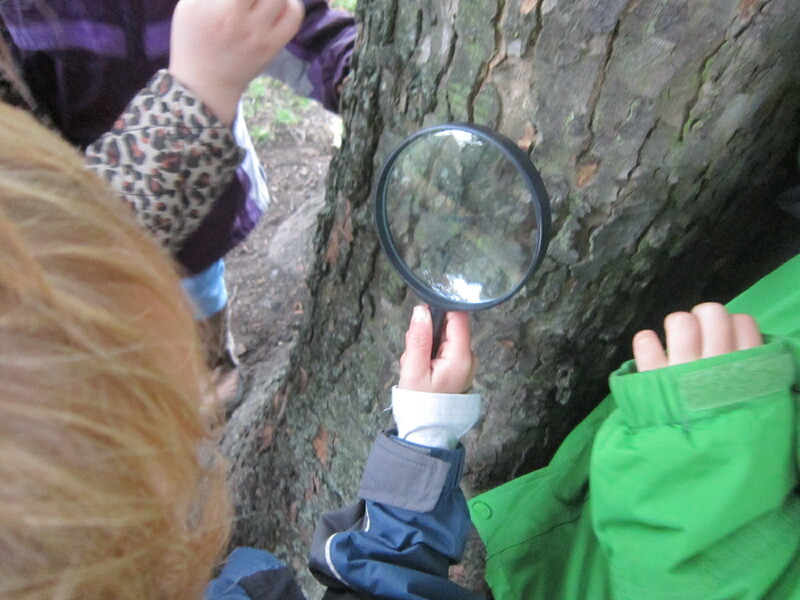 They loved using magnifying glasses to look at the leaves and the bark of the trees outdoors. 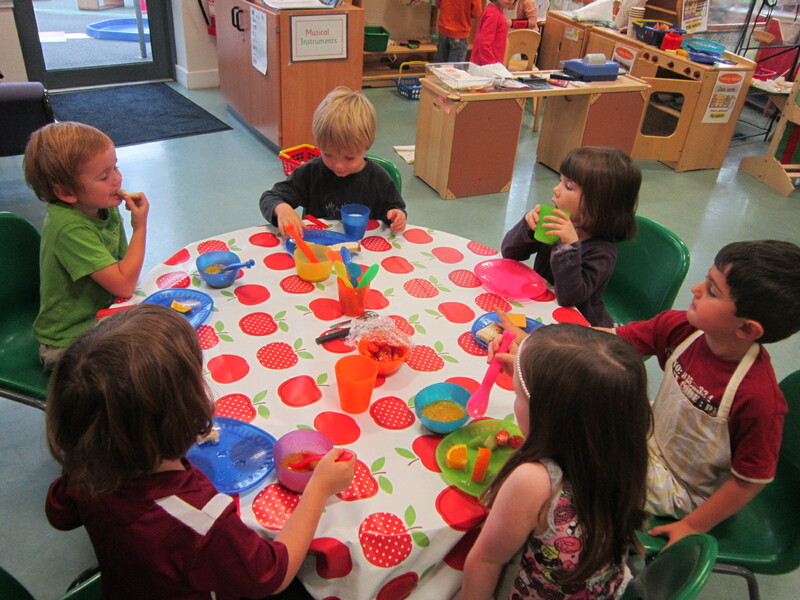 The Nursery children have had a really sucessful health week. 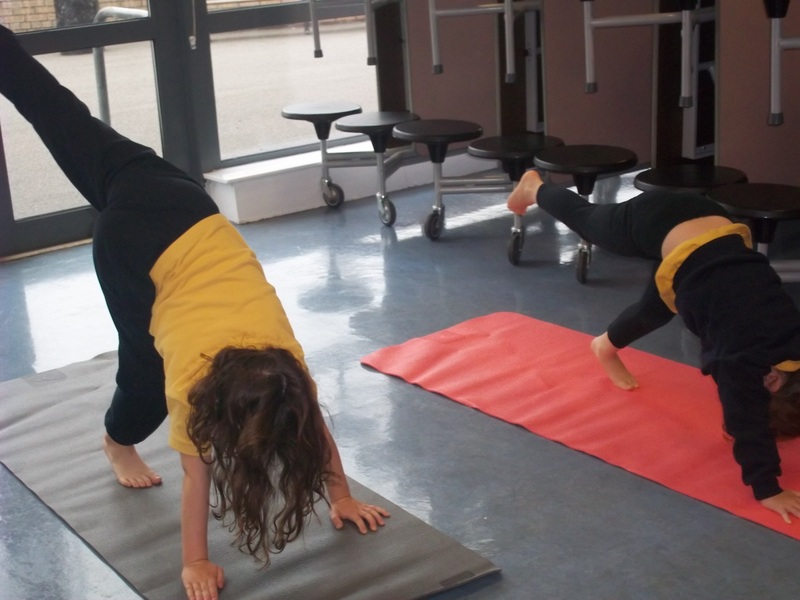 As well as our daily “Wake and Shake” outdoors, the morning class took part in animal yoga, parachute games and dance. 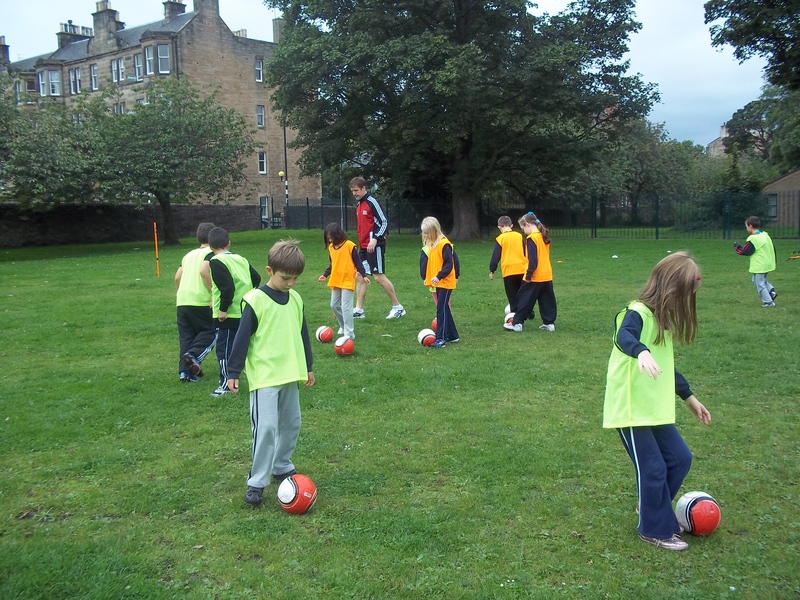 The afternoon class enjoyed a soccer skills session, music and movement activities and ball games outdoors. 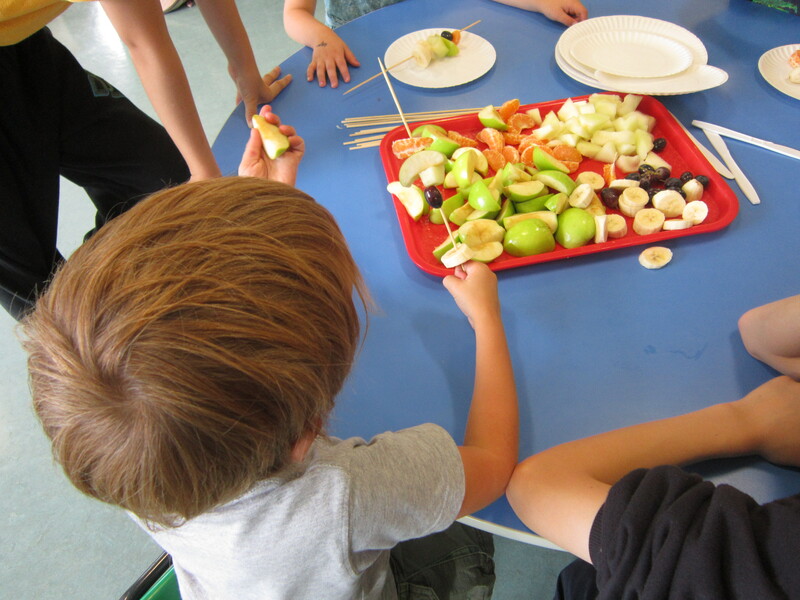 The children sang songs about healthy foods and enjoyed making fruit smoothies, fruit kebabs and courgette and parmesan muffins, using the courgettes they had grown in the environmental garden. 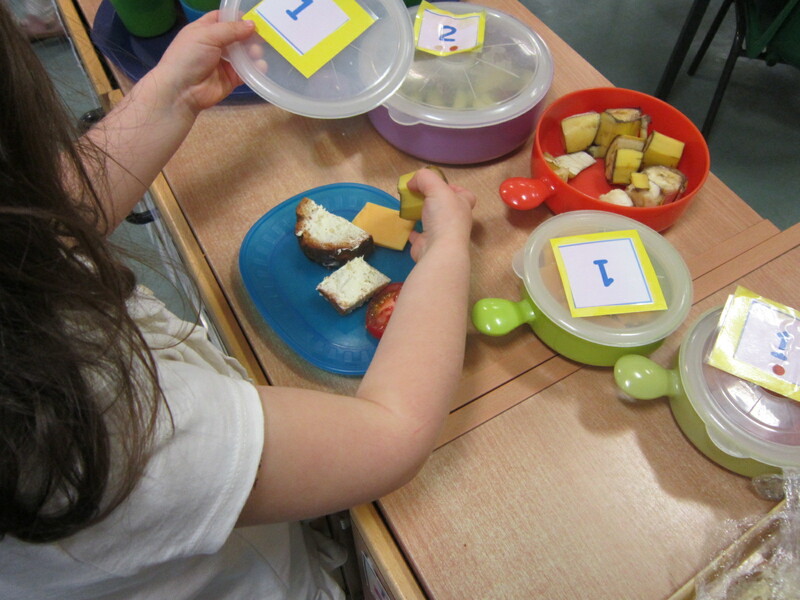 They then used collage materials to make plates of healthy food. 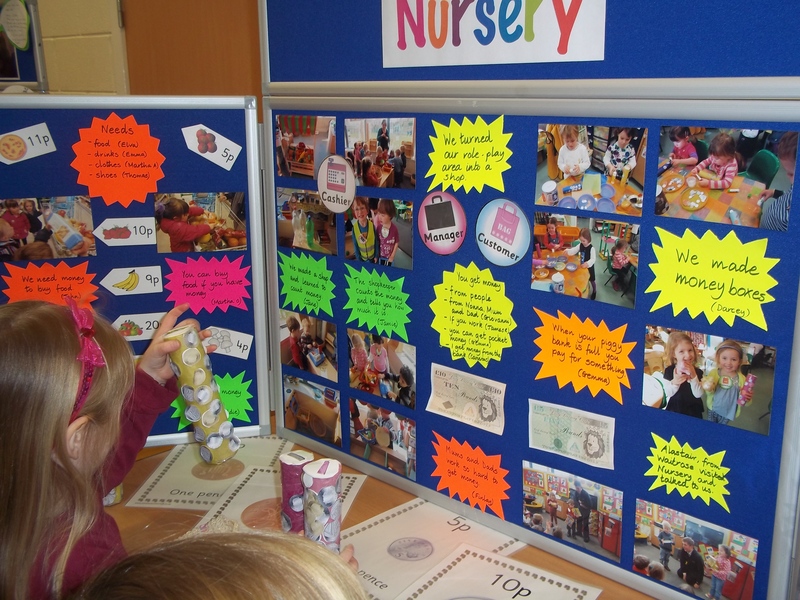 We have had another busy term in the Nursery with many celebrations. 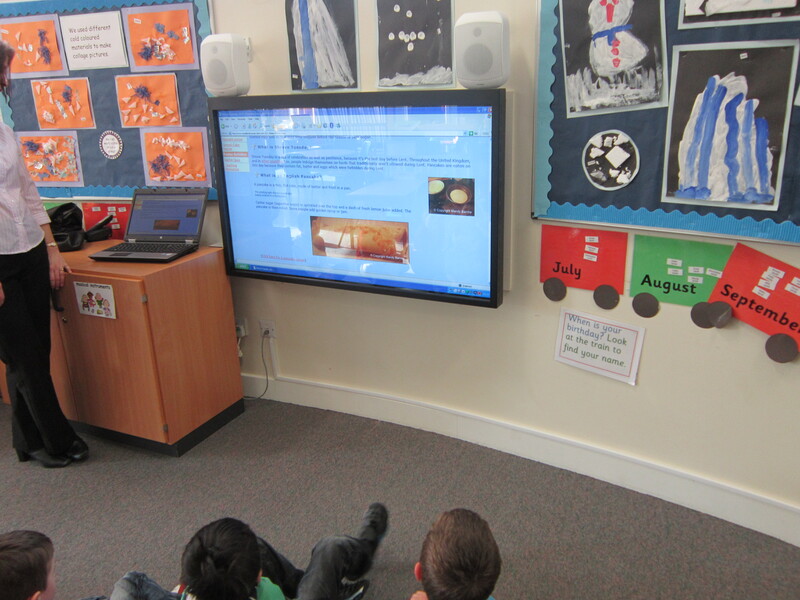 In response to the children’s interests we organised a Space topic and have been amazed at their developing knowledge. 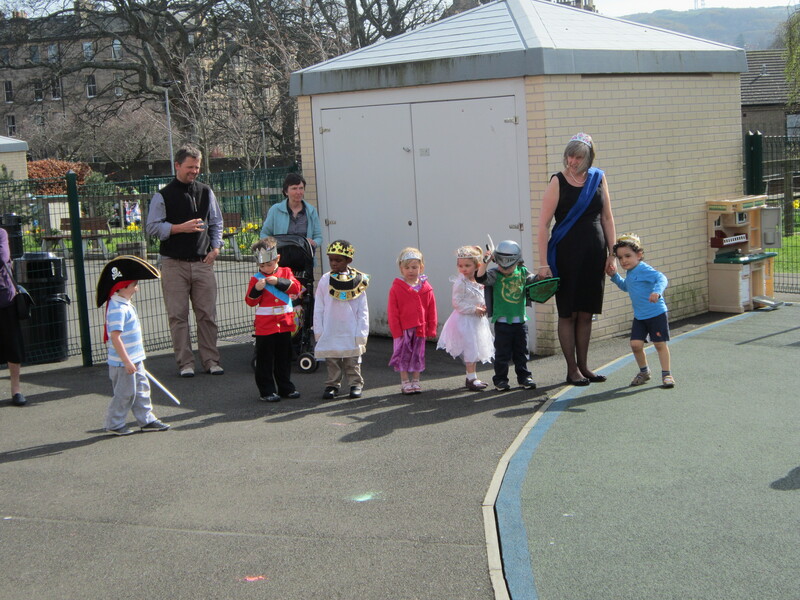 To celebrate World Book Day, we came to Nursery dressed as our favourite book characters. We read many books by our favourite authors and brought our favourite books from home to share with our friends. 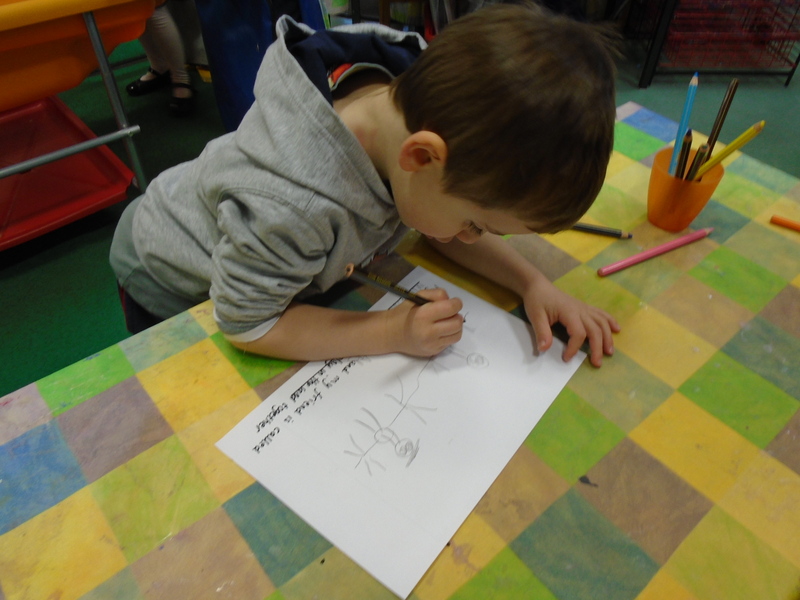 The morning class became authors and illustrators and we wrote group stories. 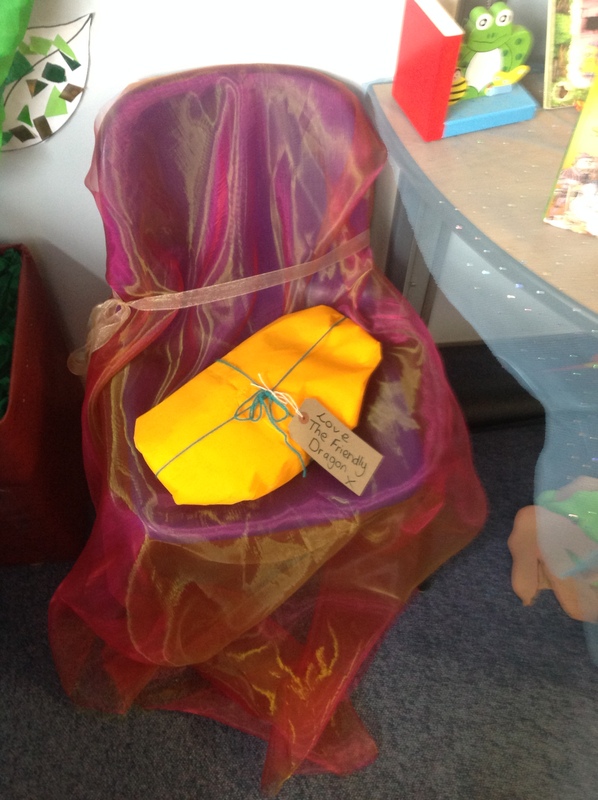 The afternoon class enjoyed a story session at Morningside Library and were delighted to receive their Book Bug gift bags. 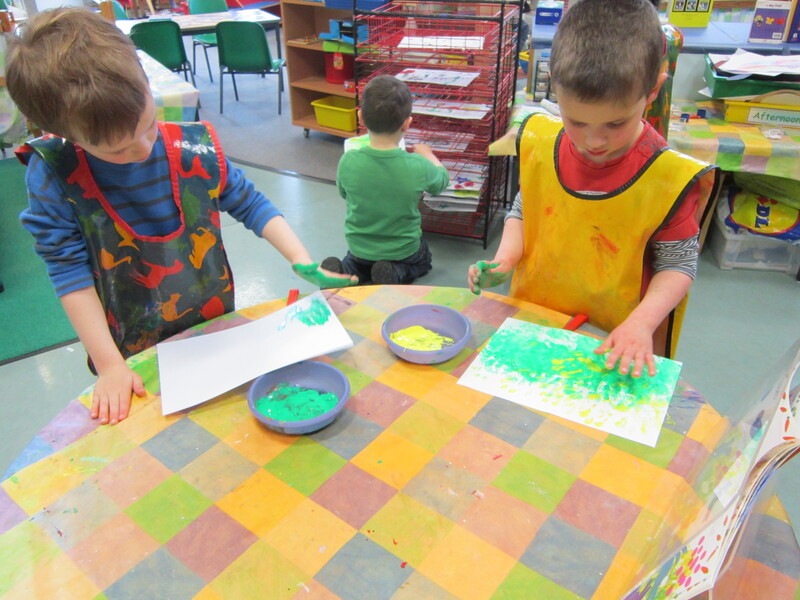 We celebrated St David’s Day by making Welsh griddle cakes and by painting daffodils. 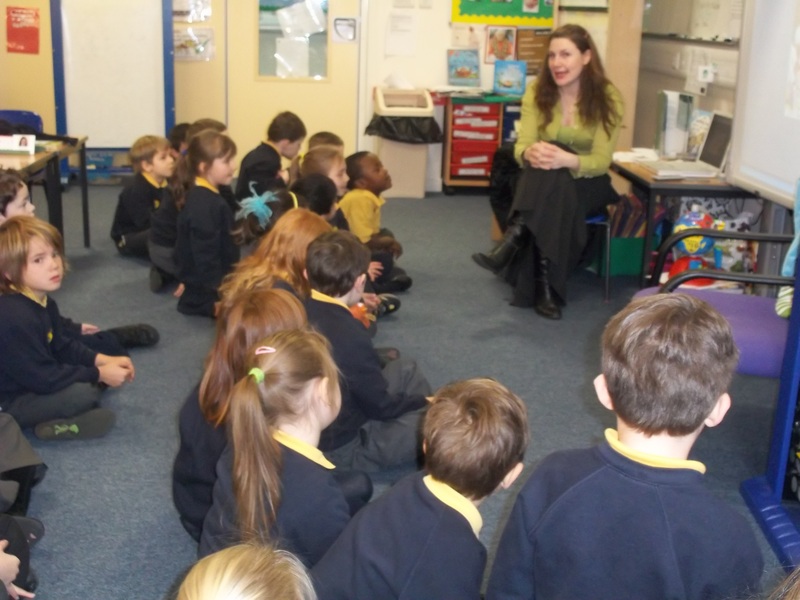 Mrs Wright, Miriam’s Mum, taught the morning class to sing in Welsh and talked about Welsh traditions. 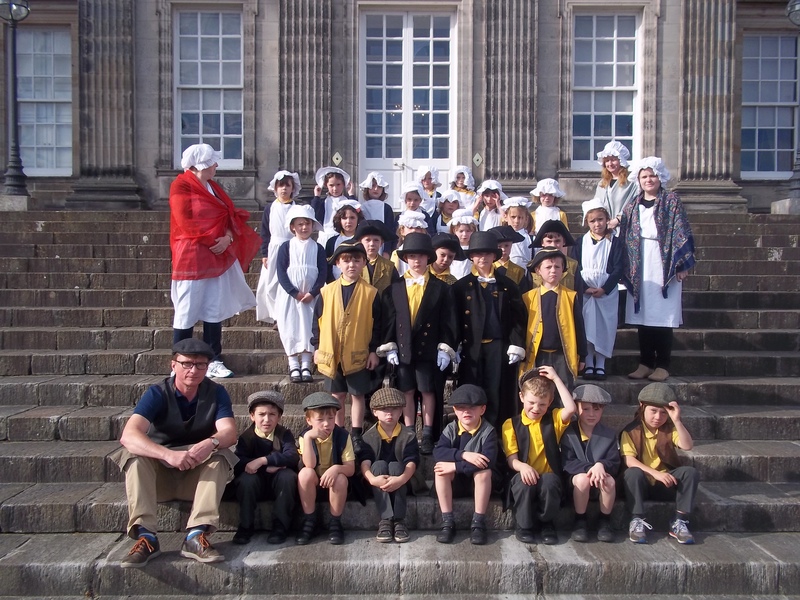 Miriam wore her Welsh costume and the children had fun trying on the shawl, hat etc. that Mrs Wright had worn on St David’s Day when she was a child. 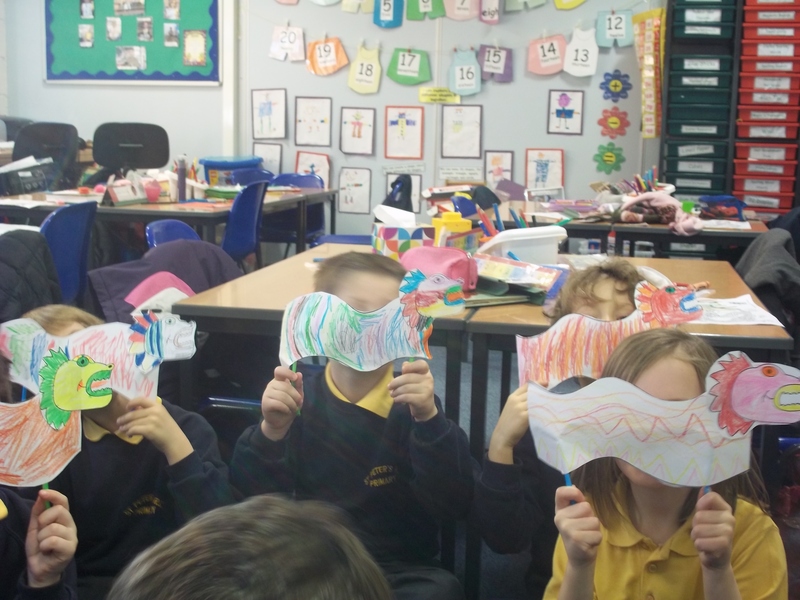 To celebrate Chinese New Year the children made fans, lanterns and hats, learned to count in Chinese, as well as writing Chinese numbers, singing songs about China and dressing in Chinese costumes. We all enjoyed a delicious Chinese meal and had fun using our chopsticks. 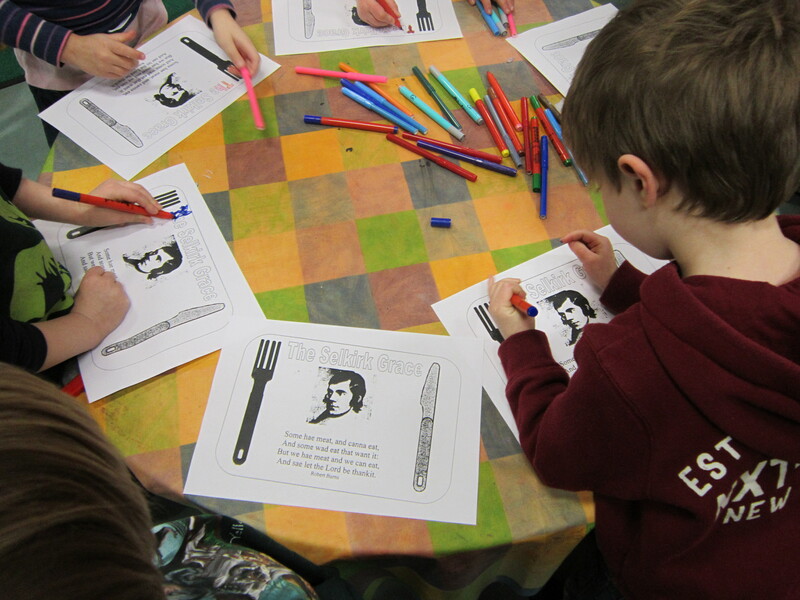 For Burns’ Day we learned a selection of Scottish songs and simple Burns’ poems and we enjoyed haggis, neeps, tatties and shortbread during our mini Burns’ supper. The morning class sang a song at the school assembly. 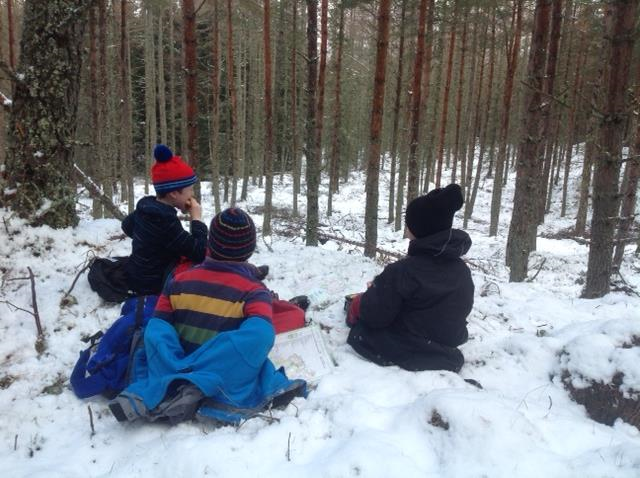 We had fun outdoors exploring winter weather and looking at seasonal changes in nature. 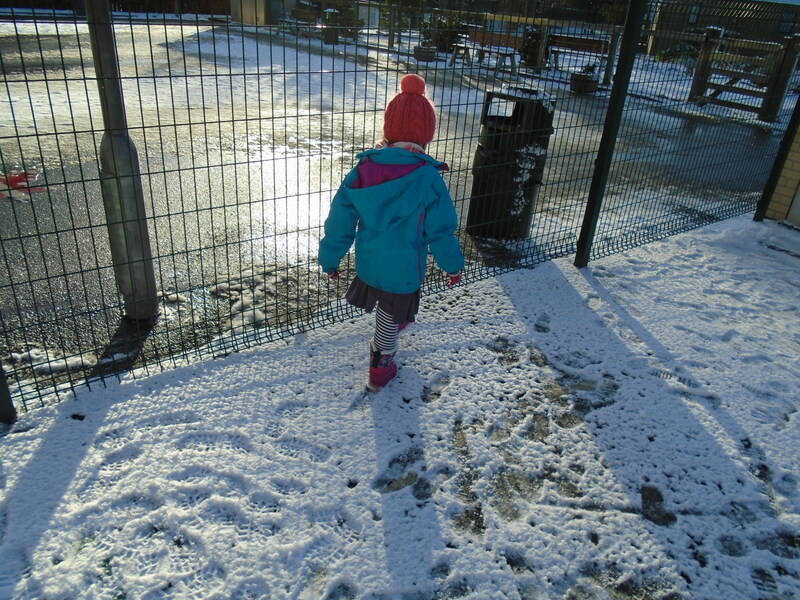 We enjoyed a winter walk, recorded the temperature each day, made footprints in the snow, collected ice and watched it melt and created winter pictures. 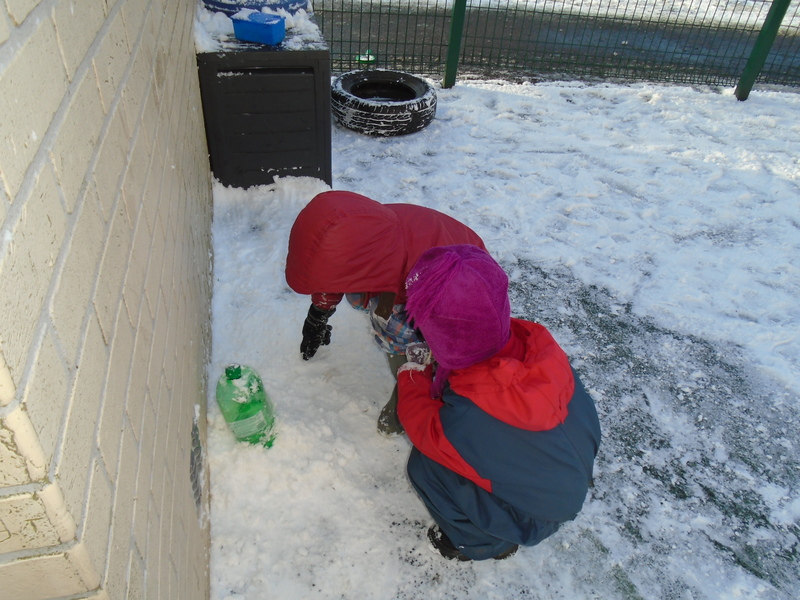 The children were keen to help feed the birds during winter. They made bird food and hung it on the trees in the Nursery garden. We went to the Little Sisters of the Poor to perform our Christmas Nativity. 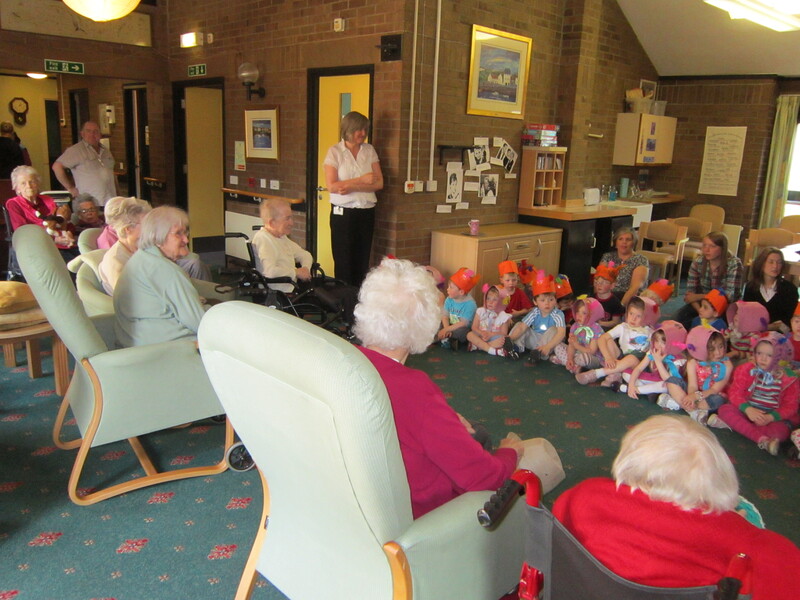 The residents enjoyed our performance and the children were happy to receive a festive gift from them! 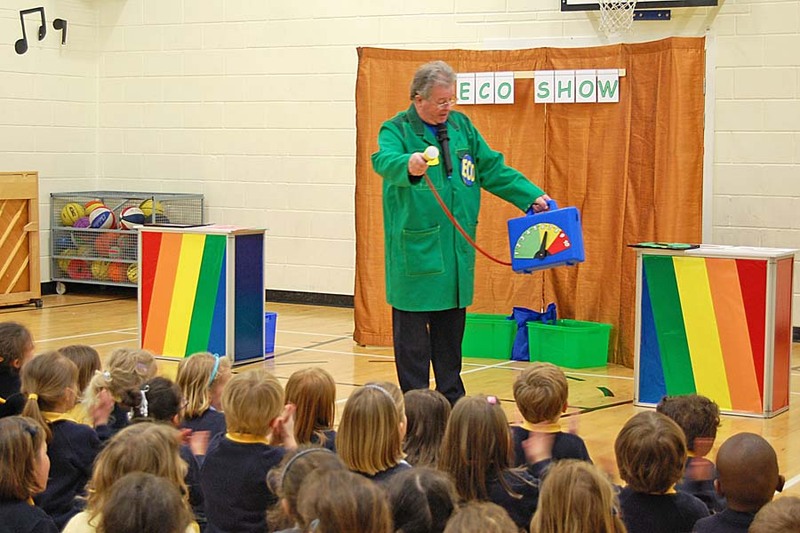 We have been busy during Financial Education Week. 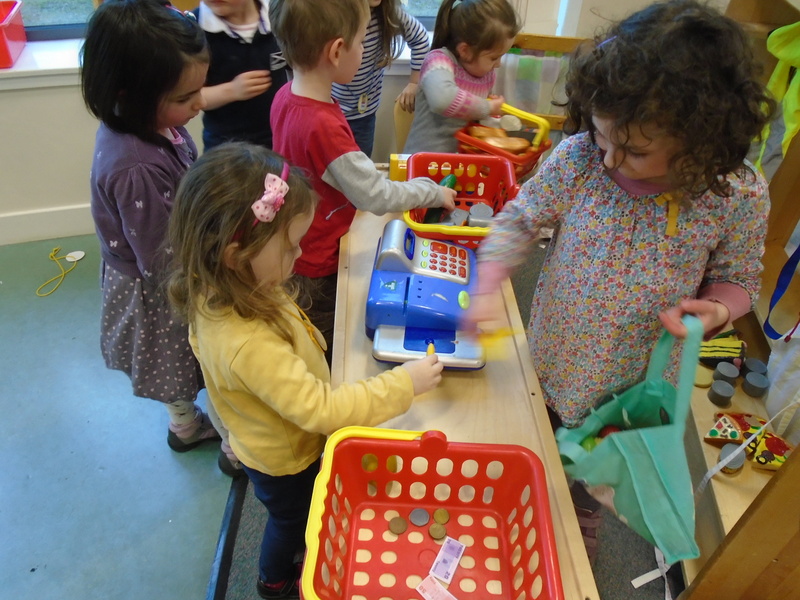 We have been playing shops and have visited Waitrose to get supplies for our snacks. 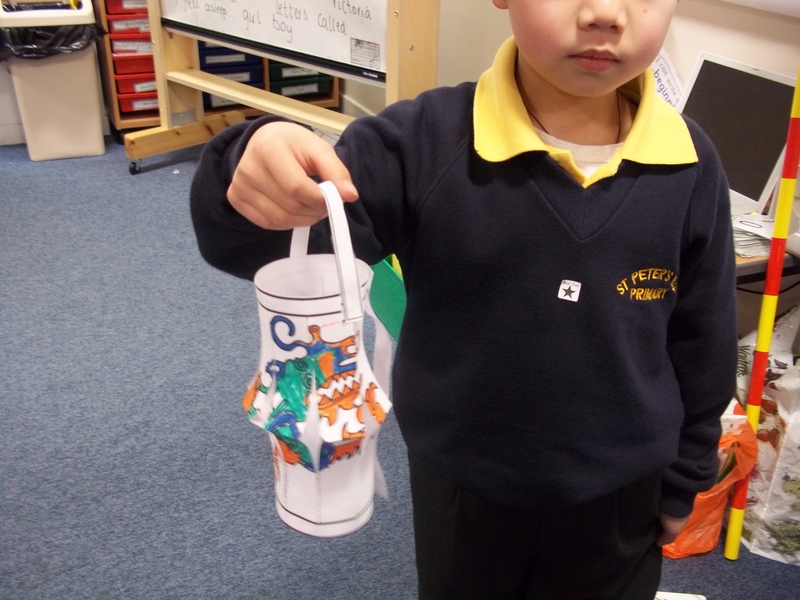 We have been making piggy banks to help us save. 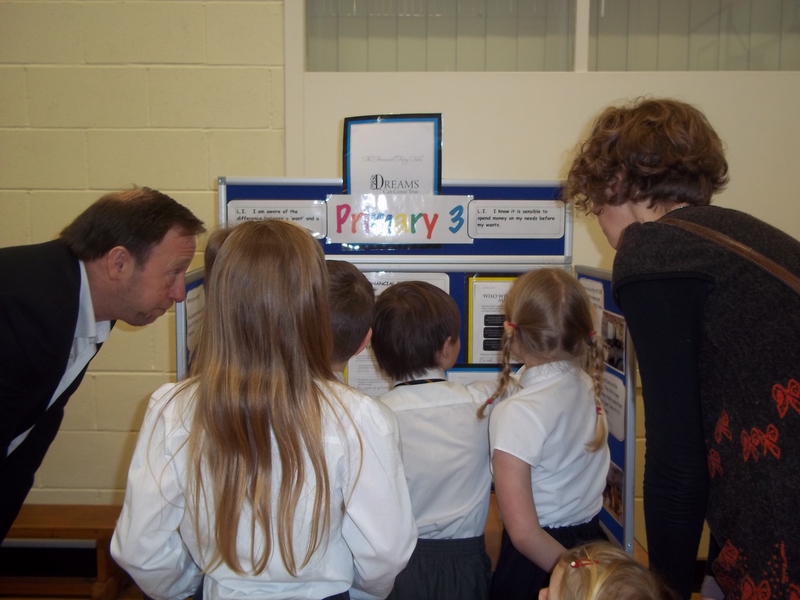 We took our display to the hall and showed our parents our work. After being out in the dark on Bonfire Night, the children were excited about fireworks. In Nursery, we made firework pictures and enjoyed watching a firework display on our Promethean Board. 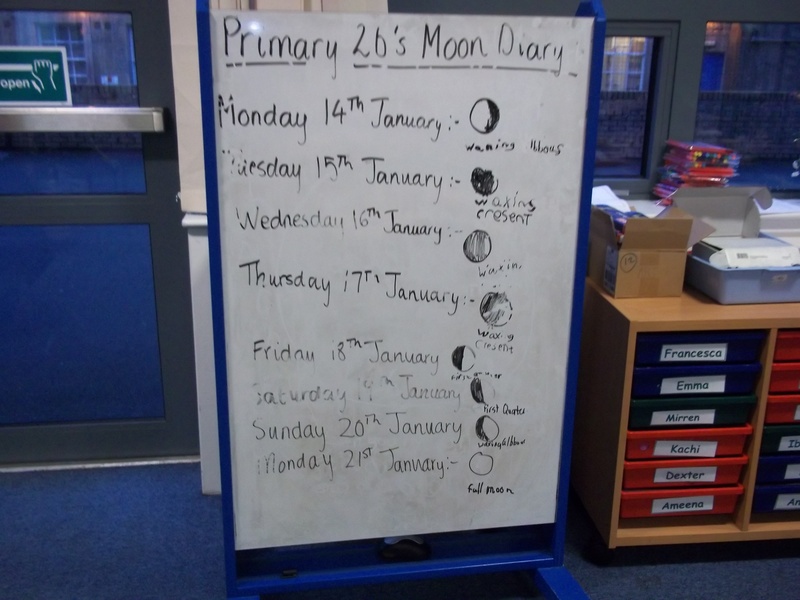 The children are aware of the differences between night and day. 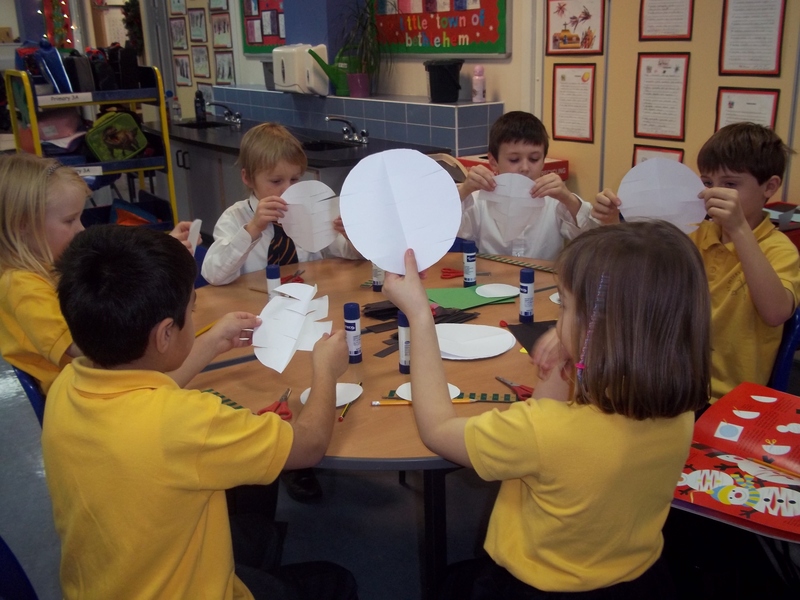 They looked at sources of light and enjoyed using shapes to make houses with the lights on at night. 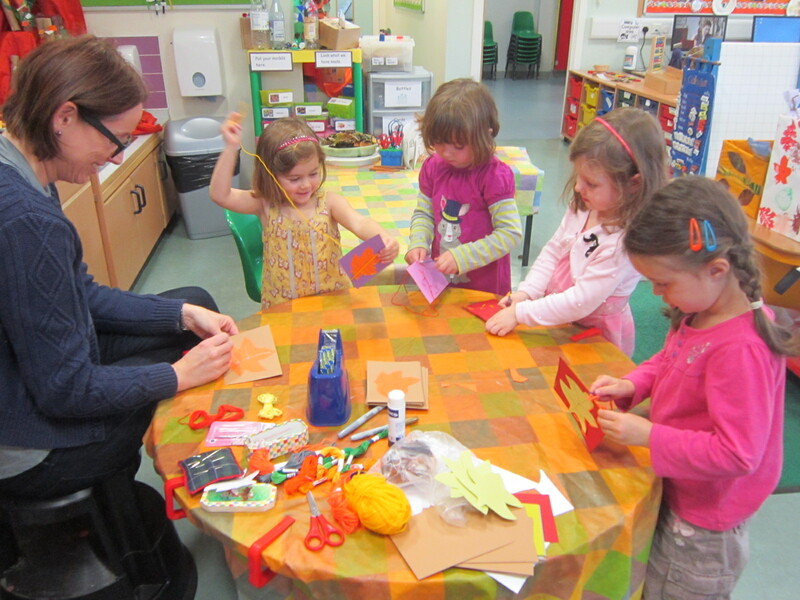 We had fun in Nursery at Hallowe’en. 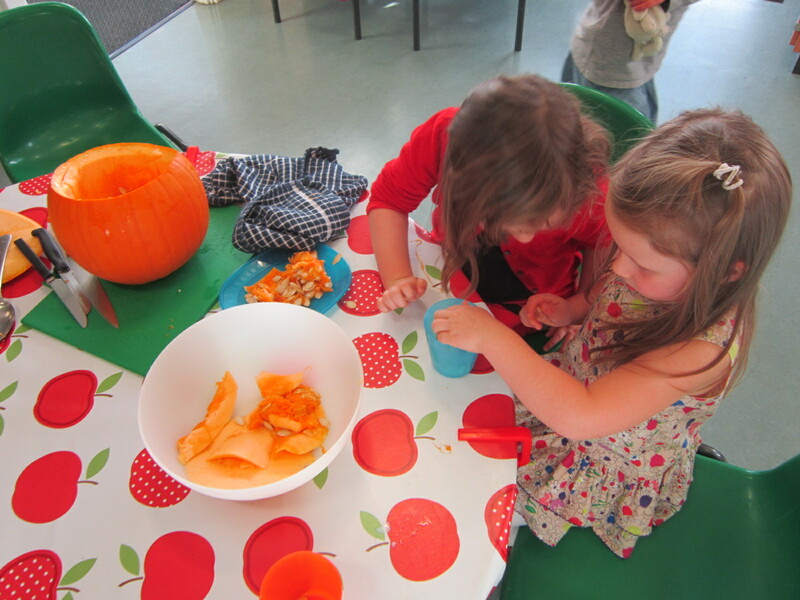 The children made up spells, carved pumpkin lanterns, baked spooky cookies, dressed up and enjoyed dookin’ for apples at our Hallowe’en party. 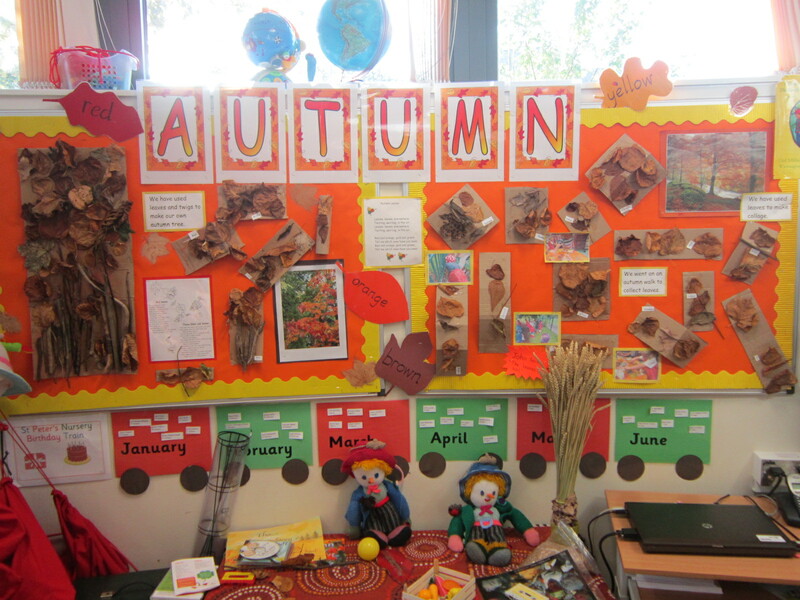 The children went on an Autumn Walk to look at the seasonal changes. 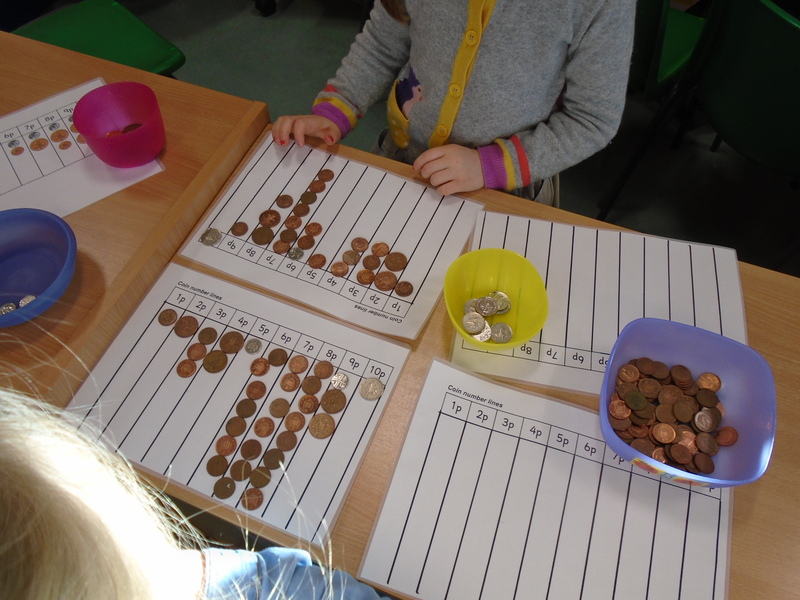 They collected leaves, conkers, pine cones and acorns and used these in sorting and matching, art and craft and role-play. 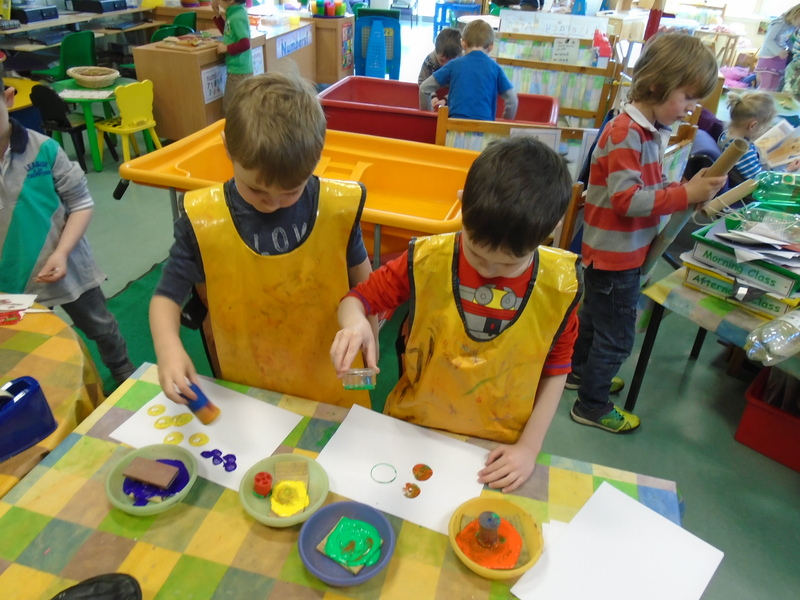 They identified the many colours of leaves and created their own autumn trees. 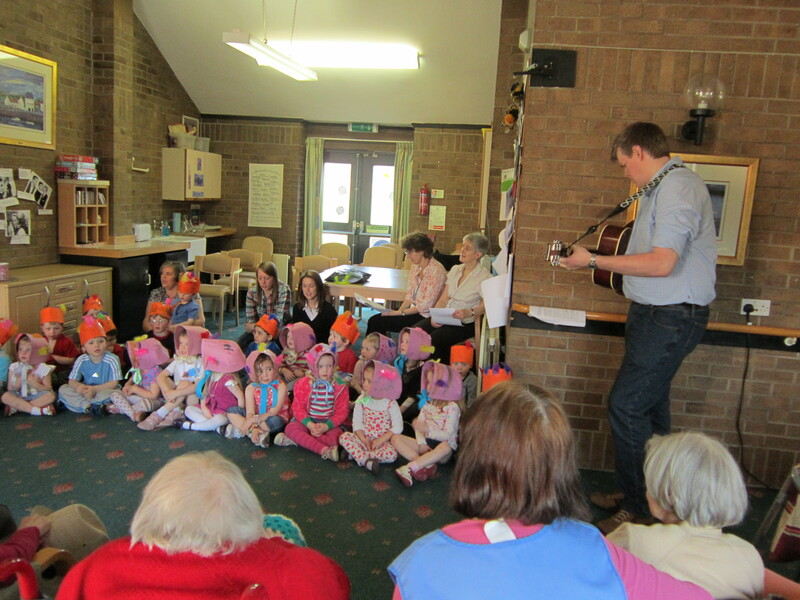 They enjoyed learning new songs about Autumn. 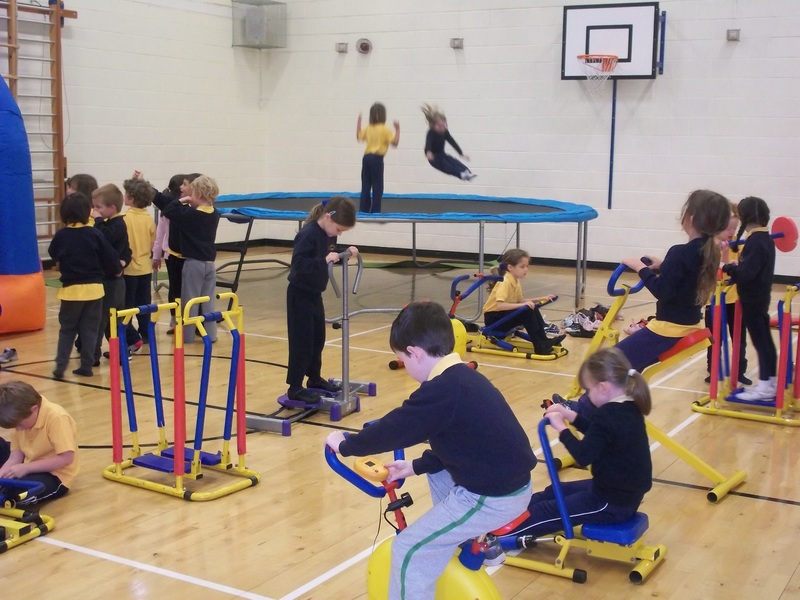 The children really enjoyed Health Week and were particularly excited by the micro gym equipment. 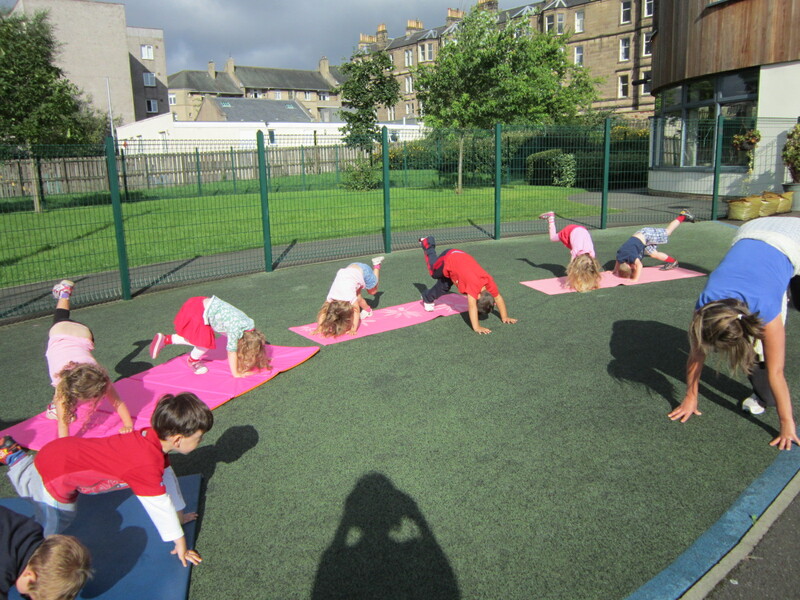 One of our parents, Mrs Skelly, led an animal yoga session outdoors. 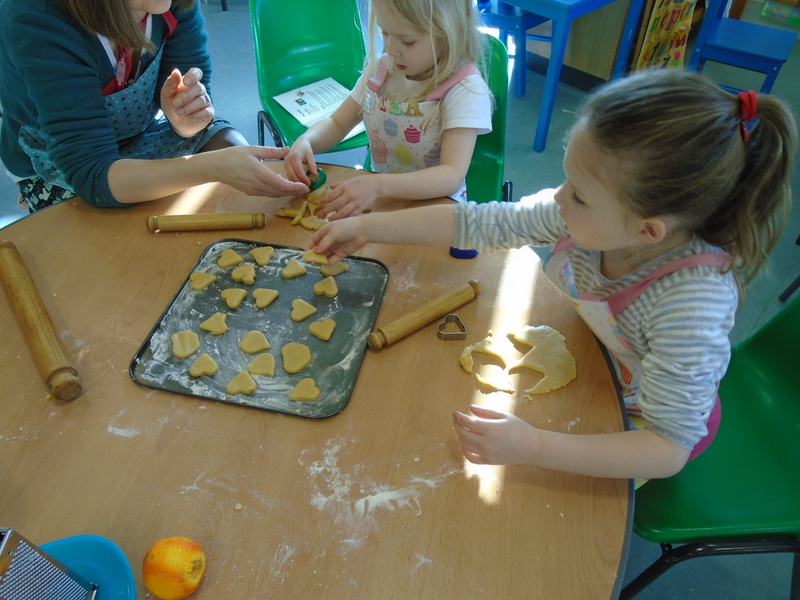 Another parent, Mrs Sladen, talked to the children about healthy eating and they all baked healthy wholemeal buns. 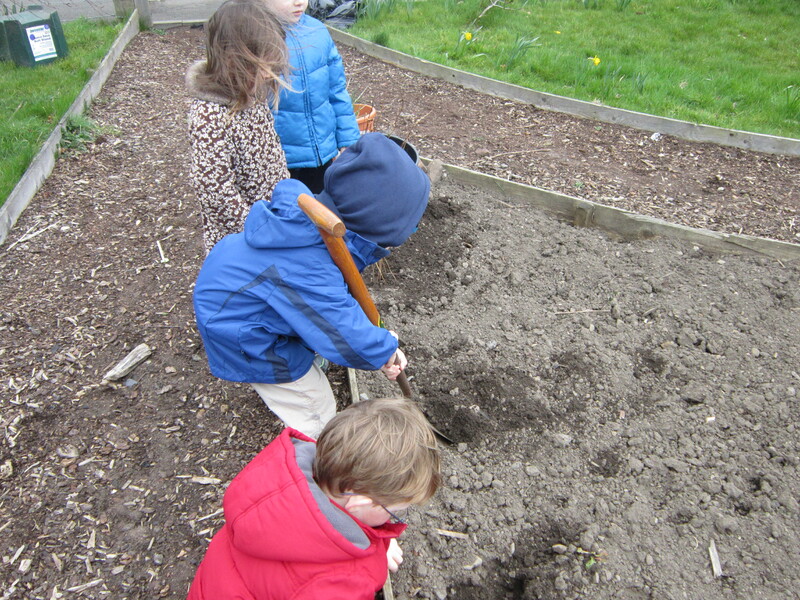 The children dug potatoes and vegetables that they had grown in the environmental garden and we cooked these for snack. 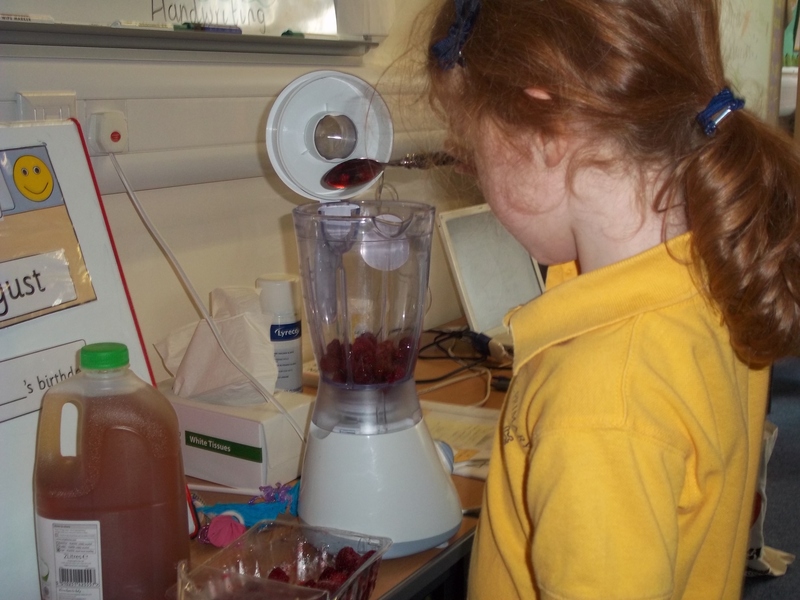 We also picked our blueberries and used these when making fruit smoothies, fruit kebabs and fruit salad. 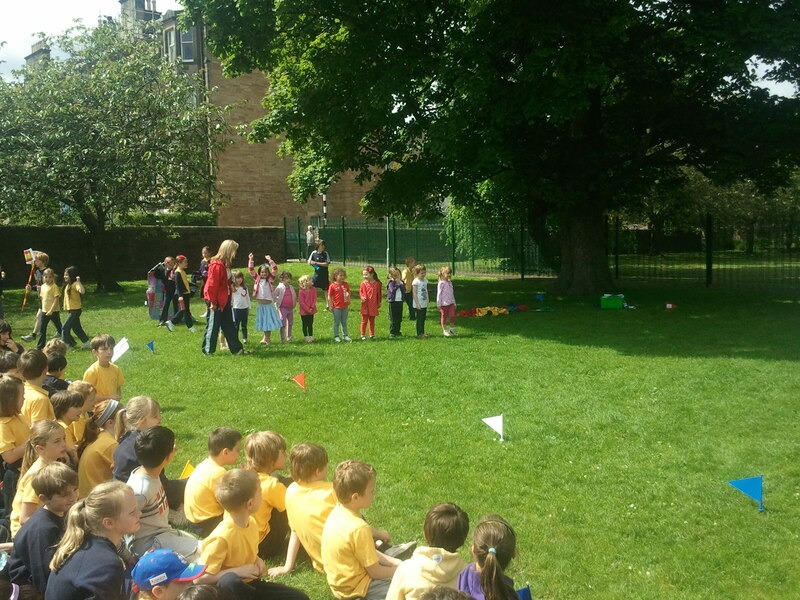 We joined the children in the school to take part in “St Peter’s Olympics”. 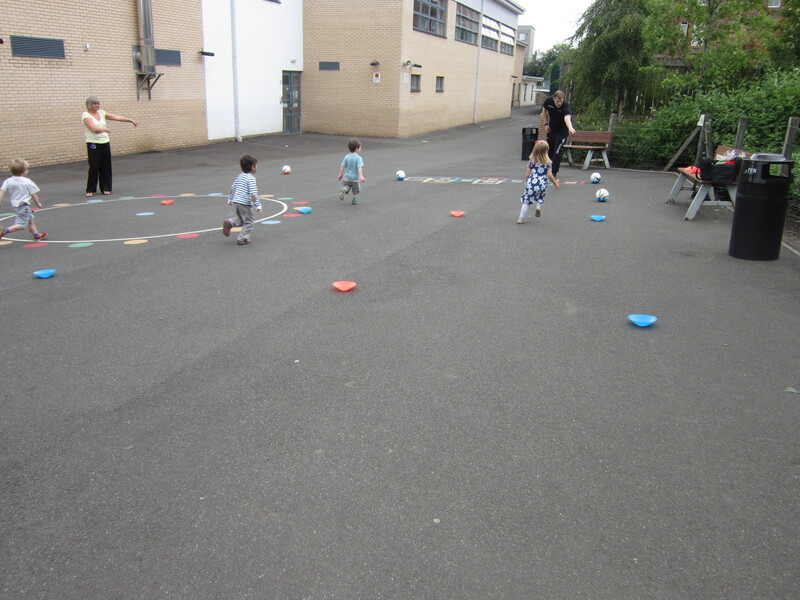 The Nursery children were Team GB and wore sports clothes in red, white and blue. 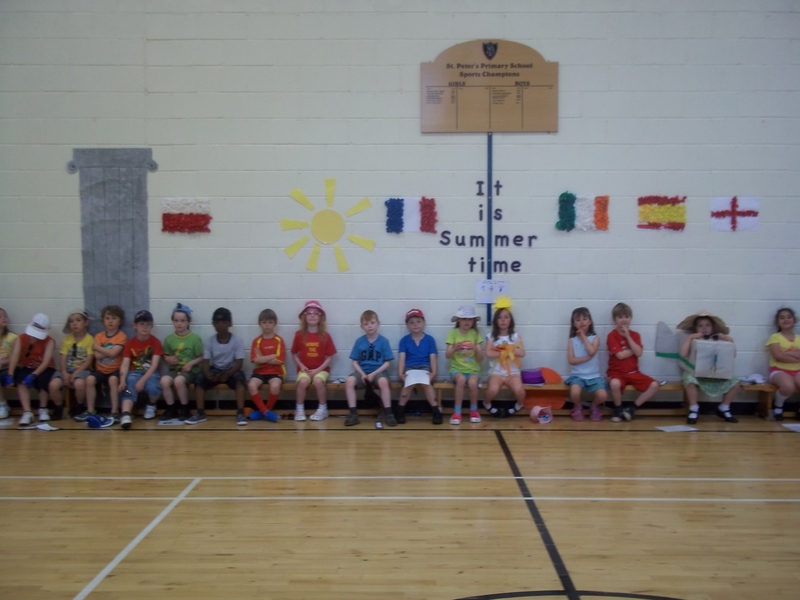 The morning class took part in the parade of countries and the Opening Ceremony , before taking part in their potted sports and sprints. 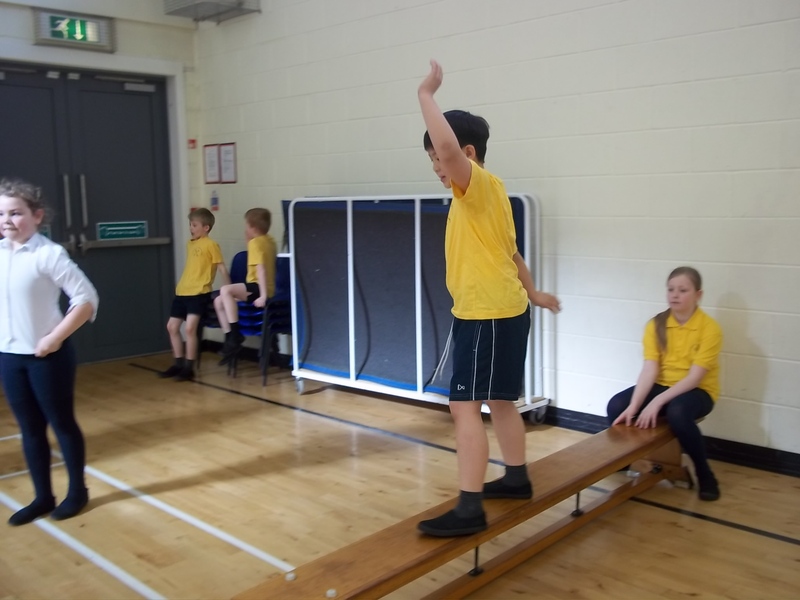 The afternoon class enjoyed their sports and took part in the Closing Ceremony, where they performed a song and workout for the very appreciative audience. 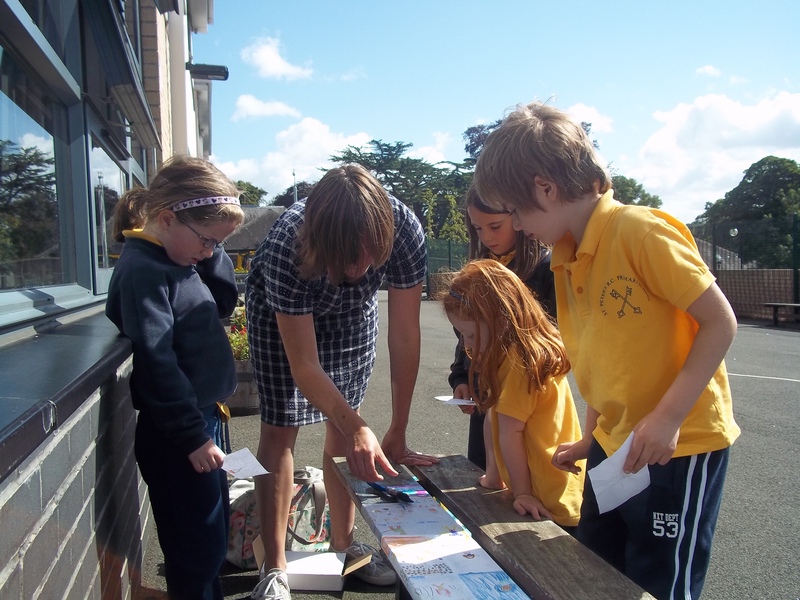 Thank you to all families who joined us for a picnic on Thursday. 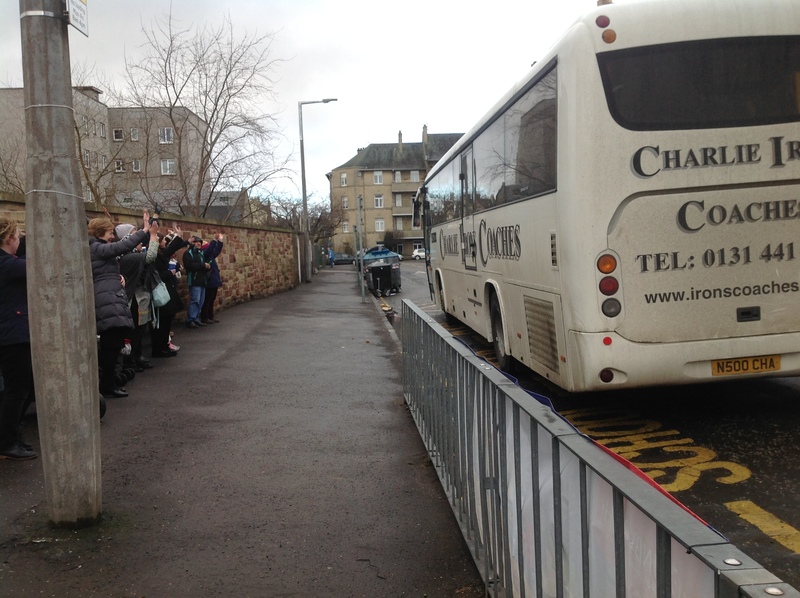 A big thank you to everyone who helped us on our outing to East Links Family Park. 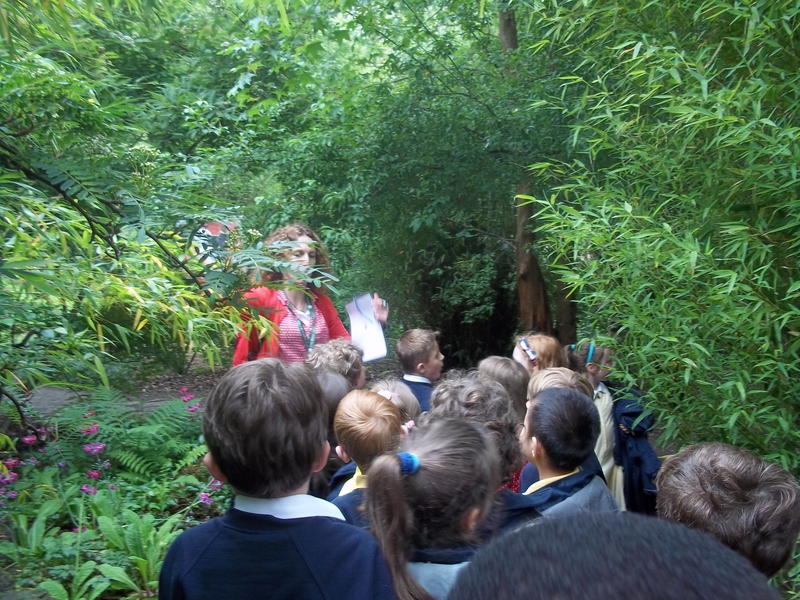 The children were excited, the rain stayed away until we got back and we all had a great day. 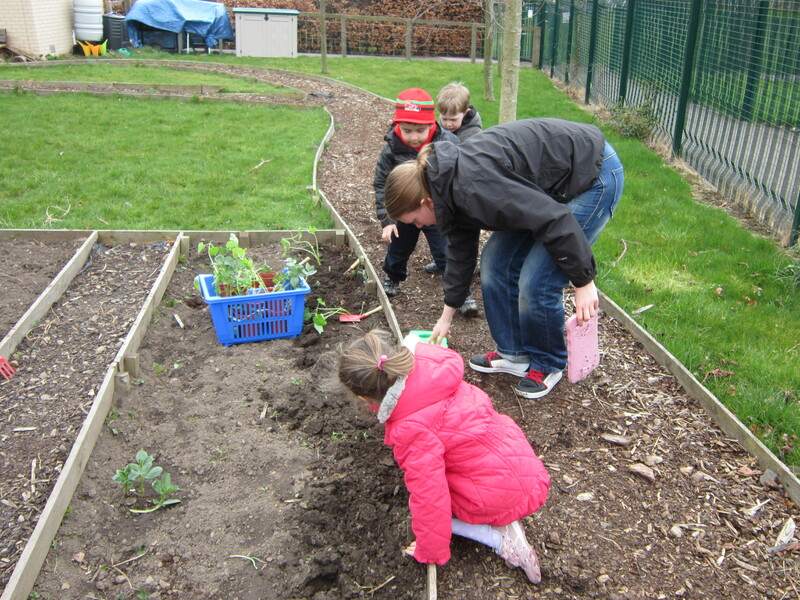 The children have been avid gardeners in the past few weeks. 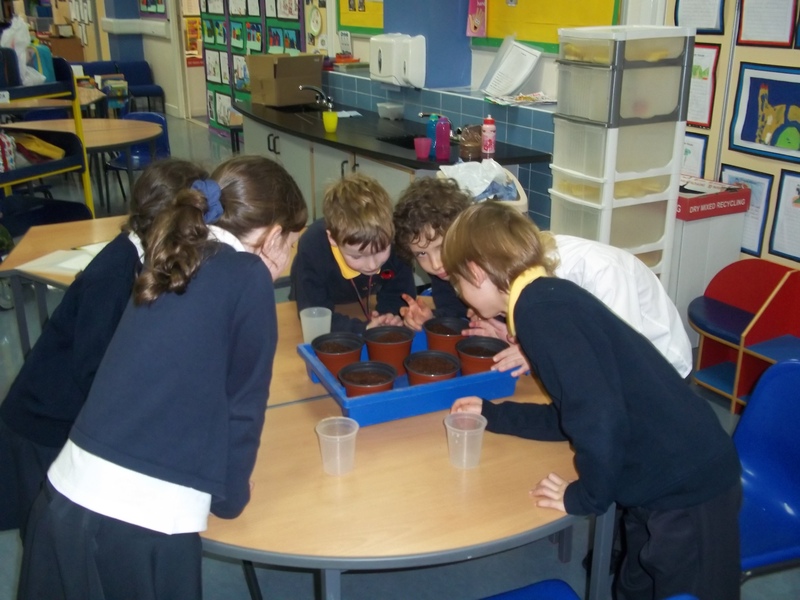 They planted flower and vegetable seeds indoors and were delighted to see their plants start to grow. 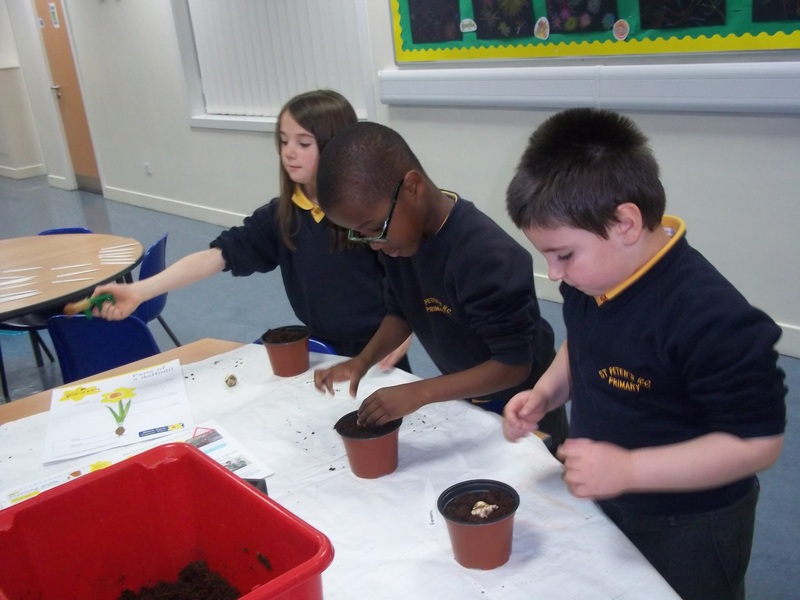 They have dug, weeded, planted and sown seeds in the environmental garden and have cared for the flowers growing in the pots in our Nursery garden. 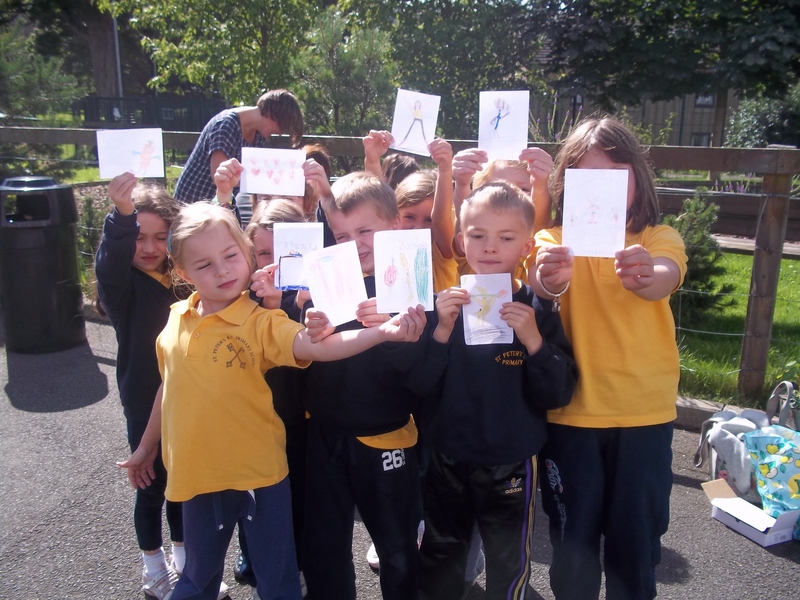 The children learned about seasonal changes that take place in Spring. 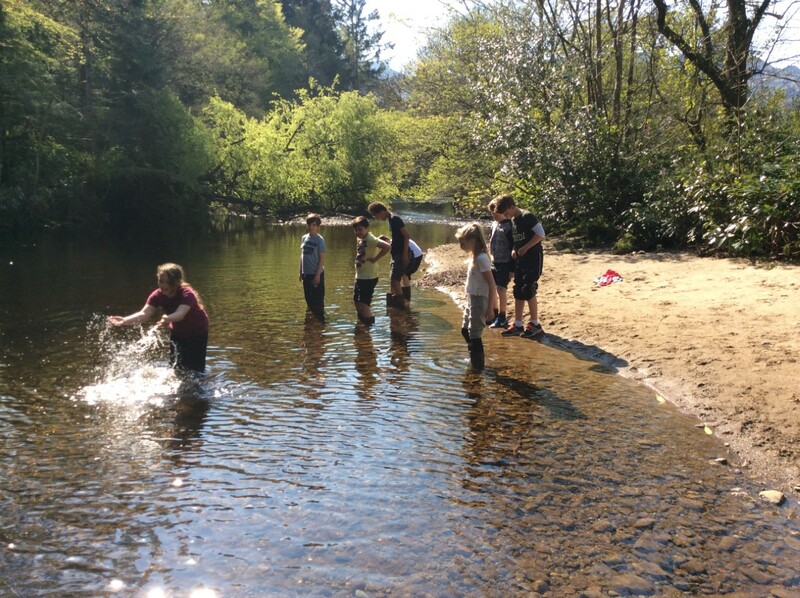 They enjoyed watching tadpoles develop into frogs and learned about other animals that are born in Spring. 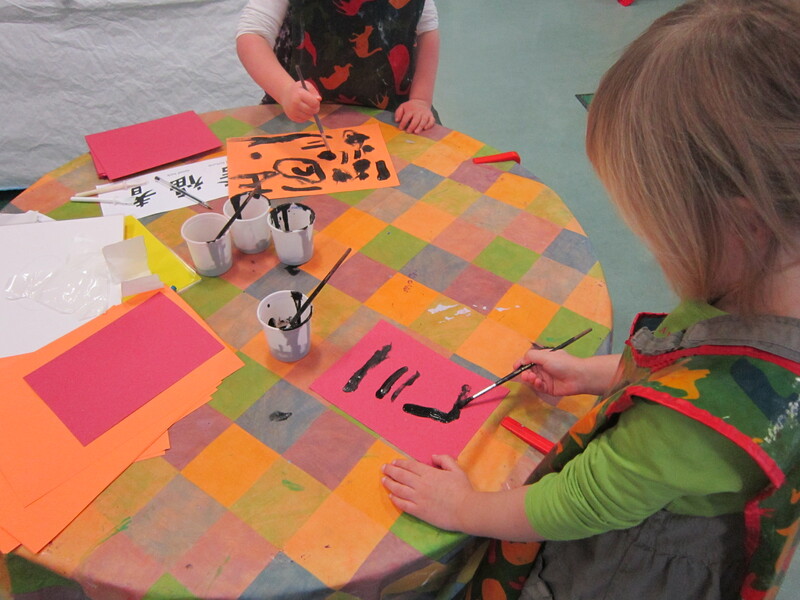 They finger painted beautiful flowers and fields of rabbits, made collage lambs and printed ducks. 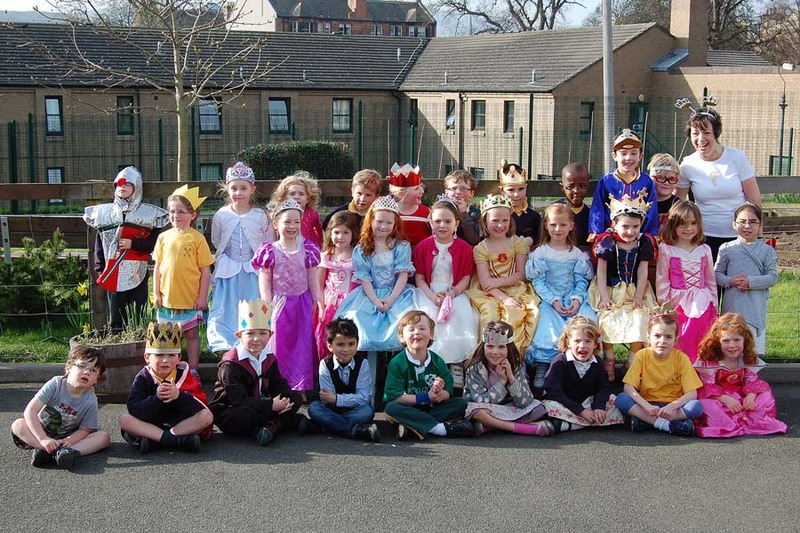 We all dressed as kings, queens, princes and princesses and took part in “The Diamond Jubilee Fun Run for S.C.I.A.F. 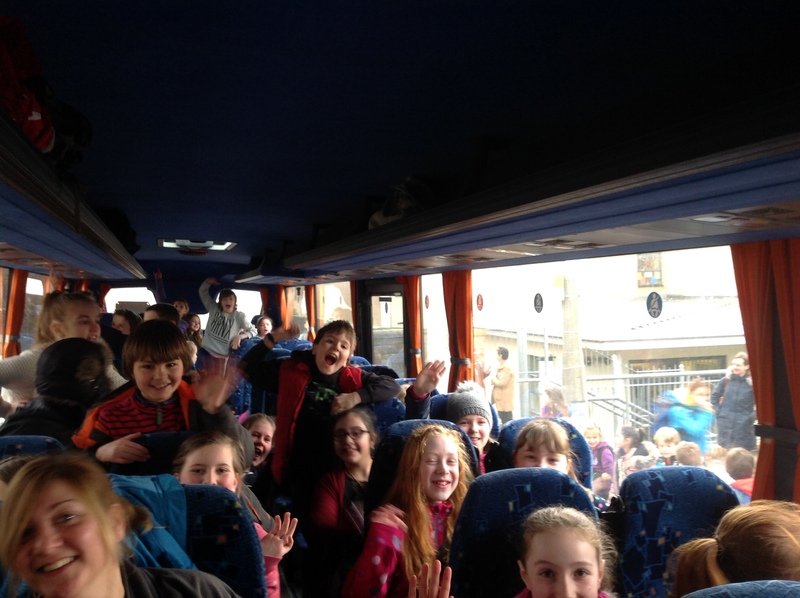 The children had a great day and were delighted with the cheers and support from their parents and families. 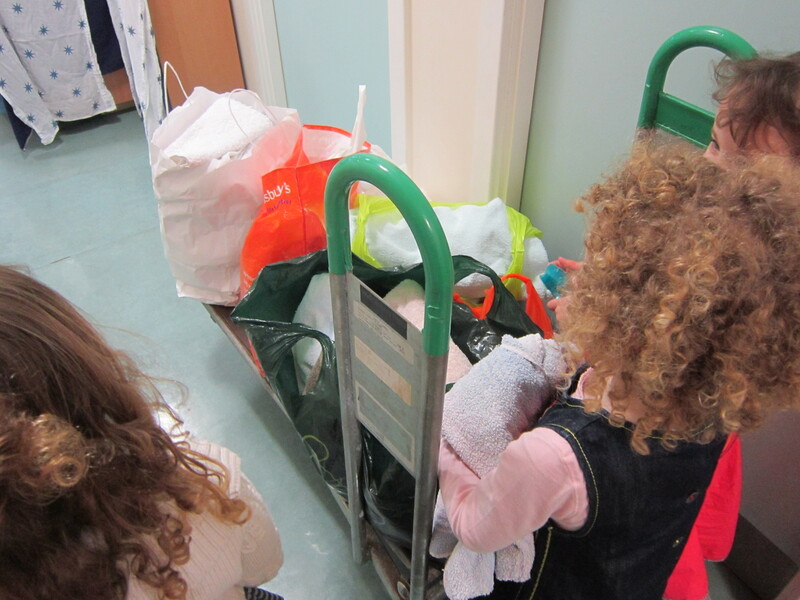 The Nursery children helped St Catherine’s Convent Homeless Project which provides a hot shower and a meal for those in need. 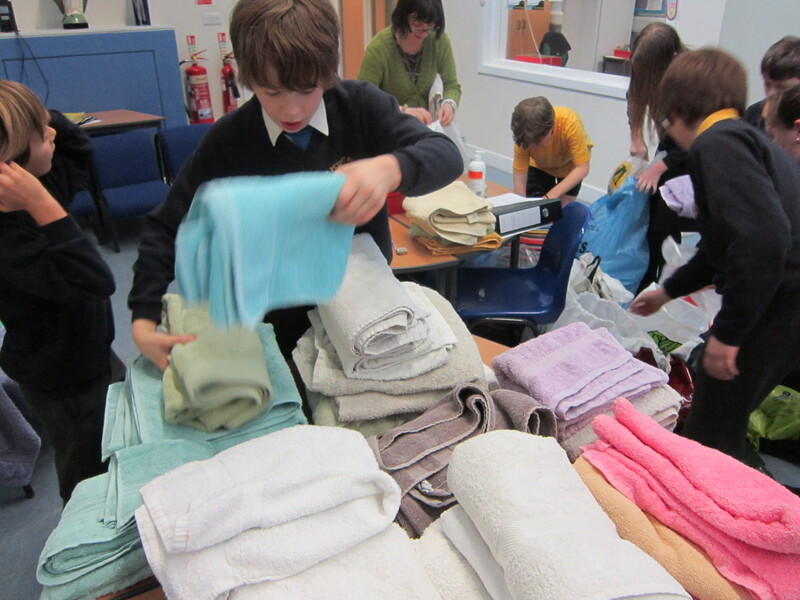 The children brought in old bath or hand towels, soap, shower gel etc to support this good cause. 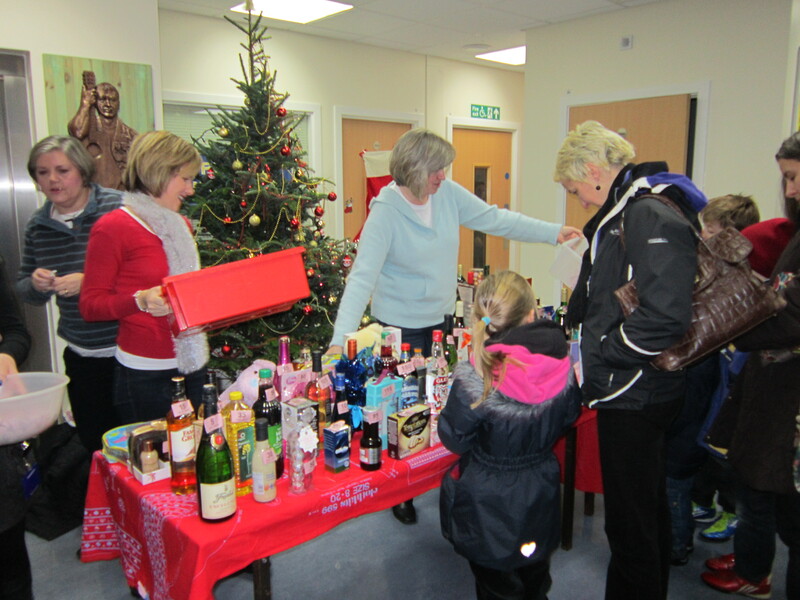 Thanks to all families for their generosity. 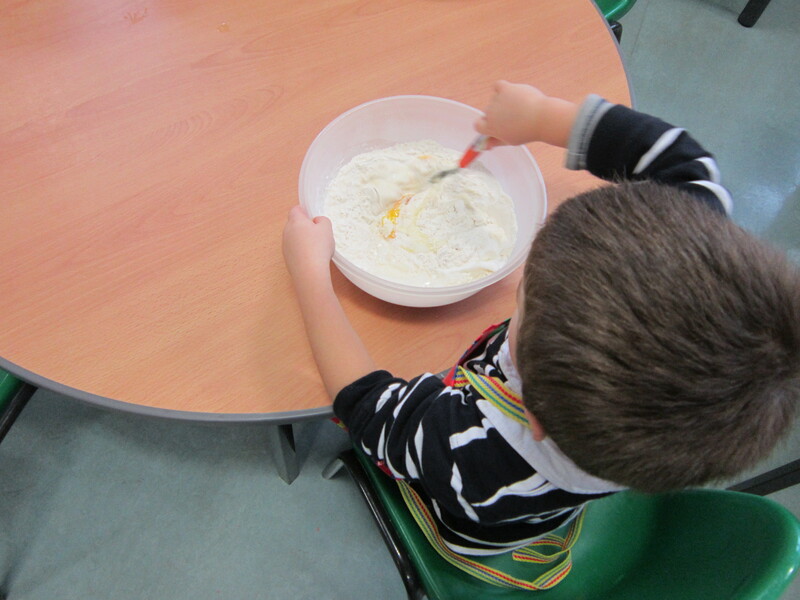 On Shrove Tuesday the children learned how to make pancakes and we served them for snack. They made collage pancakes with their favourite toppings and enjoyed listening to the stories of “The Big Pancake” and “Mr Wolf’s Pancake”. 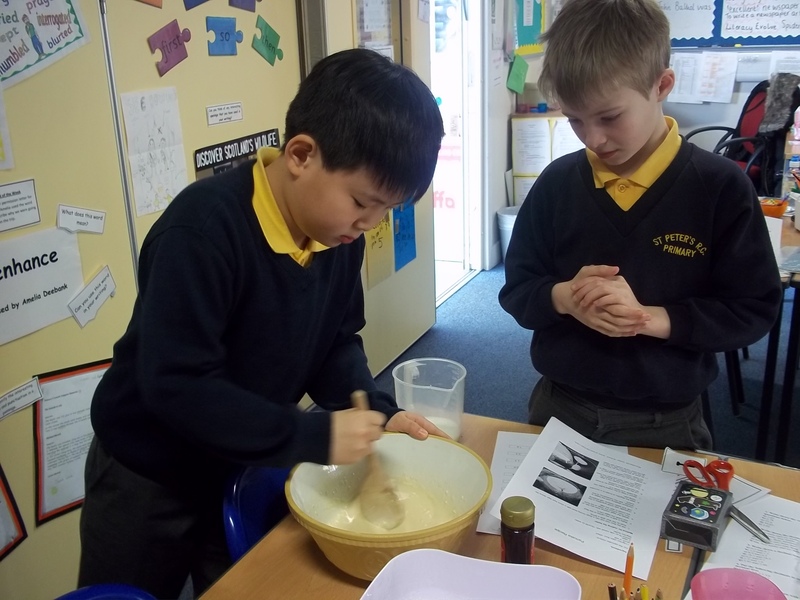 We used the internet to find out how Pancake Day is celebrated around the world. 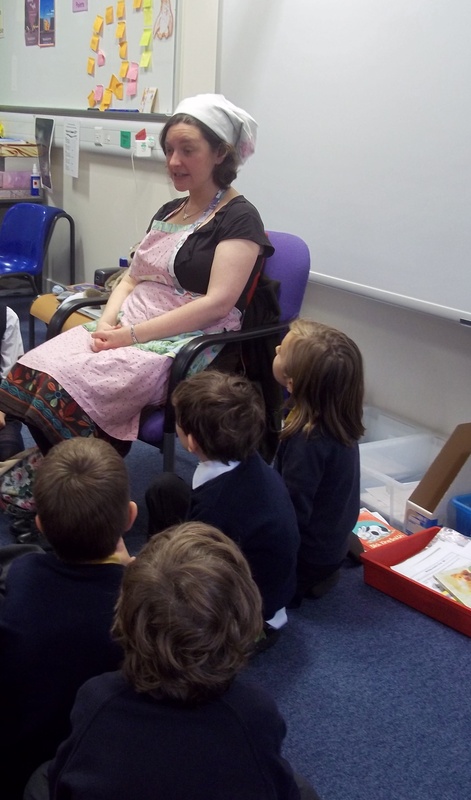 This week the children have heard many stories told in various ways. 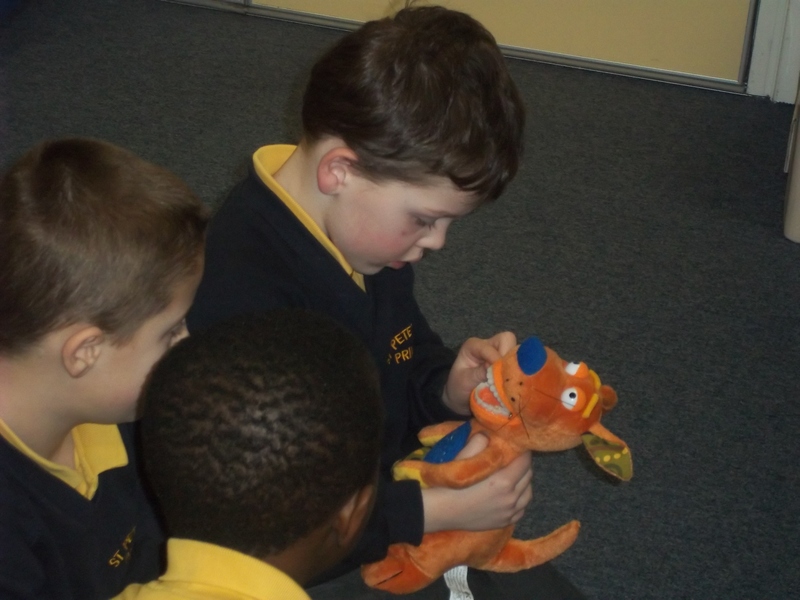 Using puppets, story sacks and percussion instruments, the children helped to re-tell familiar stories. 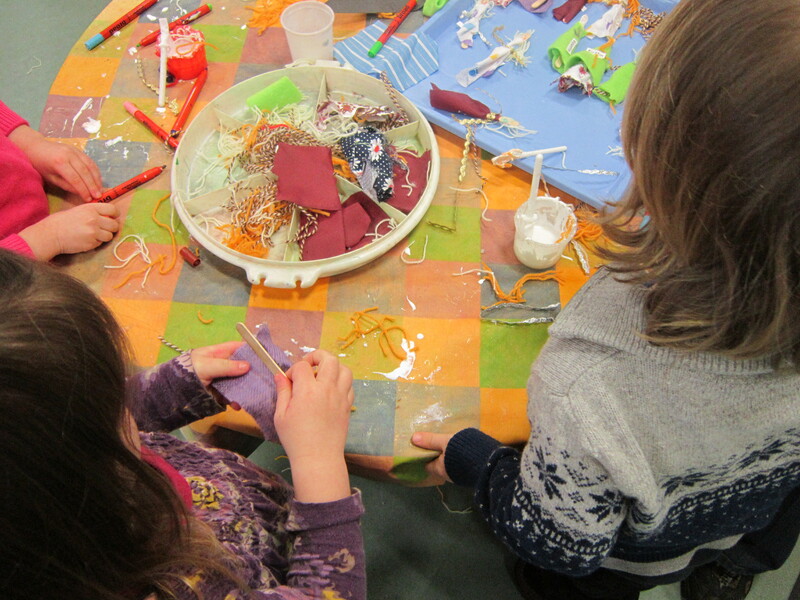 They then made their own puppets and used these to tell stories to each other. The morning class enjoyed being authors. 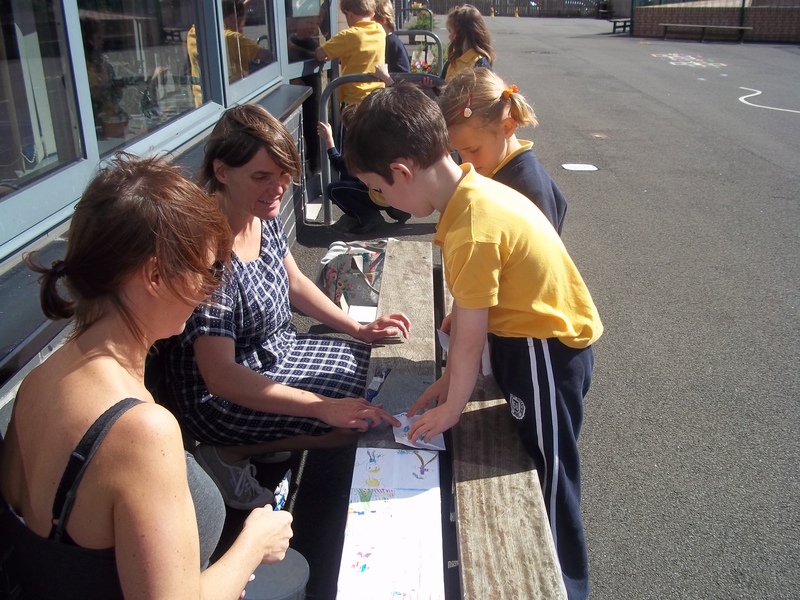 They made up stories in groups and then each child illustrated a page to make a book. They are very proud of their ideas and achievements. 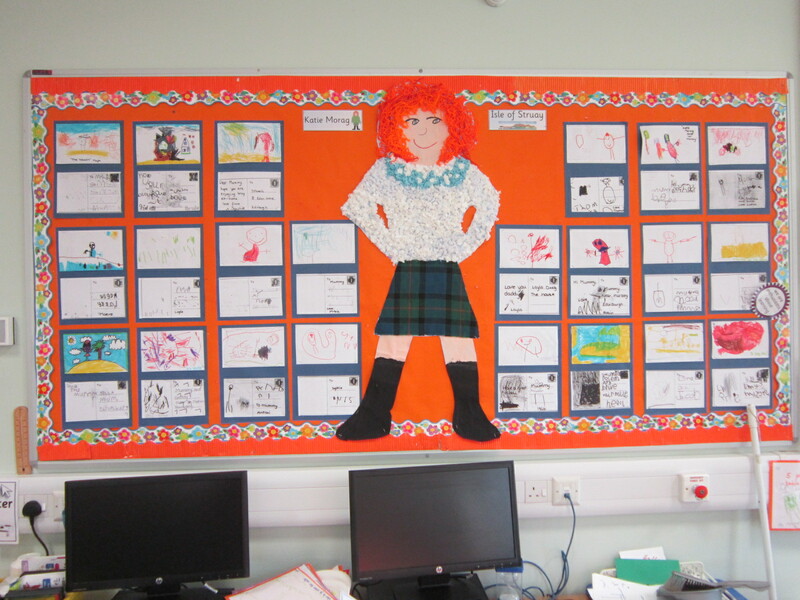 We have been learning about Robert Burns. 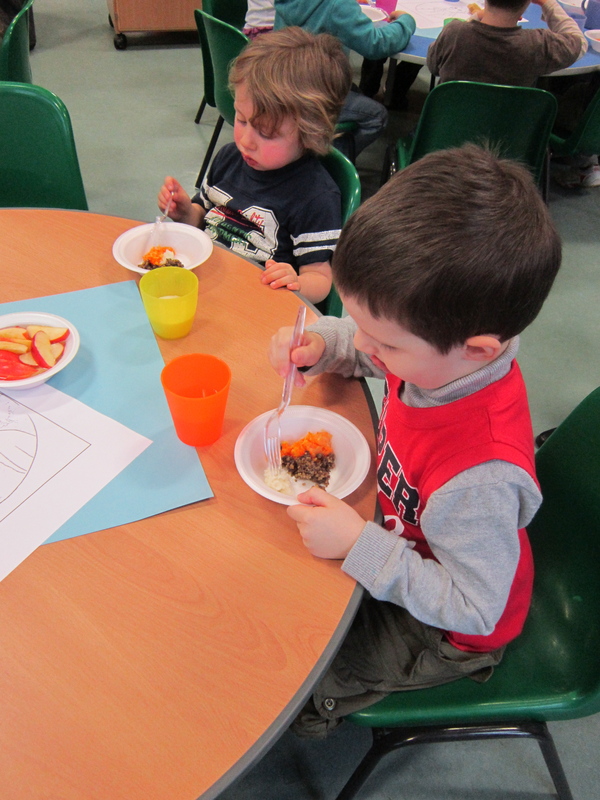 We had a Burns’ Supper in Nursery and enjoyed haggis, neeps and tatties. 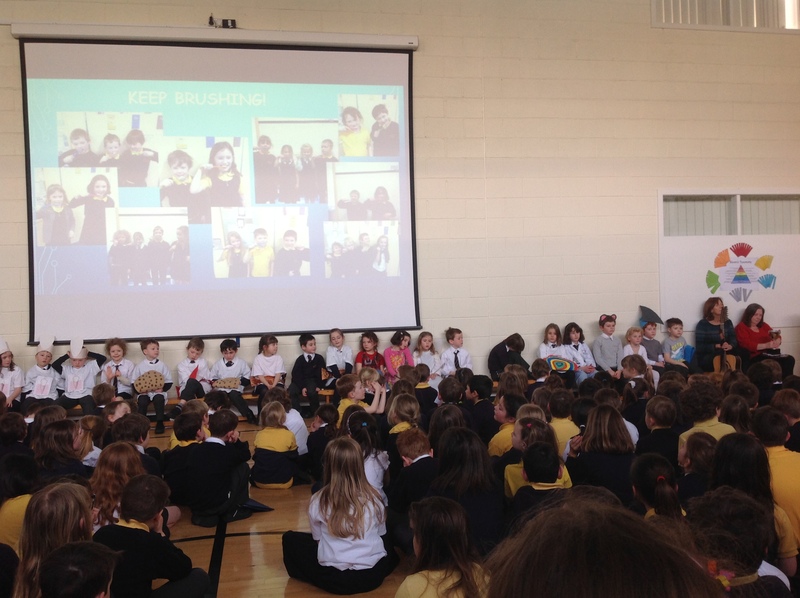 We recited Burns’ poems and sang a song at the school assembly. 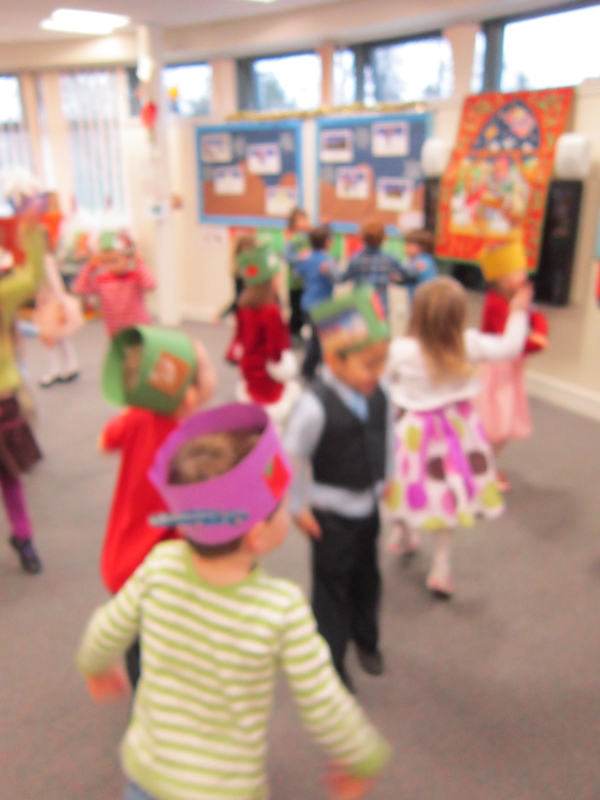 We celebrated Chinese New Year in Nursery. 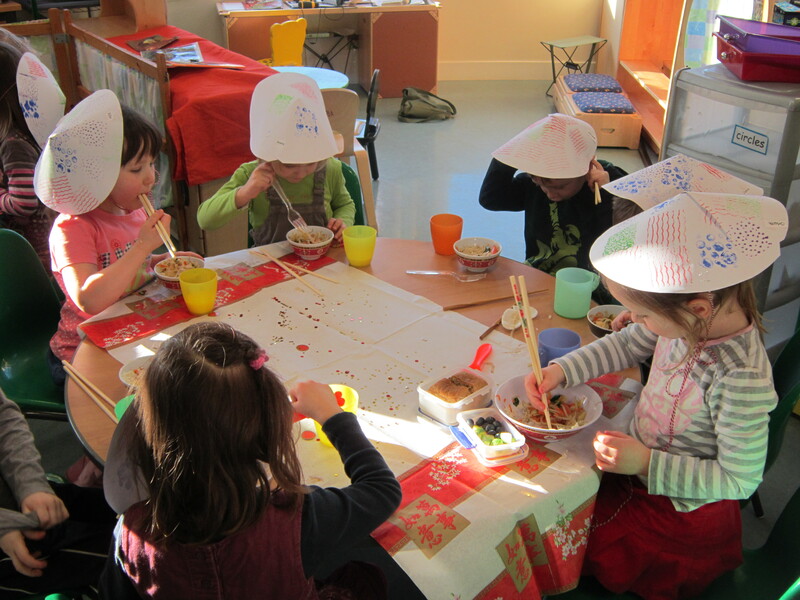 The children made Chinese hats, fans and lanterns, painted Chinese symbols and enjoyed Chinese food for snack. Happy New Year to everyone from the Nursery. 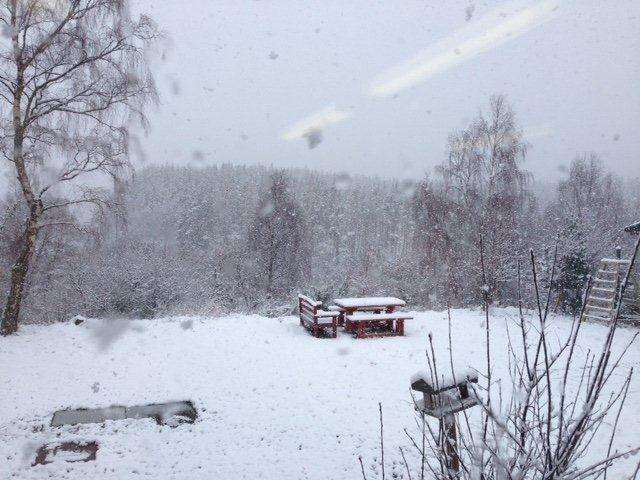 This month our children will be learning about winter and Rabbie Burns. 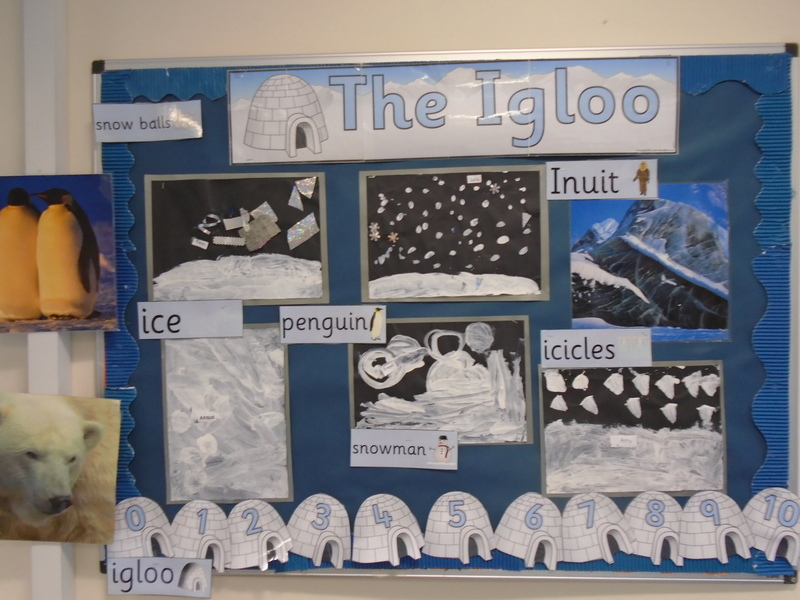 December has been a very exciting month in Nursery. 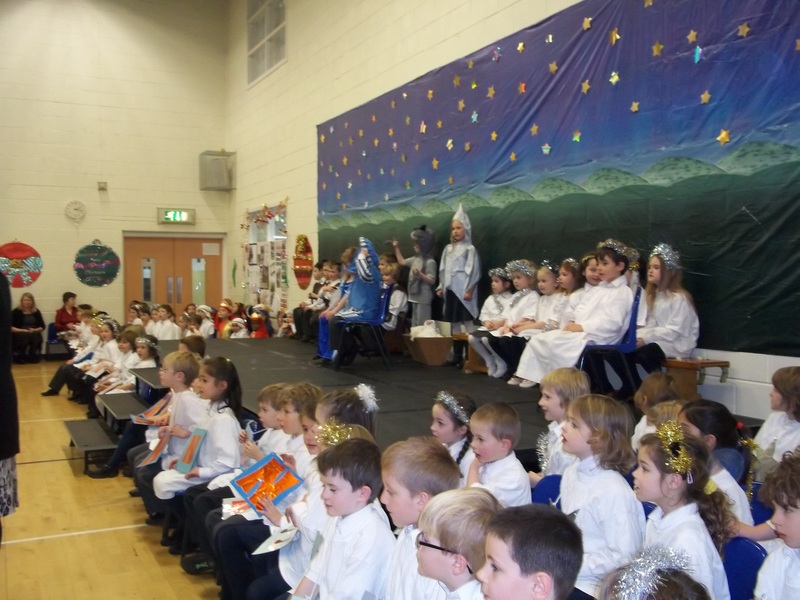 The children performed a Nativity play for their parents and families, as well as for the elderly residents of Oaklands and the Little Sisters of the Poor. 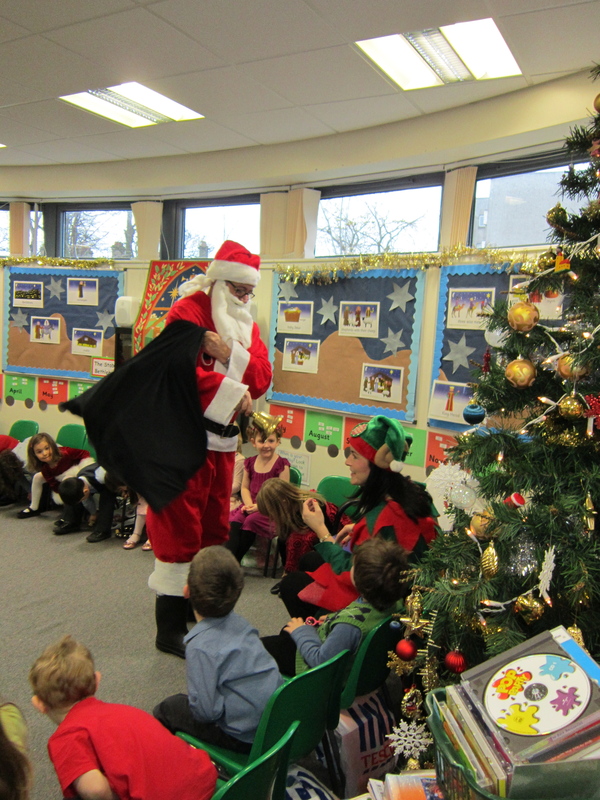 We enjoyed our Christmas parties and were delighted when Santa visited with presents for all the children. What a busy Health Week ! 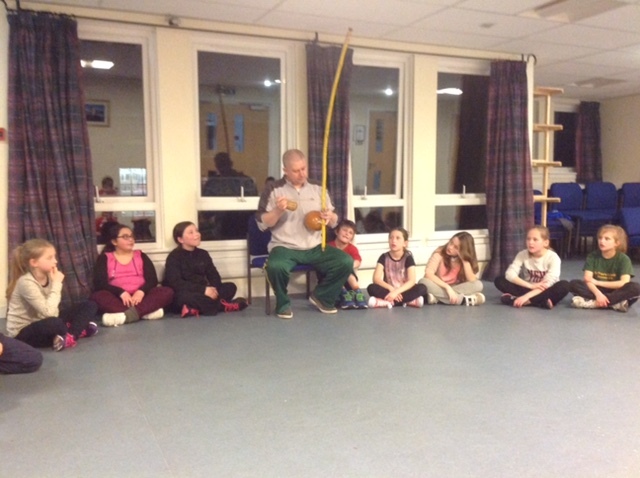 The morning class loved their “Tae Kwon Do” and “Enjoy-a ball sessions” and daily outdoor activities. 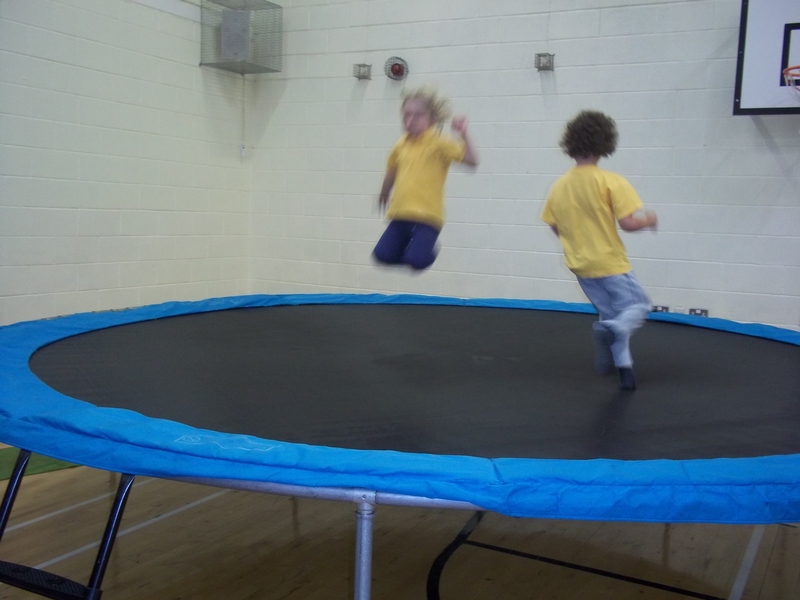 The afternoon class took part in paracute games , music and movement sessions and a gym afternoon .We had a big focus on healthy eating . 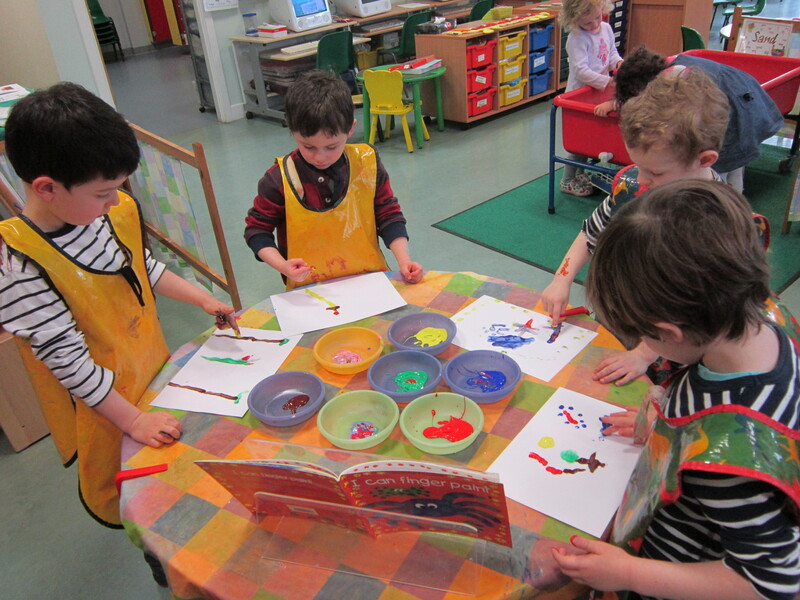 The children drew and painted fruit and vegetables. 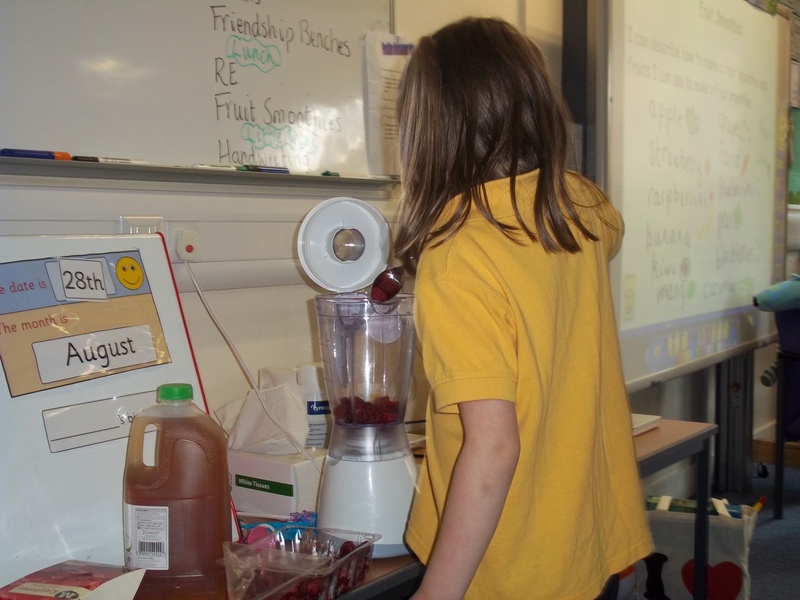 We made fruit smoothies and the children selected their own favourite fruits to make their own fruit kebabs.